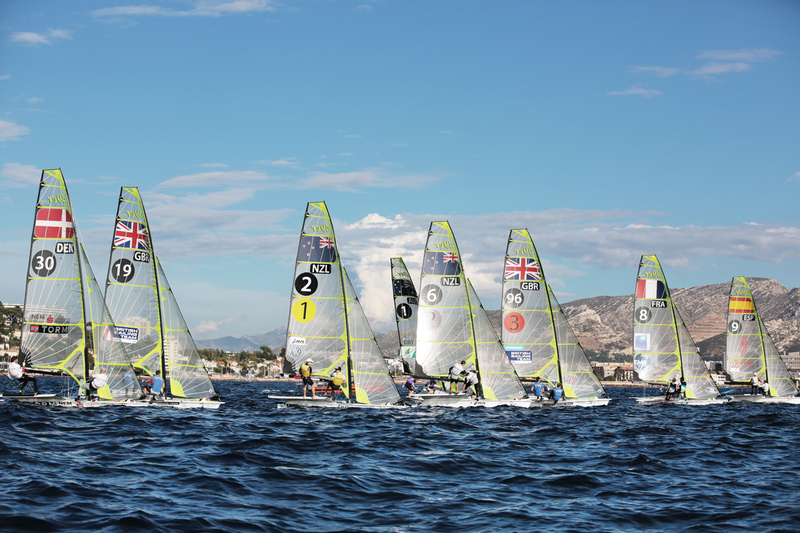 Results after race 5, Sep 26th end of day, there was no racing on day 3, these results are for the top 40 only. 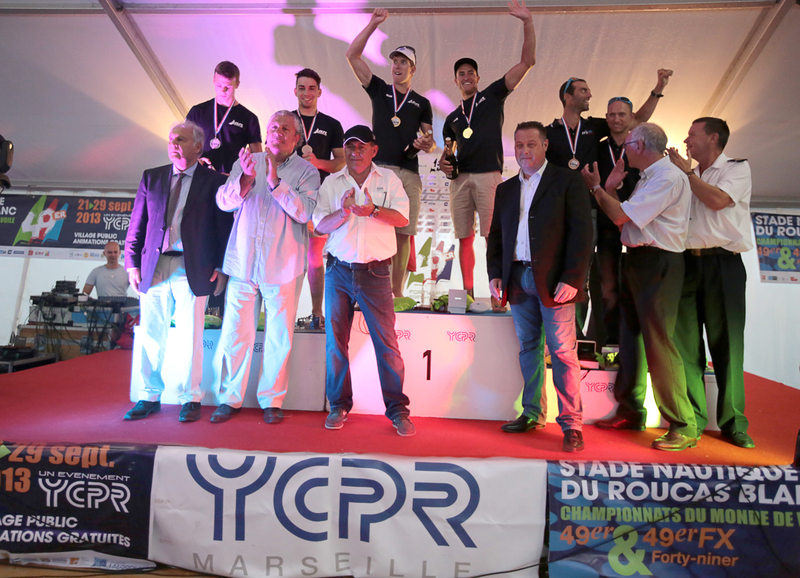 The group 41-97 results are in the link below. 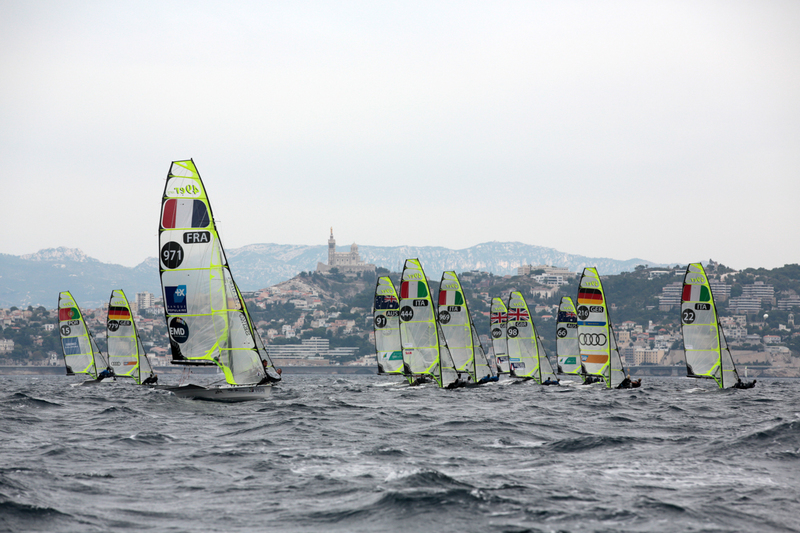 Even though these numbers start at 1, they are the second group of boats and there are 40 teams placed ahead. 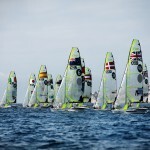 These results are for 41st to 97th. 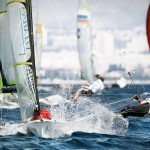 The Important Thing Is To Participate? 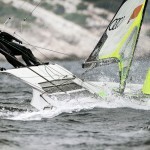 But of Course! 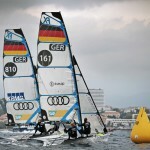 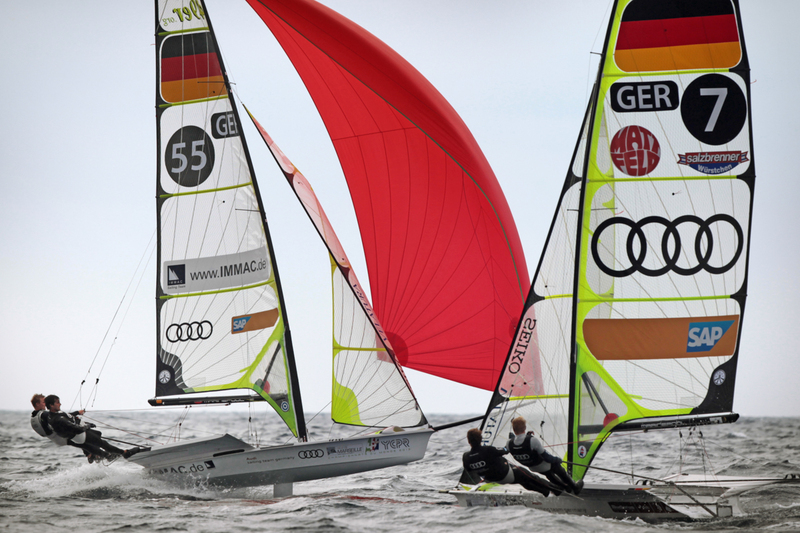 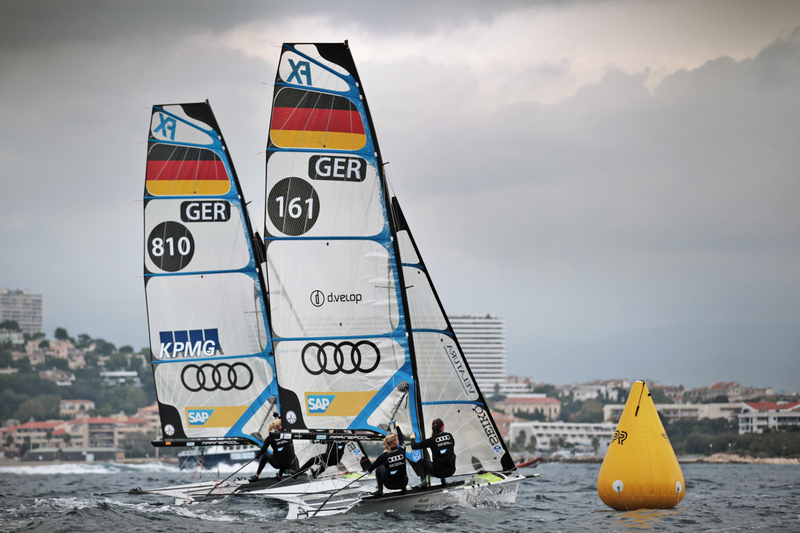 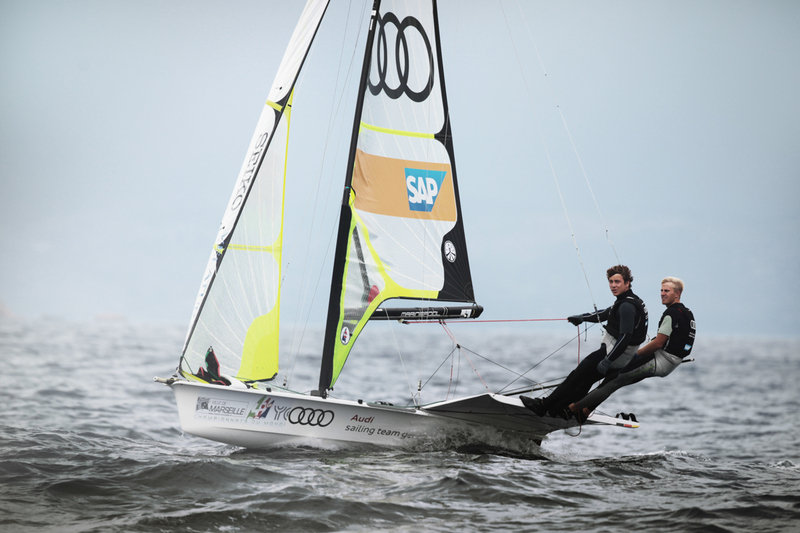 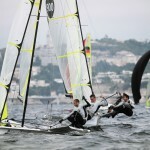 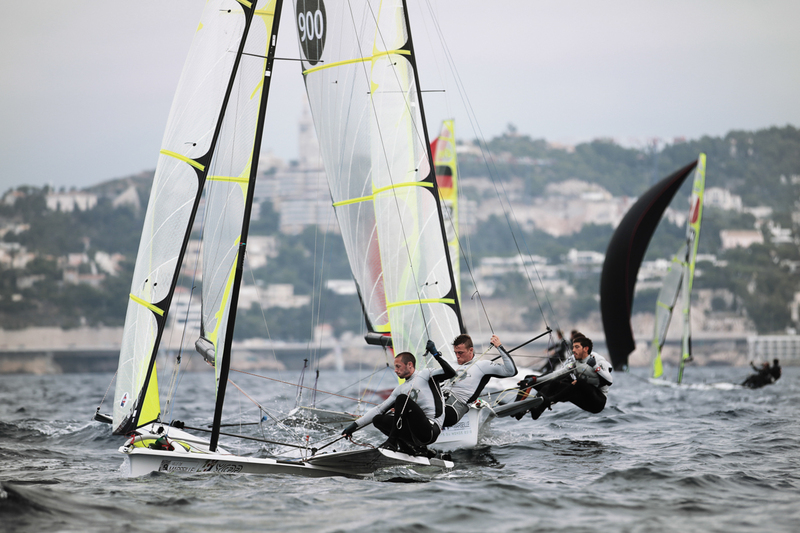 Redo of Baywatch by the German 49er Sailors! 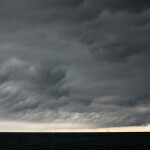 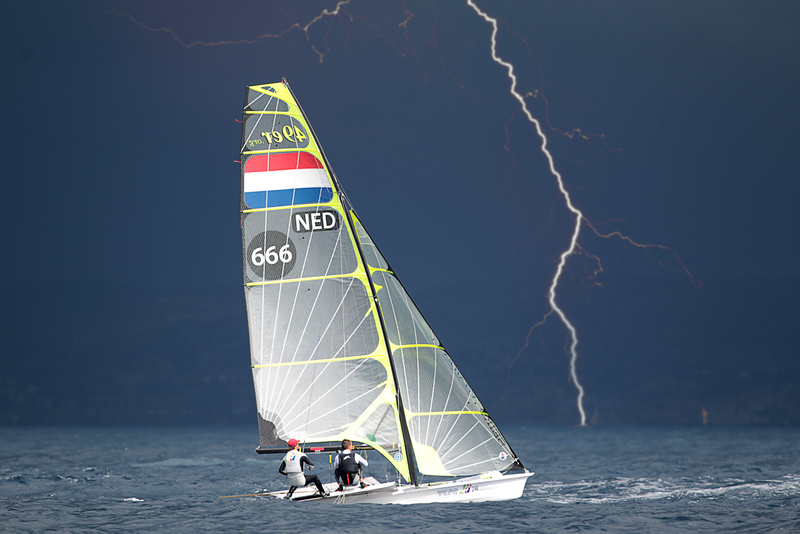 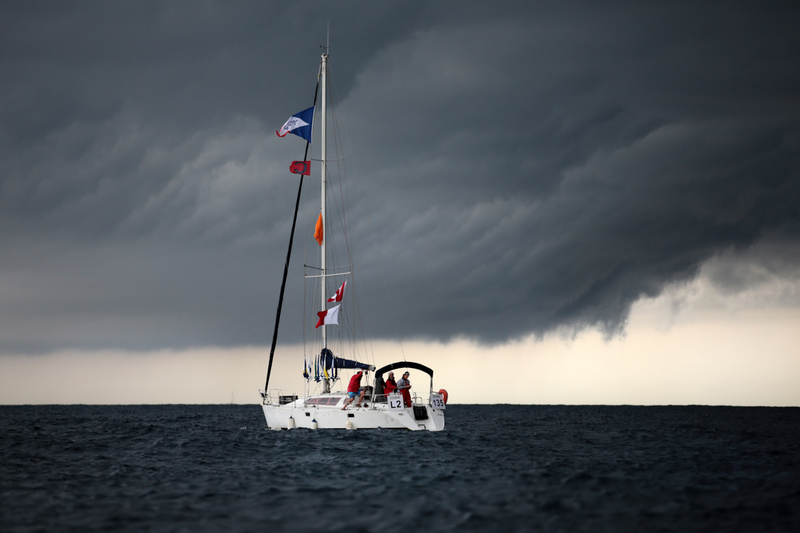 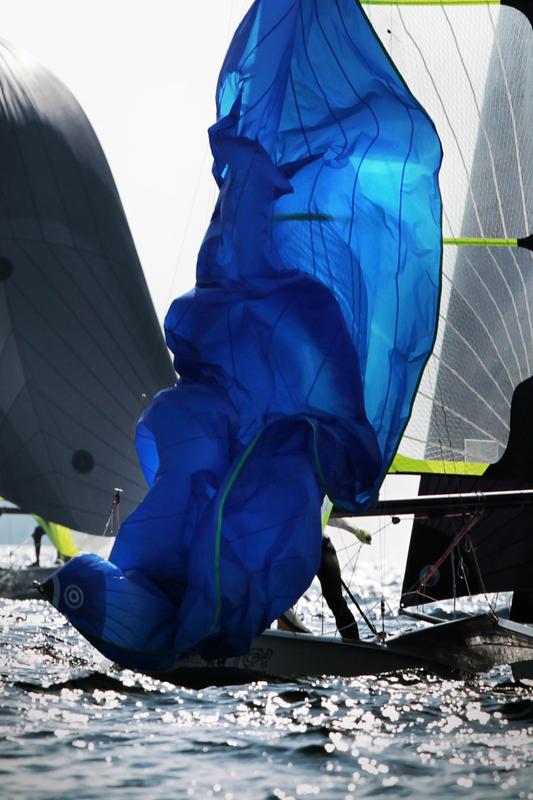 While regattas tend not to go exactly to plan, this is the plan should all elements of the racing occur on time as as planned. 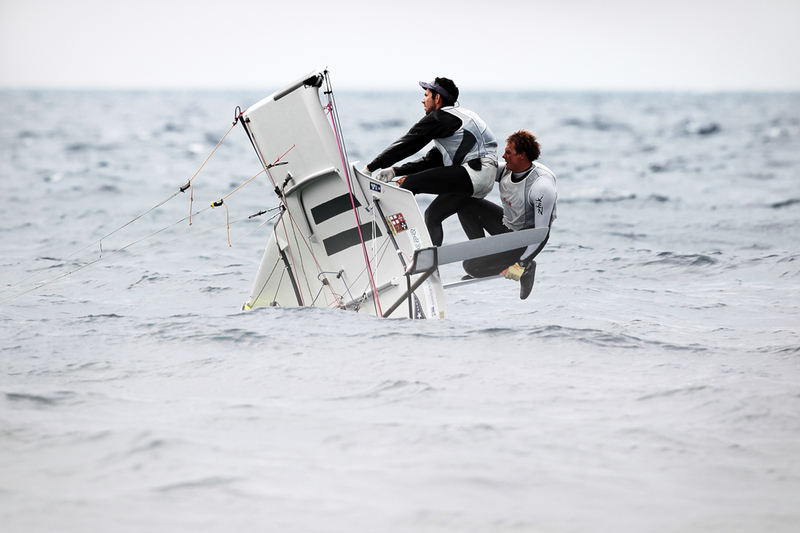 Updated Sept 17. 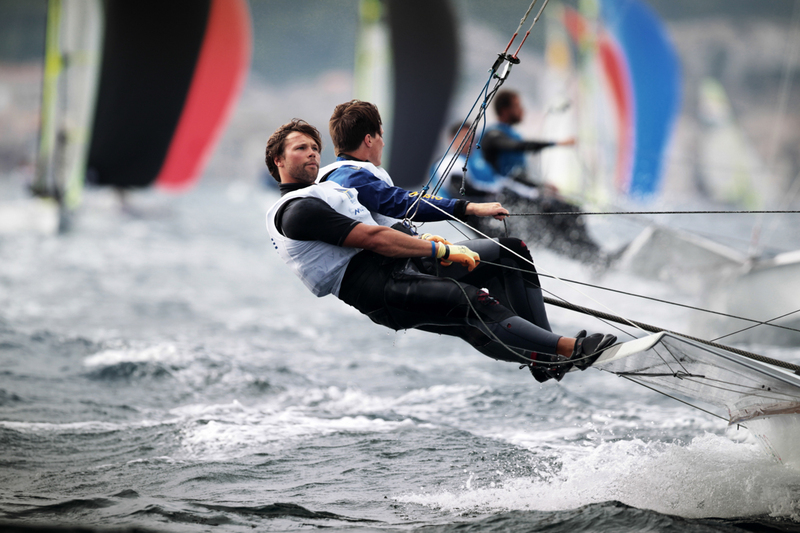 Add this event to your calendar with a click! 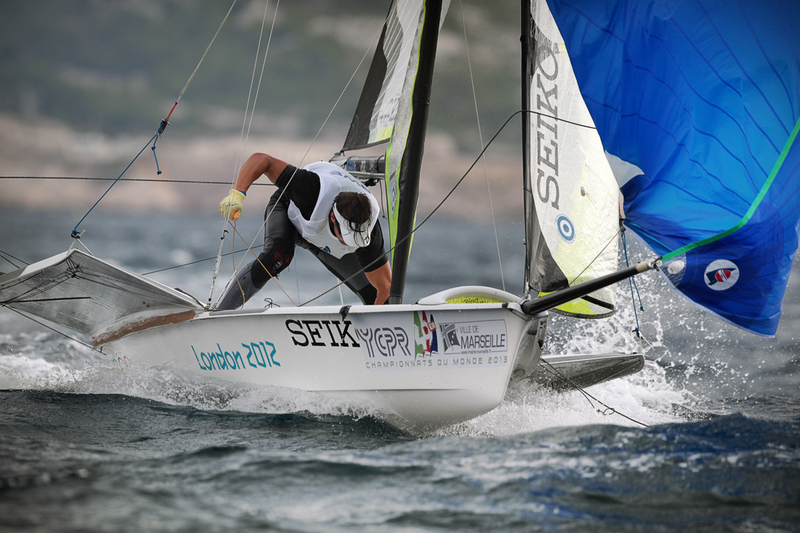 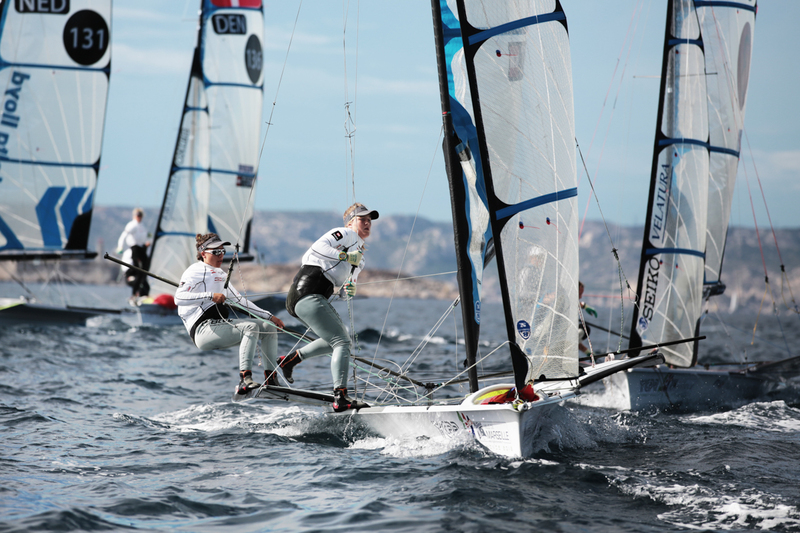 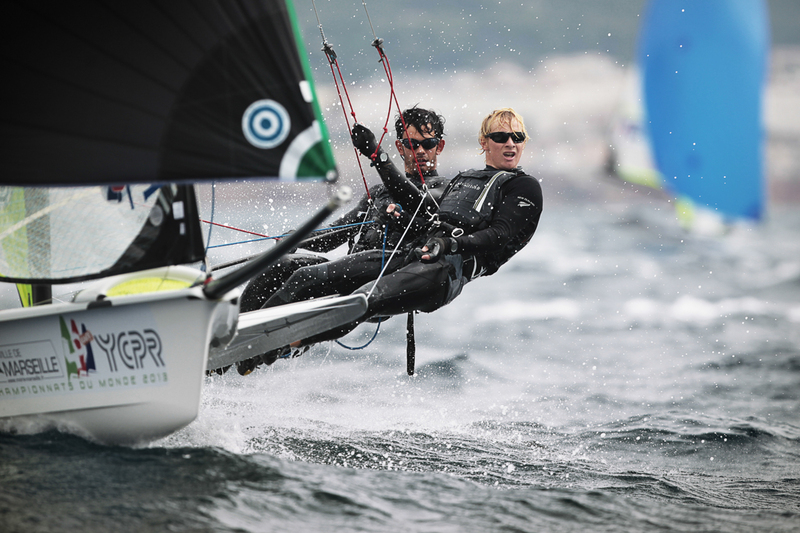 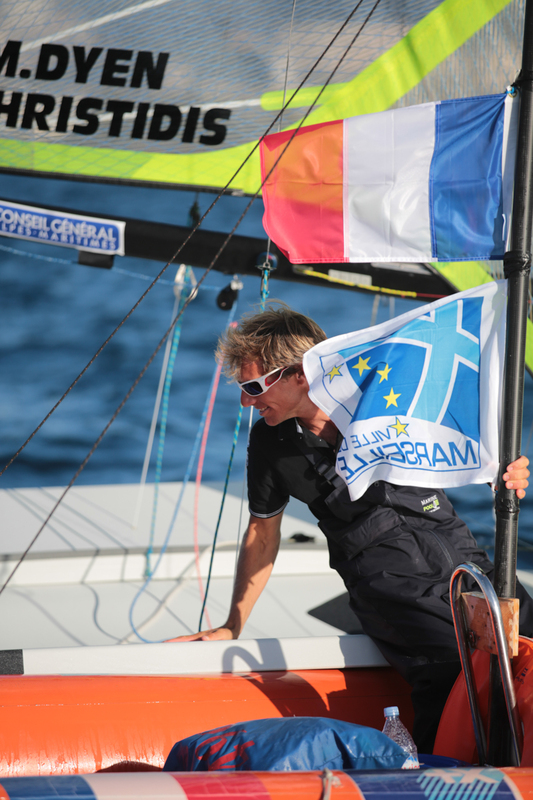 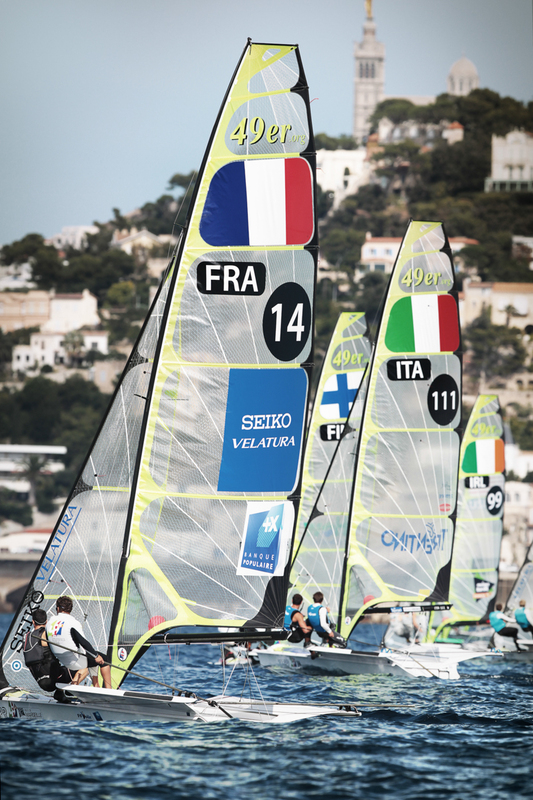 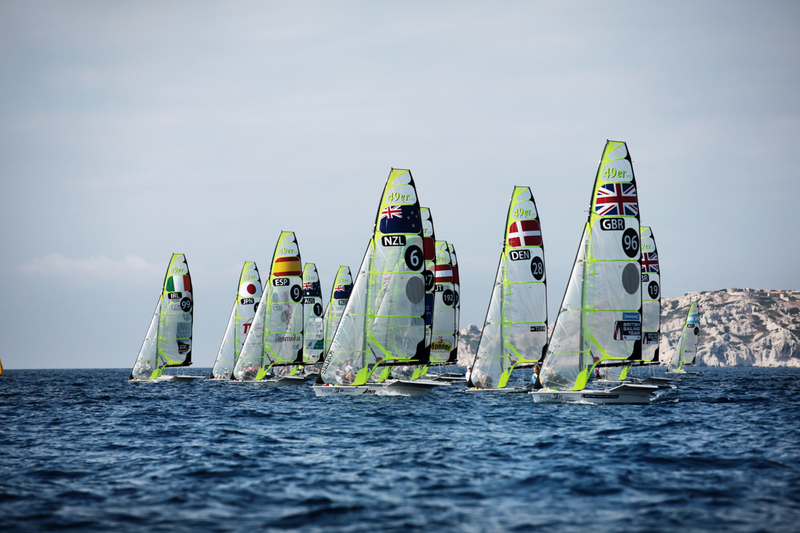 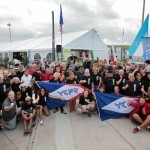 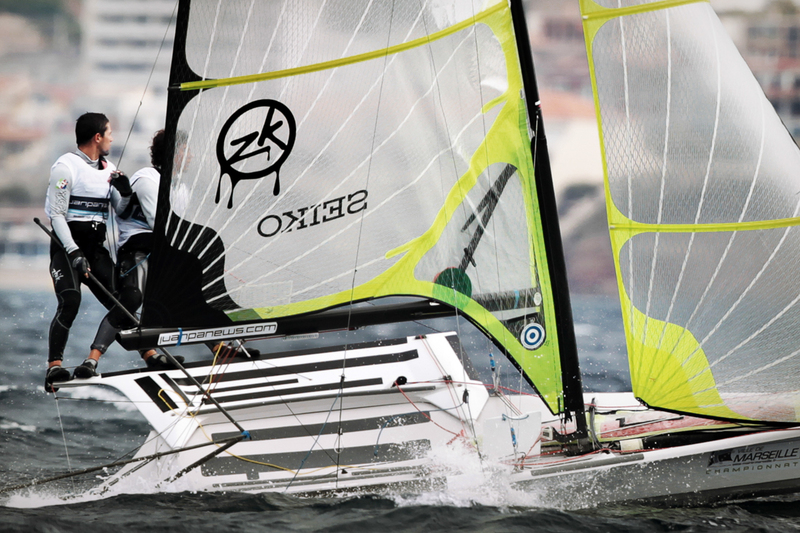 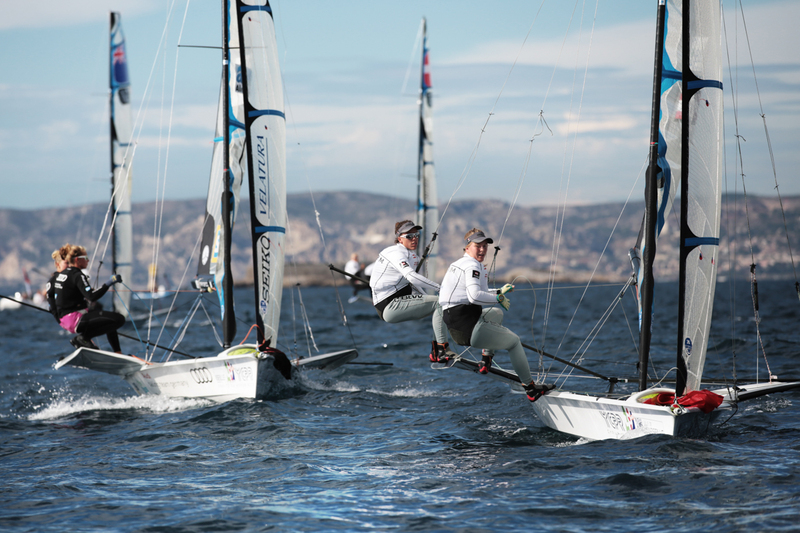 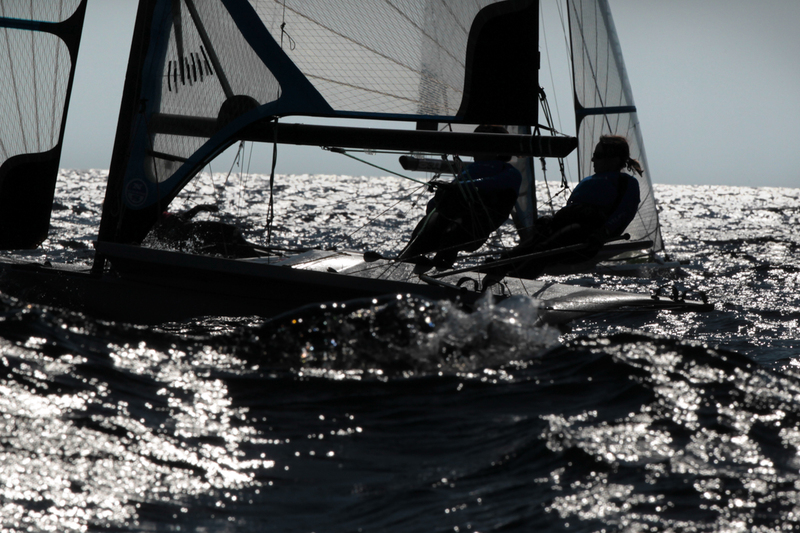 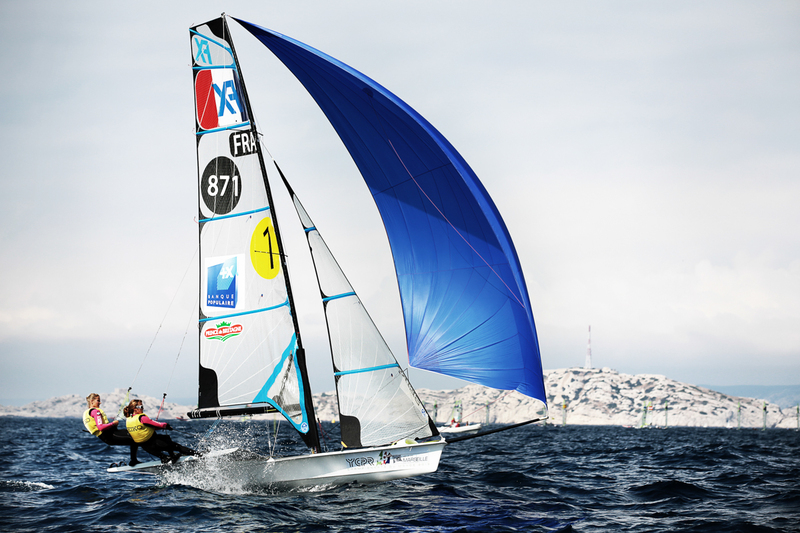 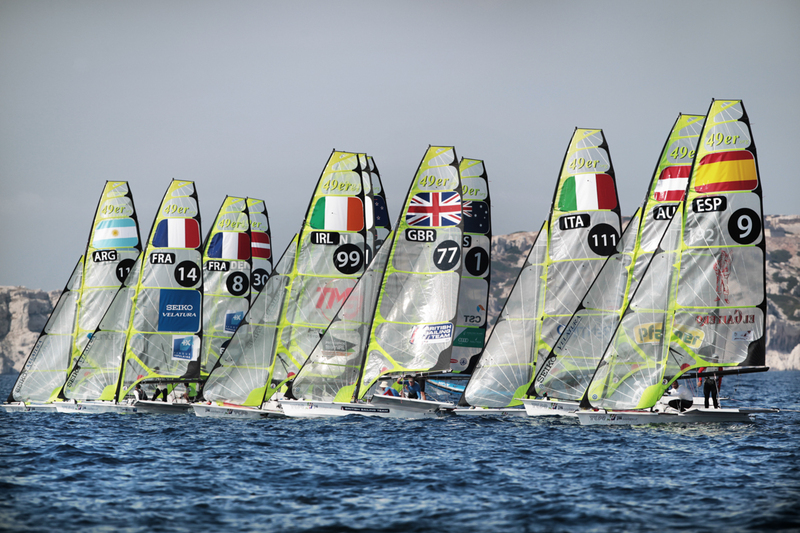 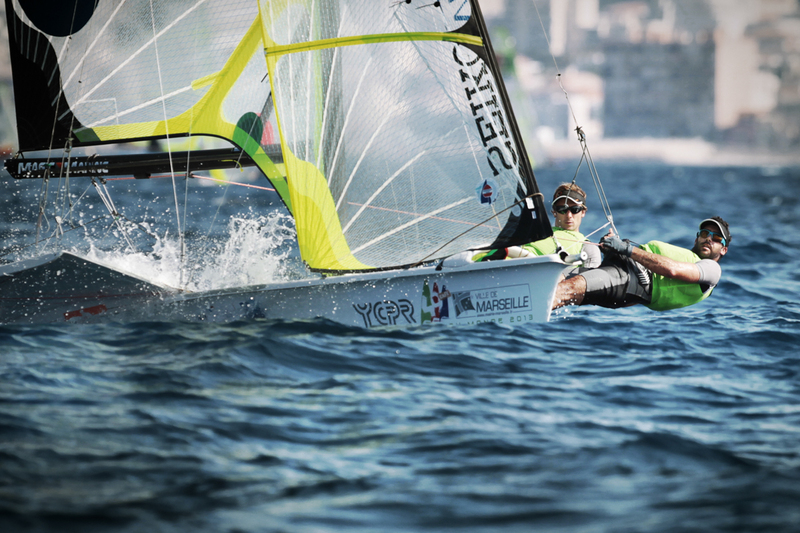 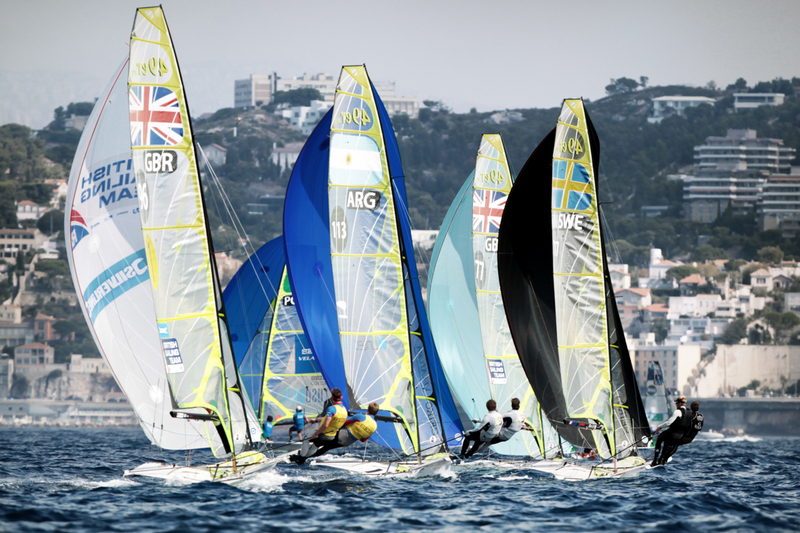 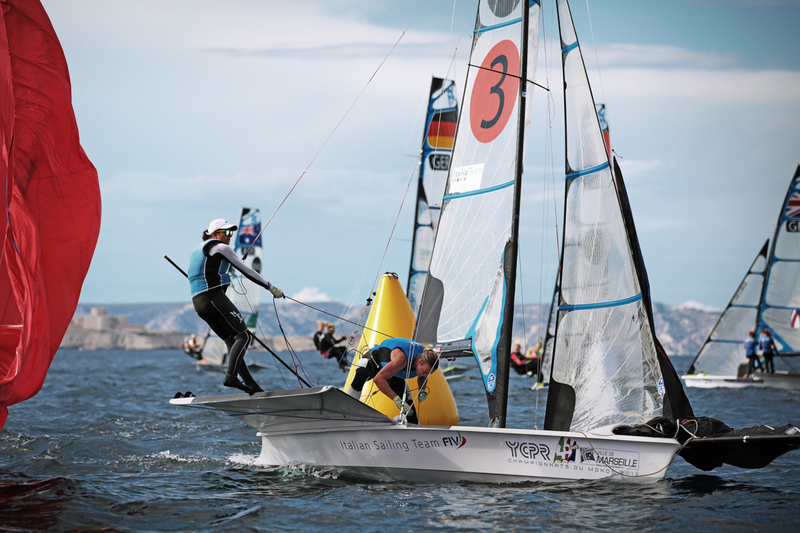 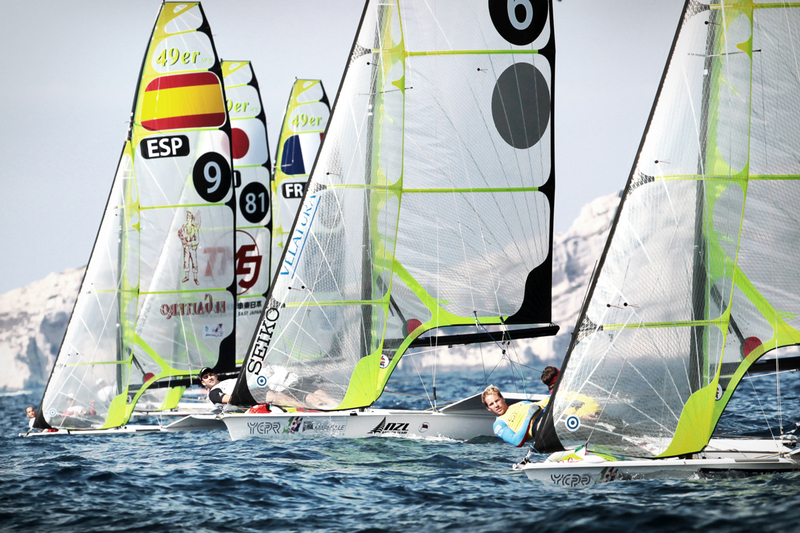 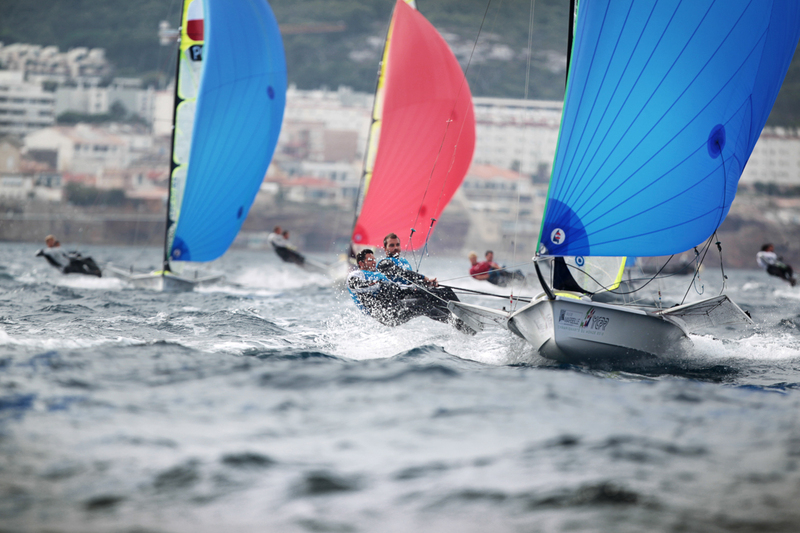 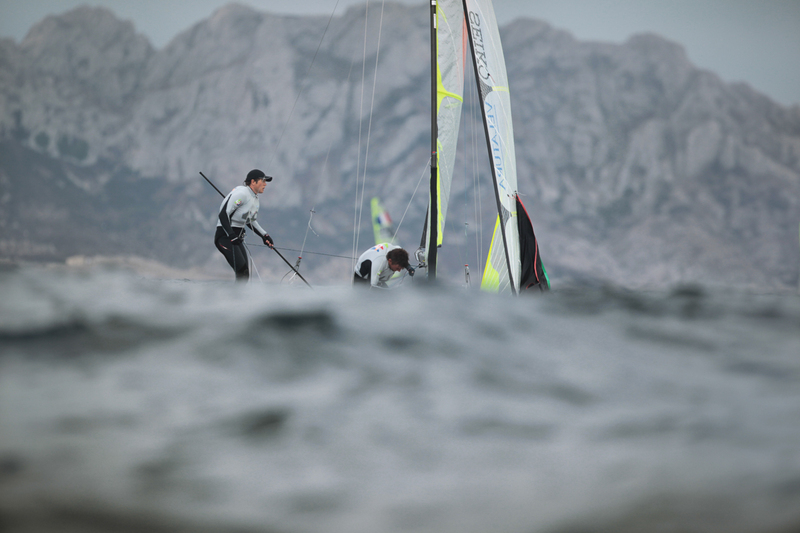 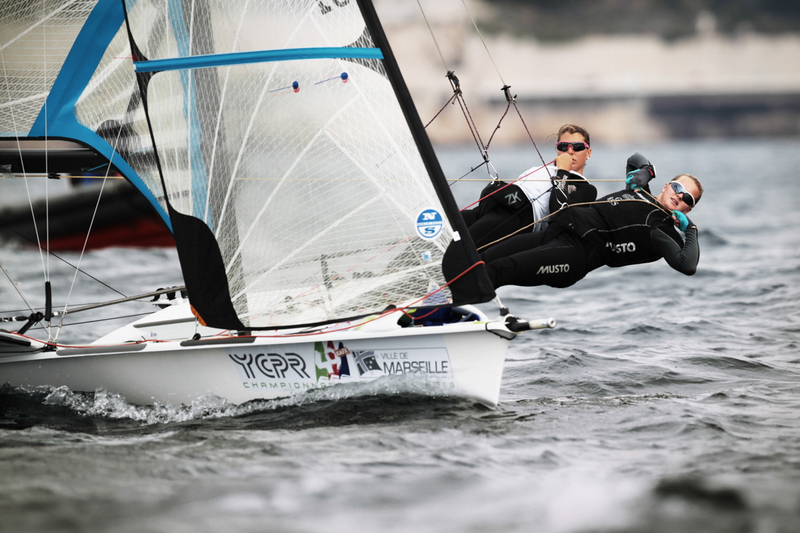 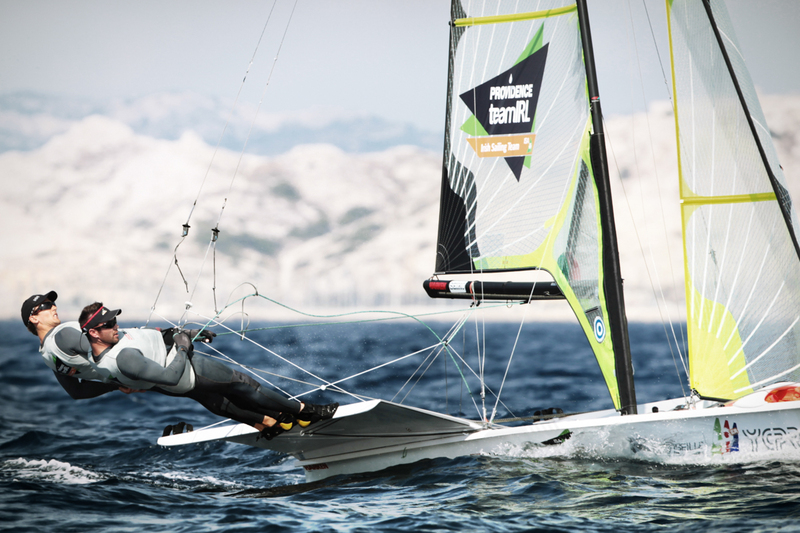 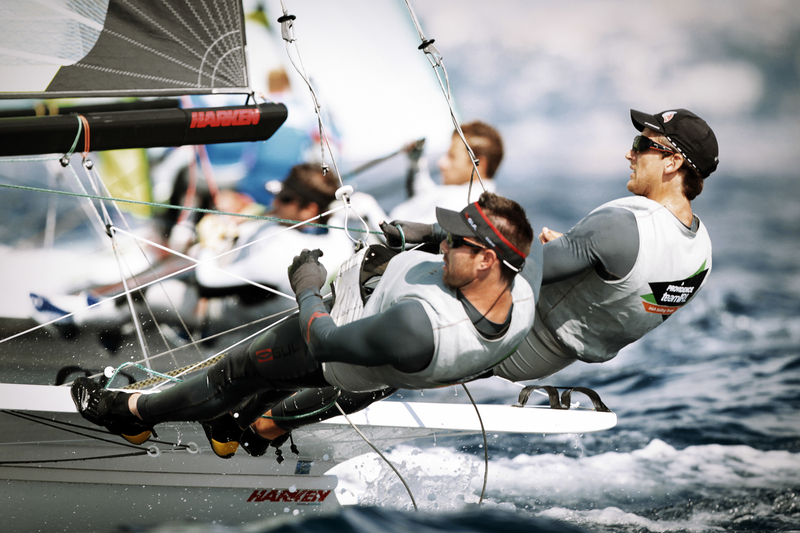 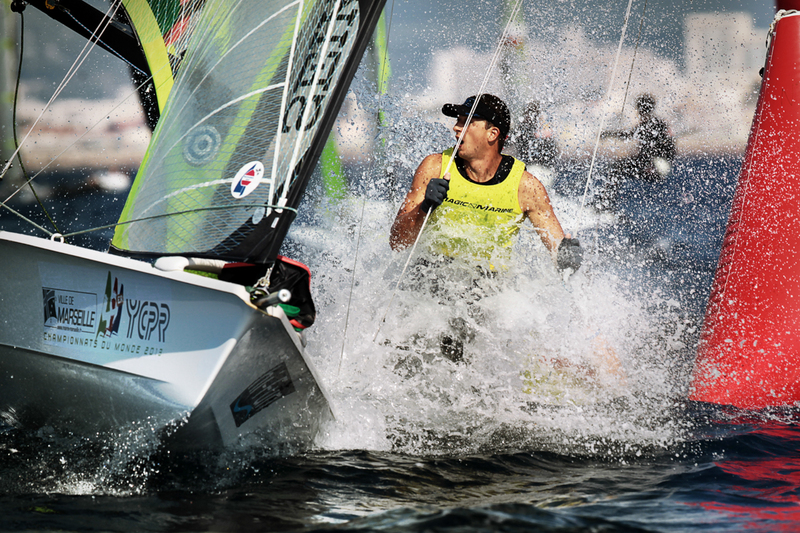 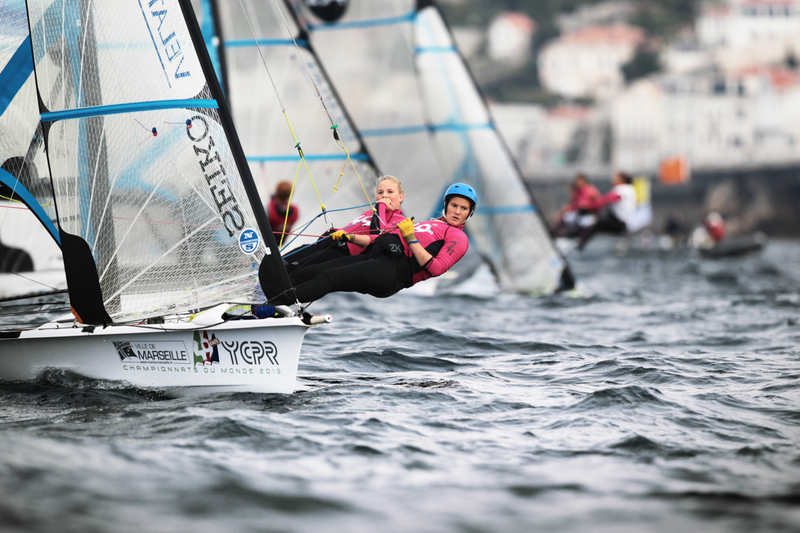 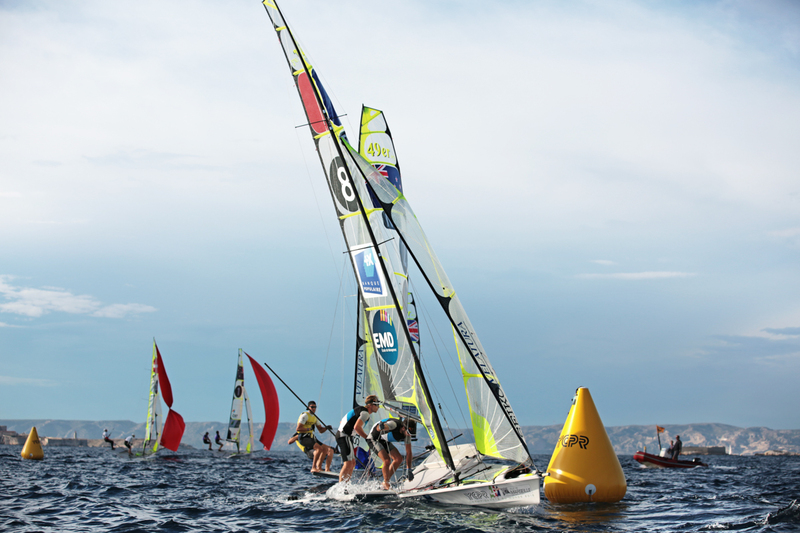 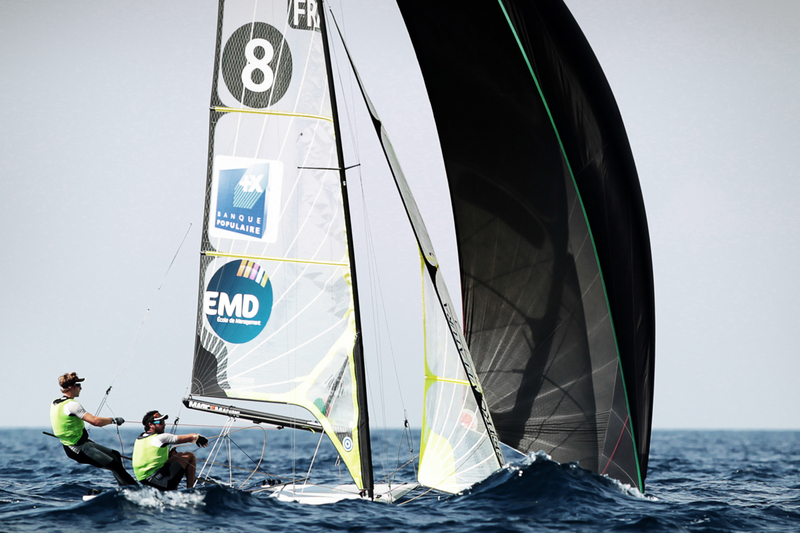 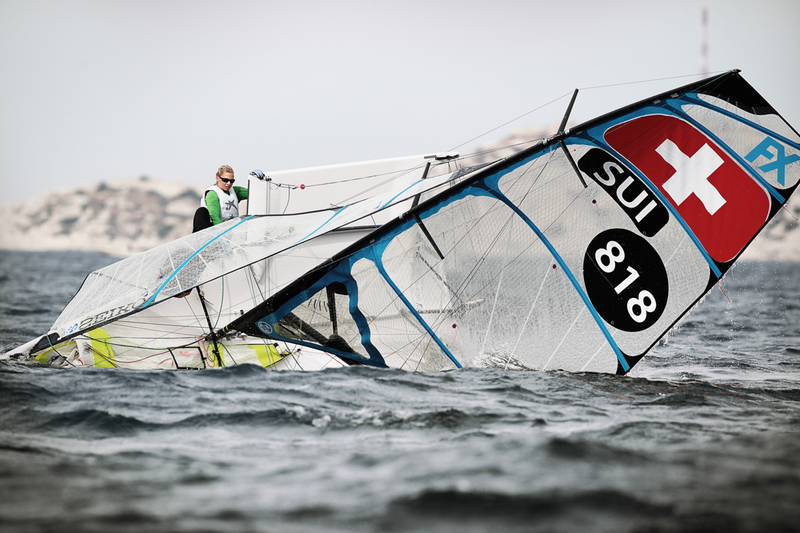 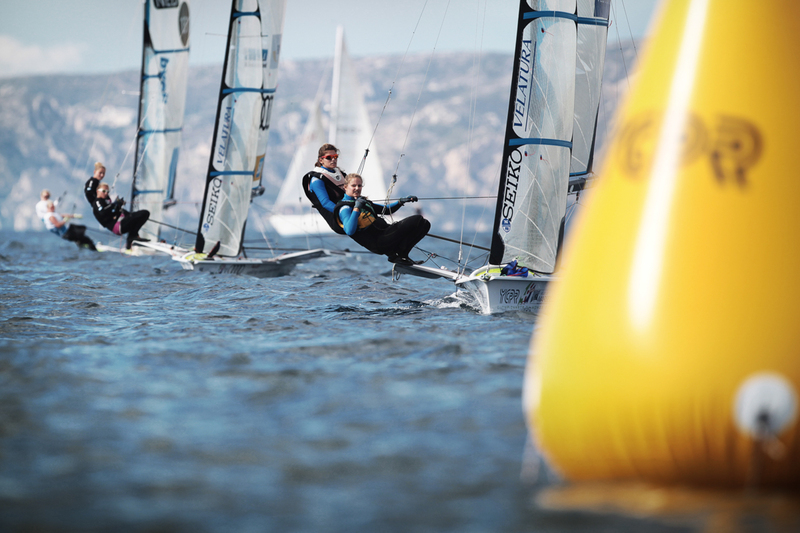 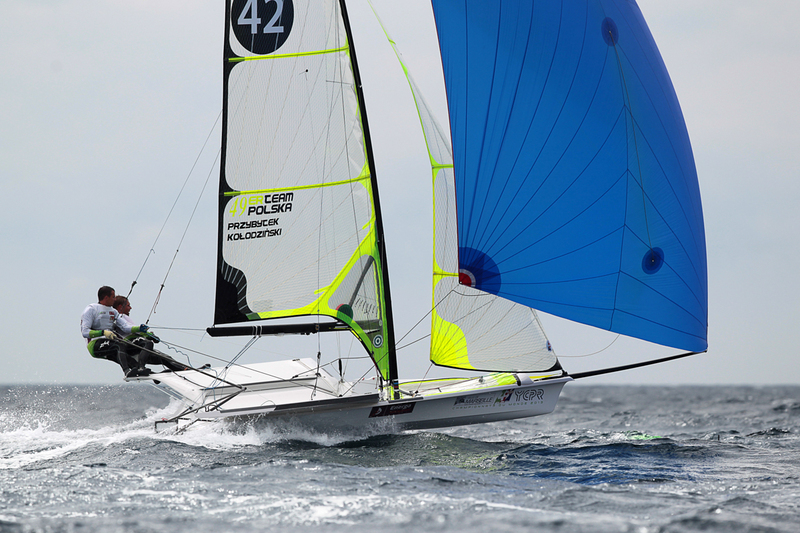 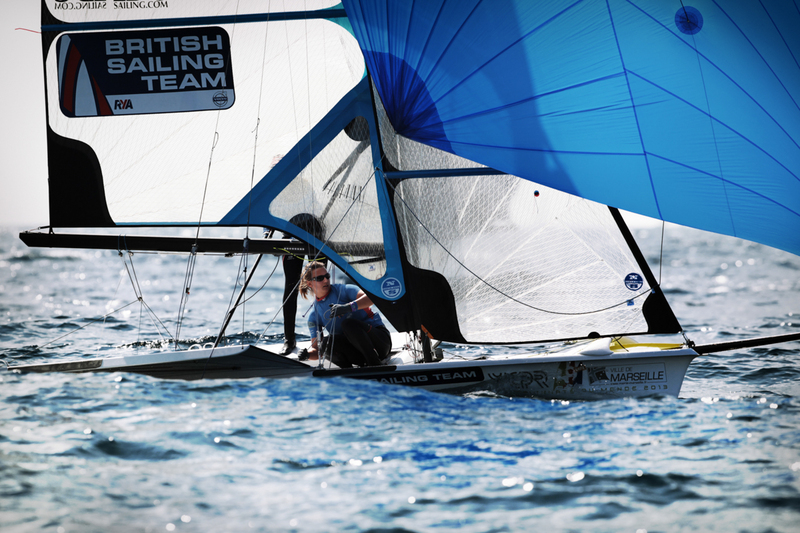 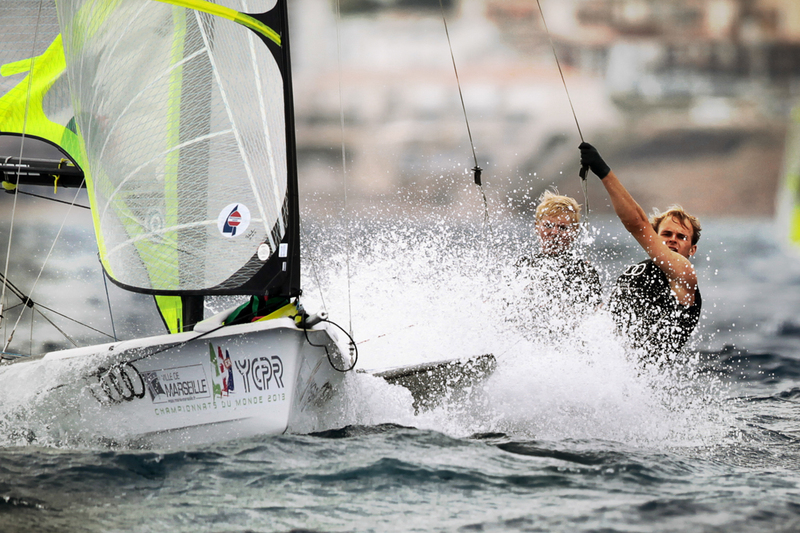 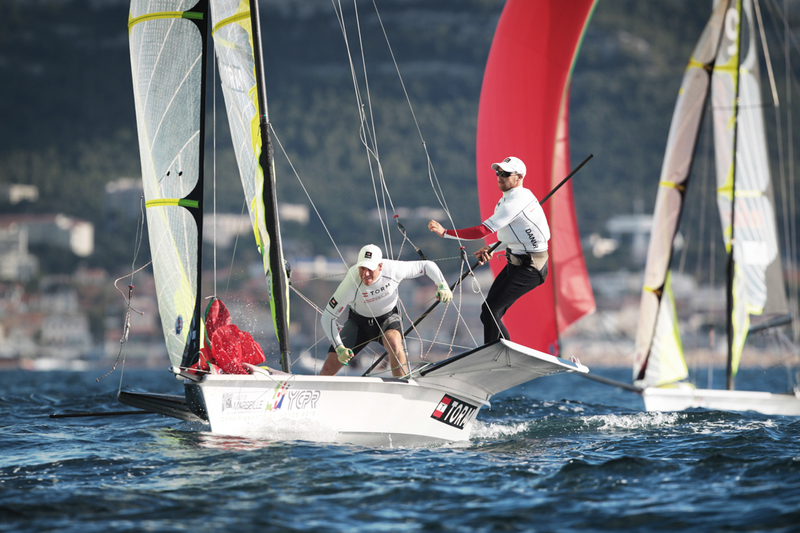 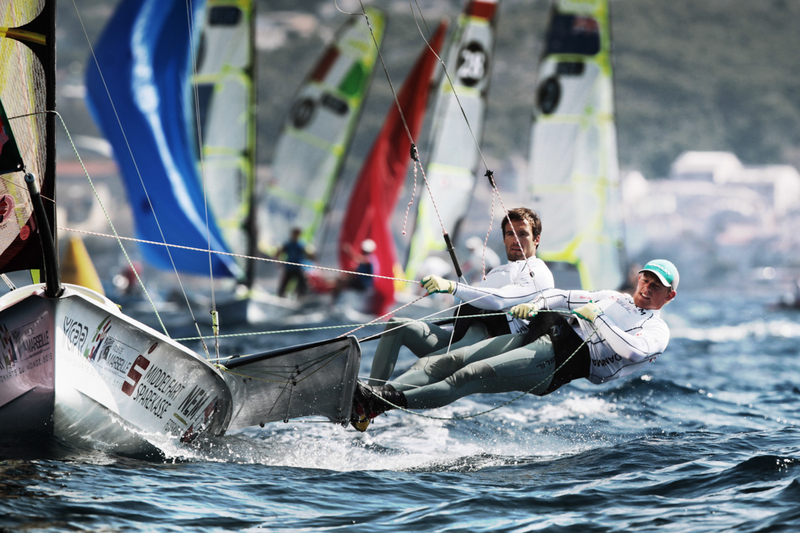 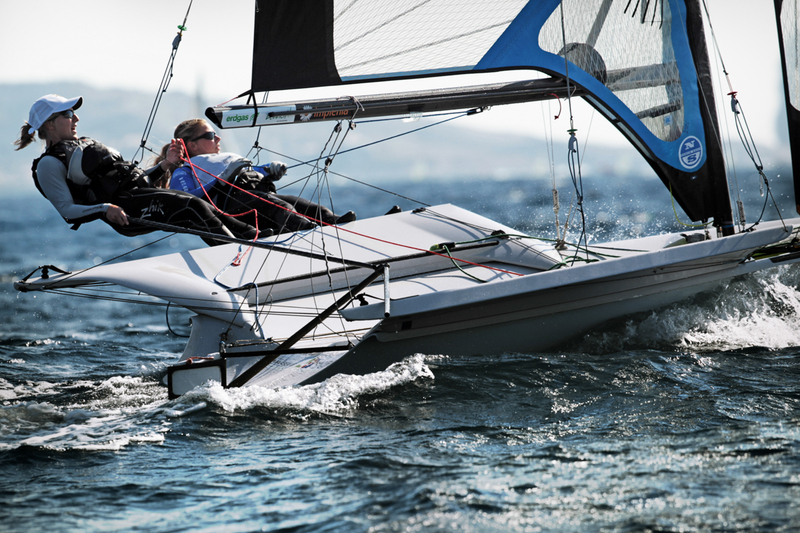 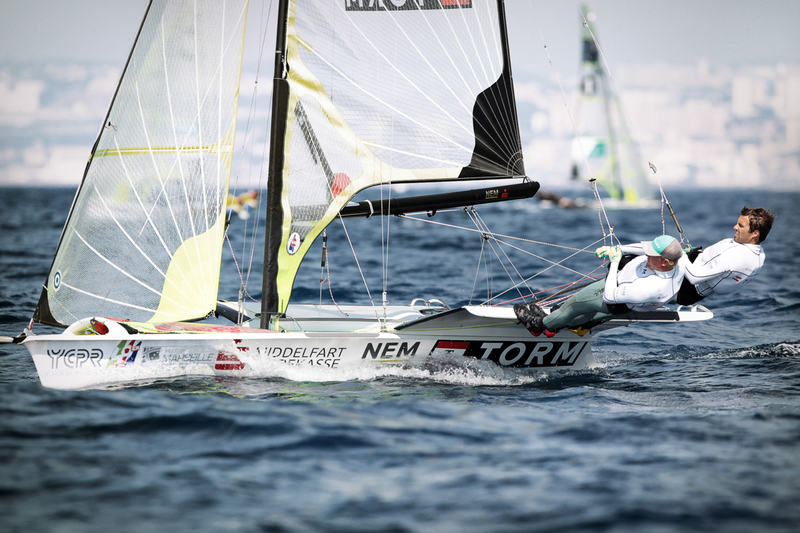 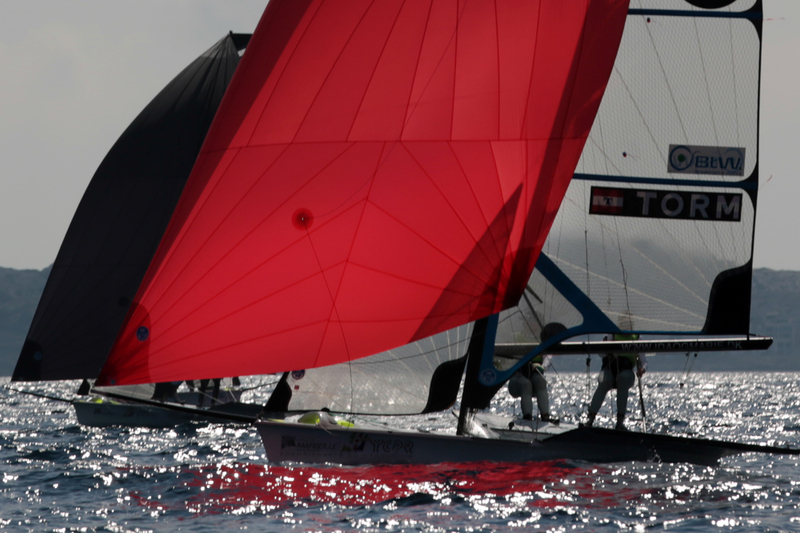 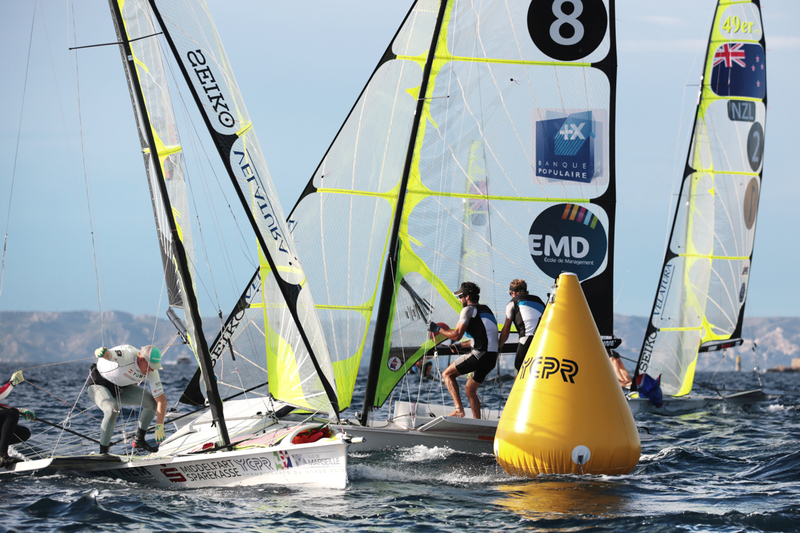 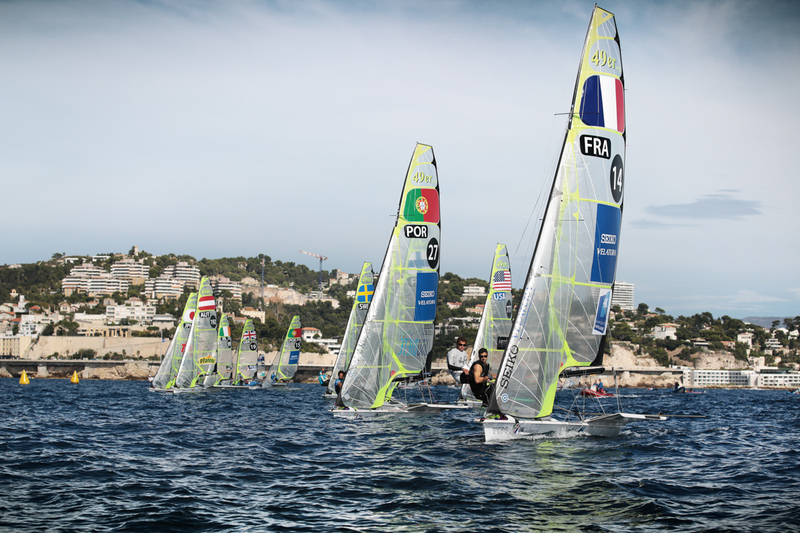 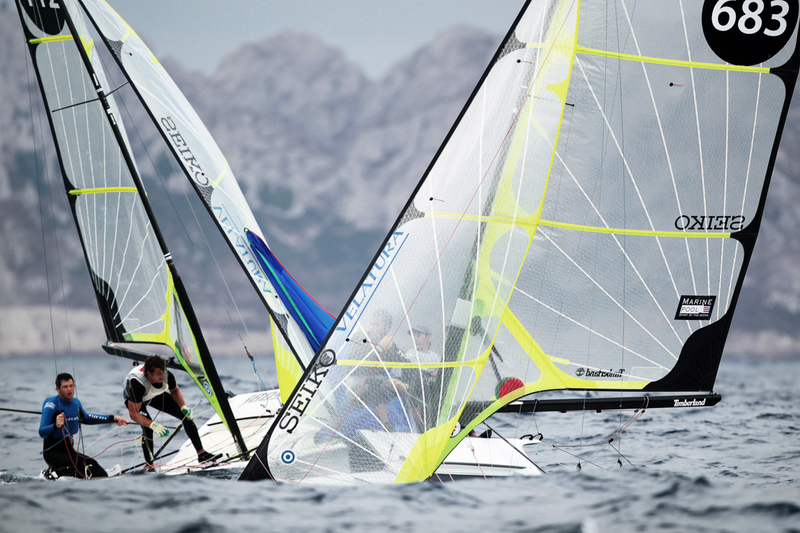 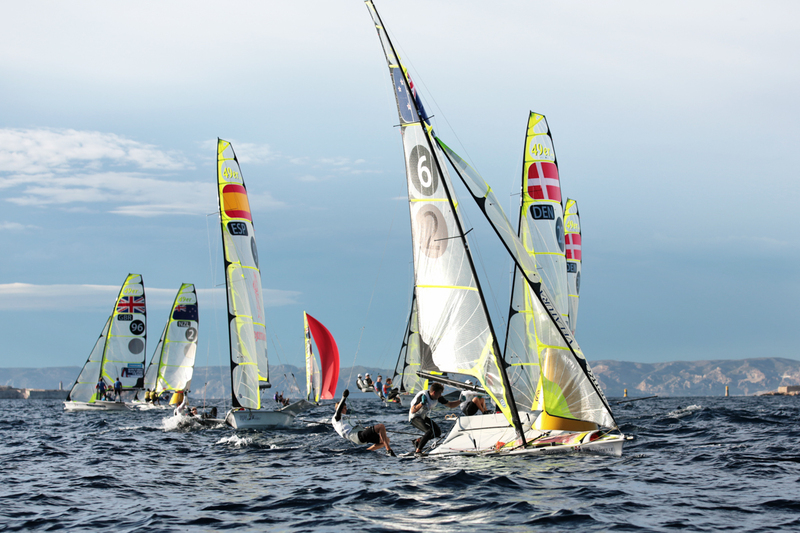 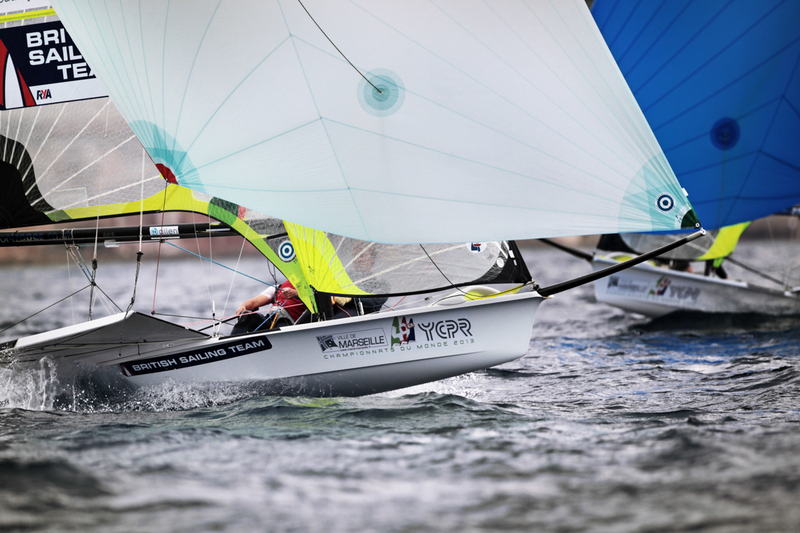 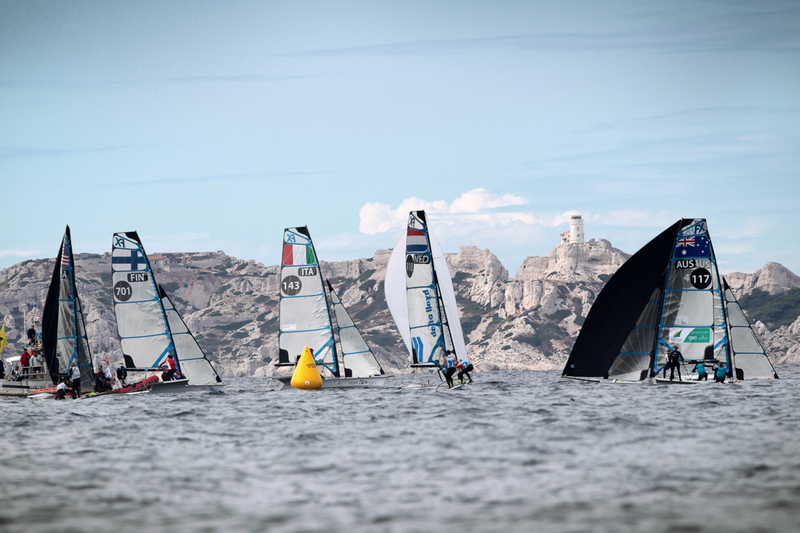 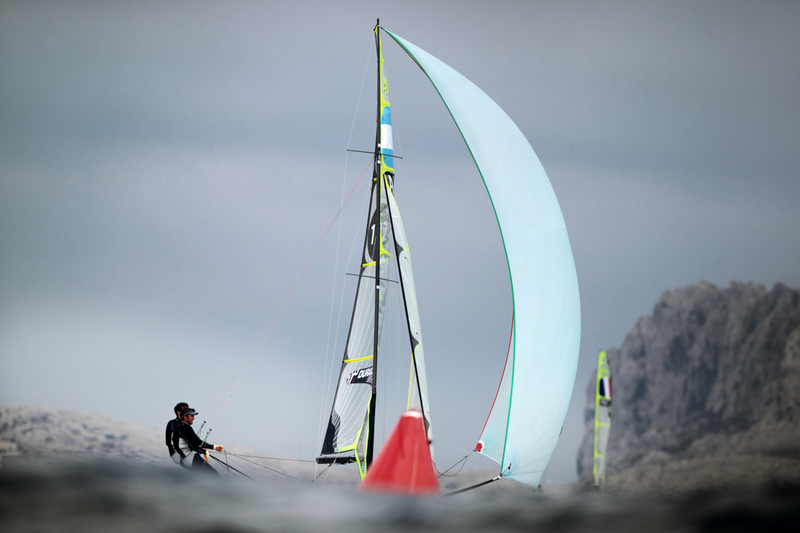 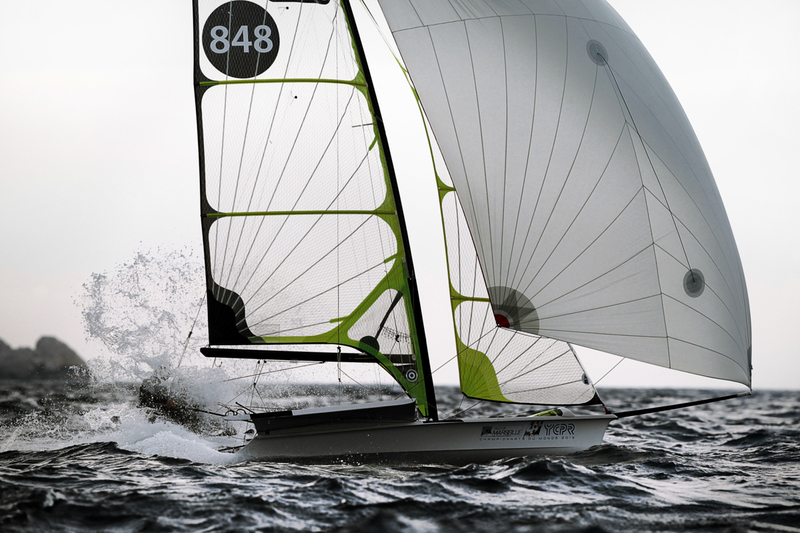 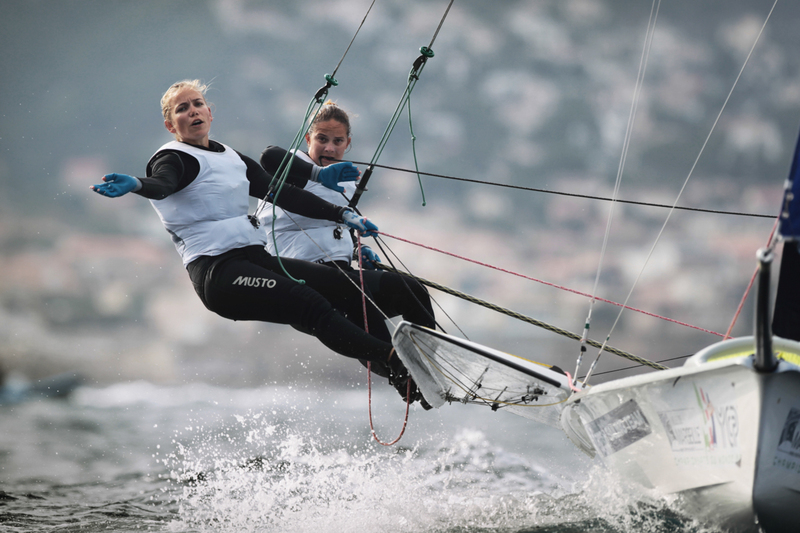 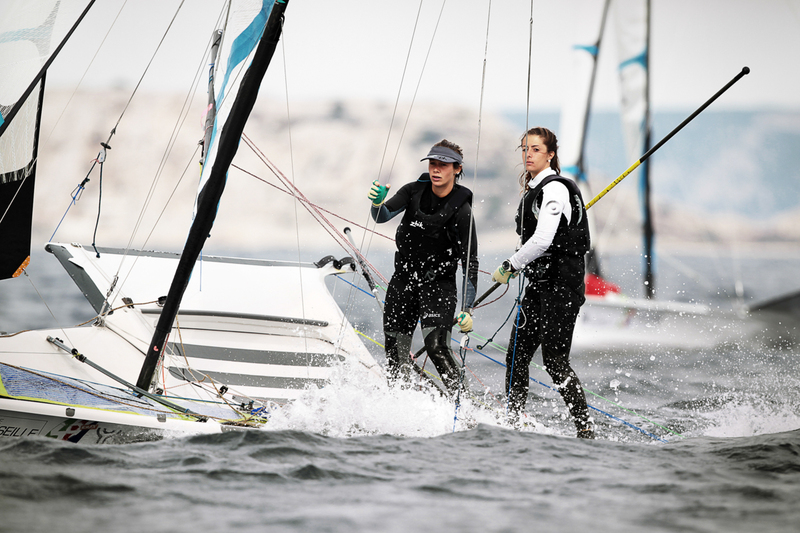 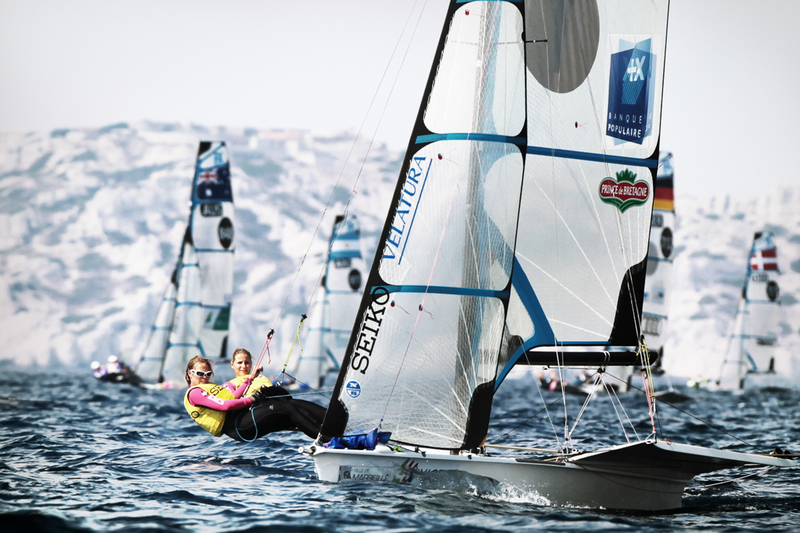 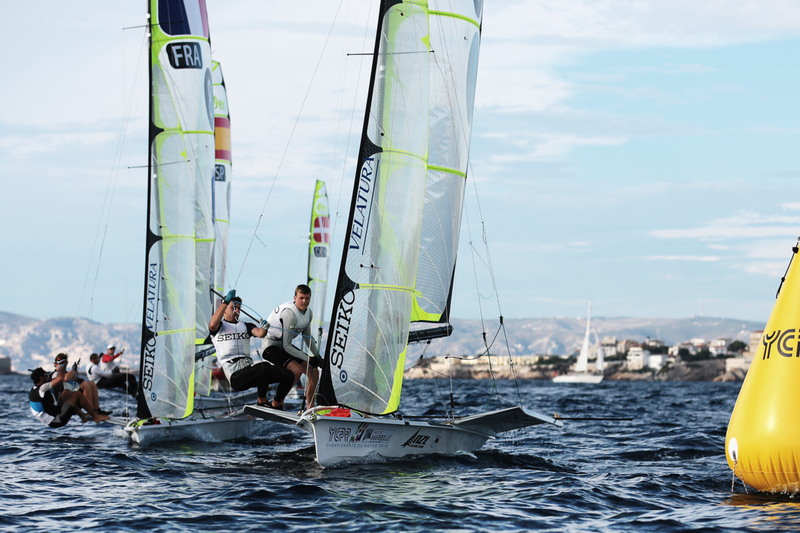 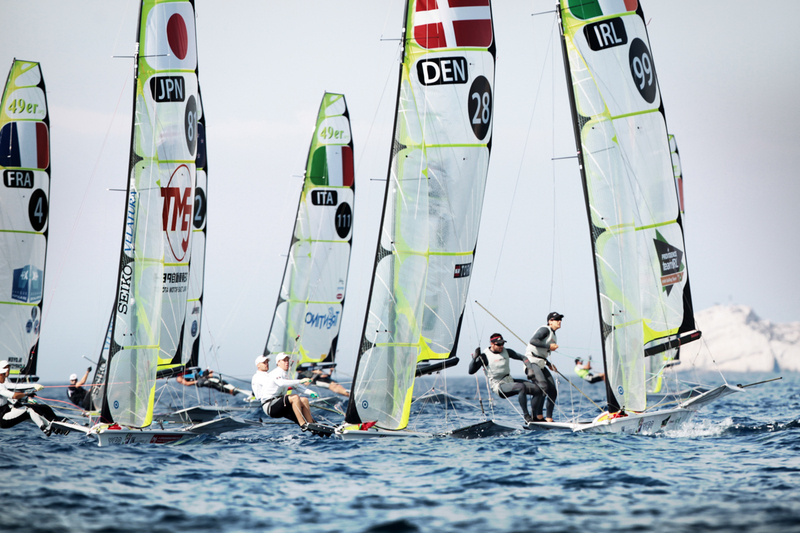 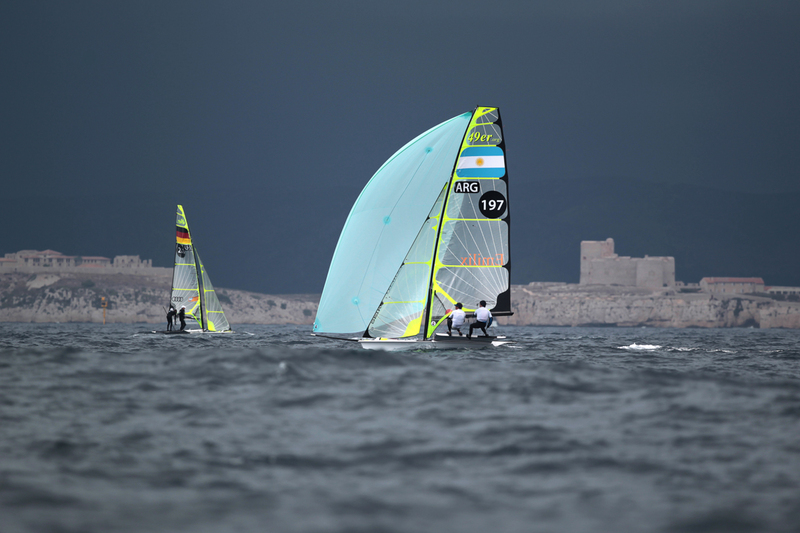 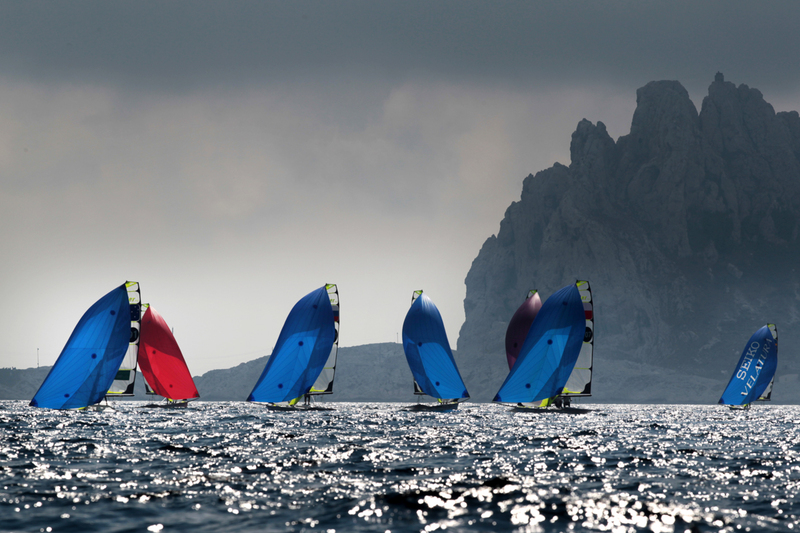 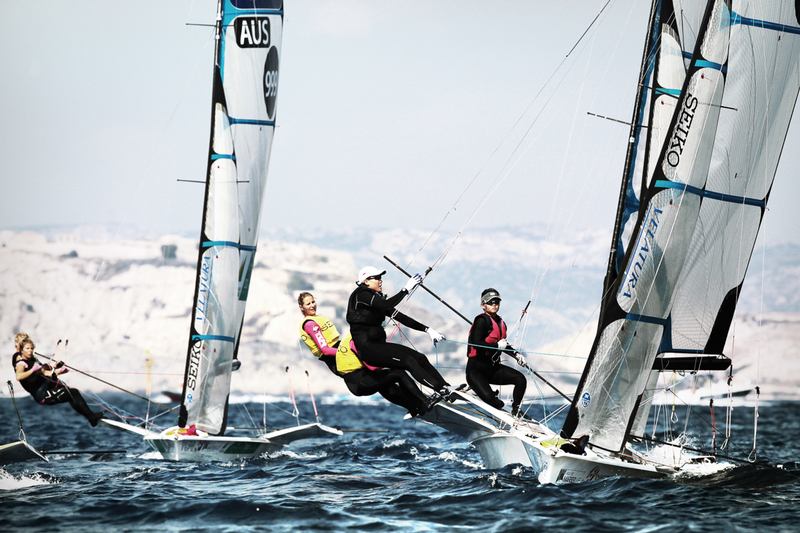 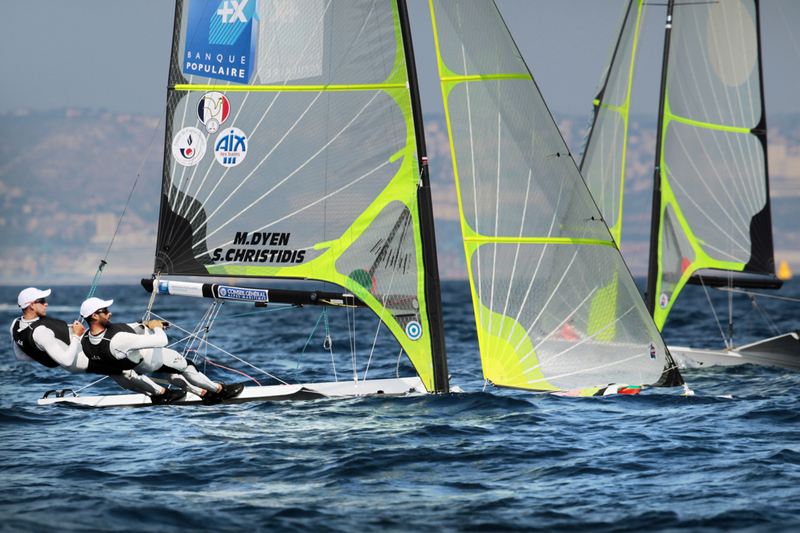 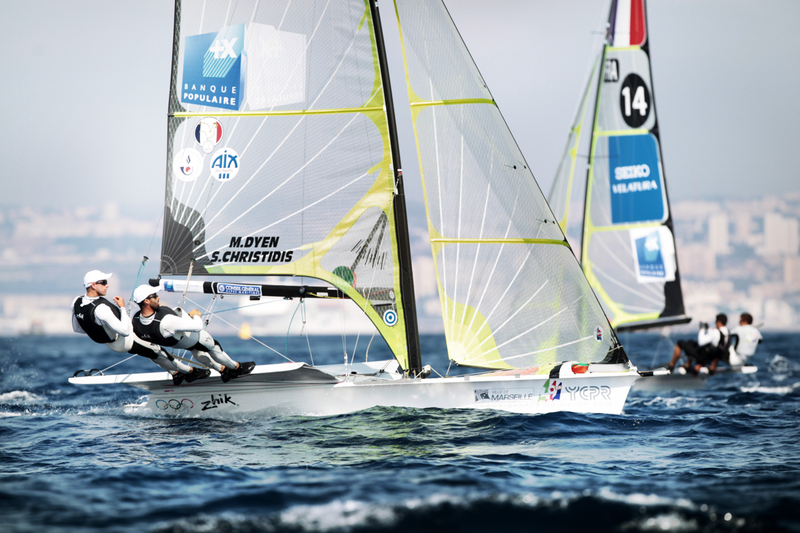 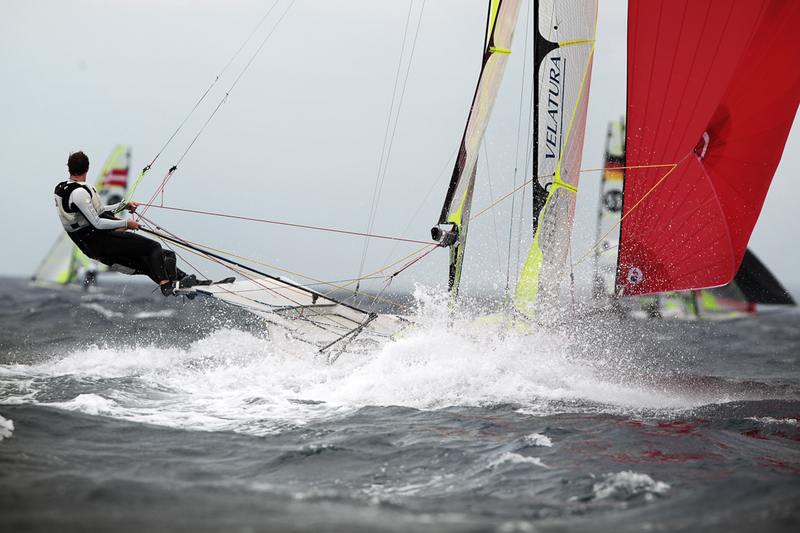 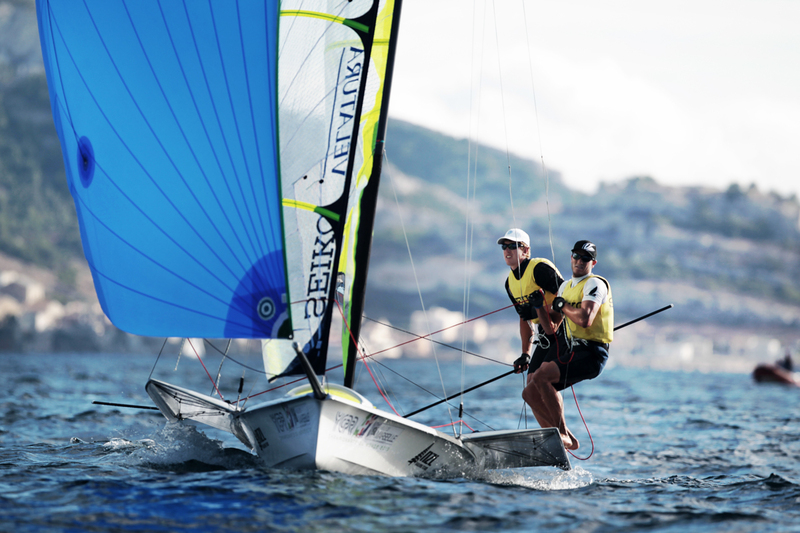 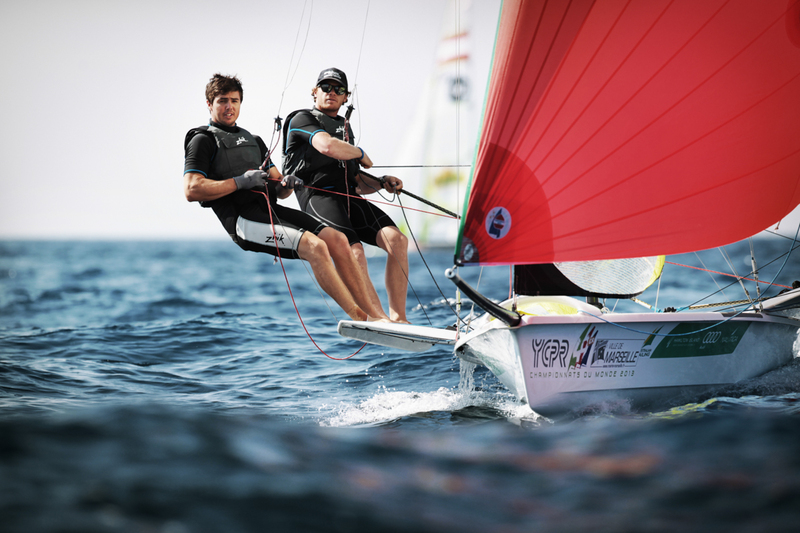 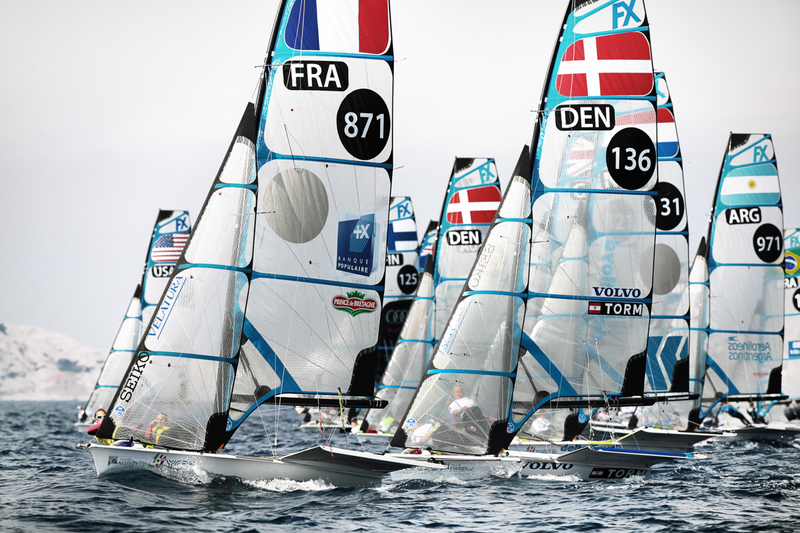 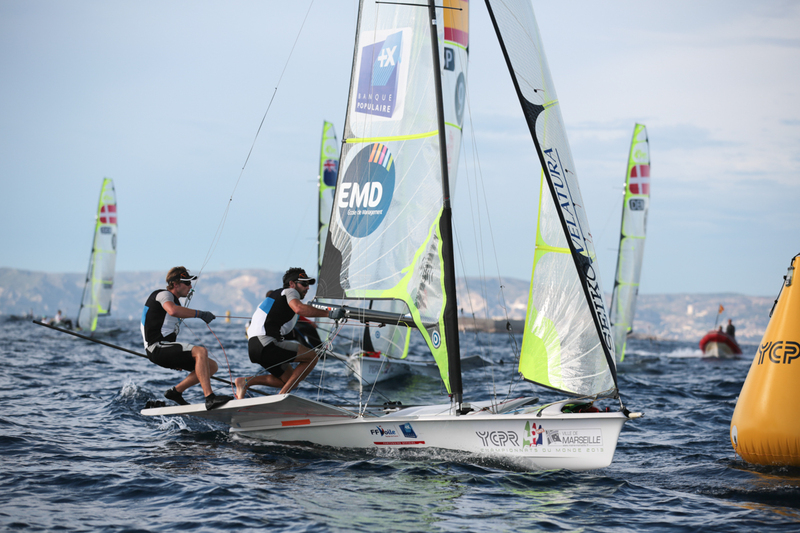 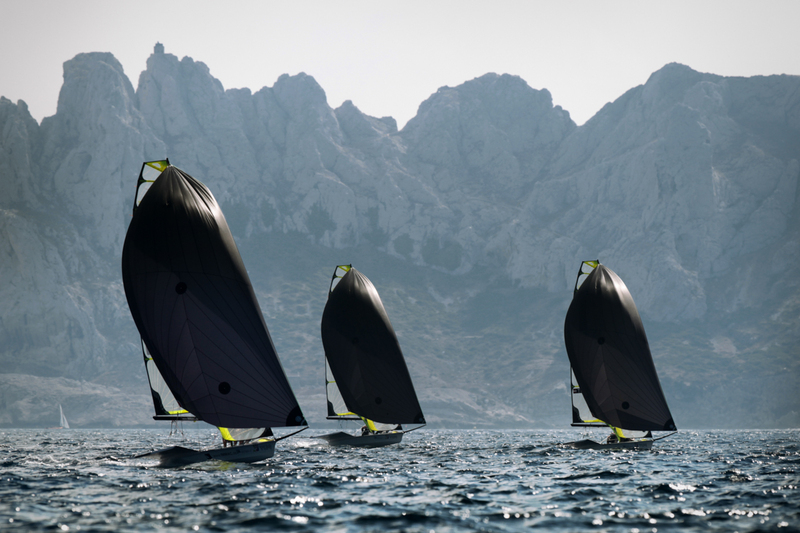 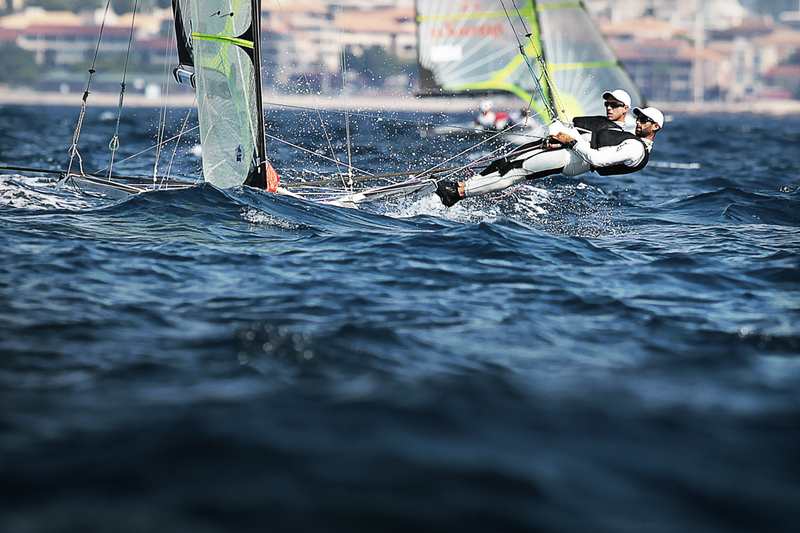 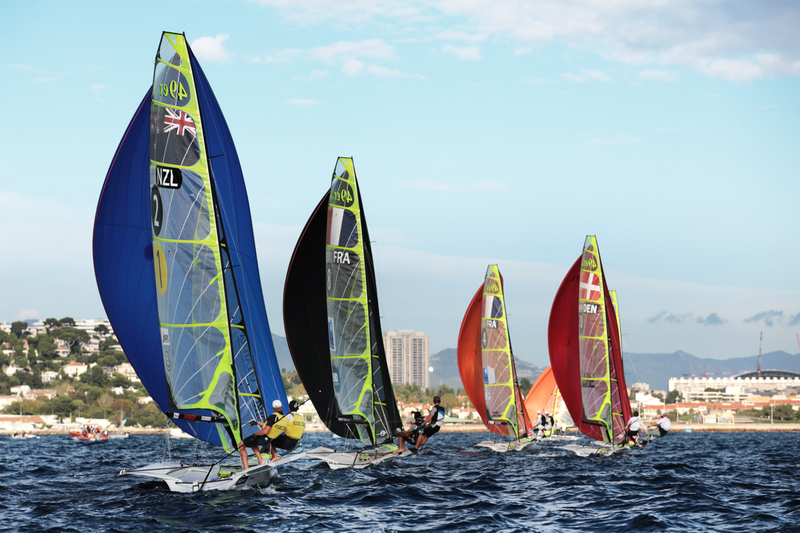 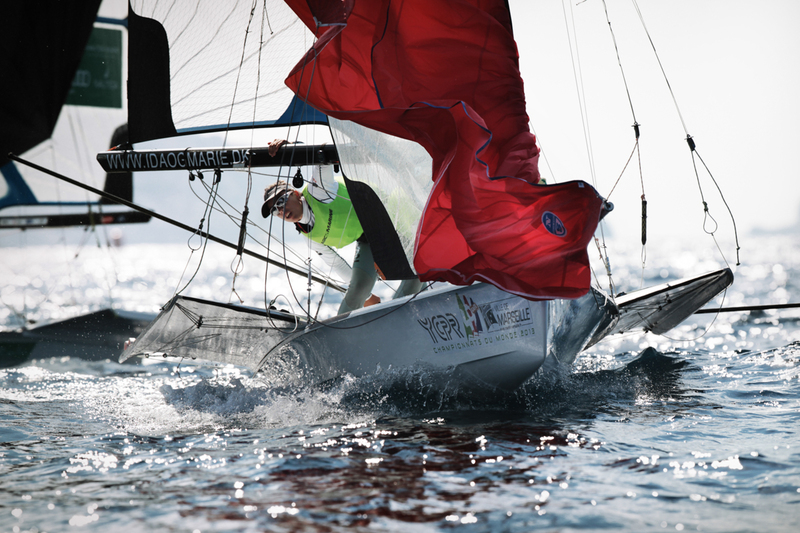 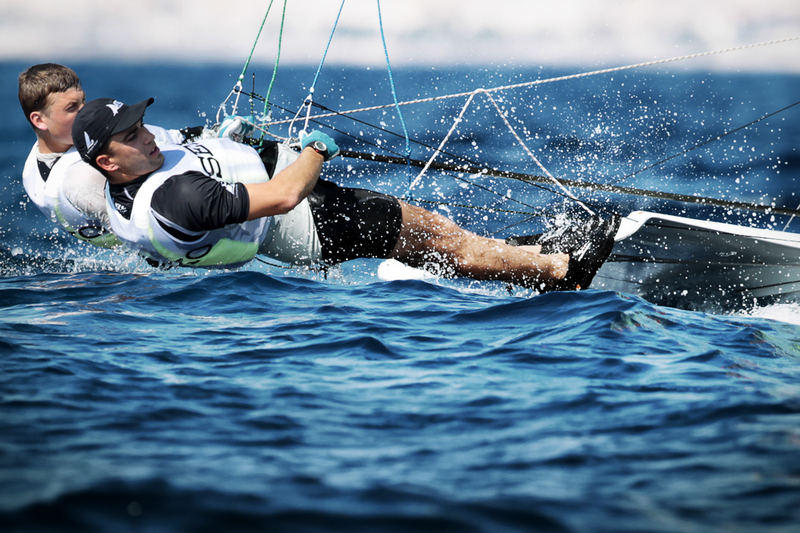 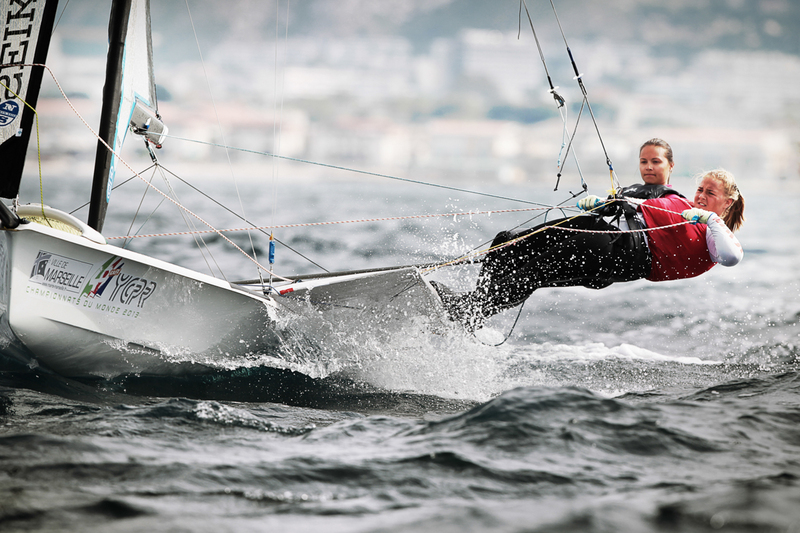 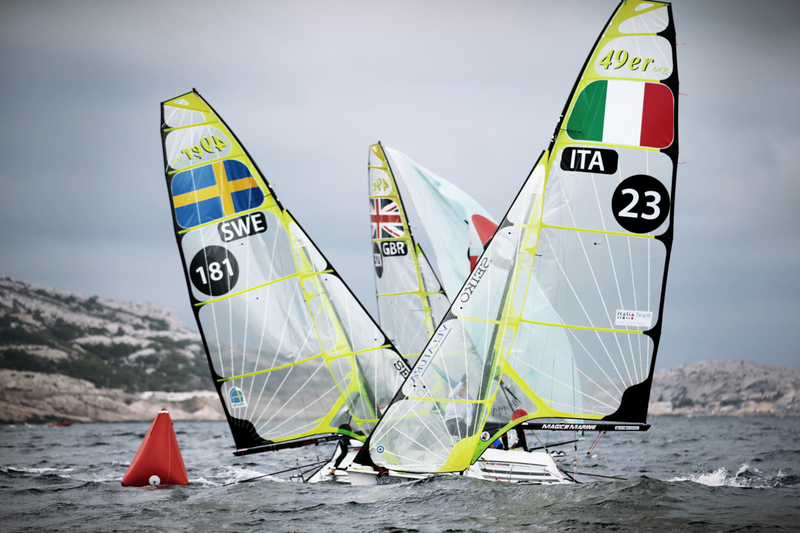 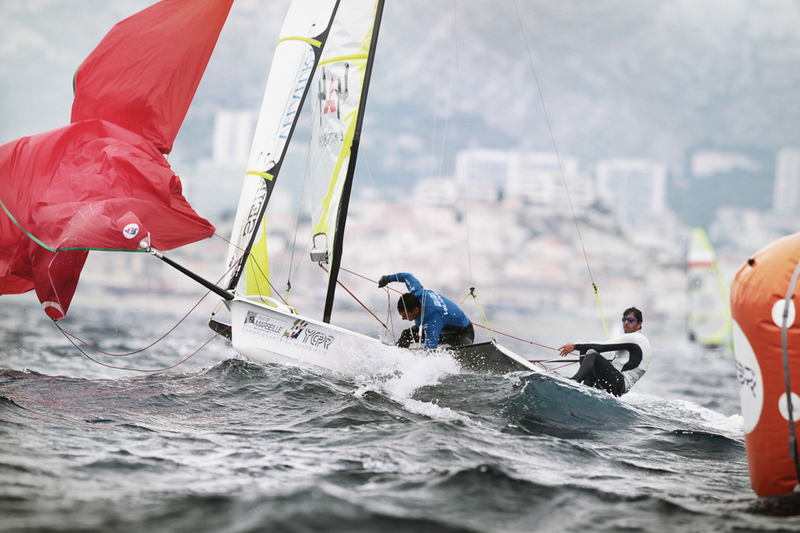 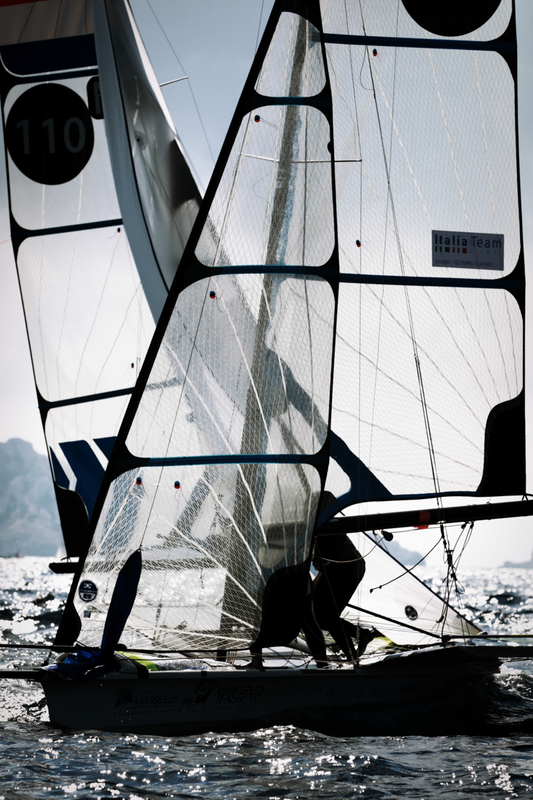 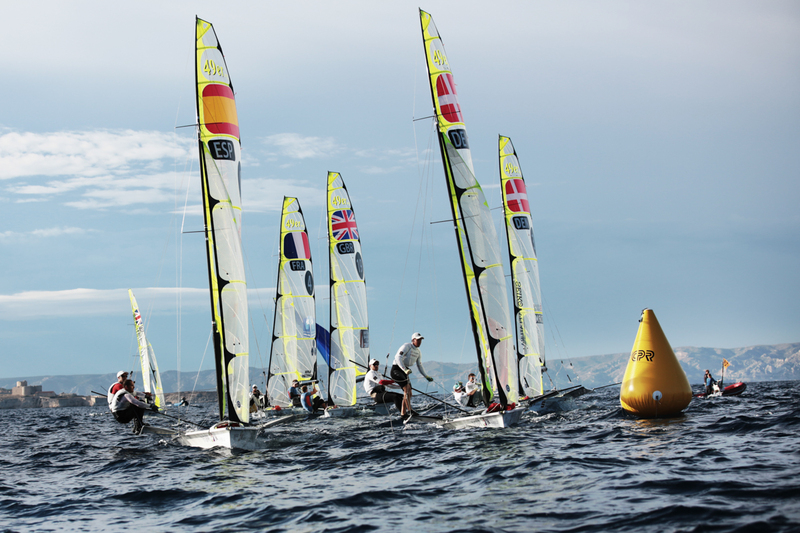 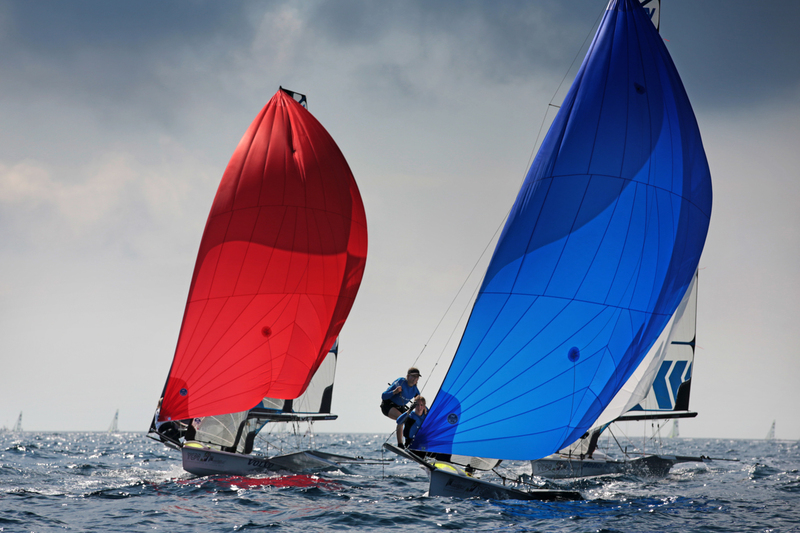 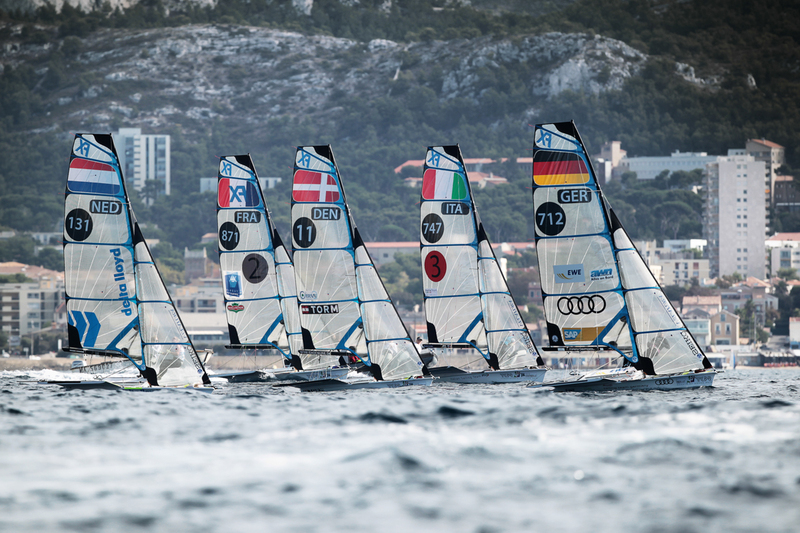 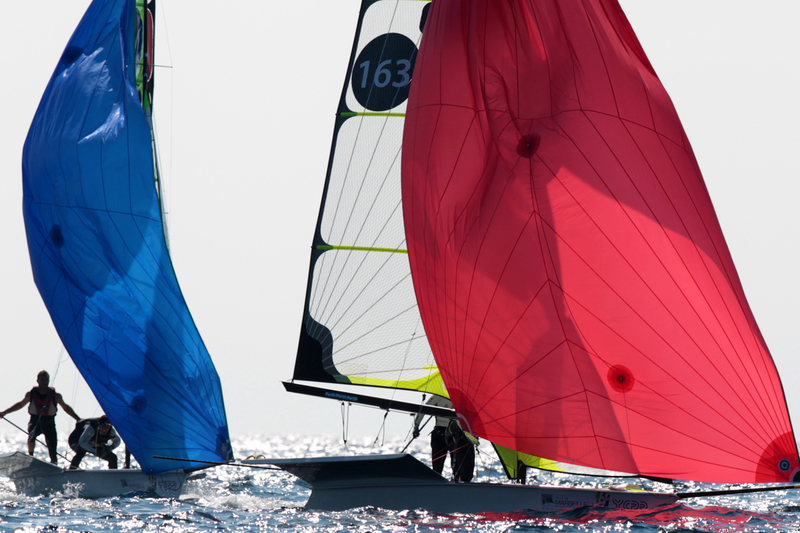 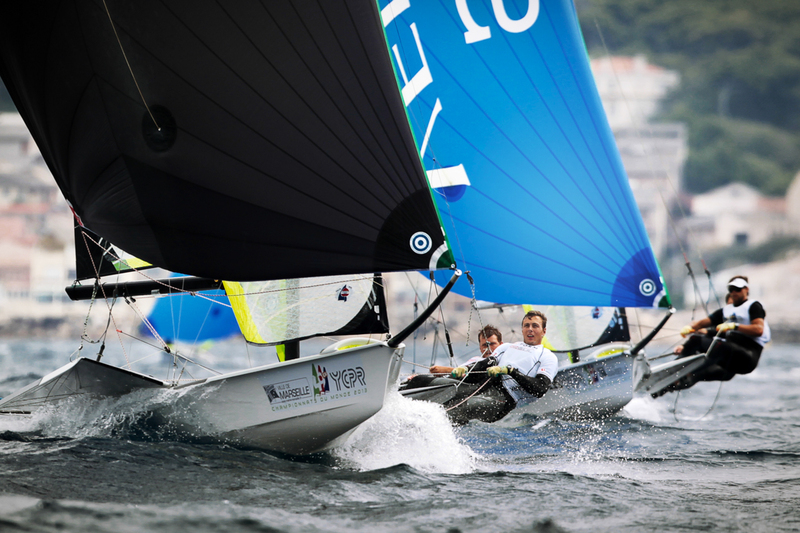 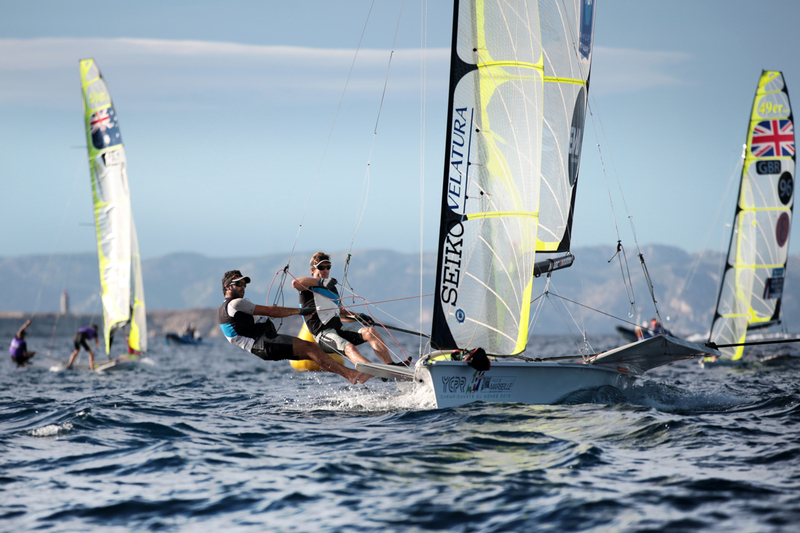 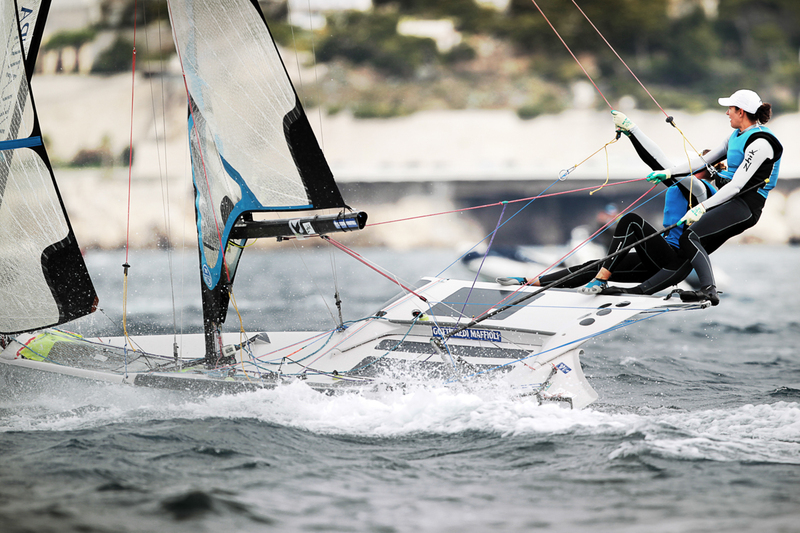 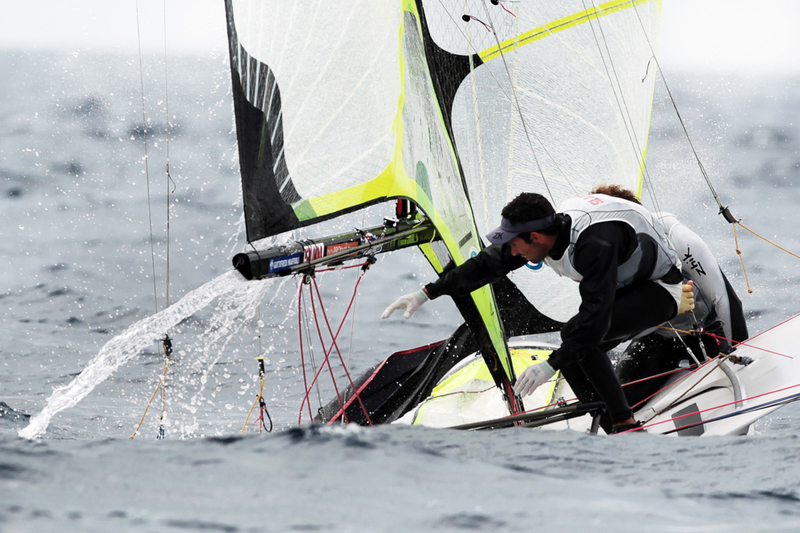 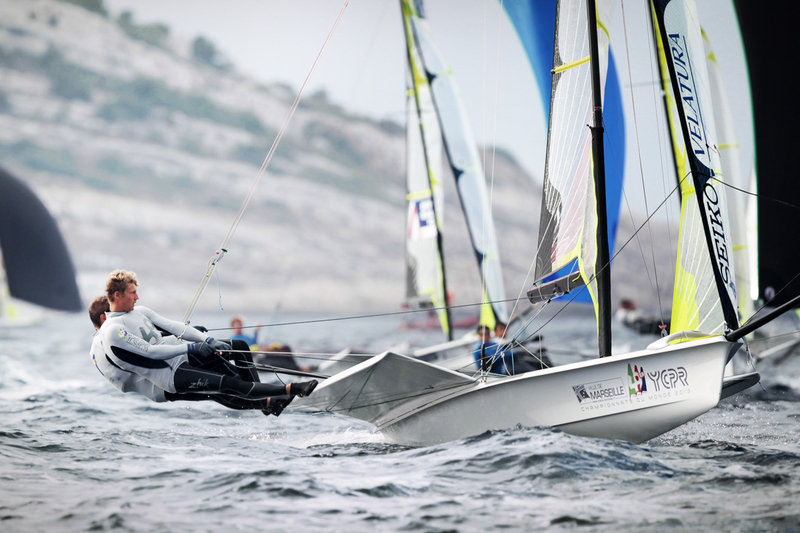 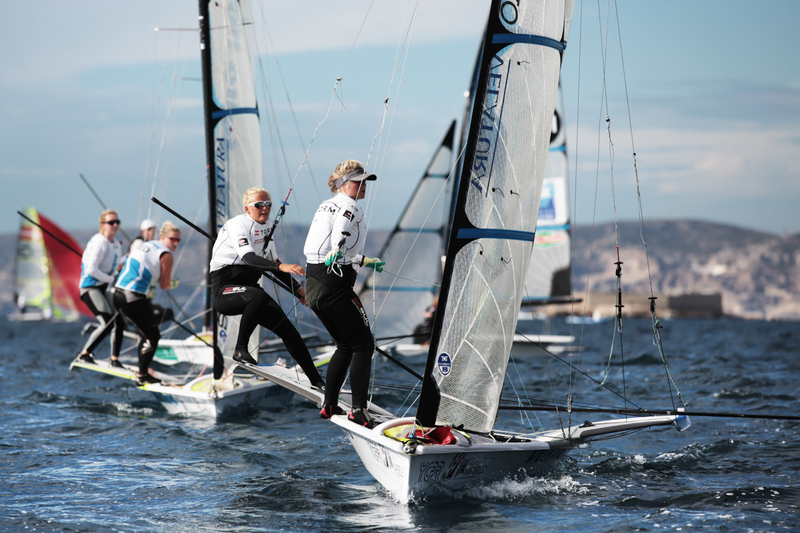 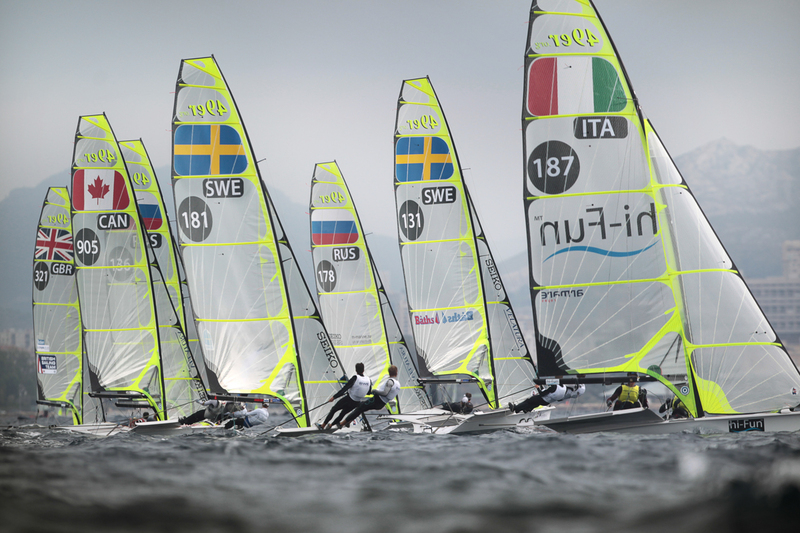 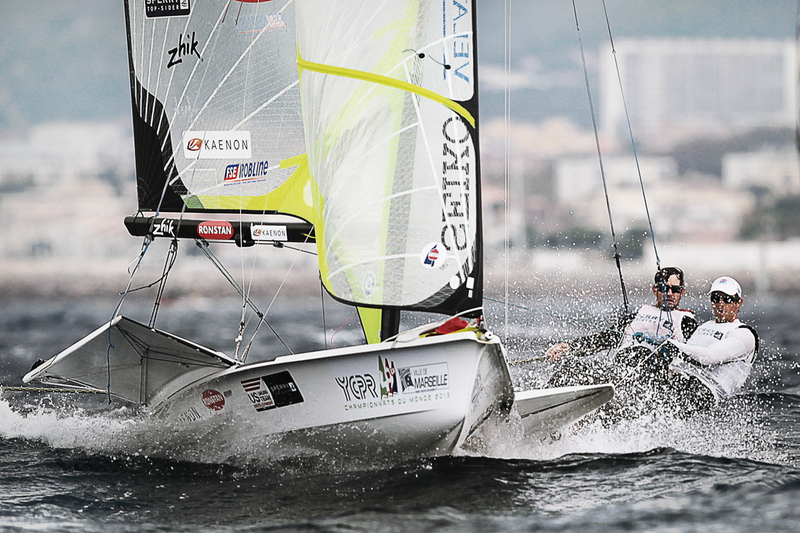 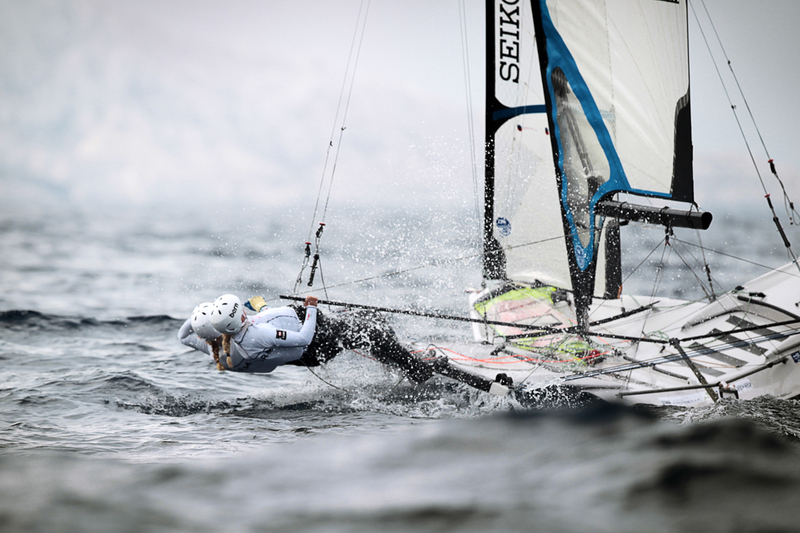 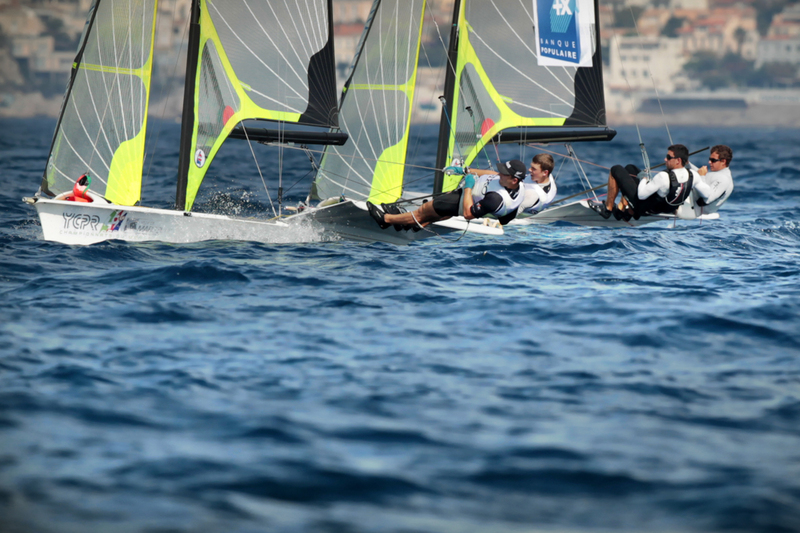 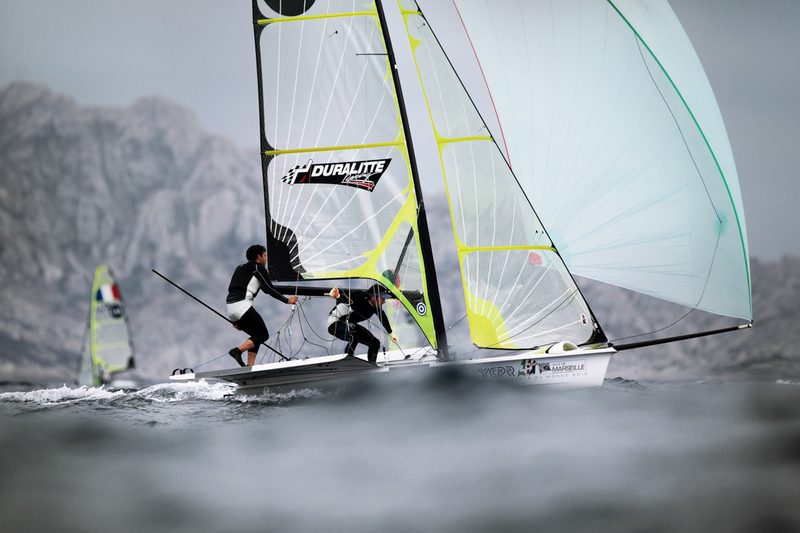 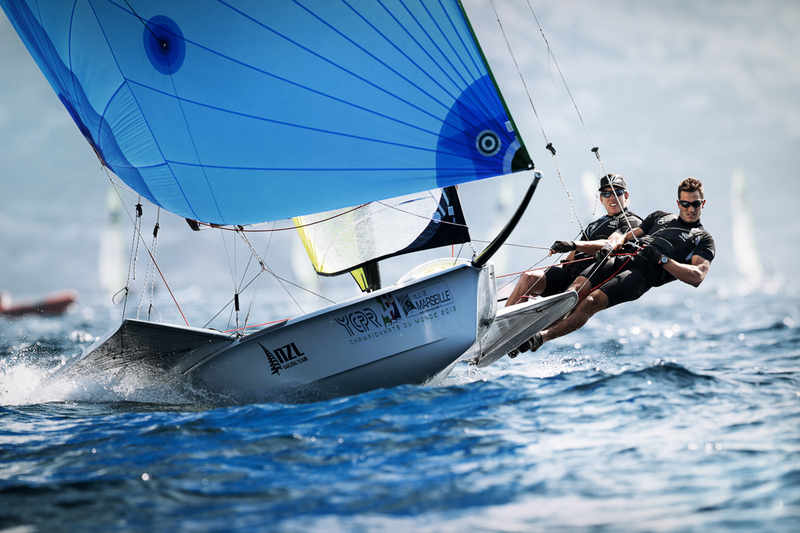 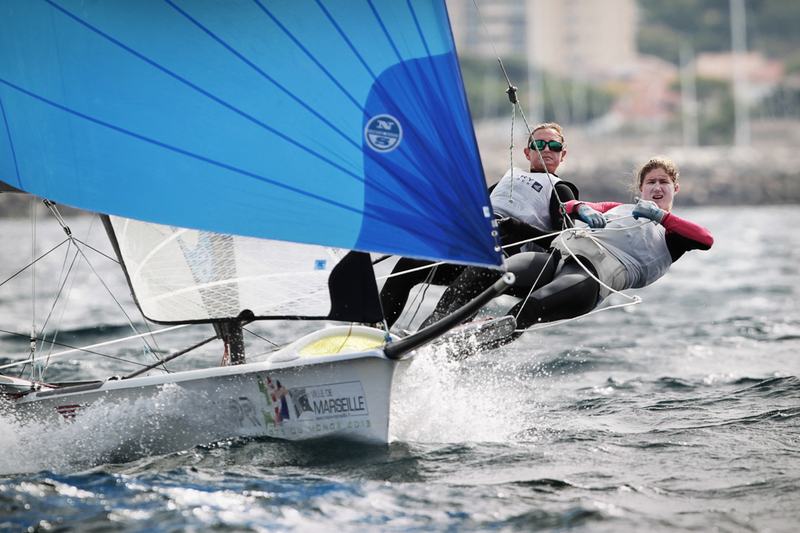 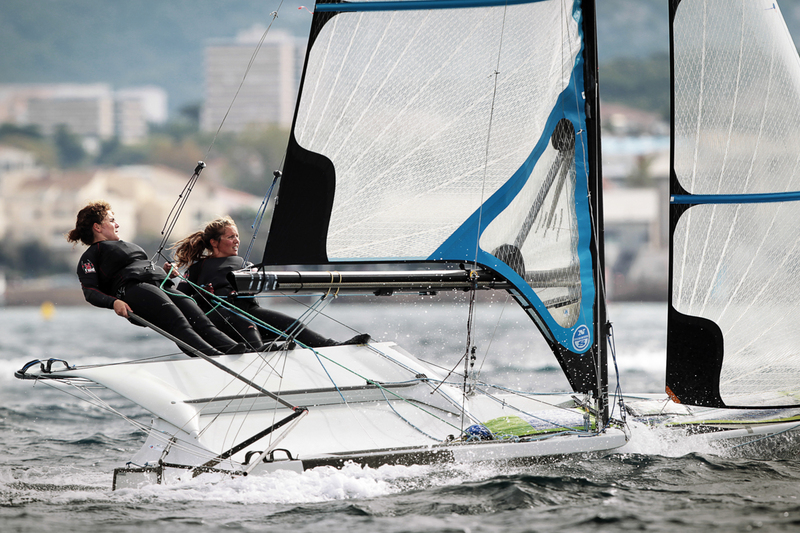 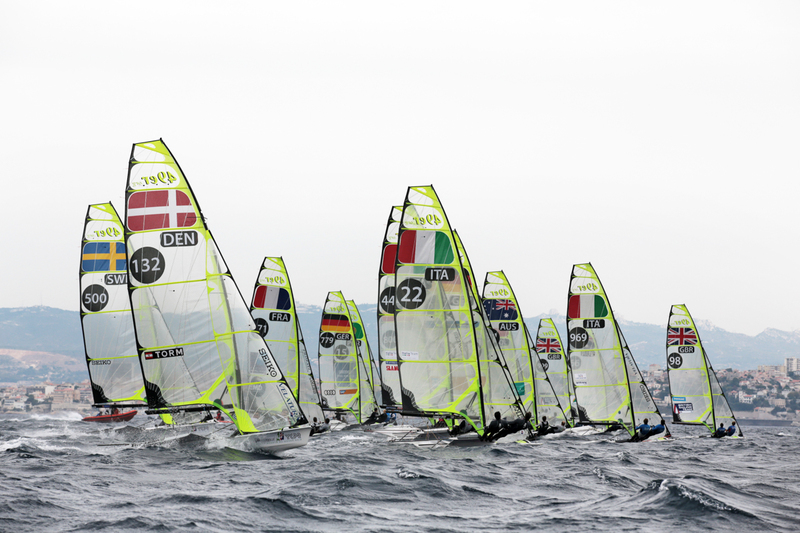 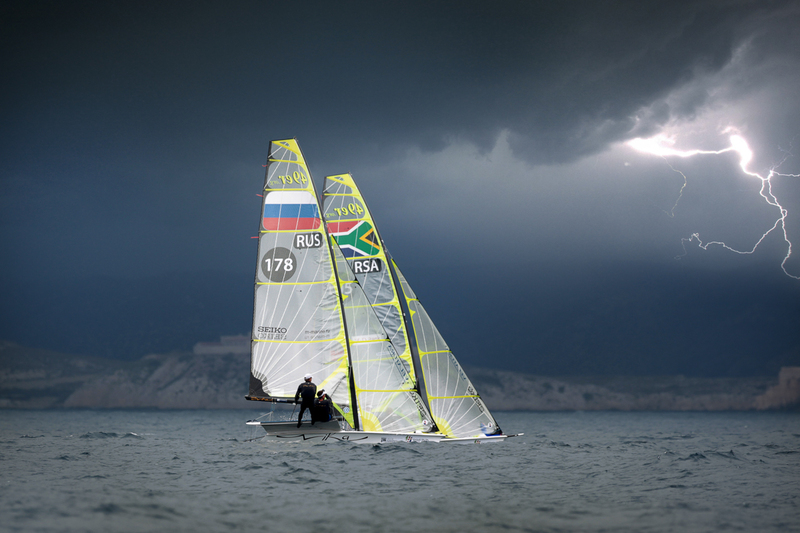 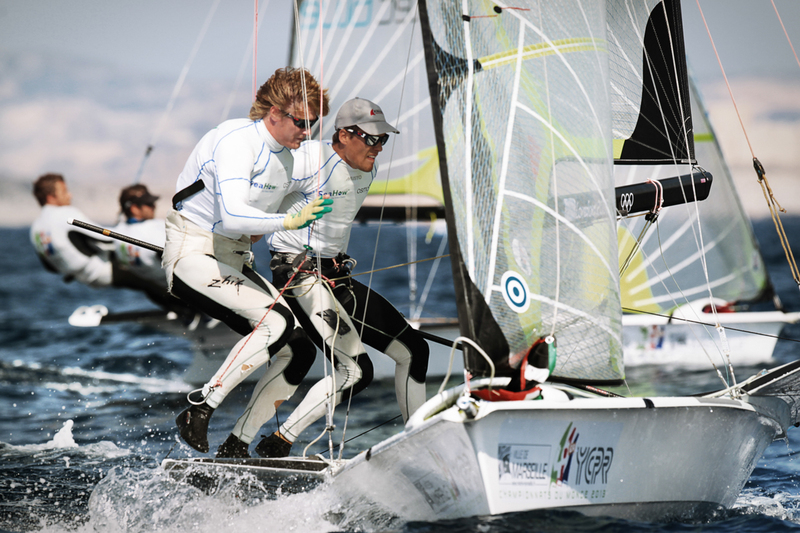 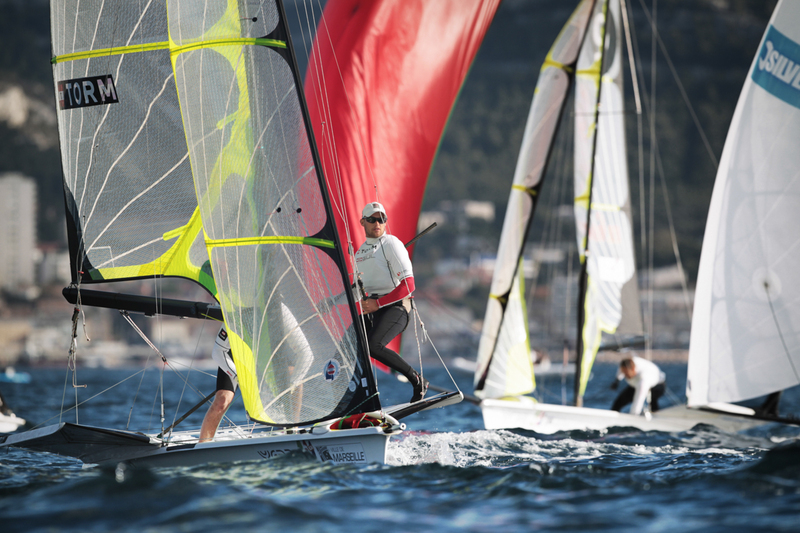 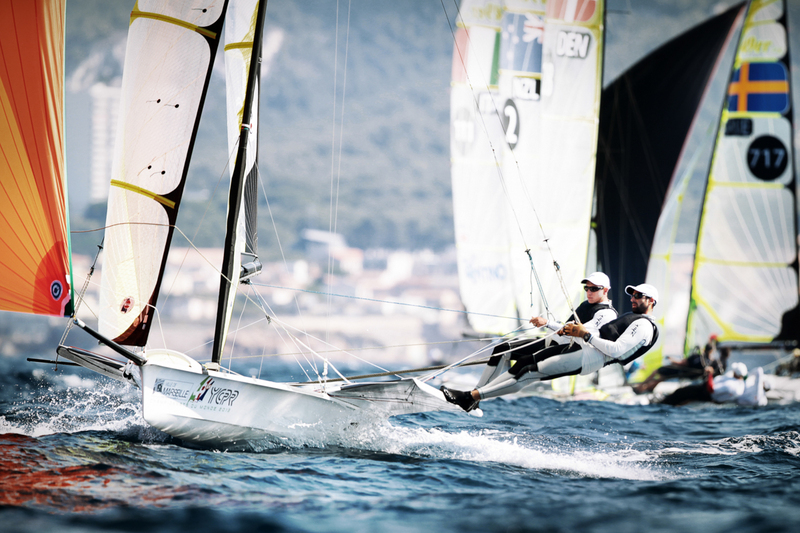 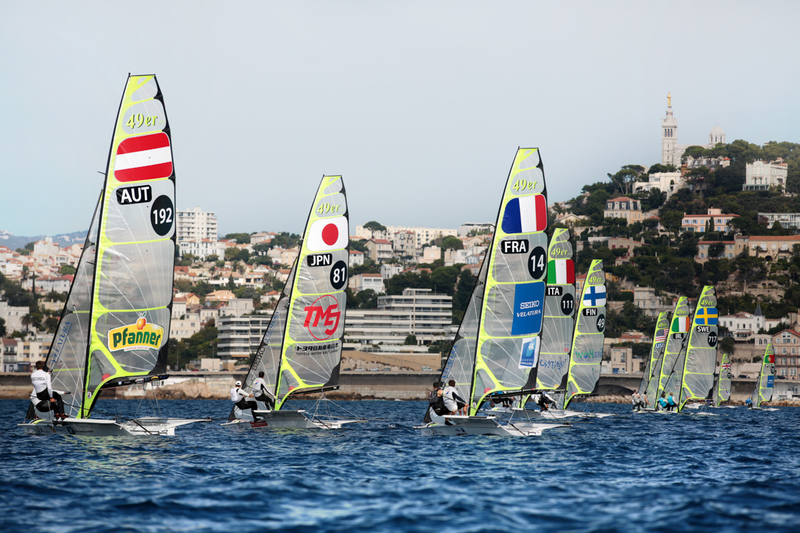 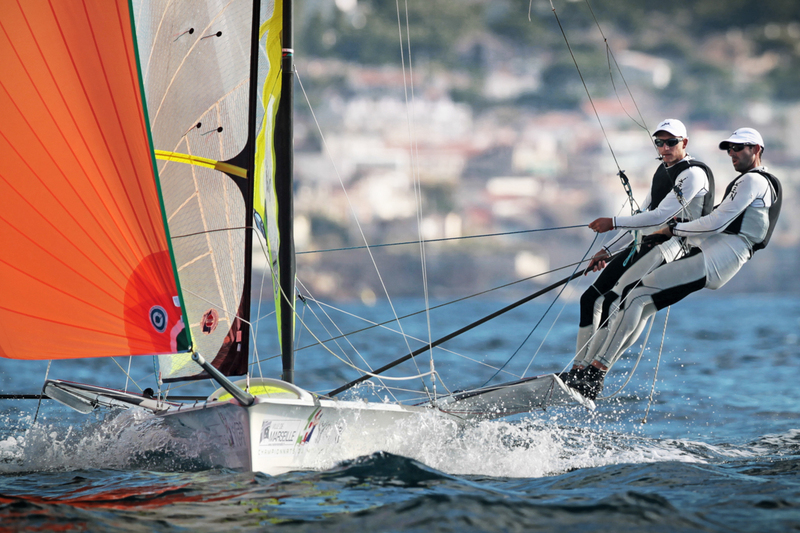 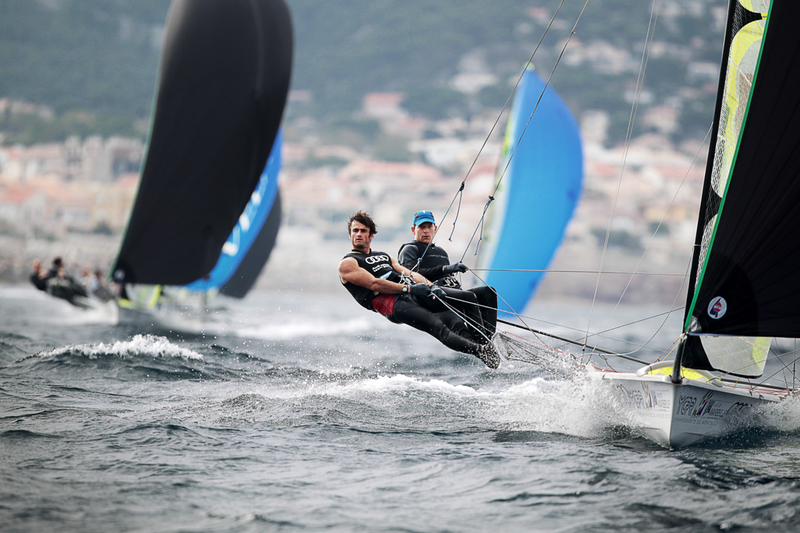 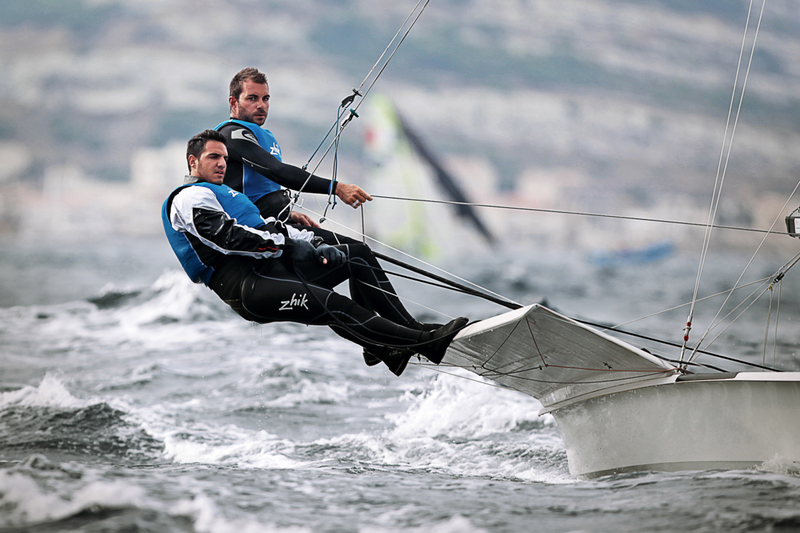 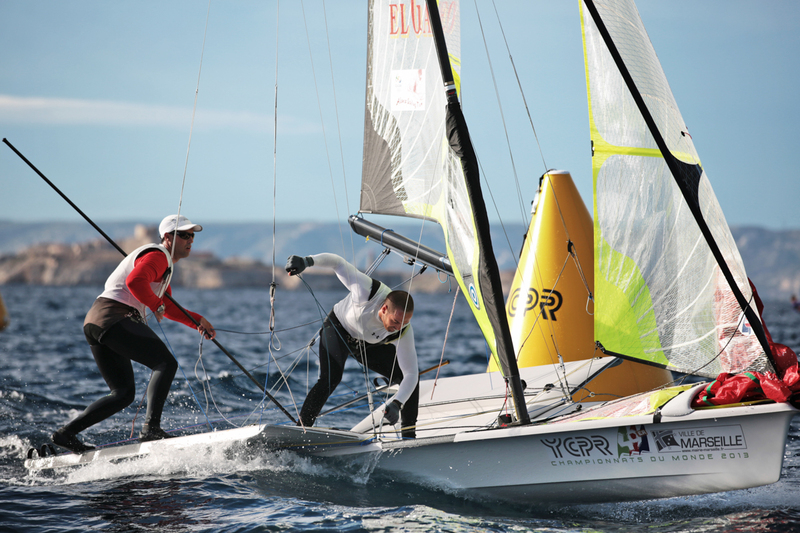 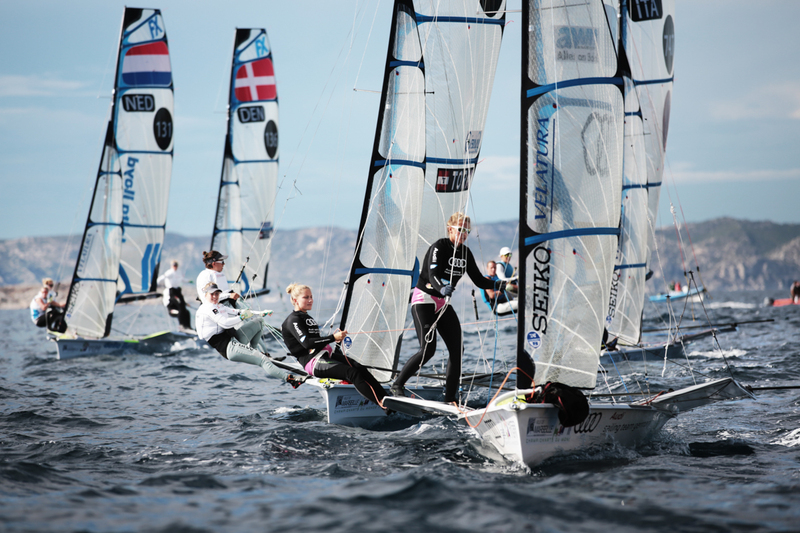 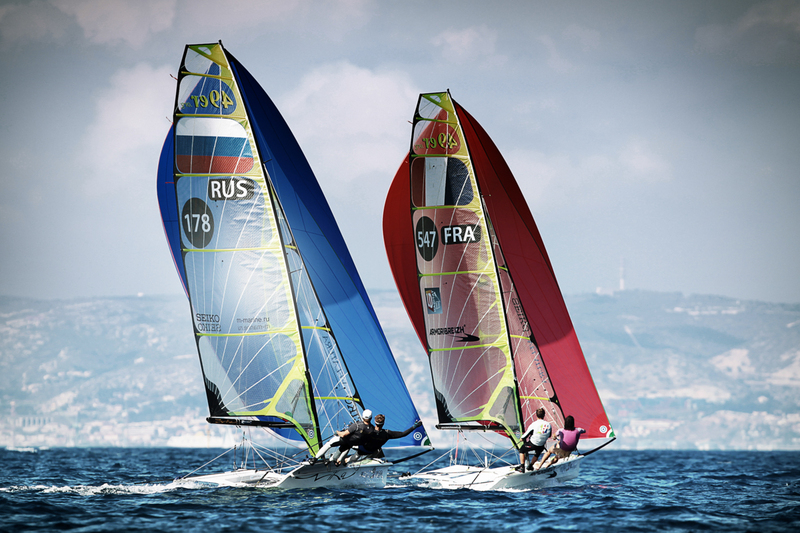 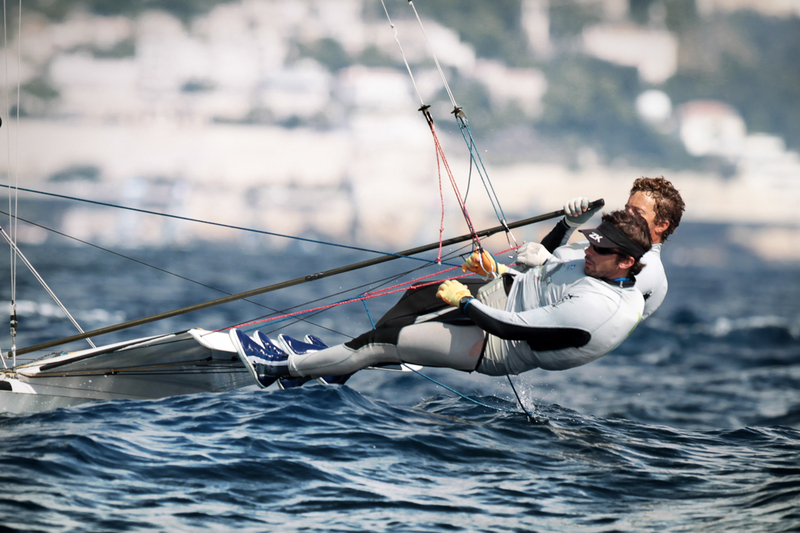 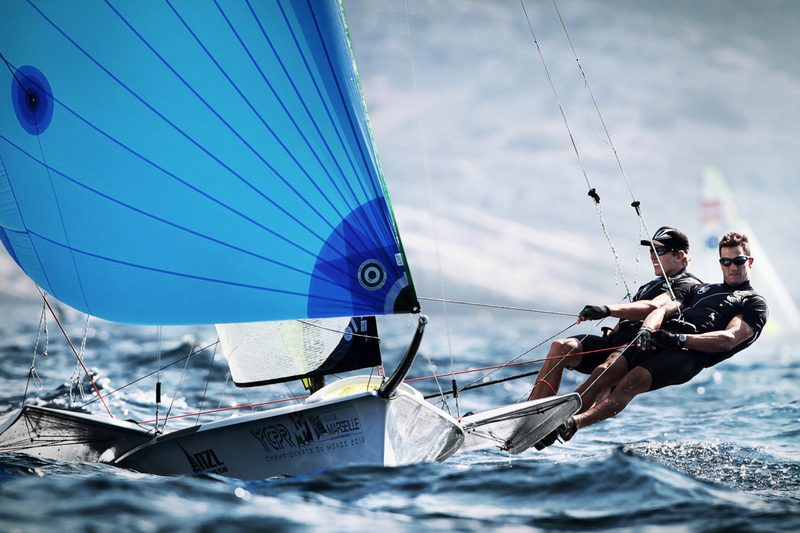 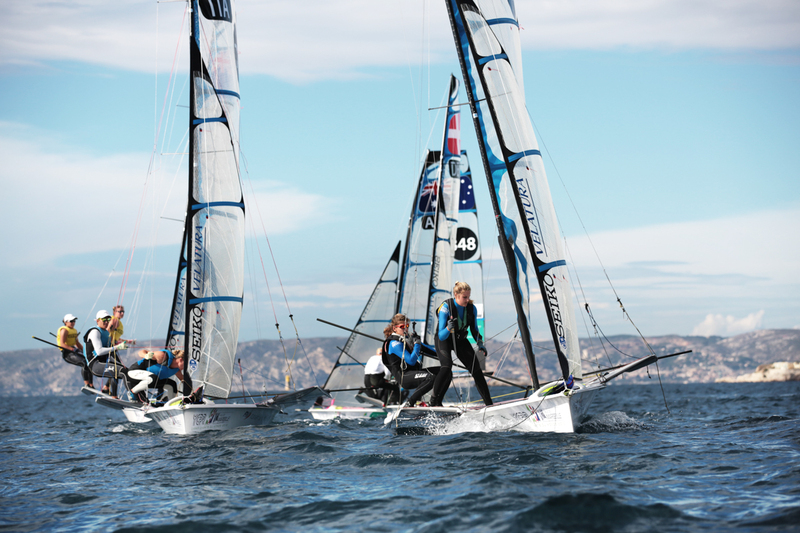 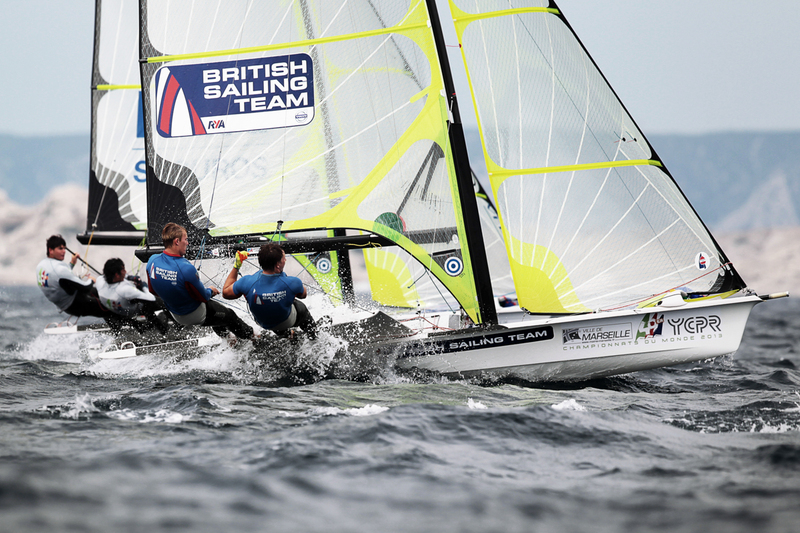 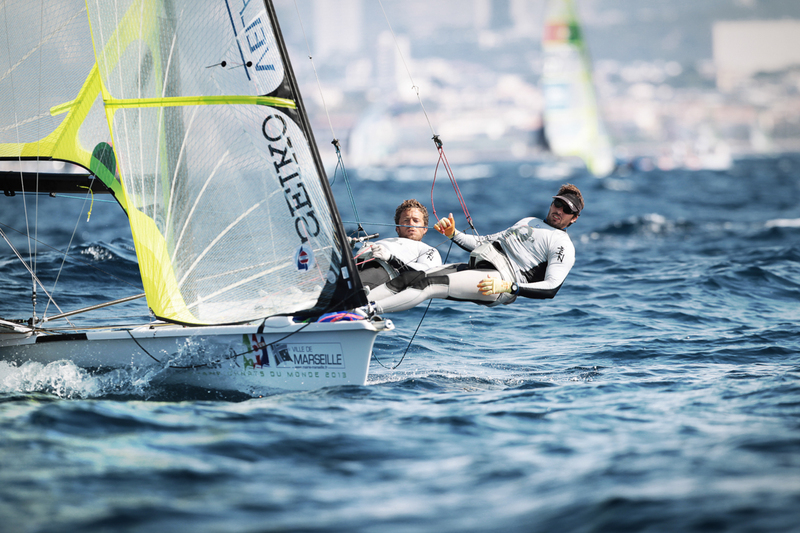 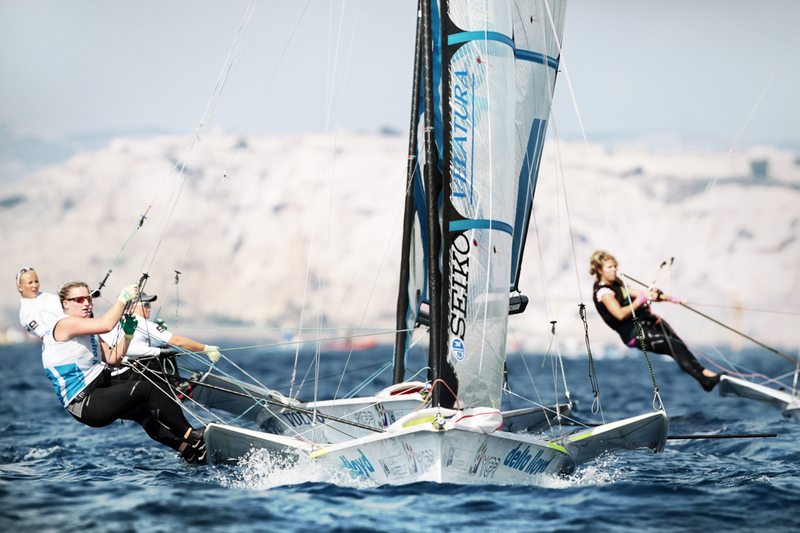 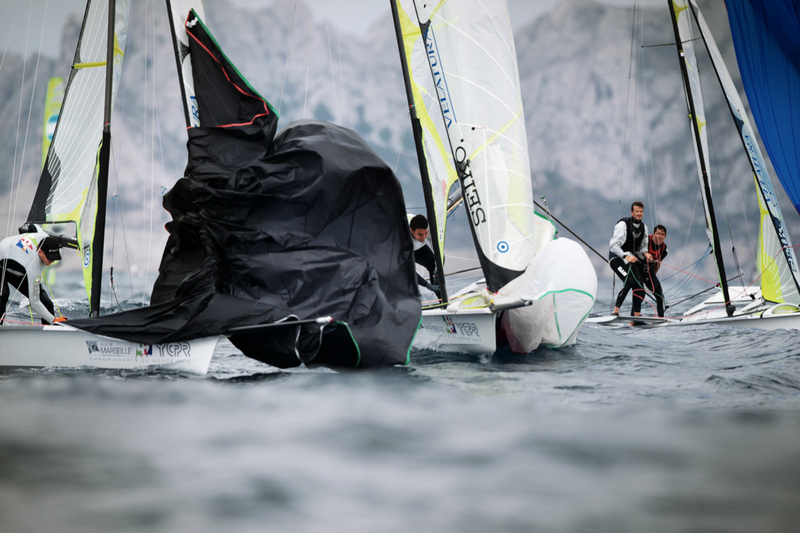 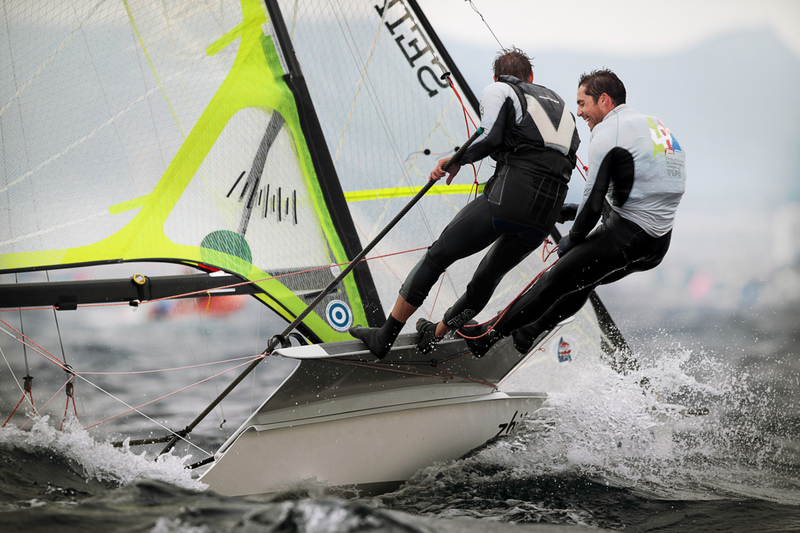 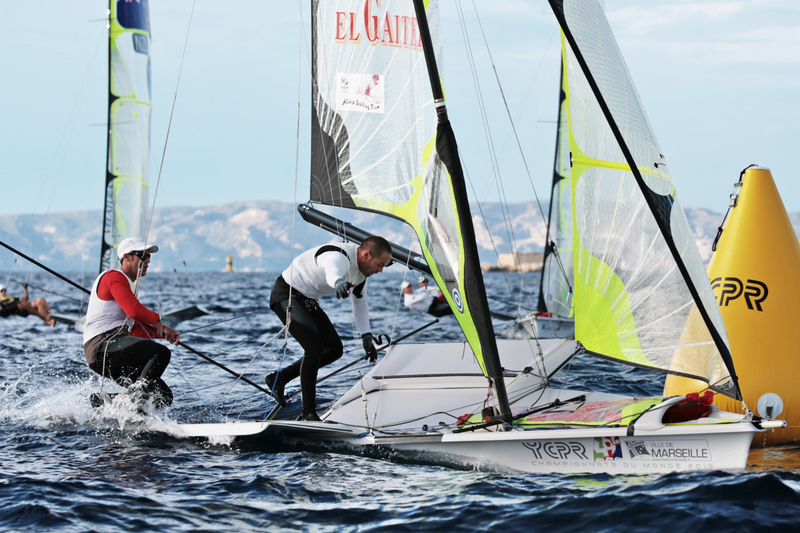 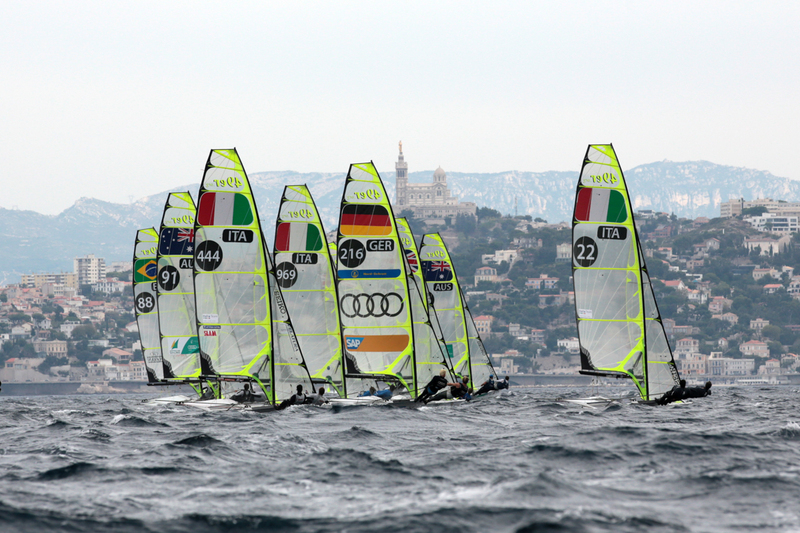 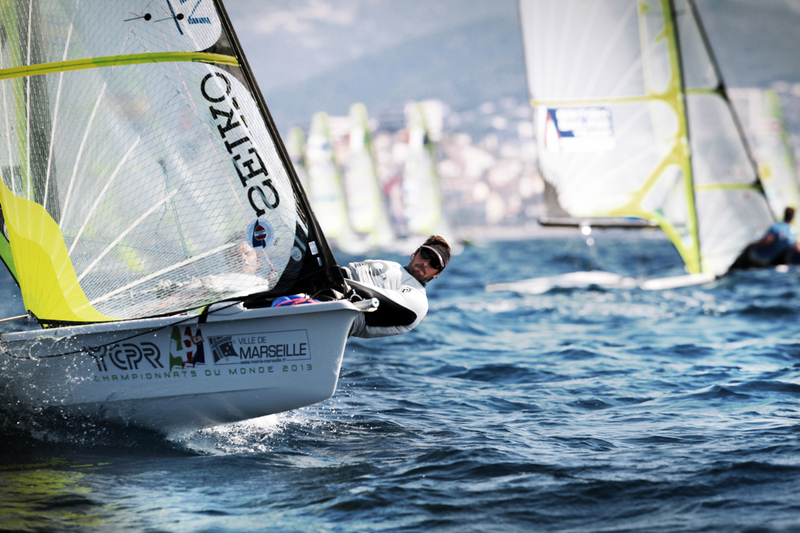 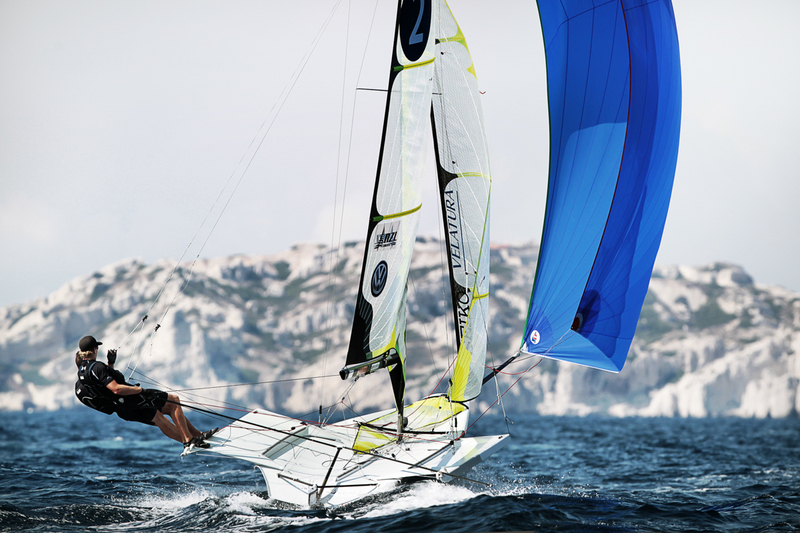 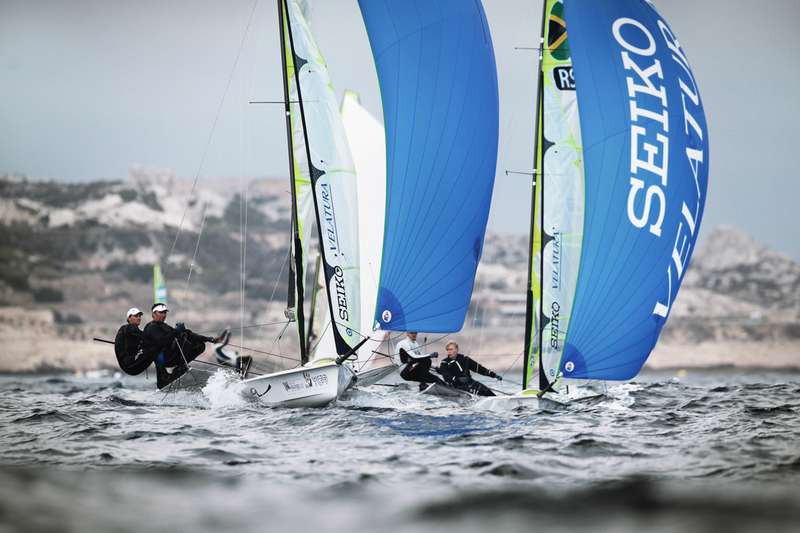 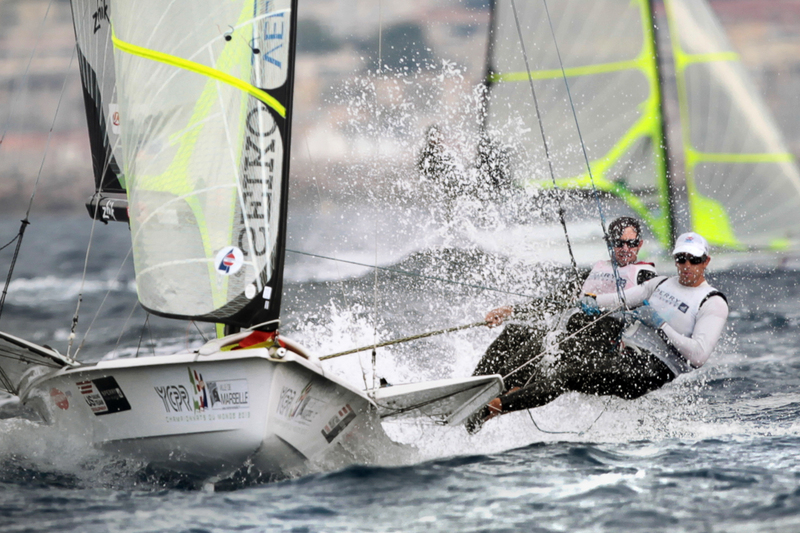 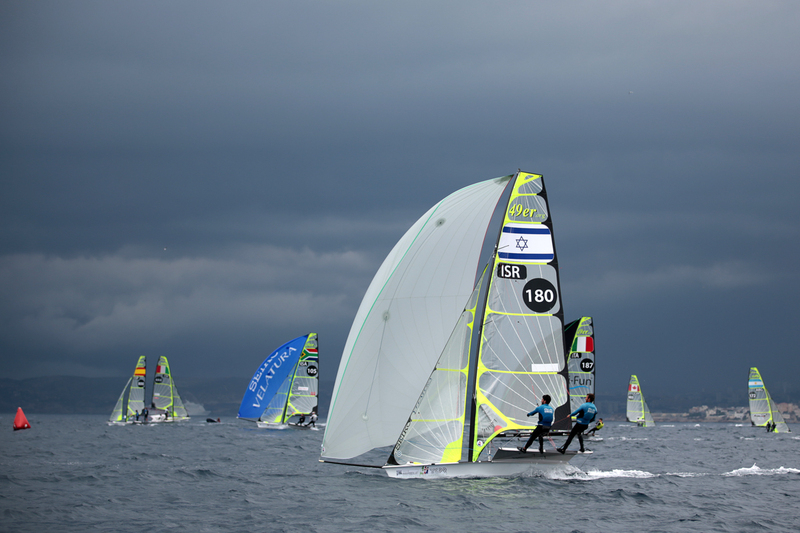 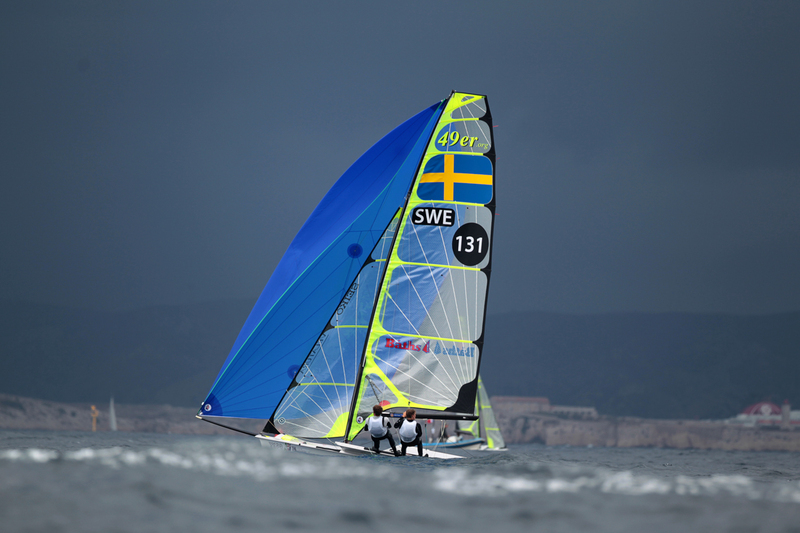 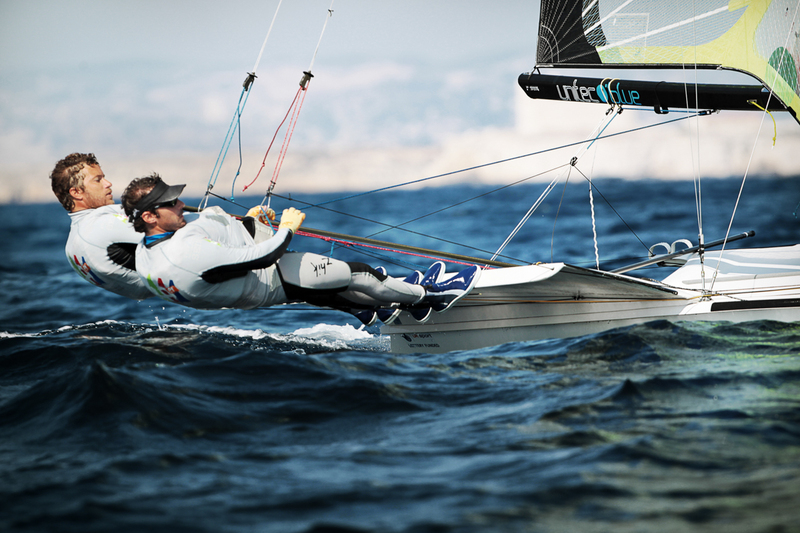 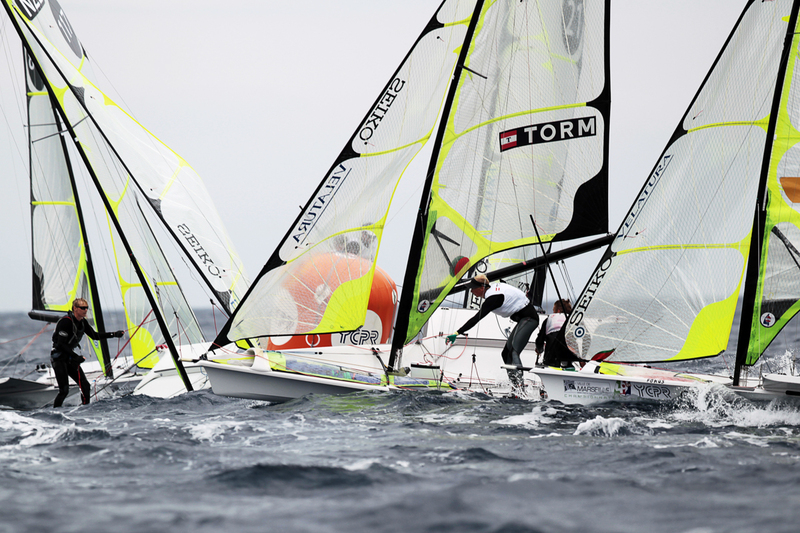 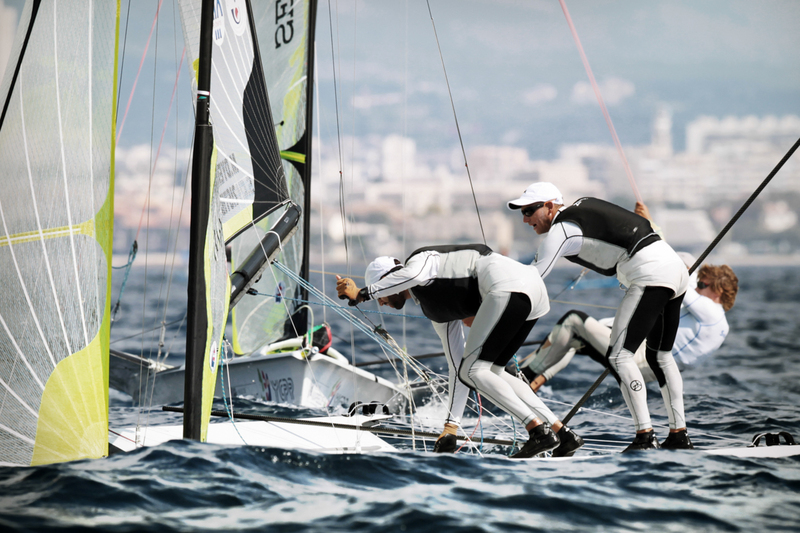 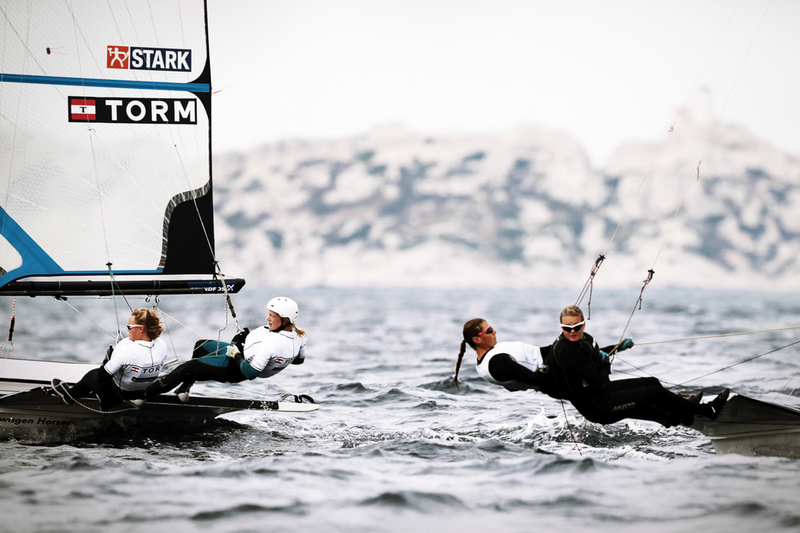 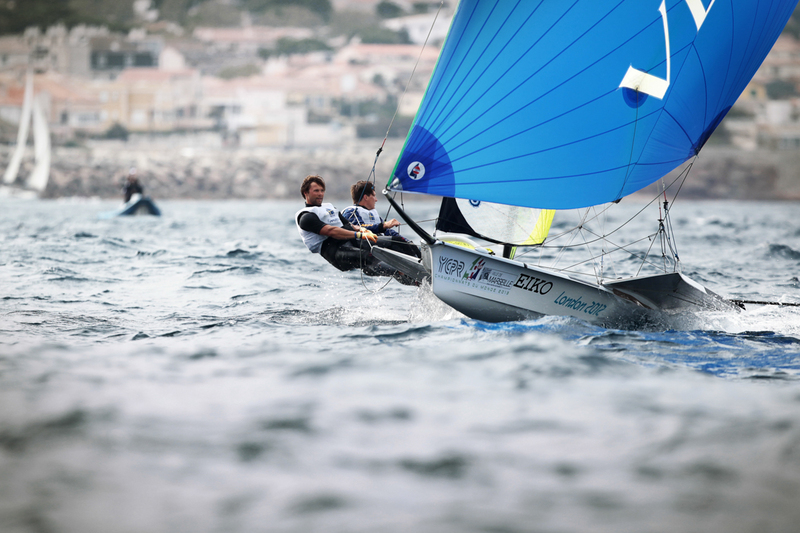 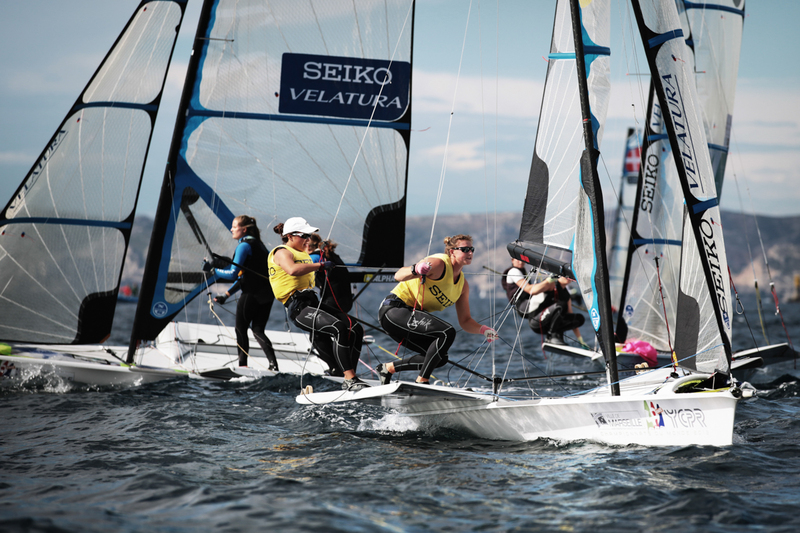 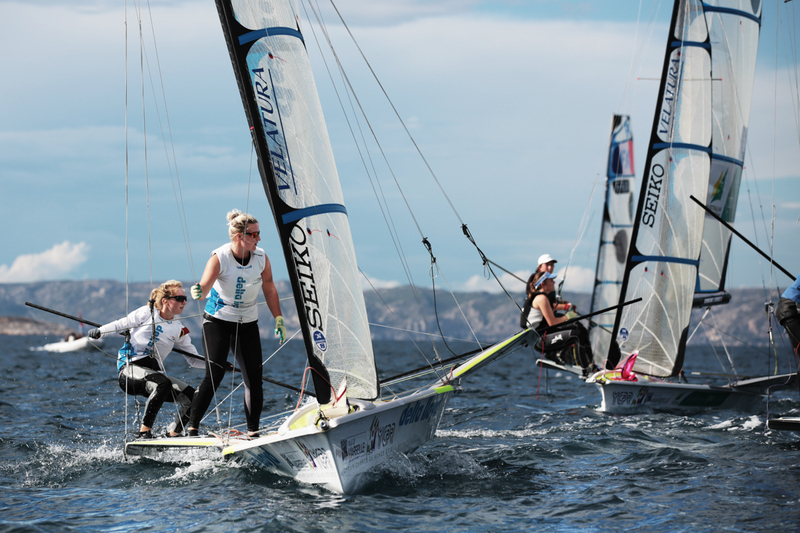 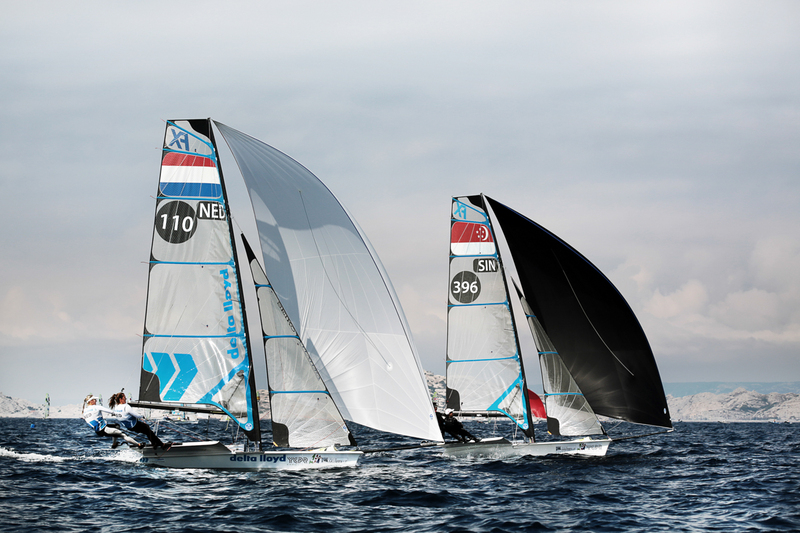 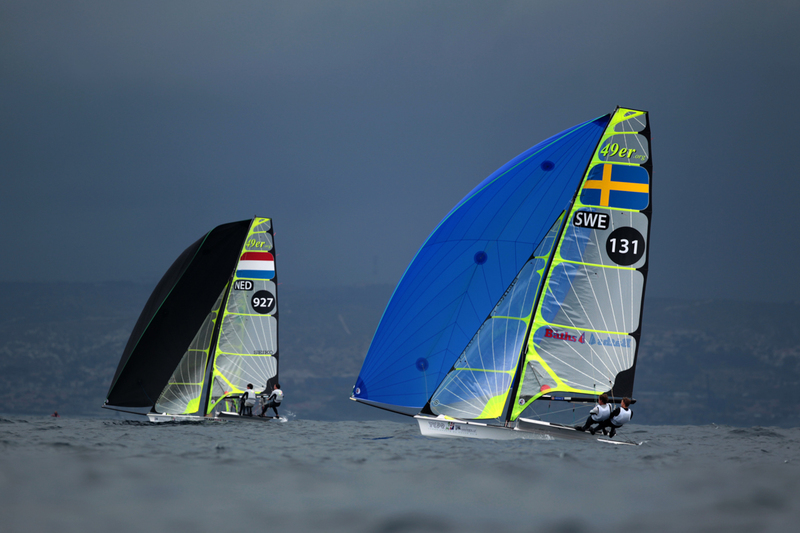 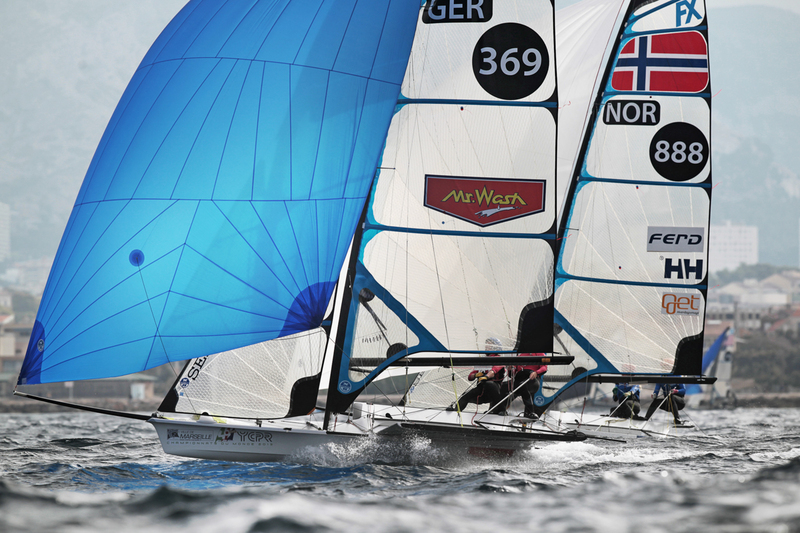 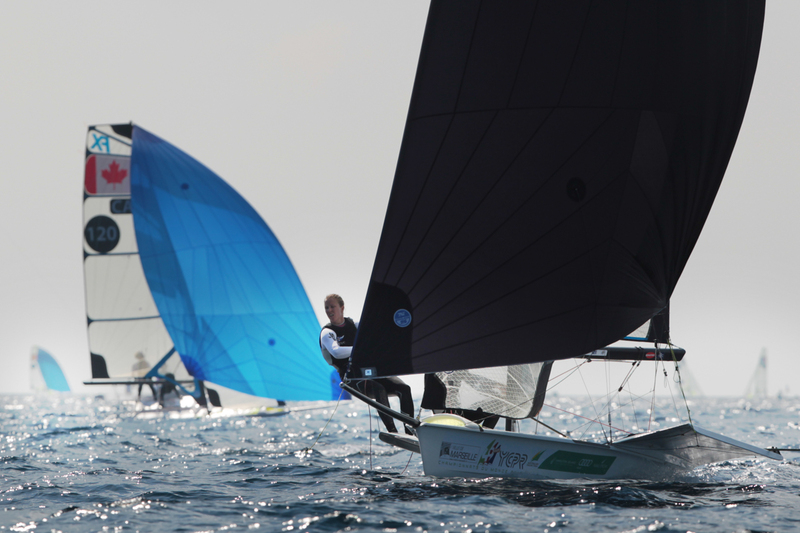 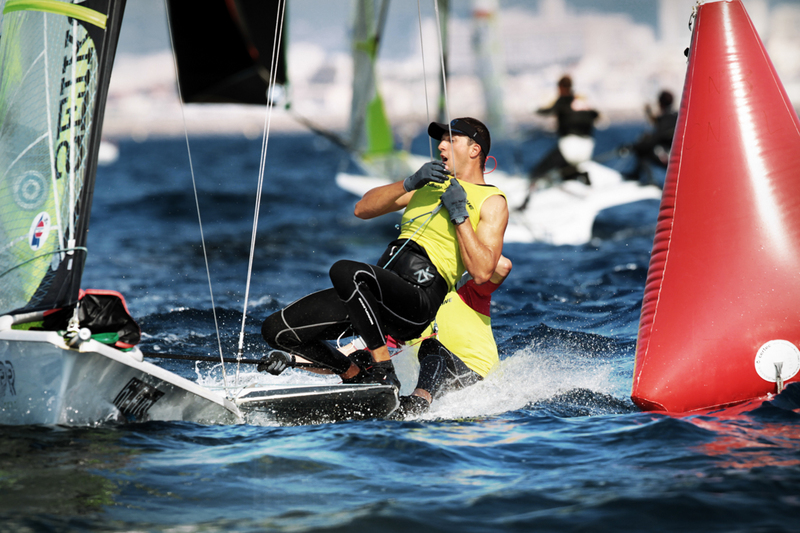 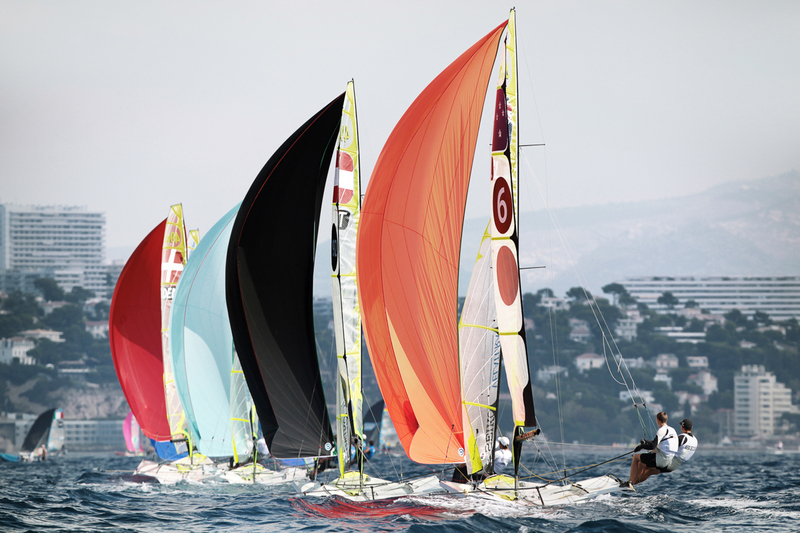 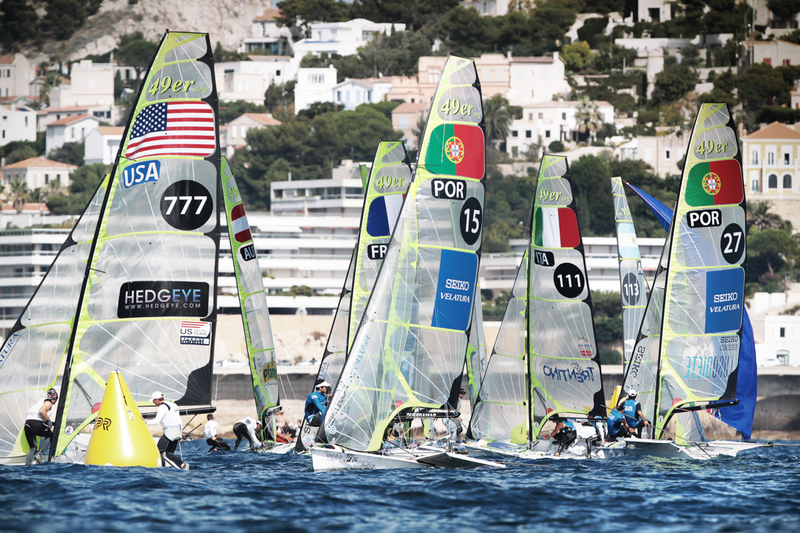 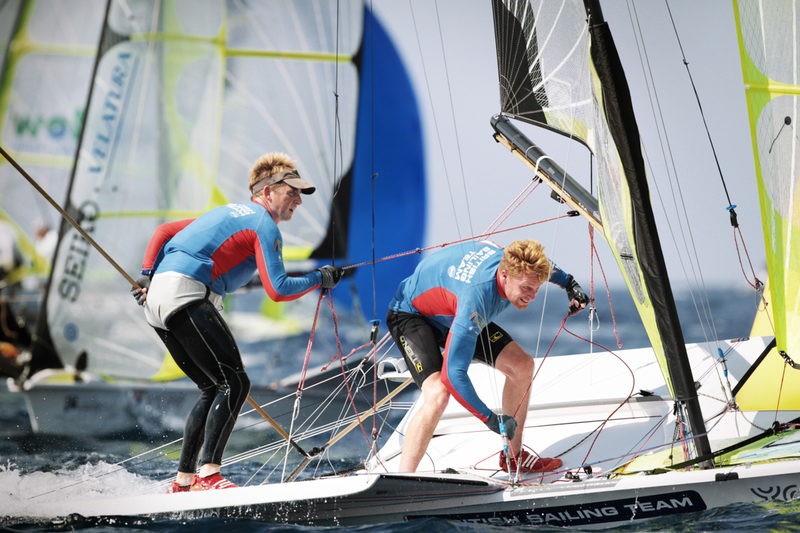 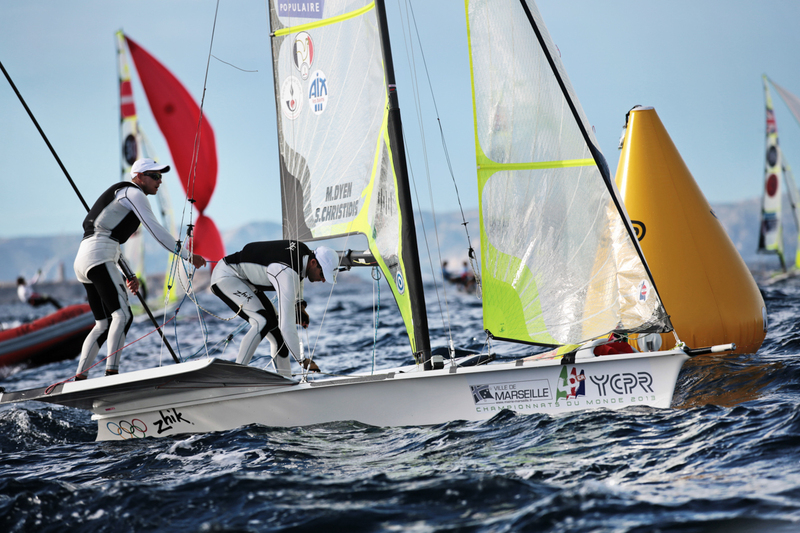 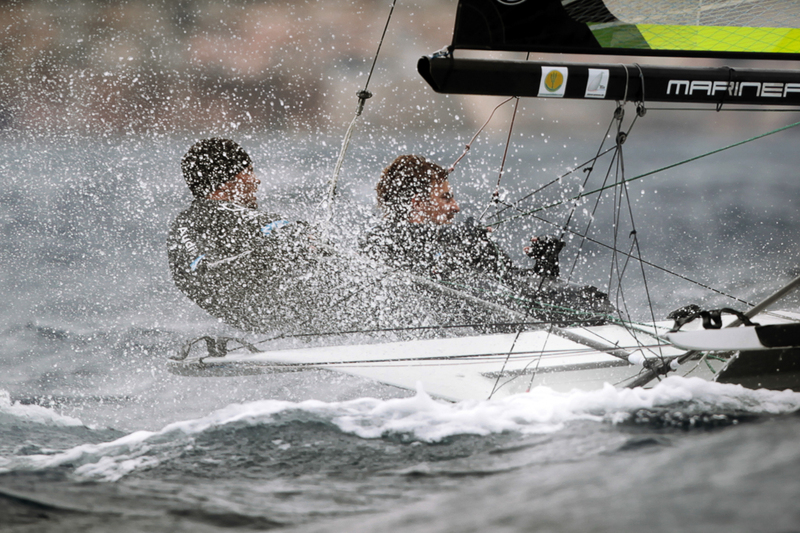 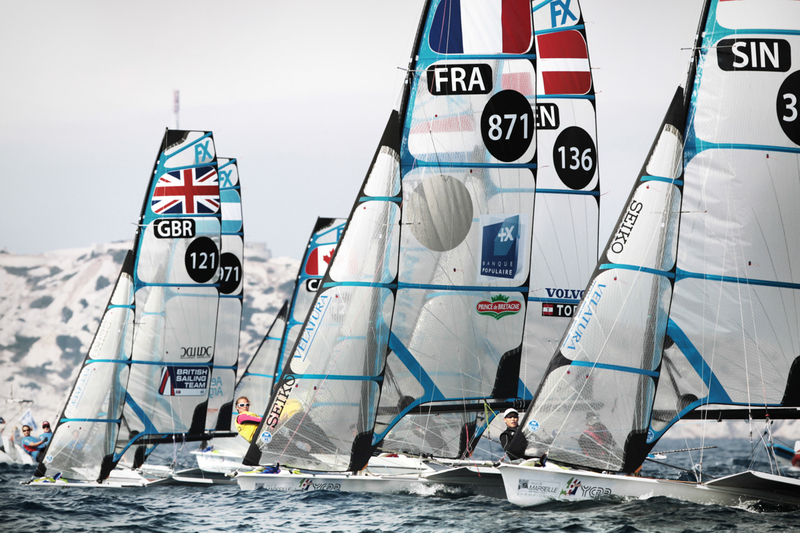 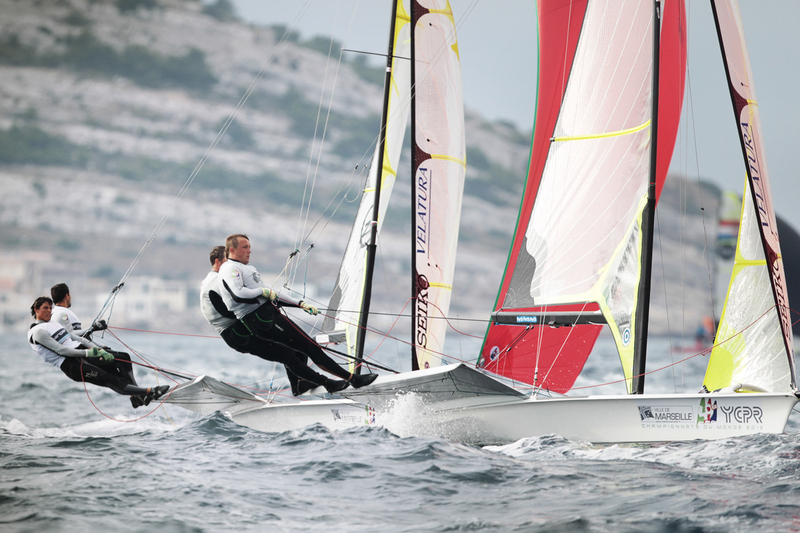 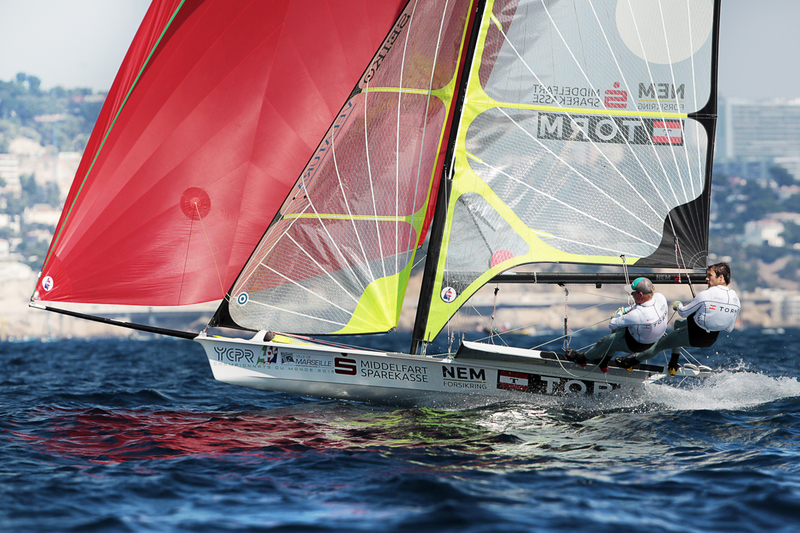 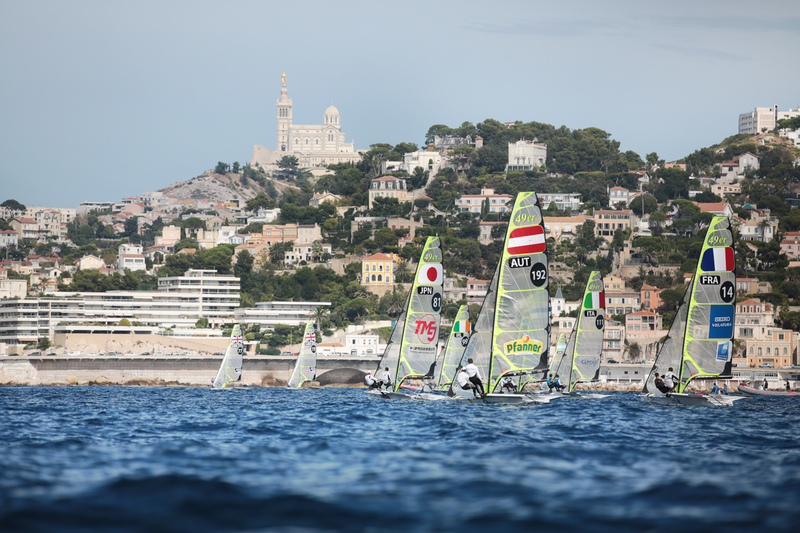 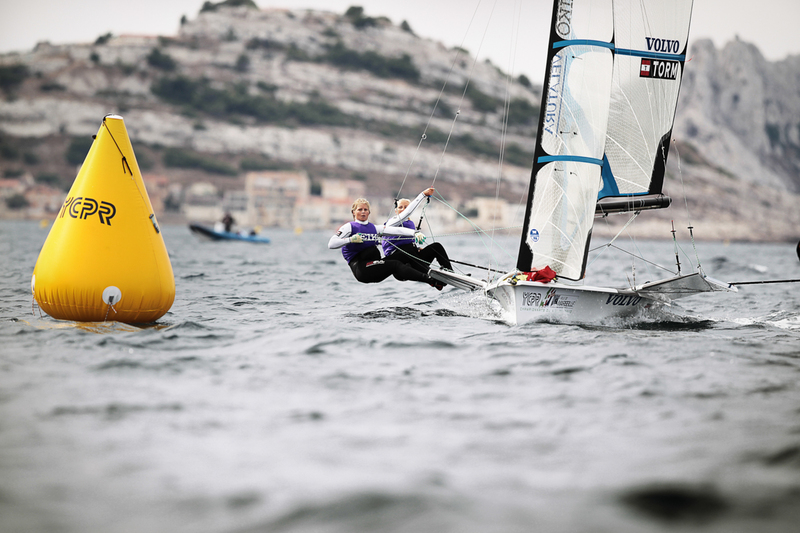 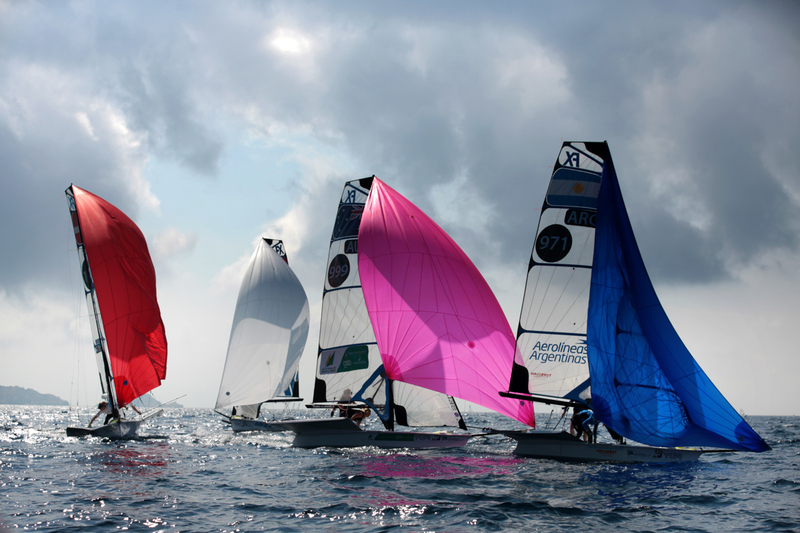 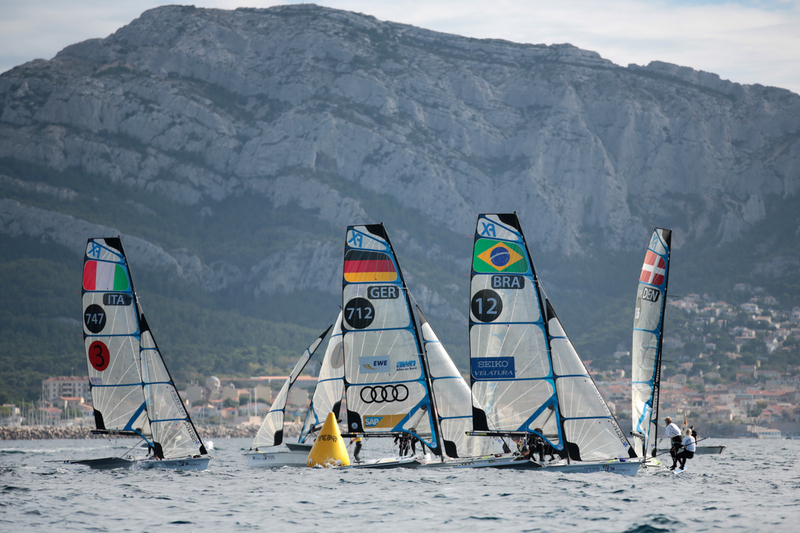 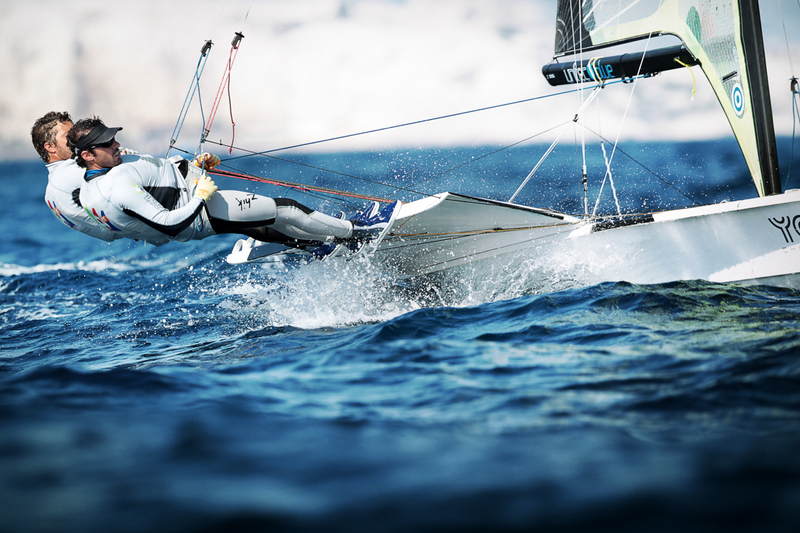 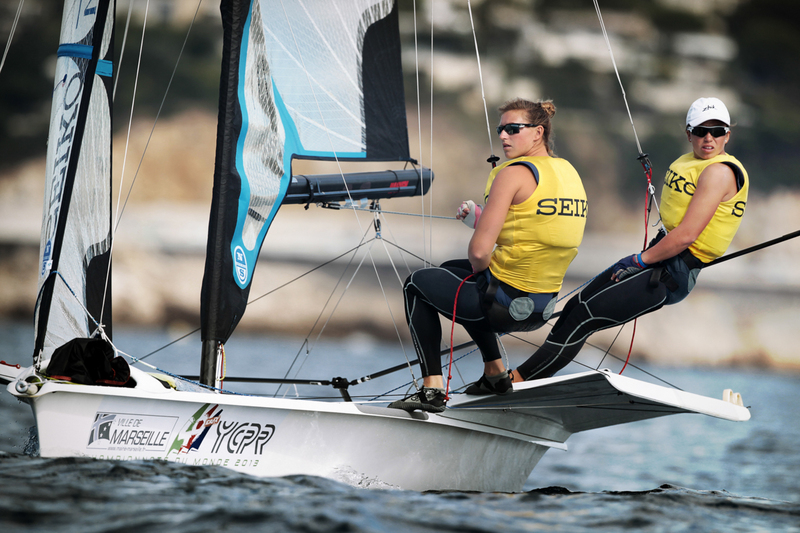 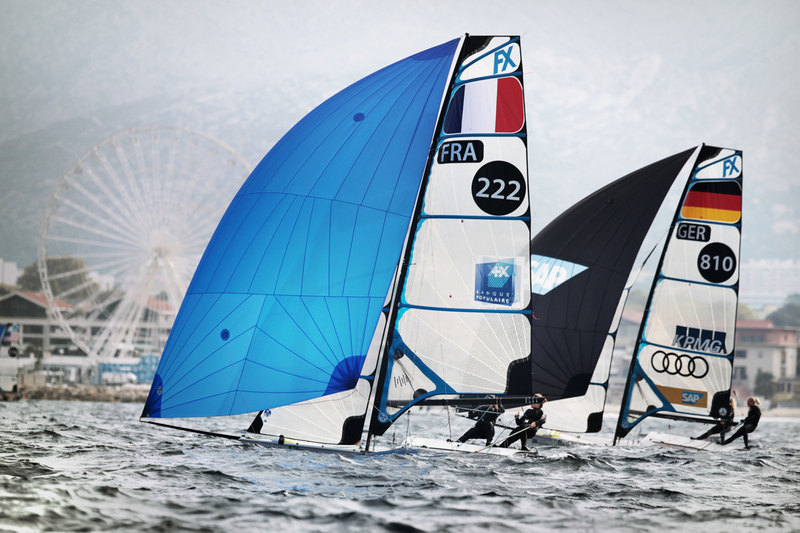 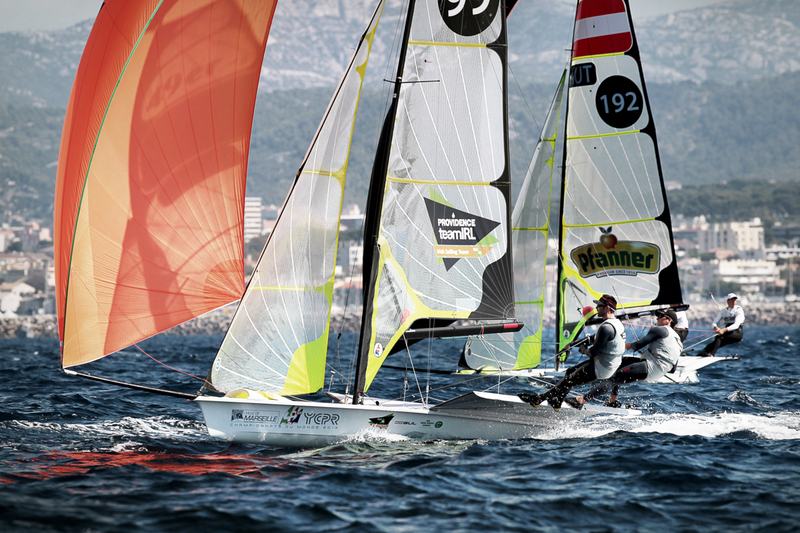 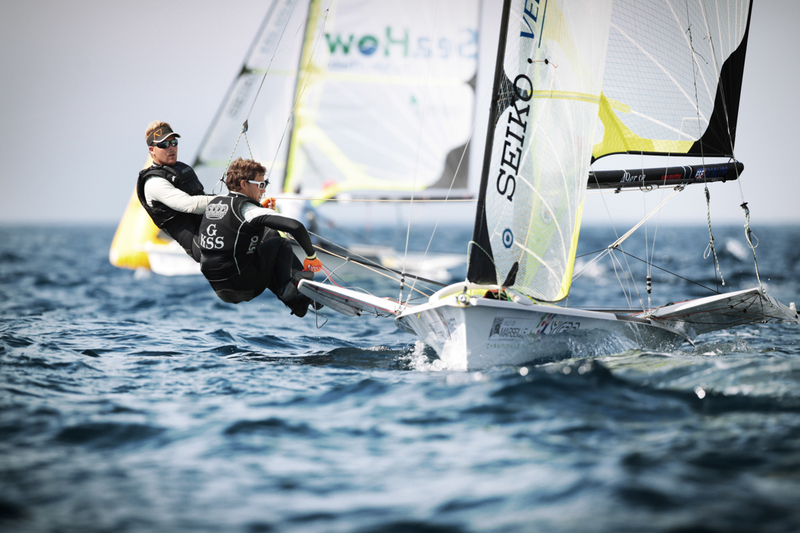 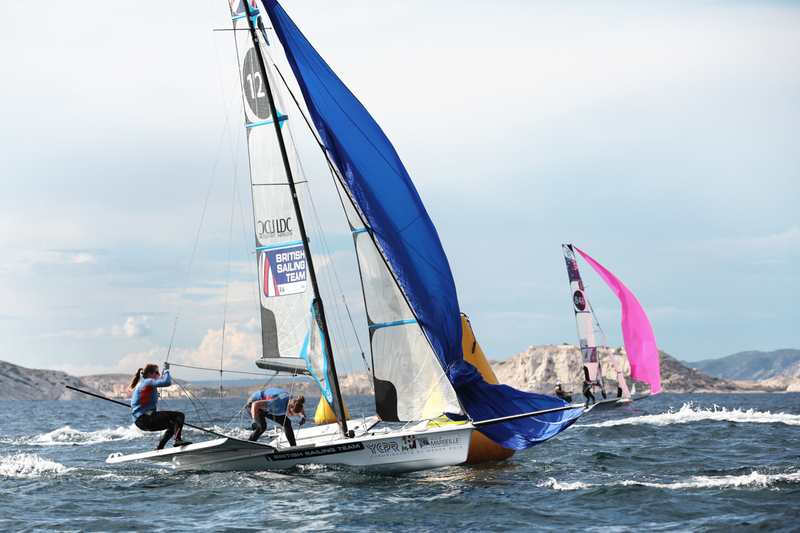 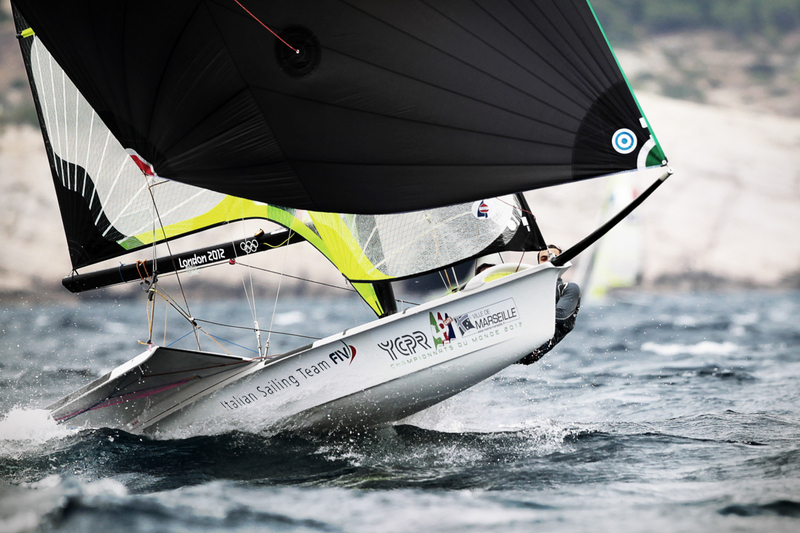 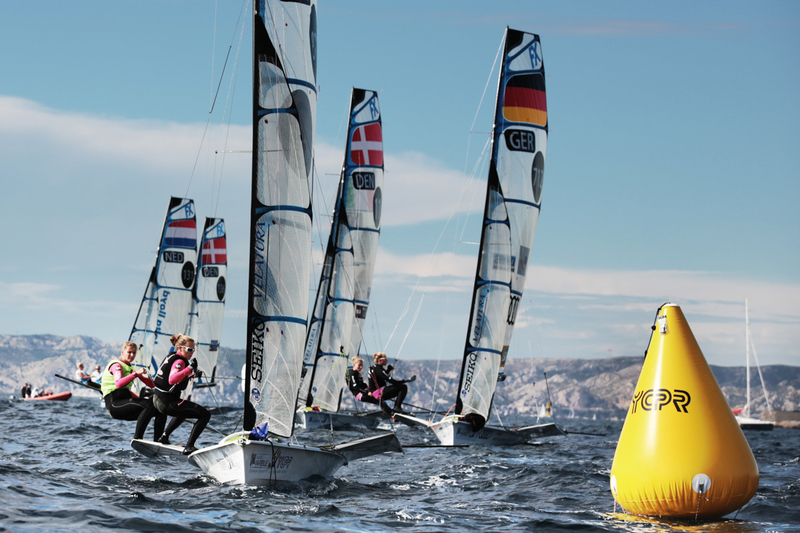 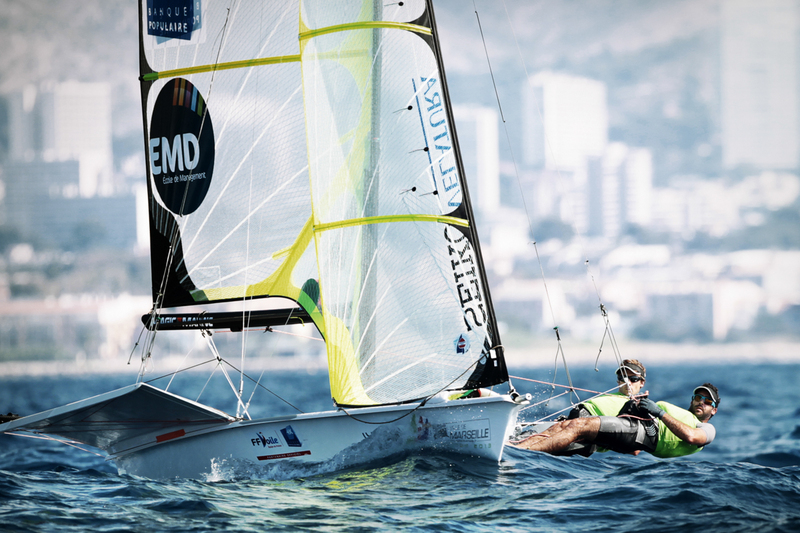 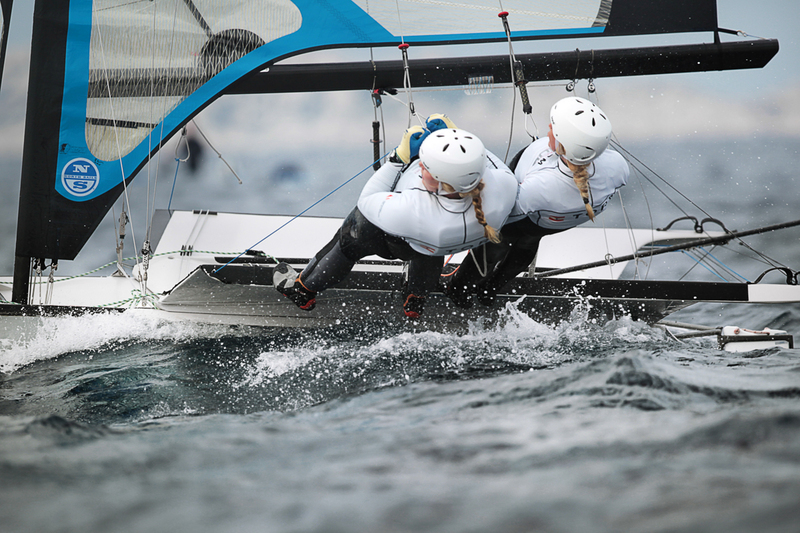 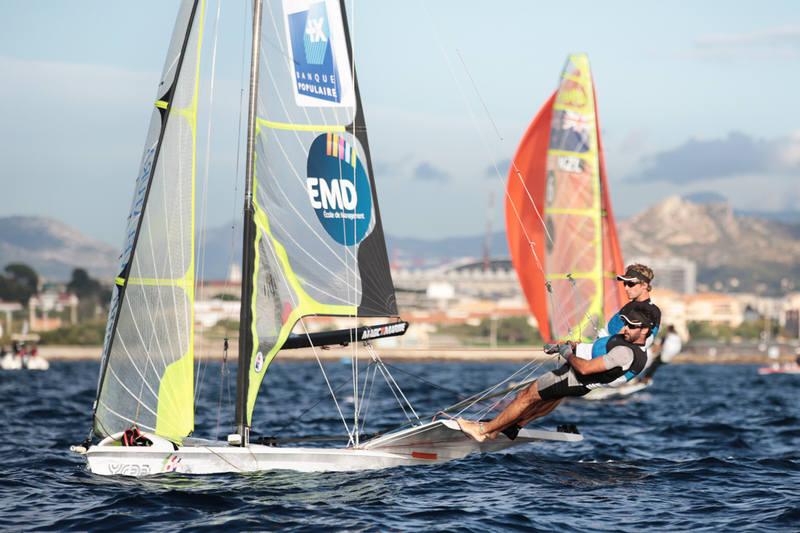 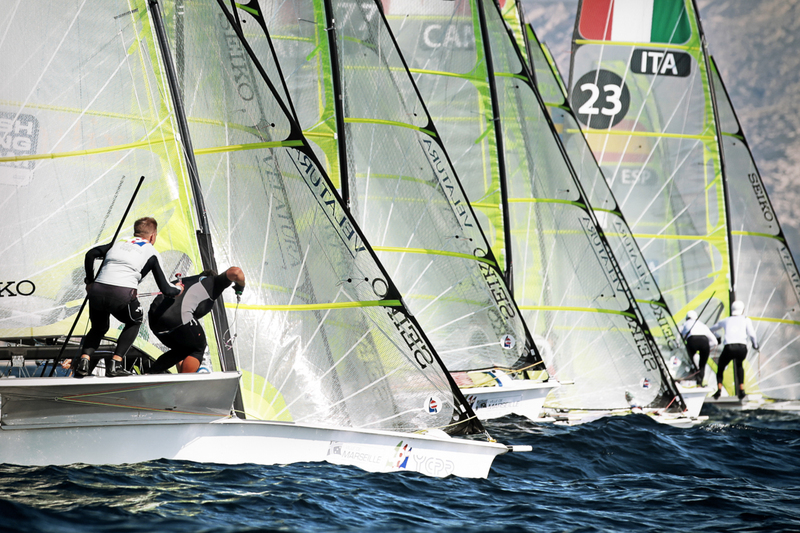 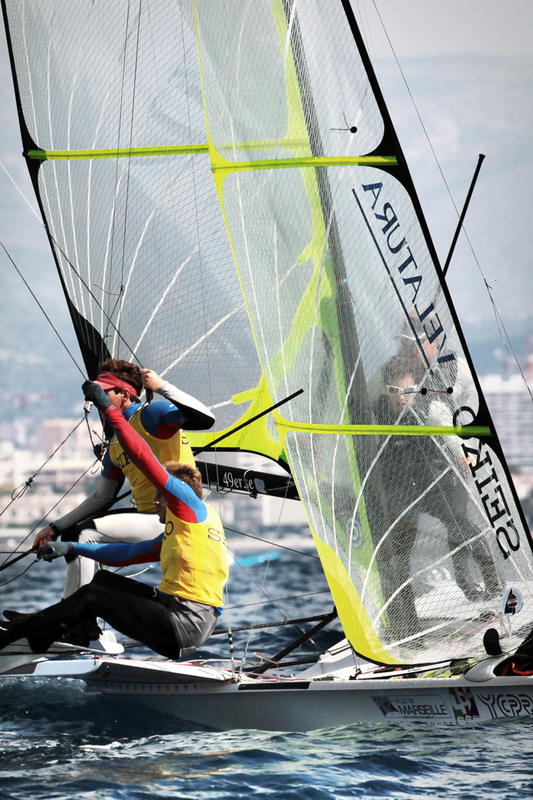 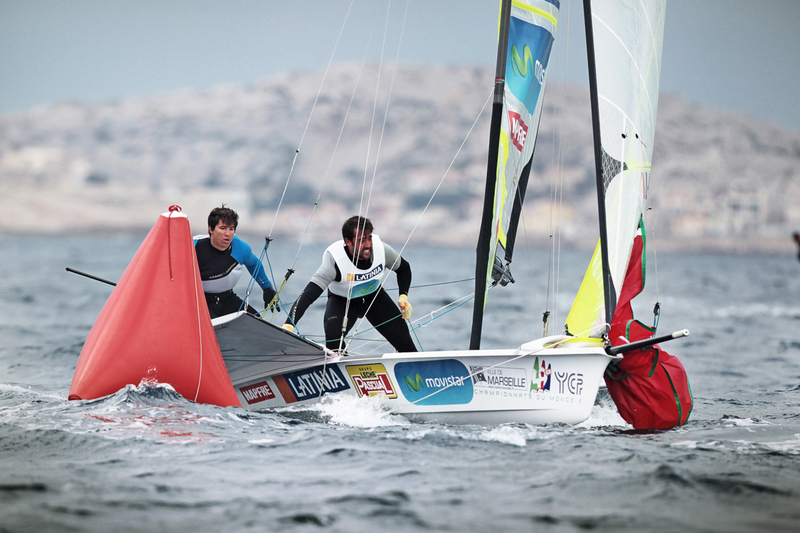 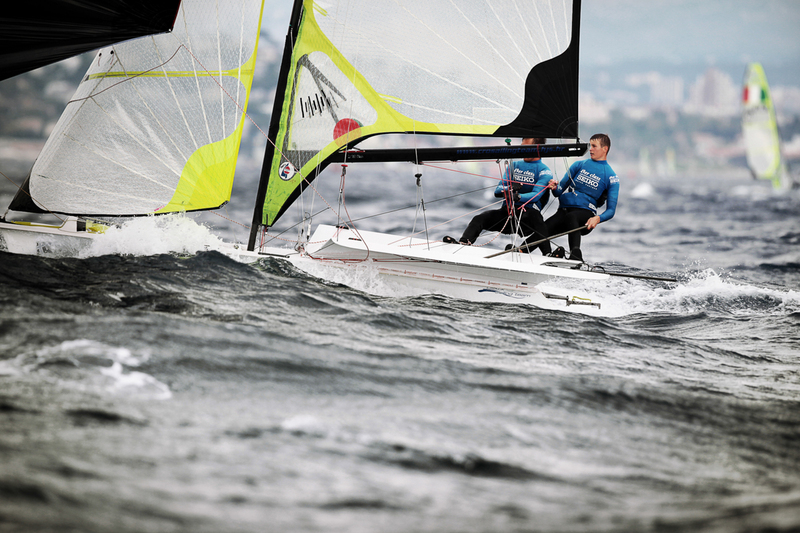 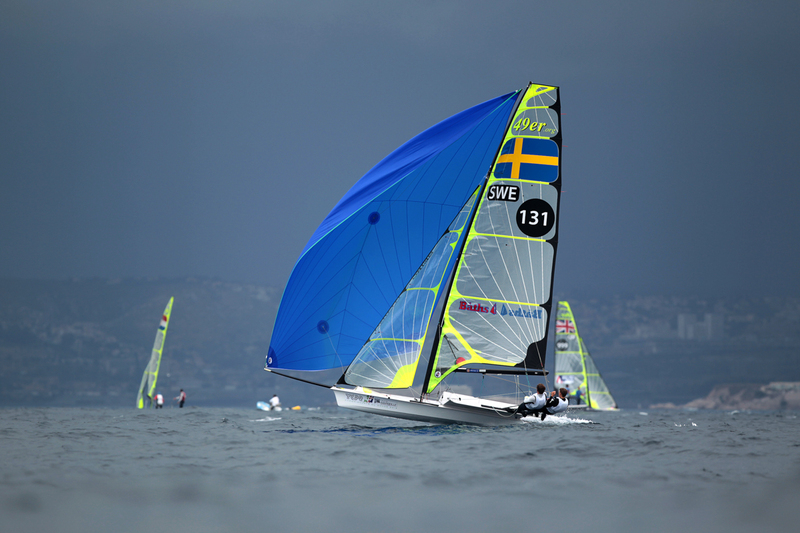 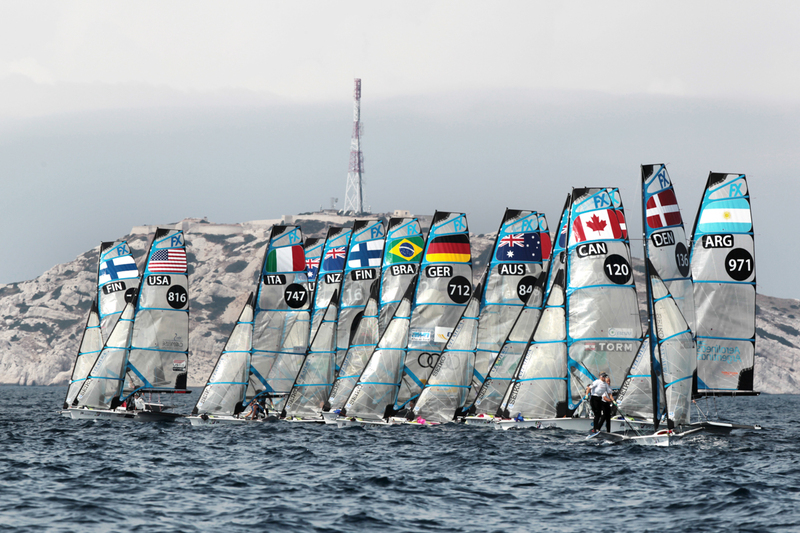 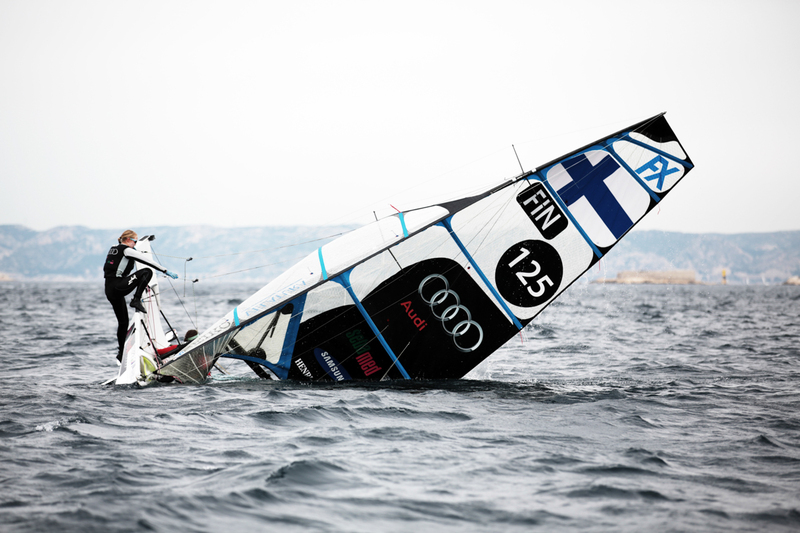 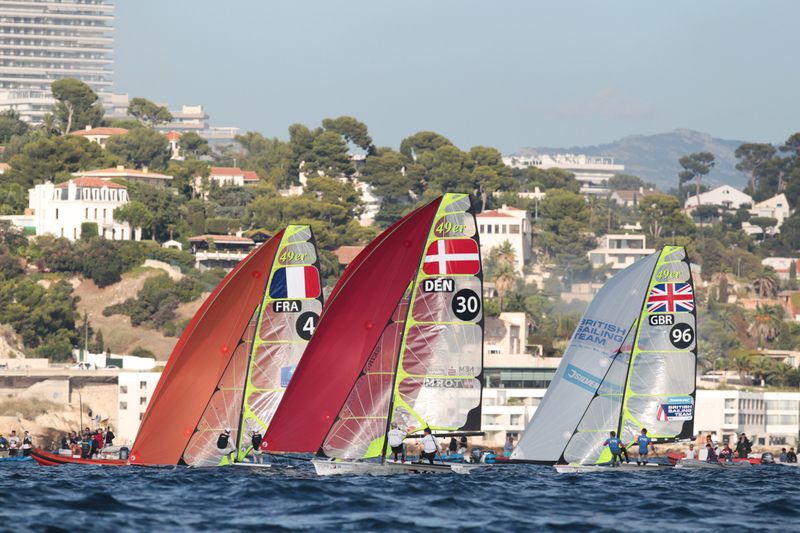 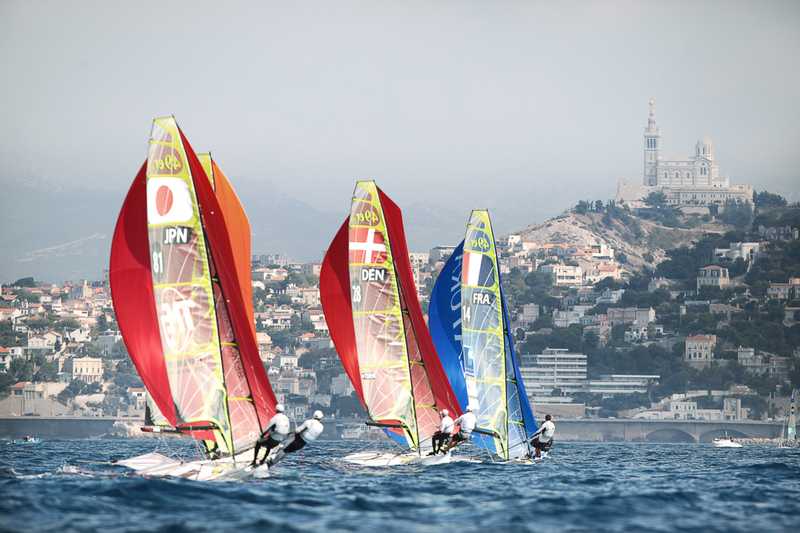 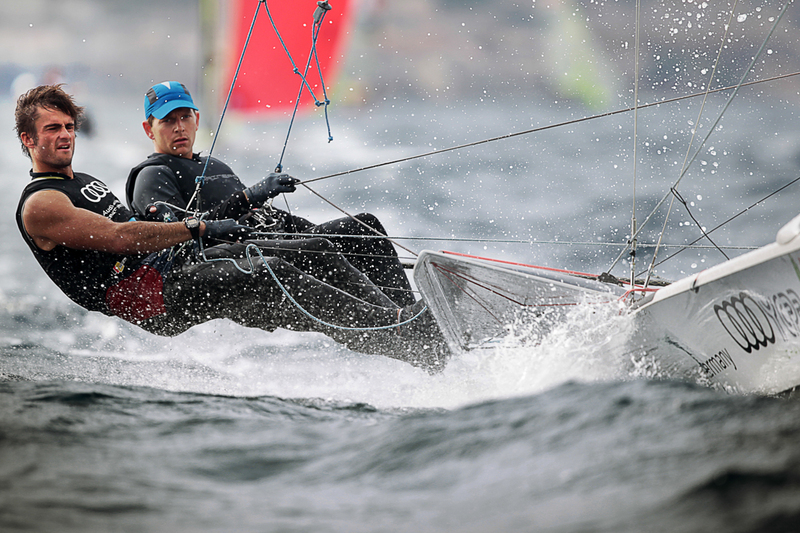 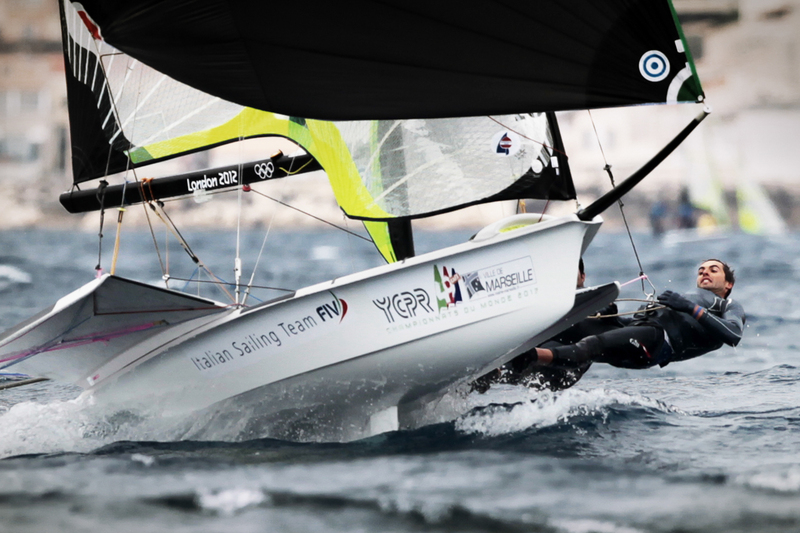 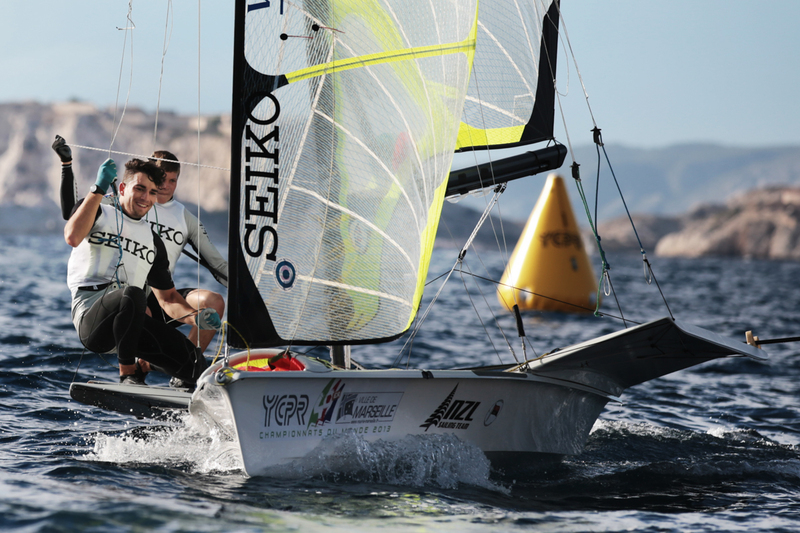 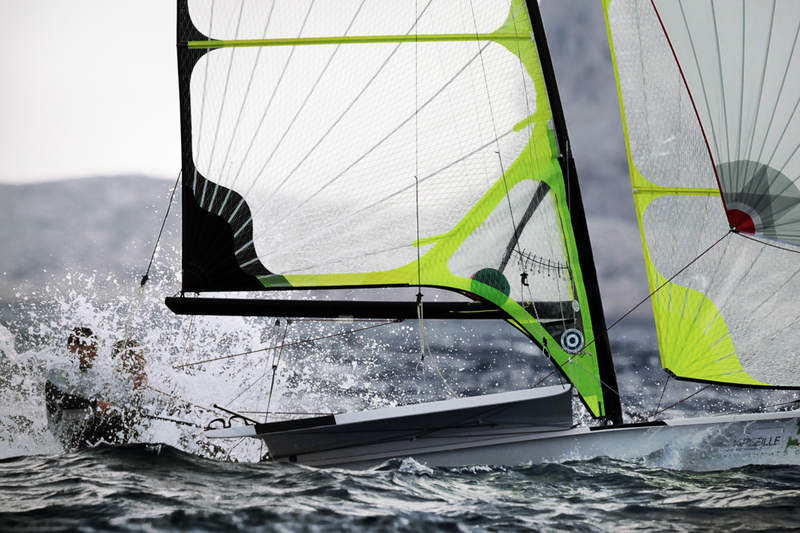 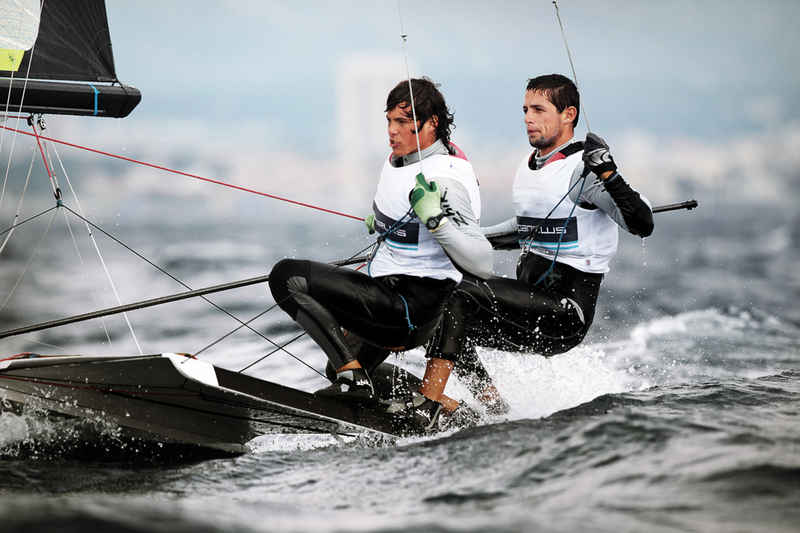 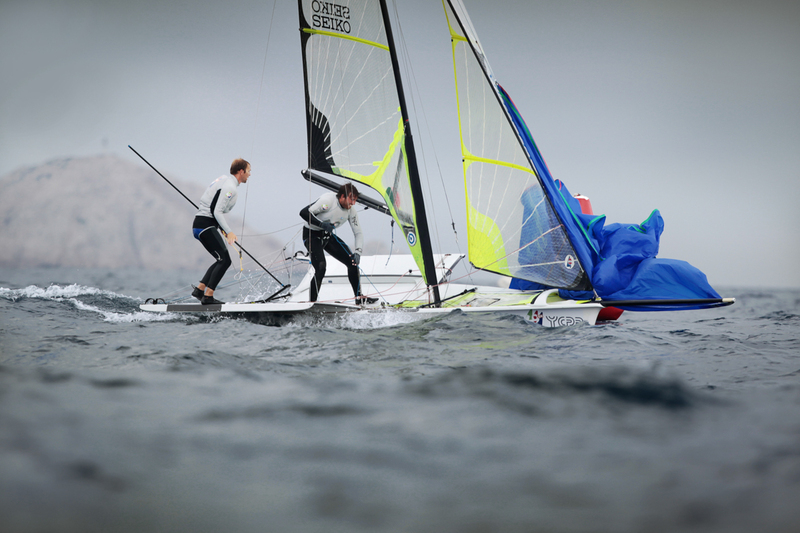 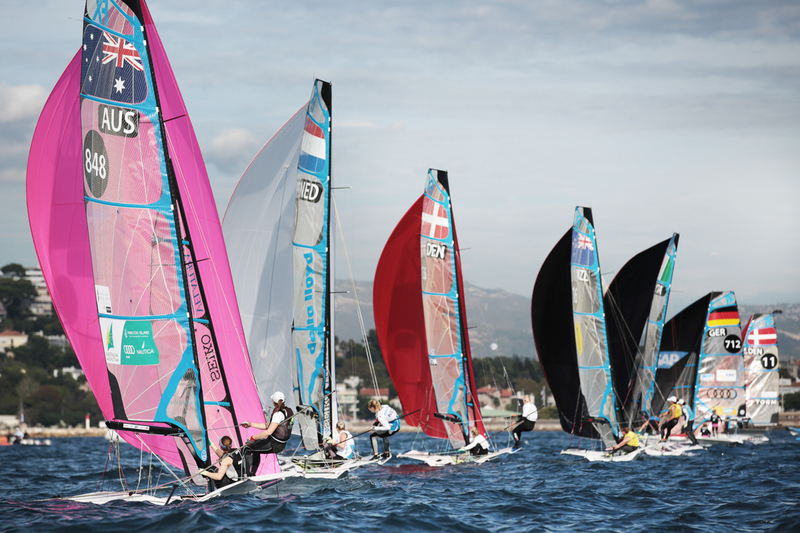 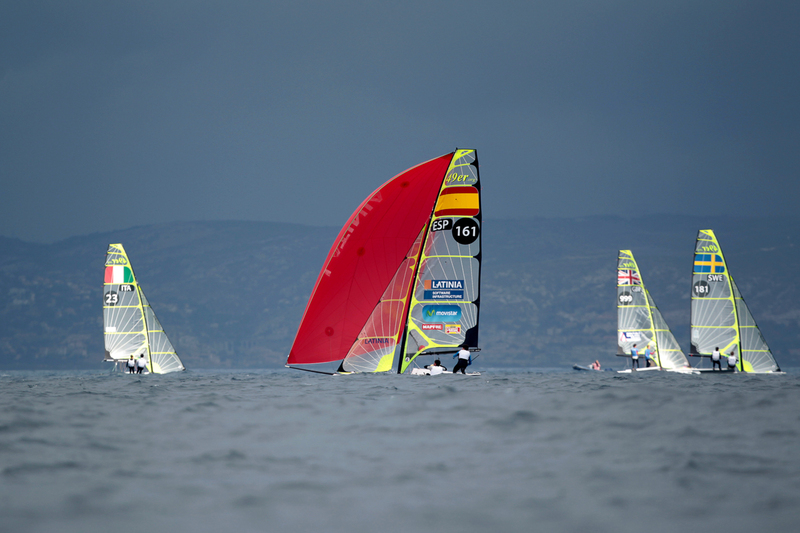 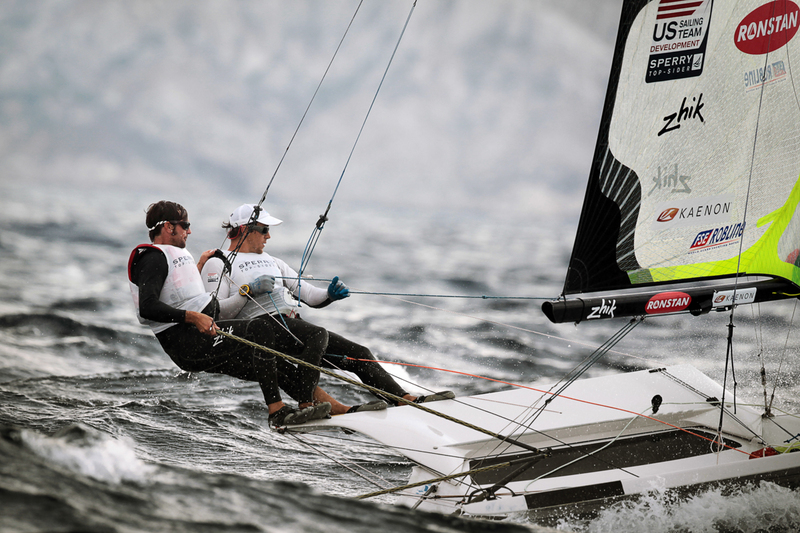 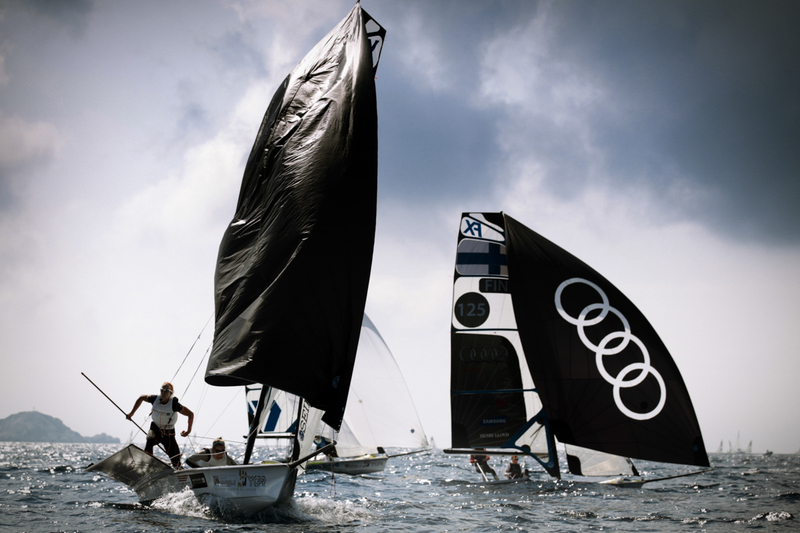 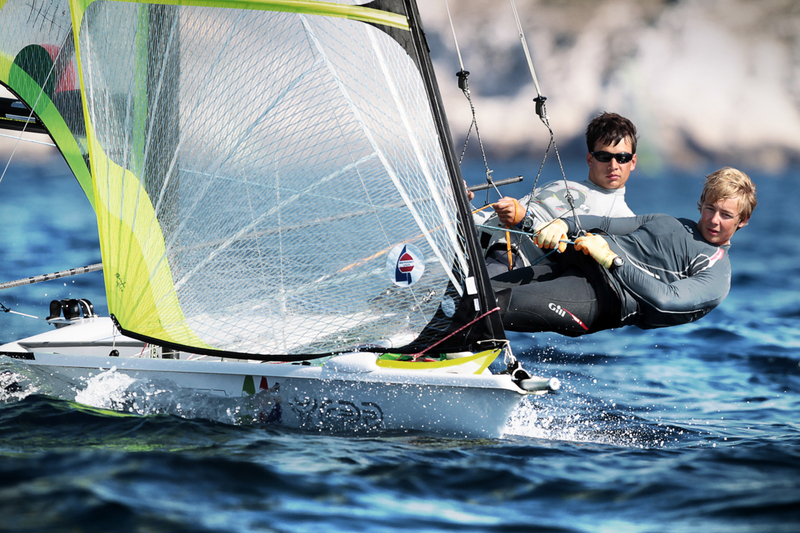 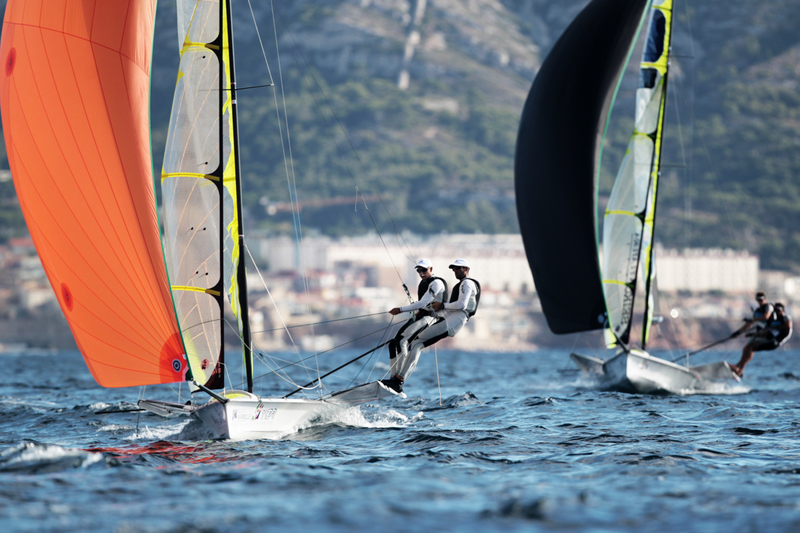 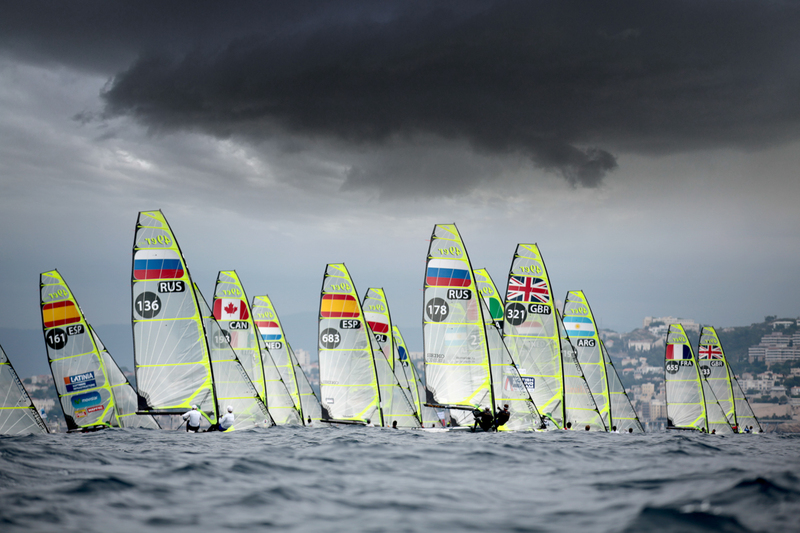 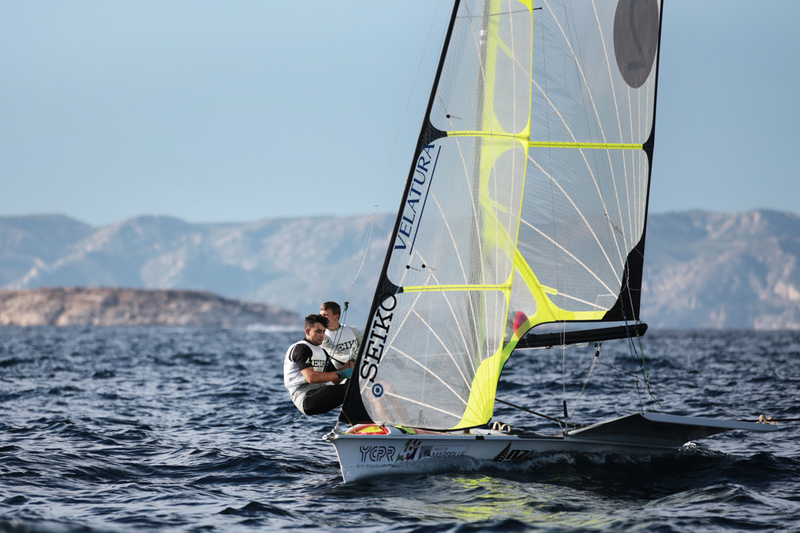 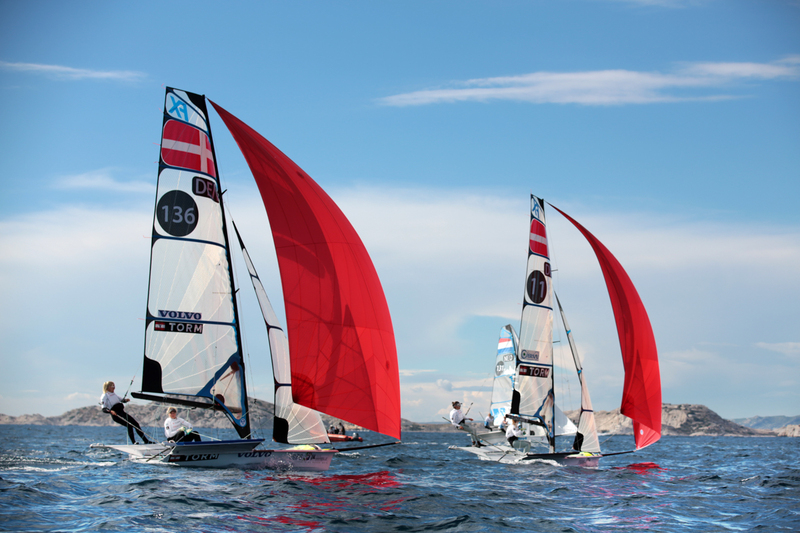 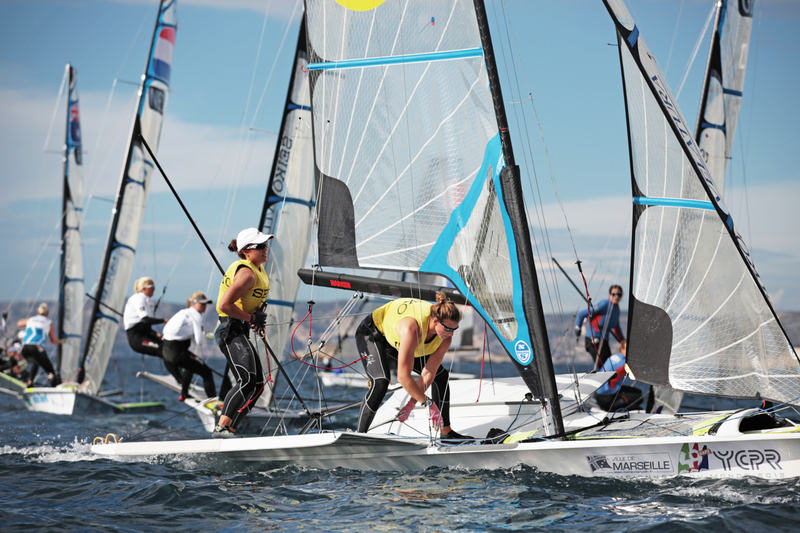 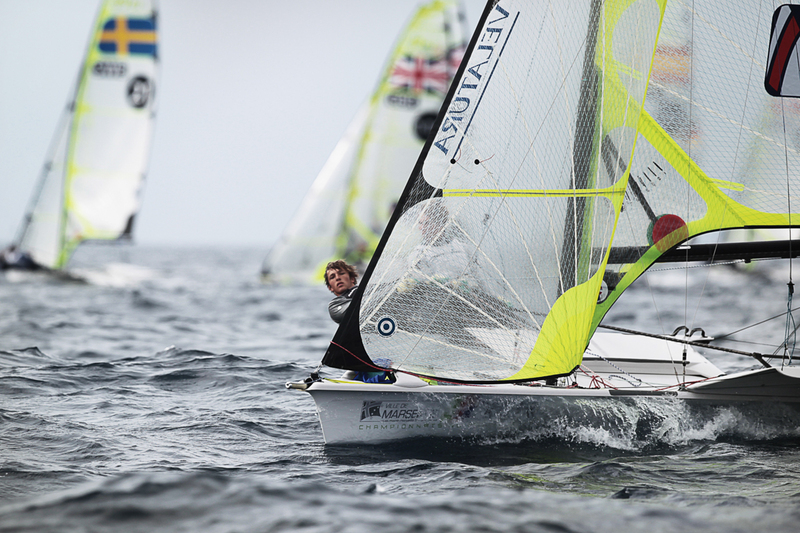 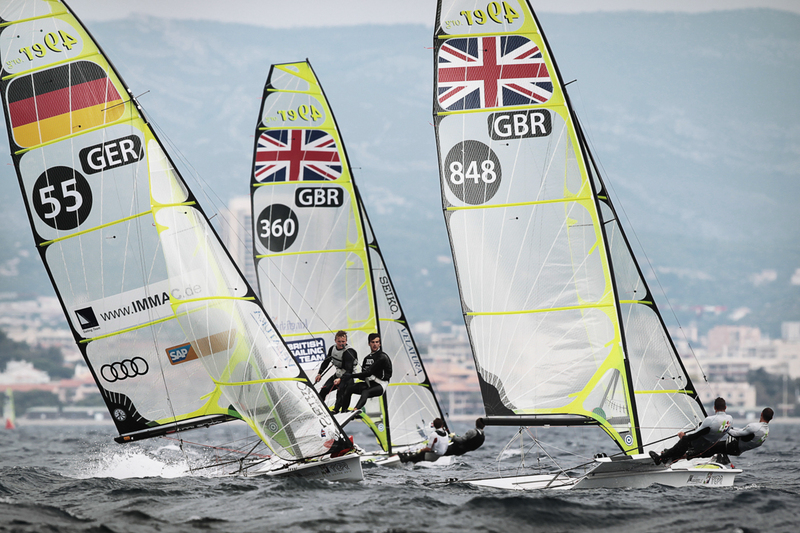 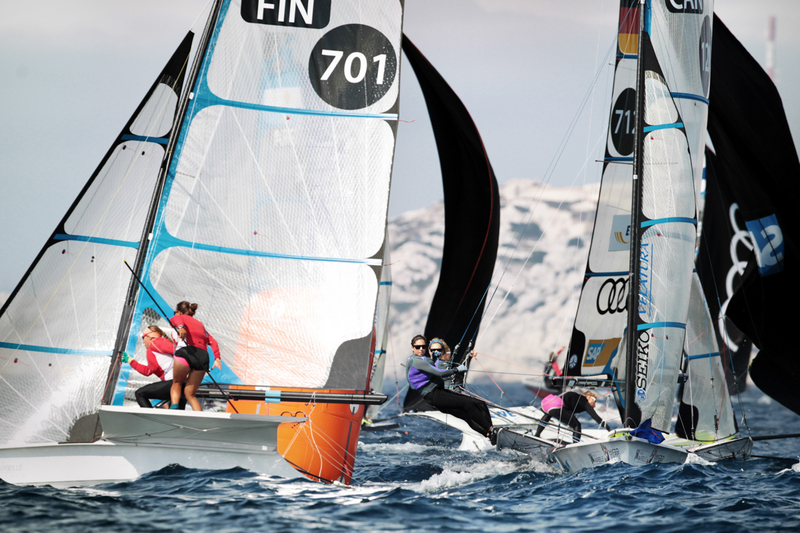 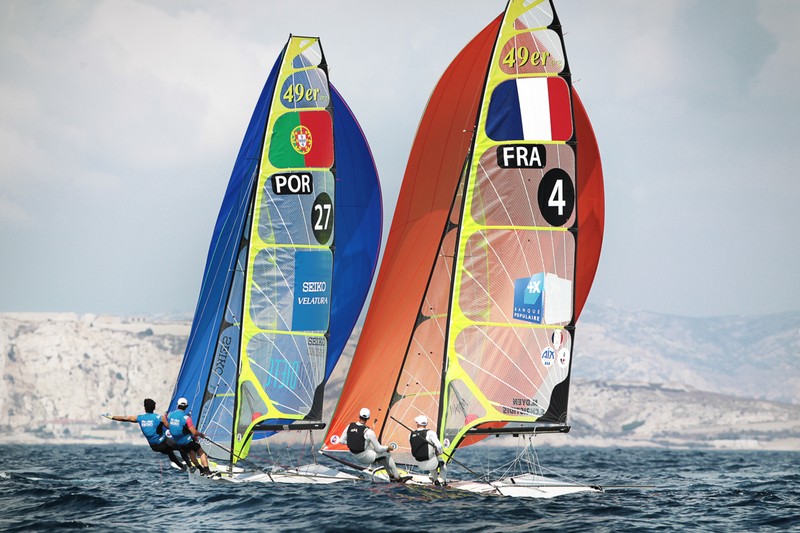 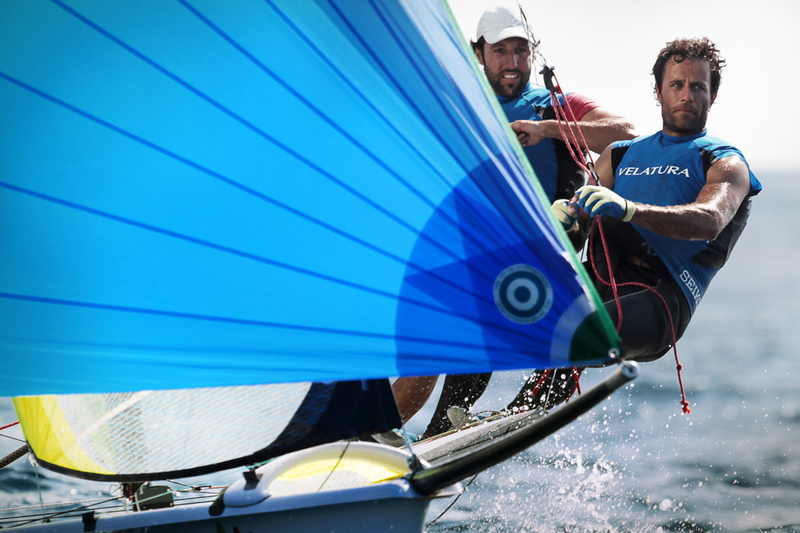 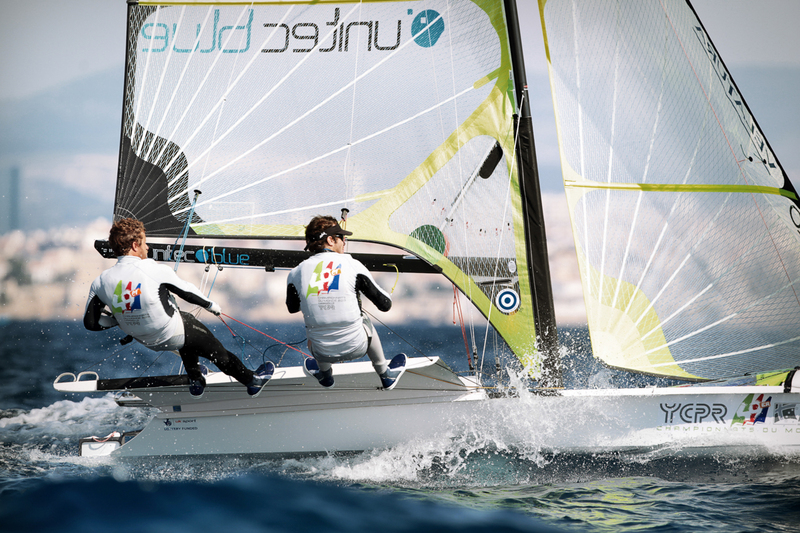 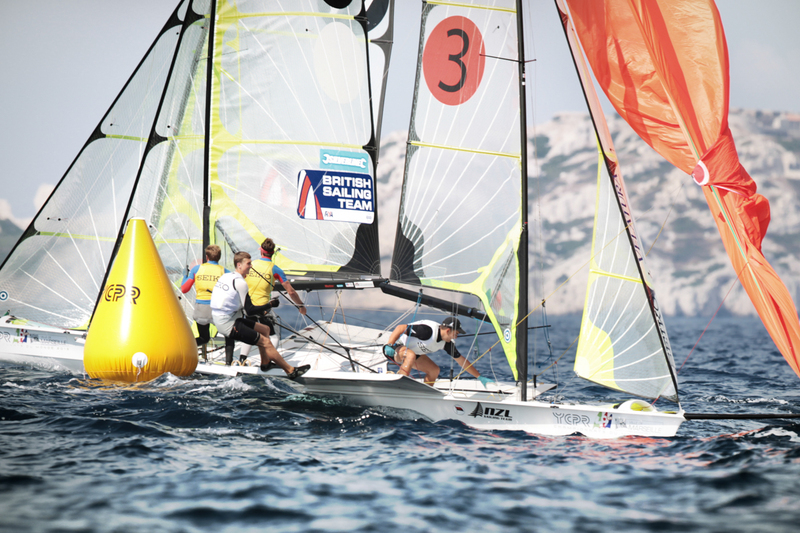 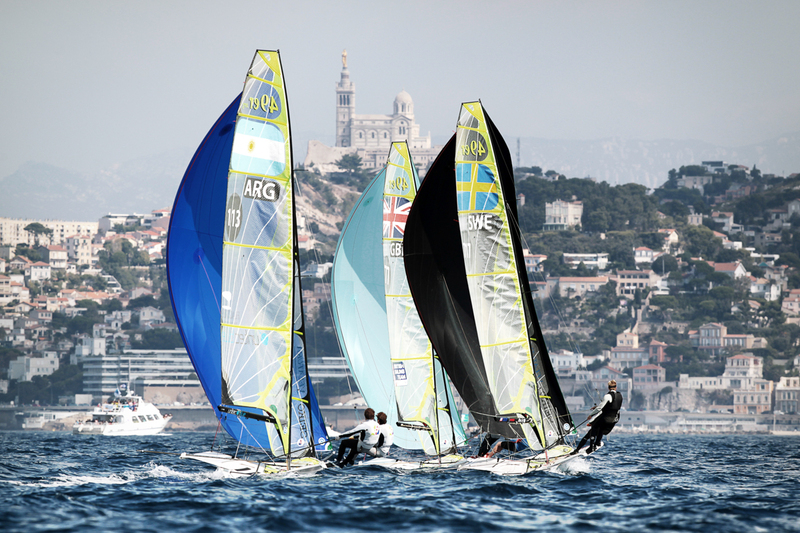 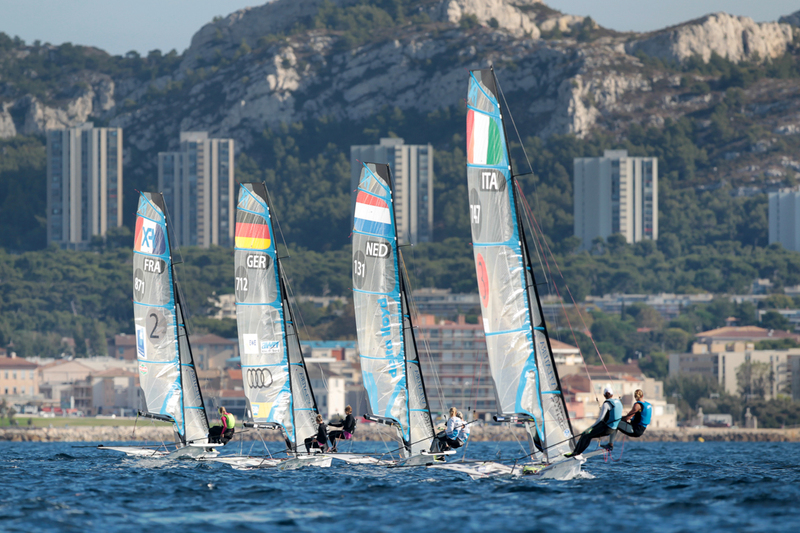 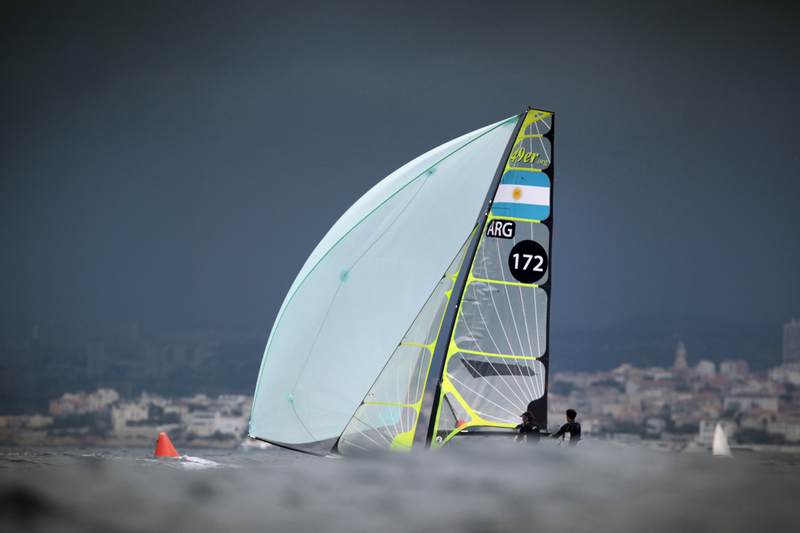 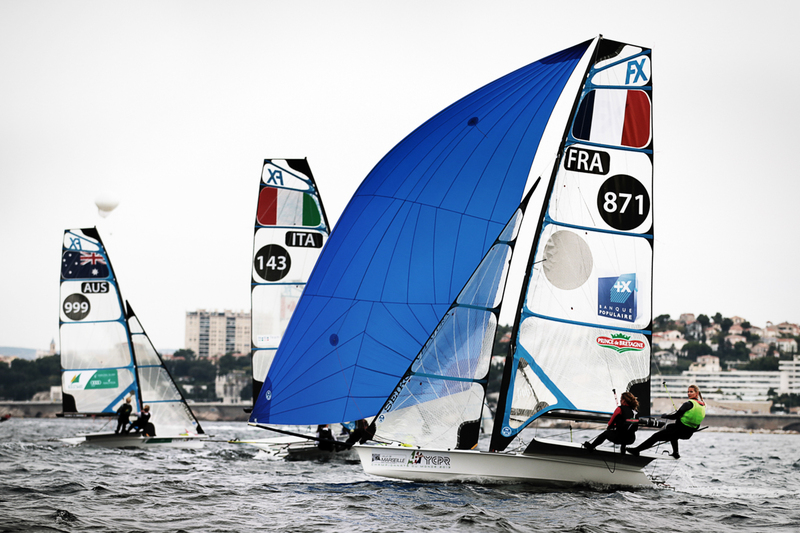 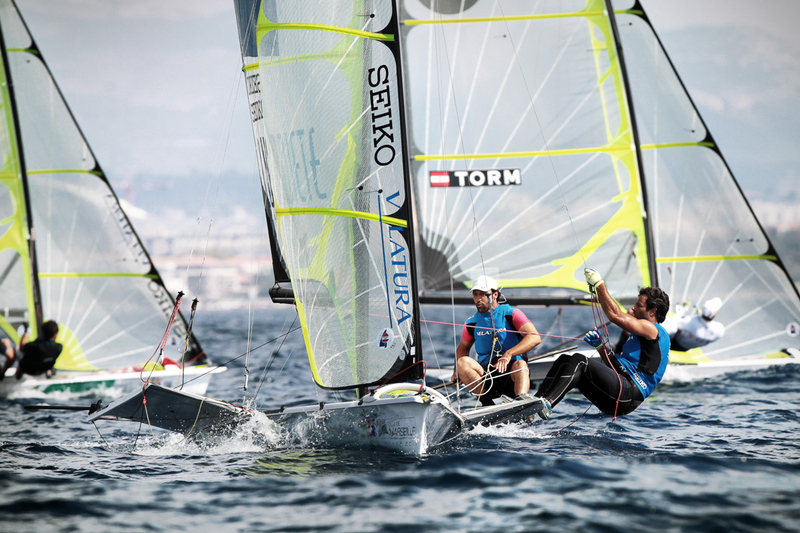 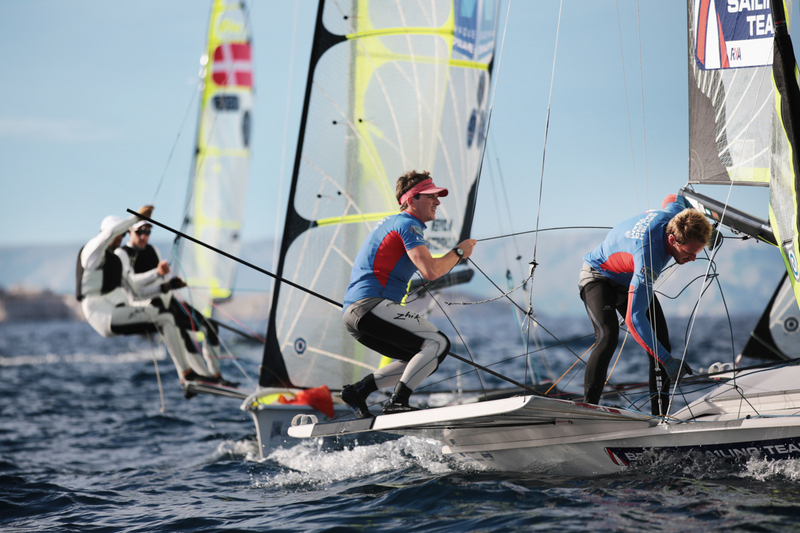 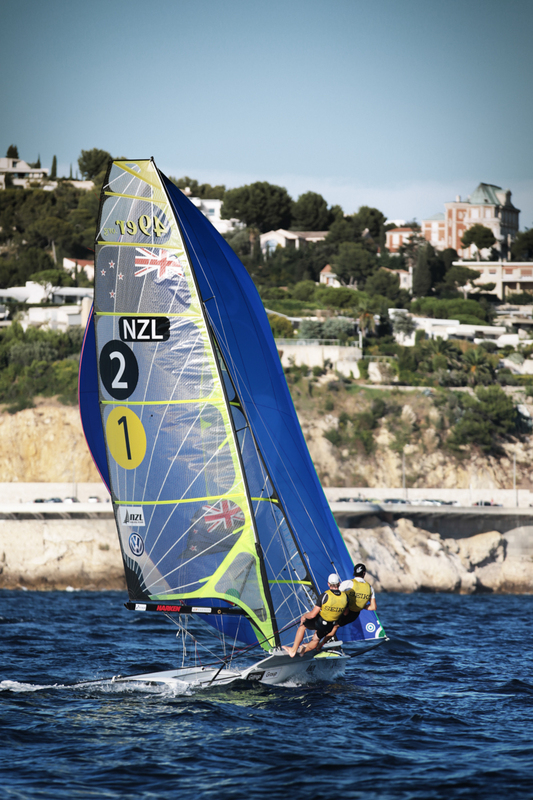 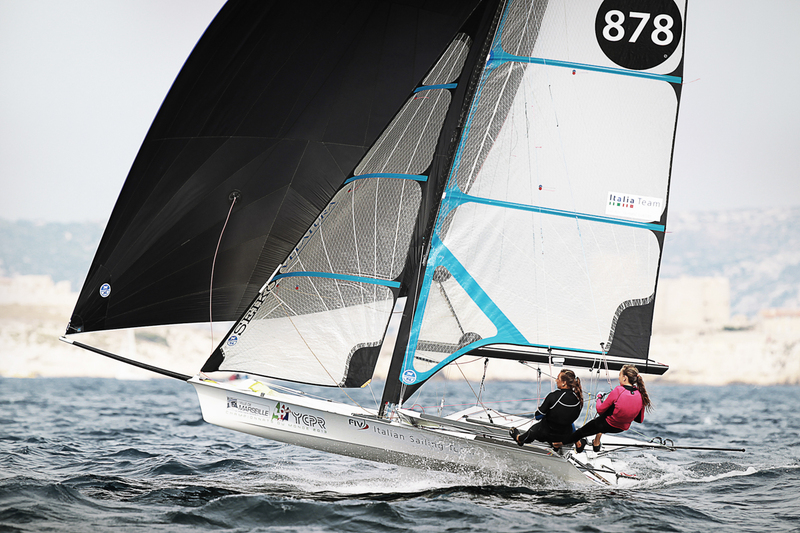 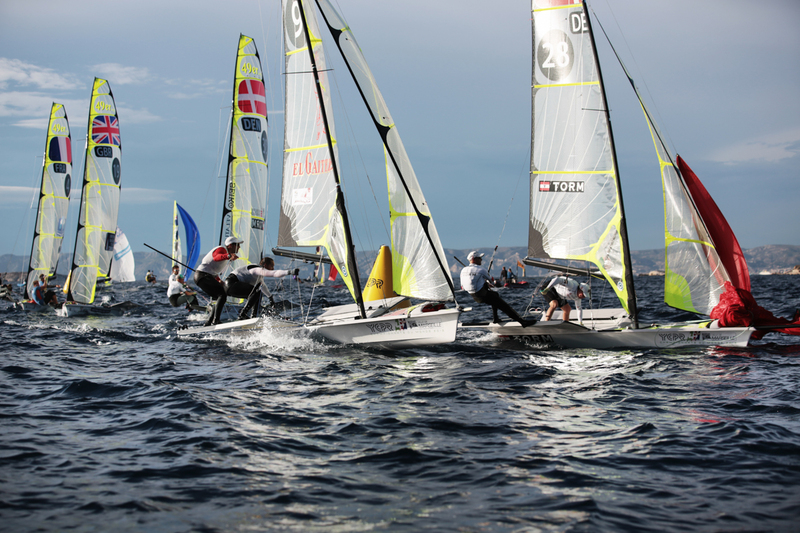 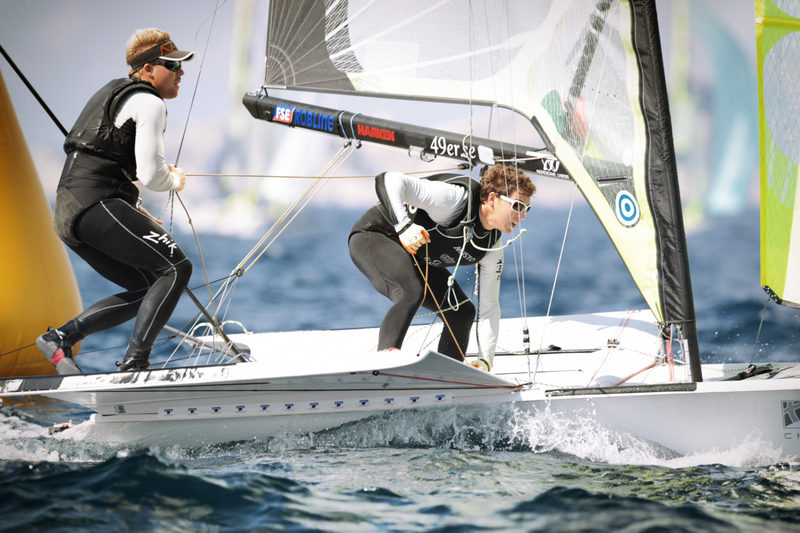 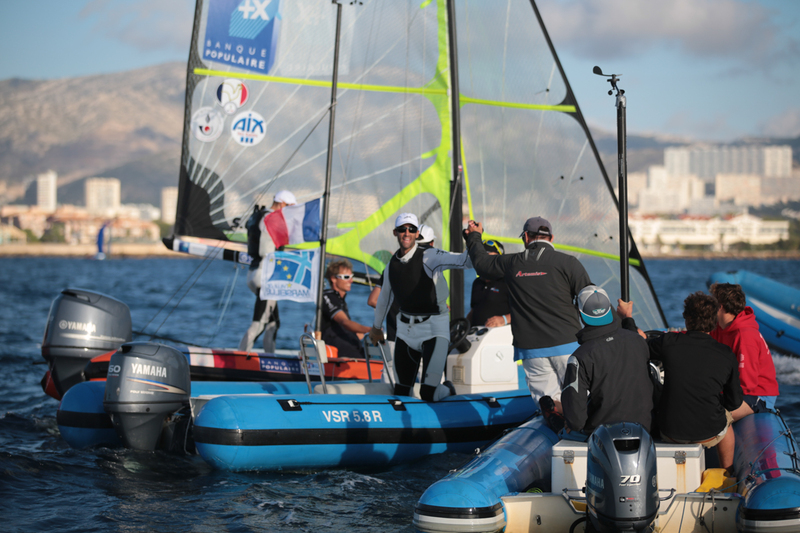 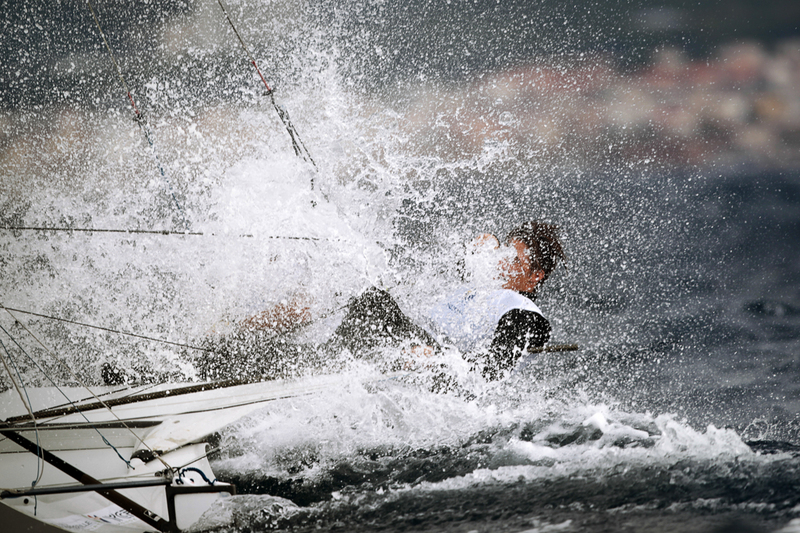 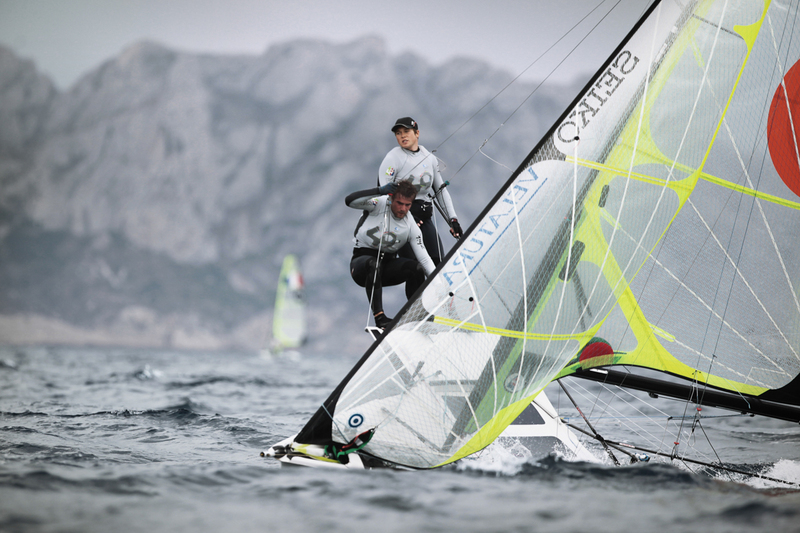 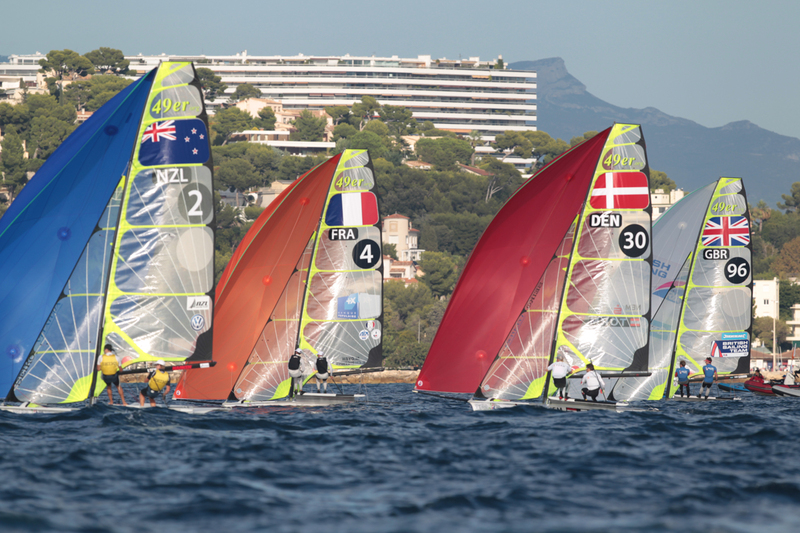 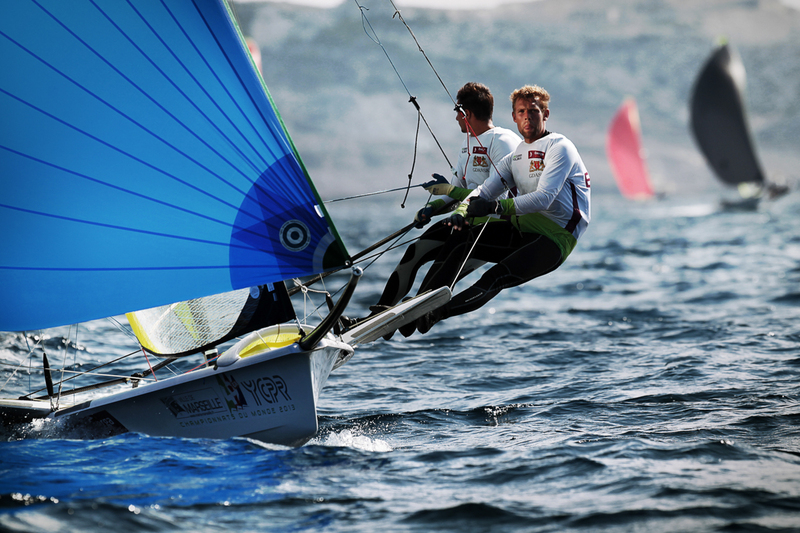 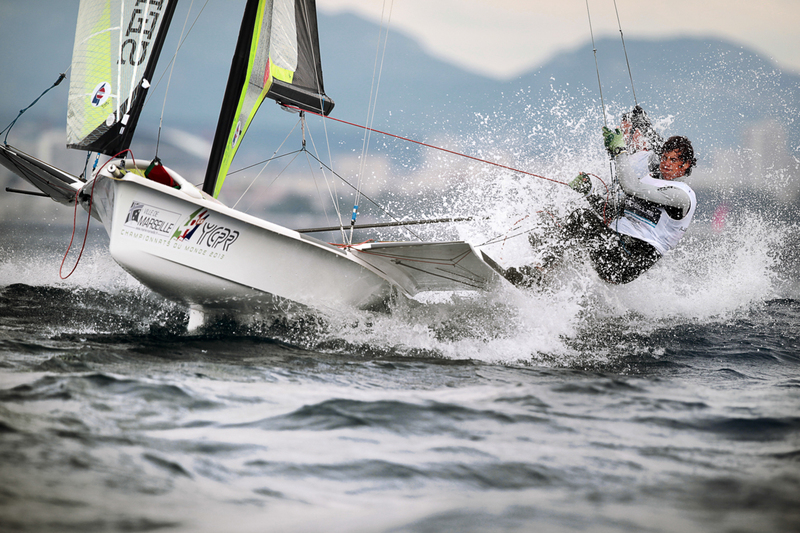 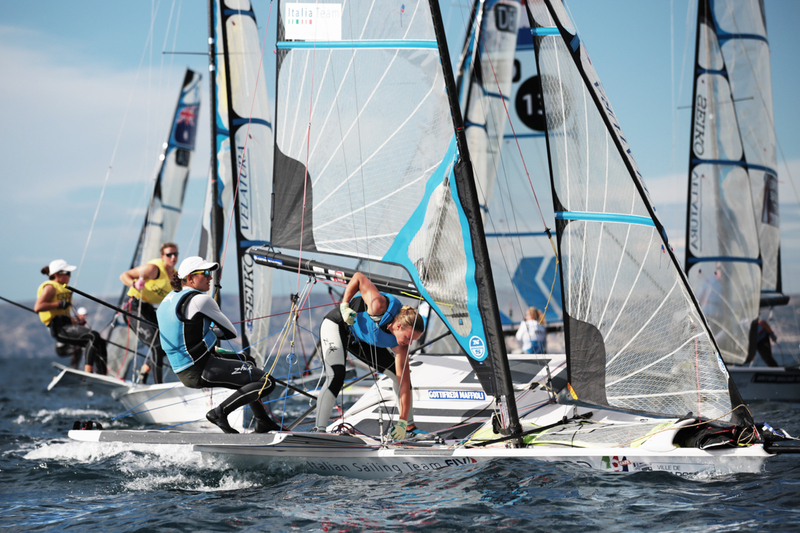 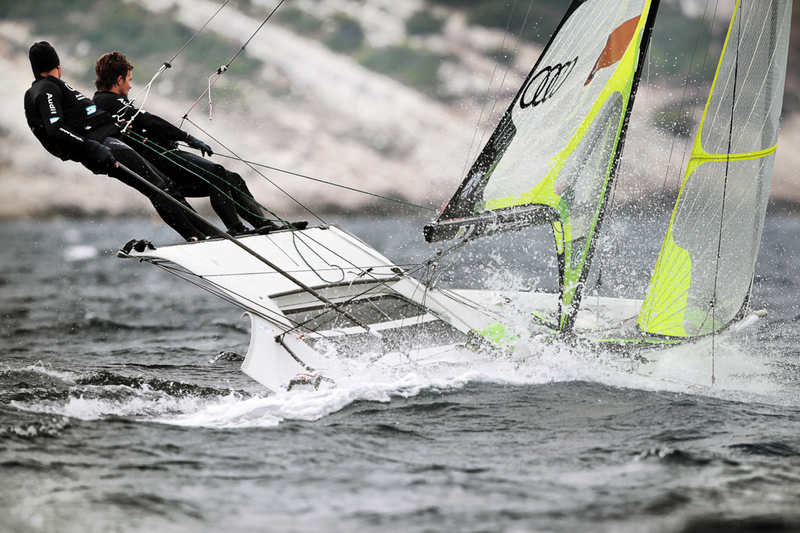 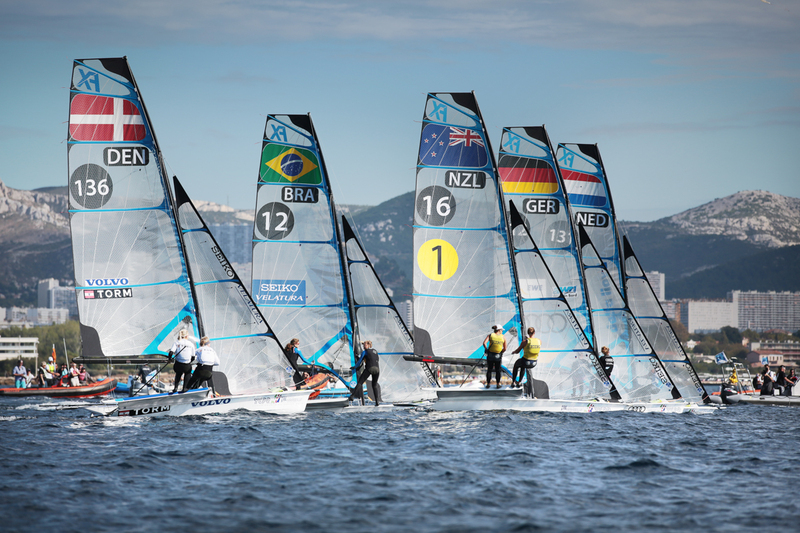 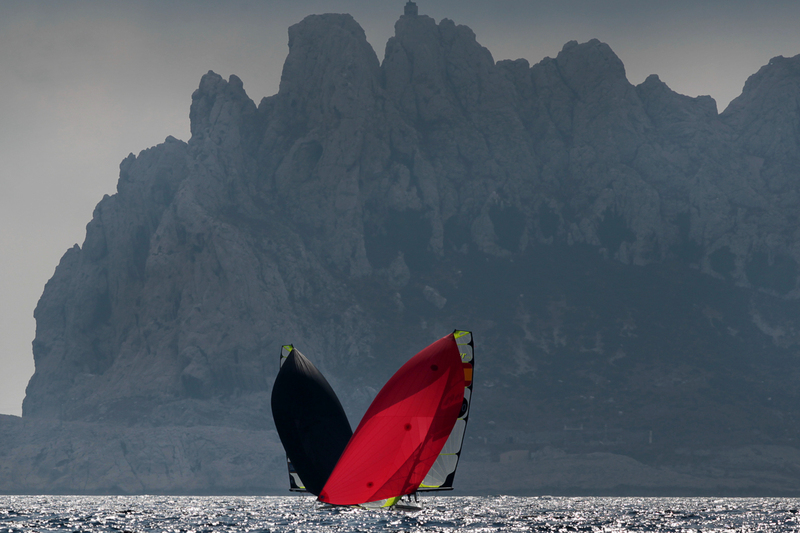 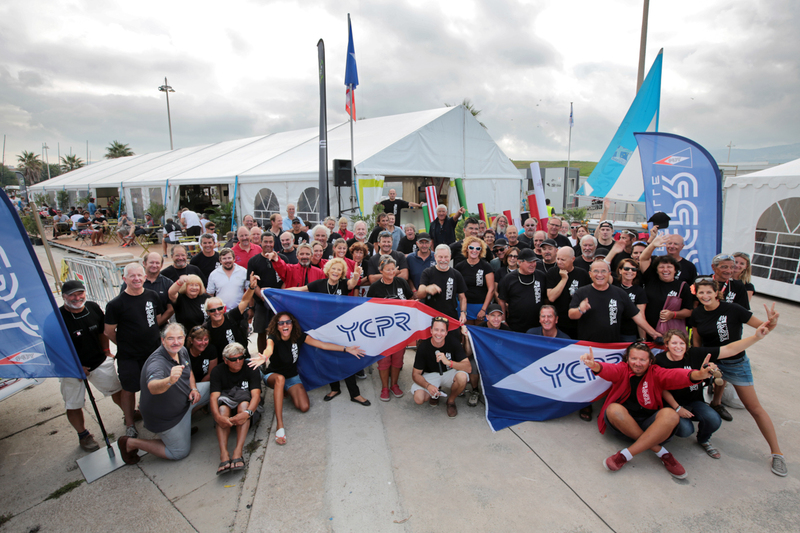 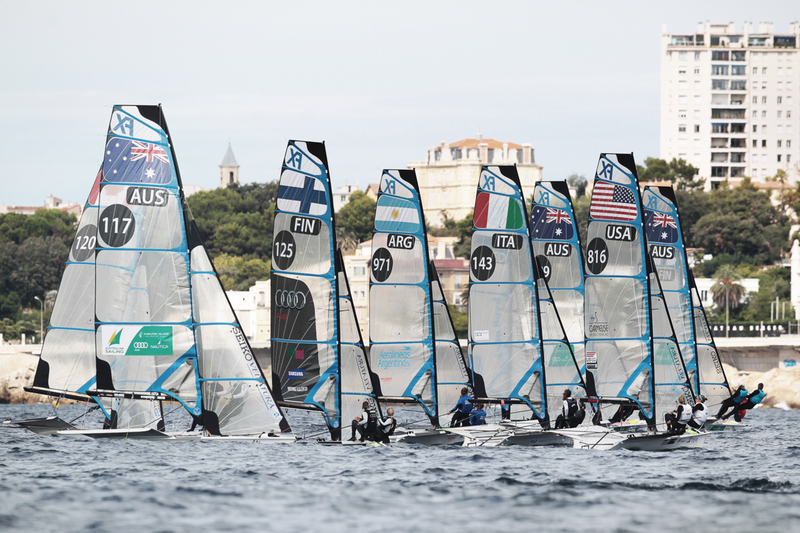 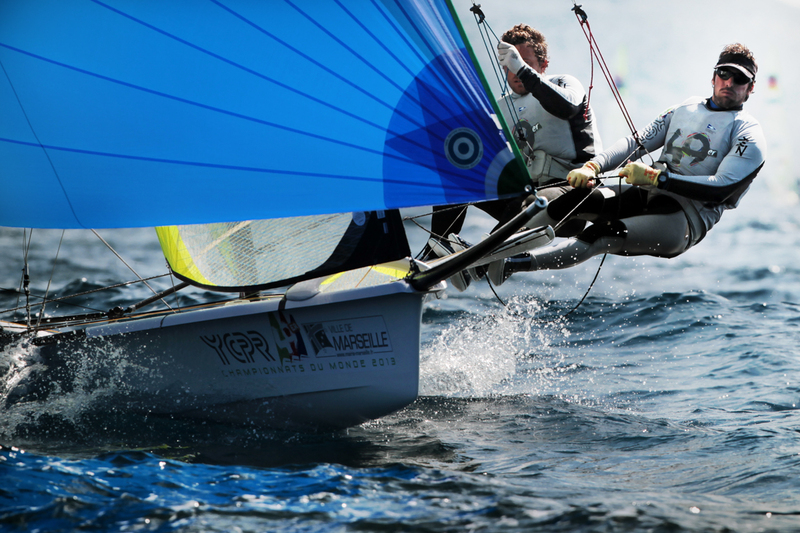 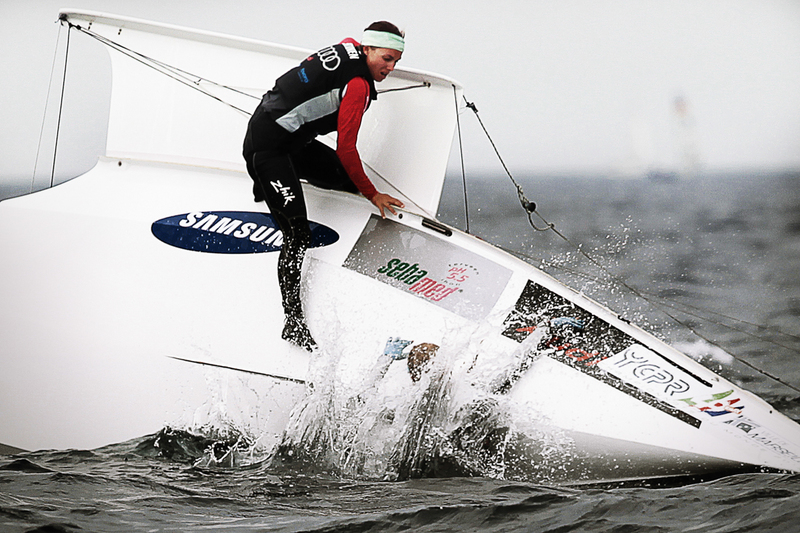 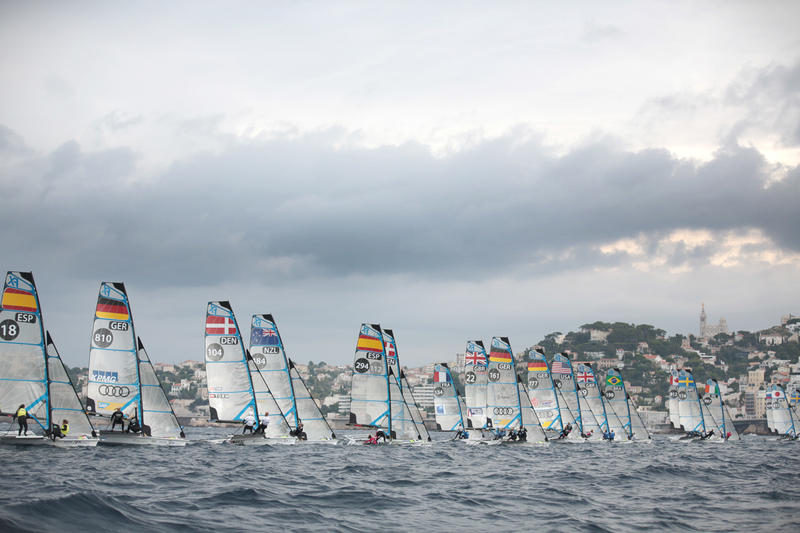 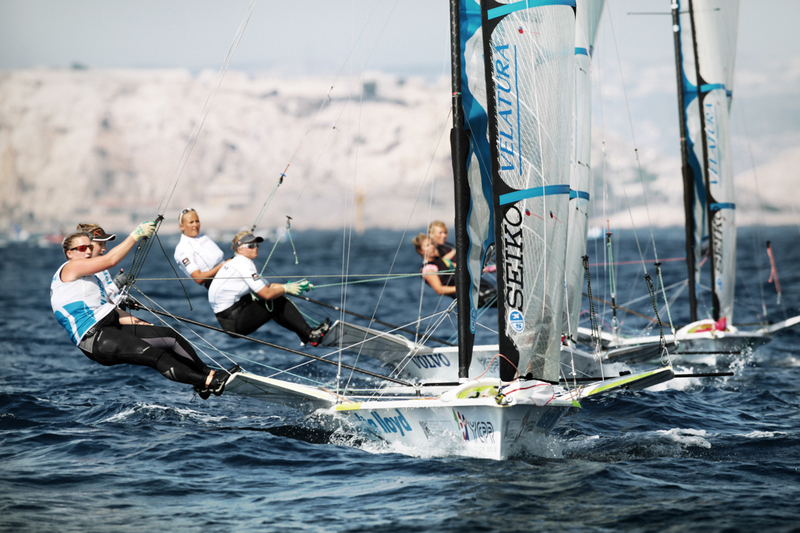 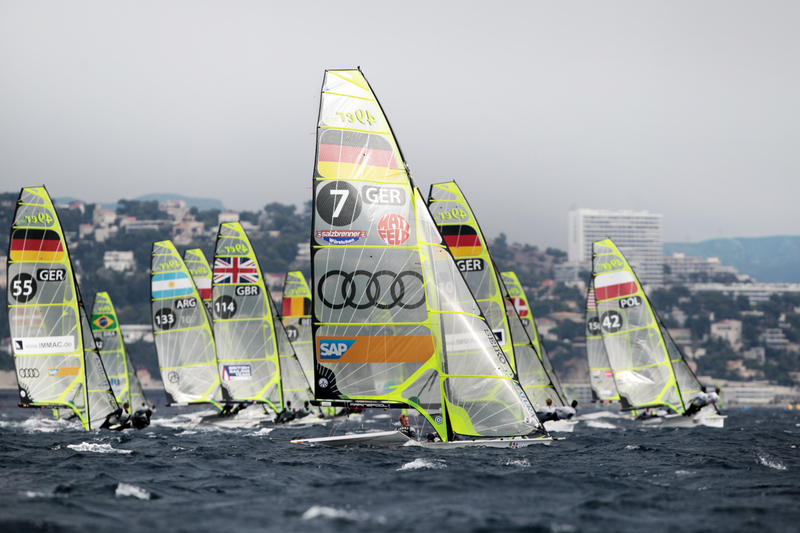 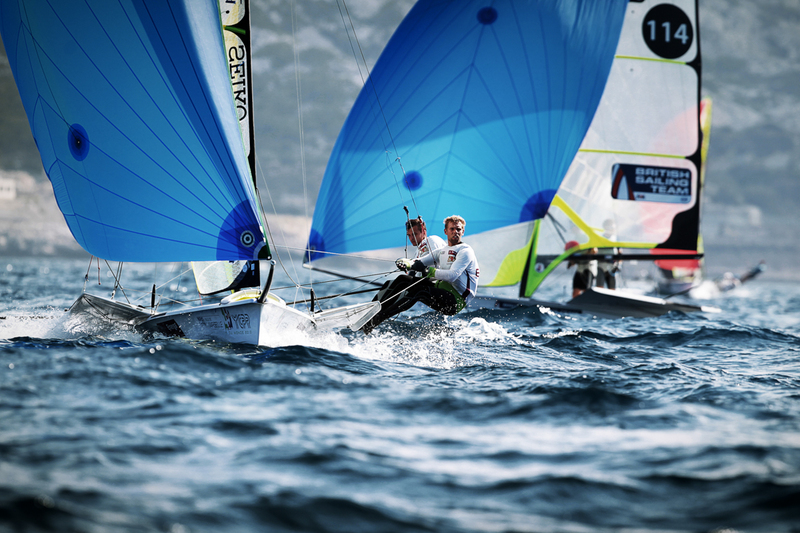 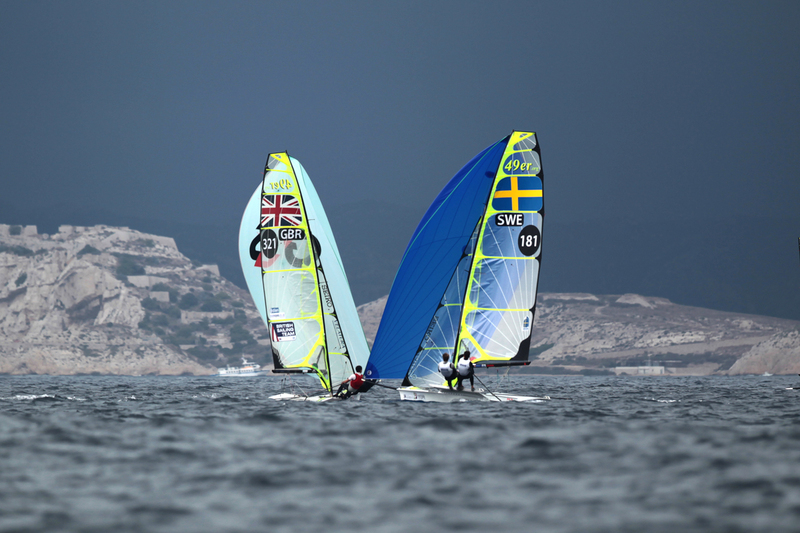 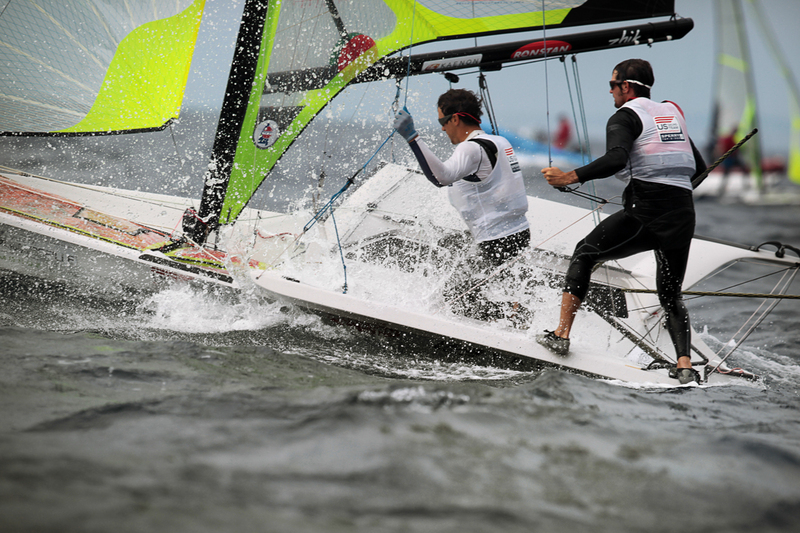 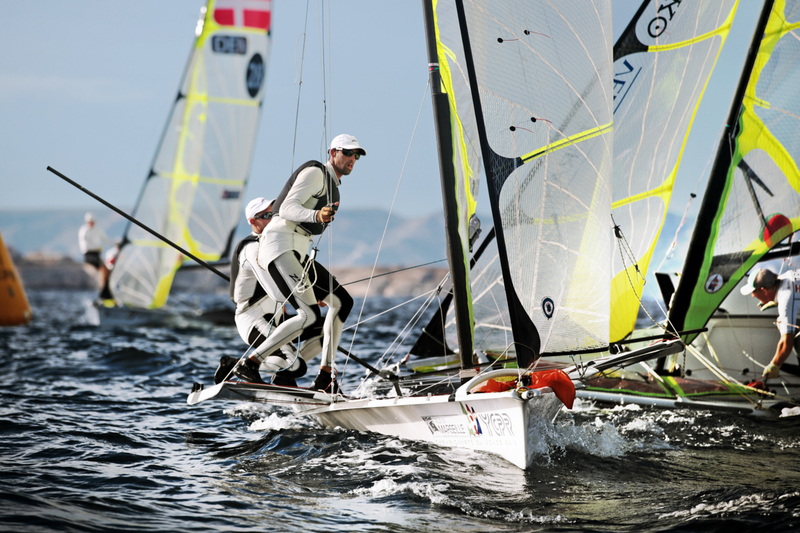 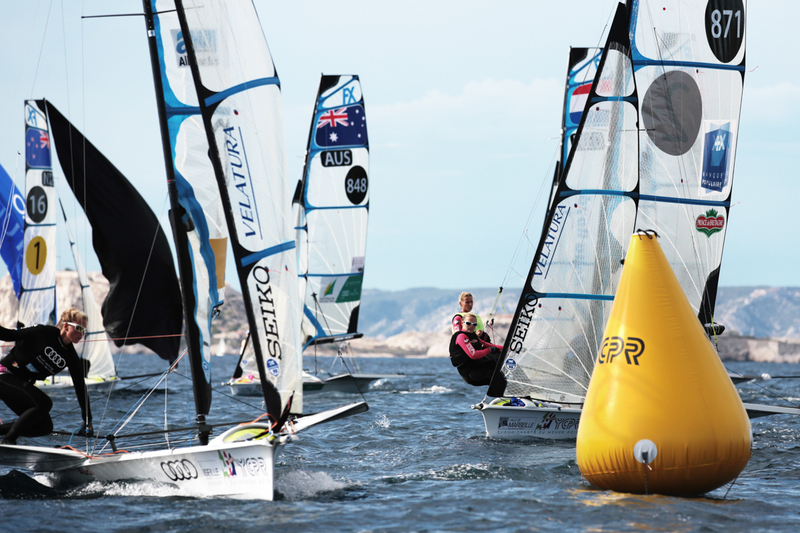 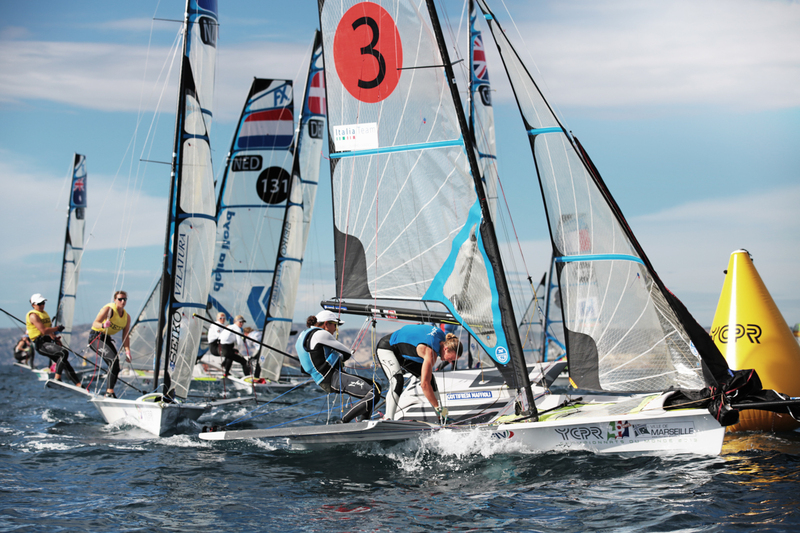 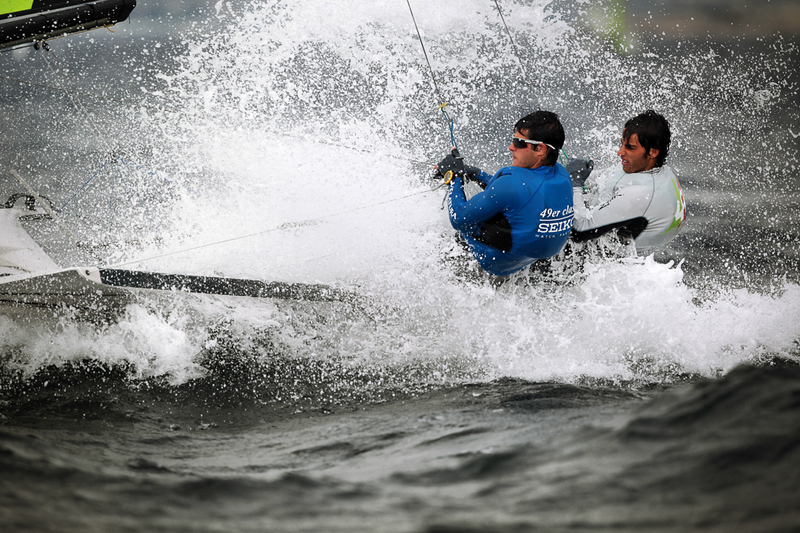 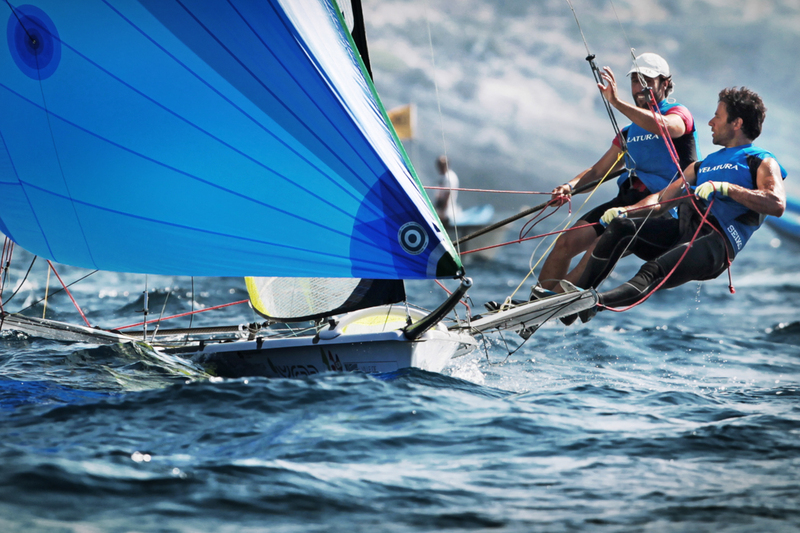 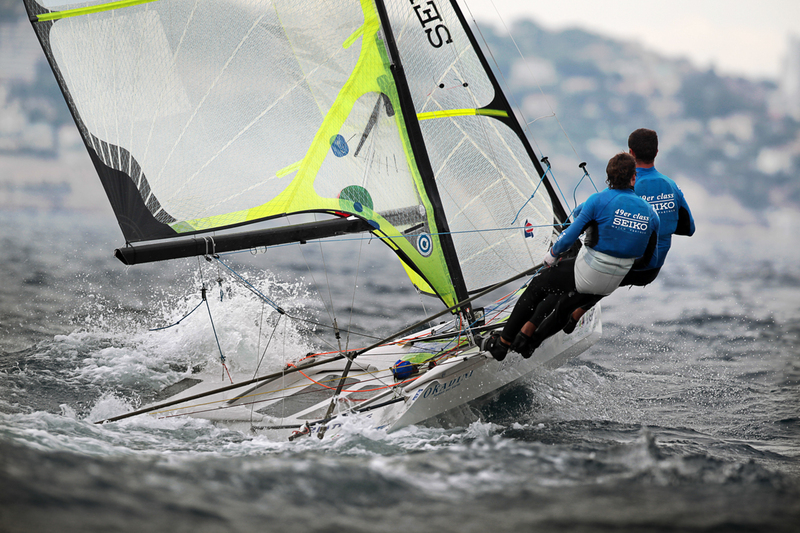 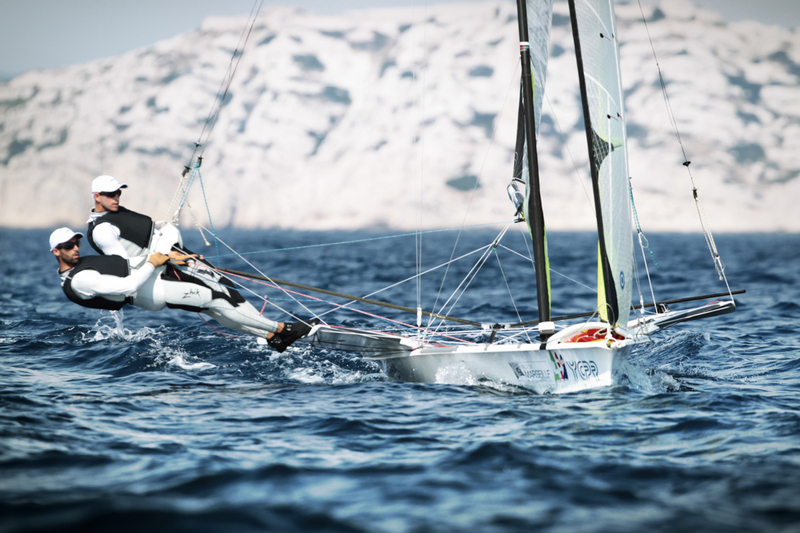 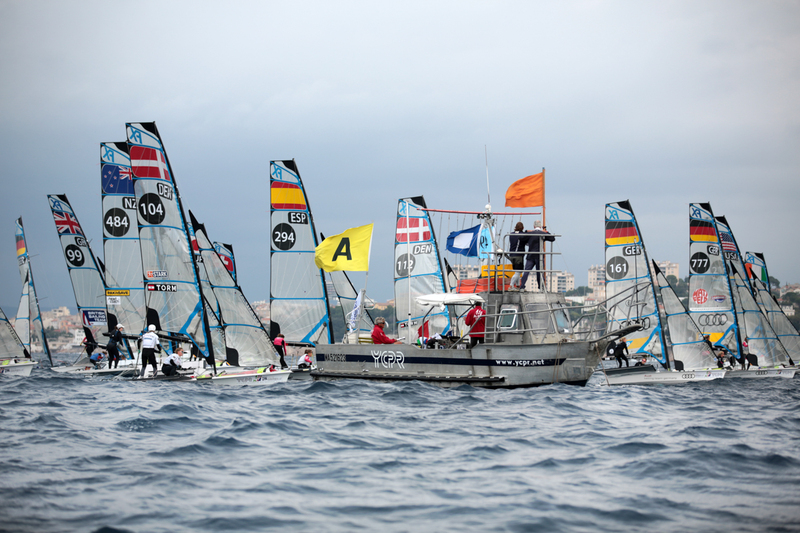 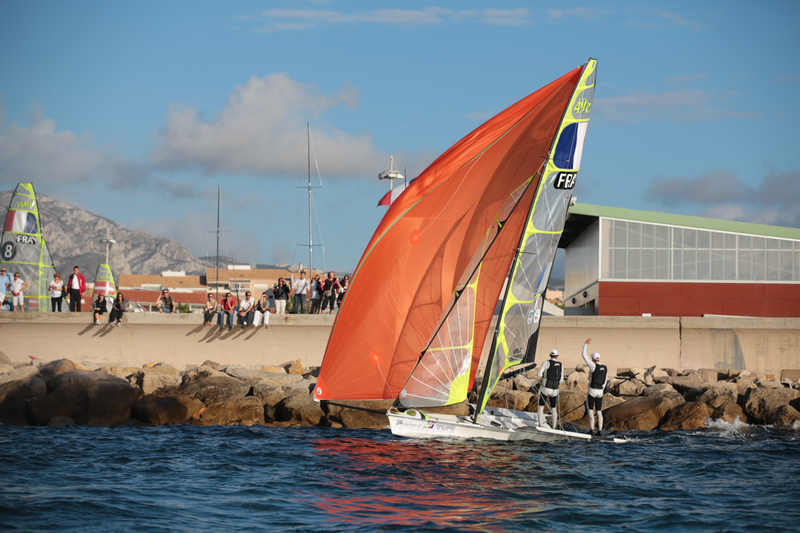 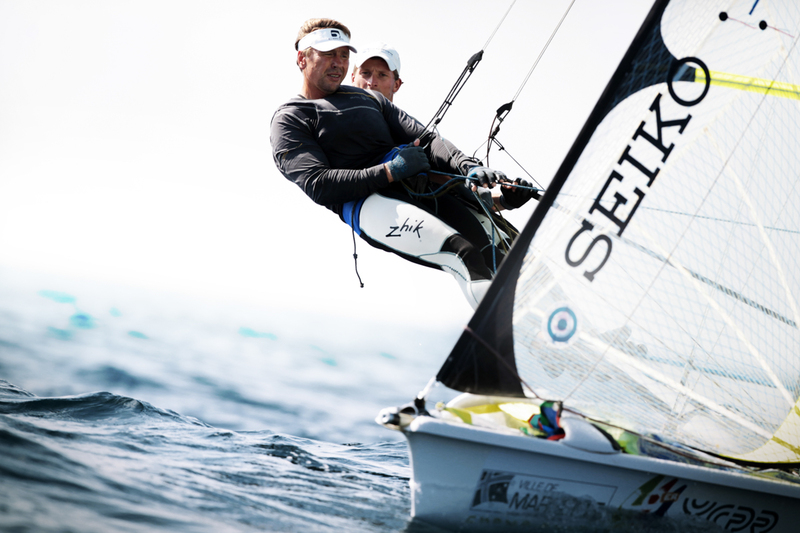 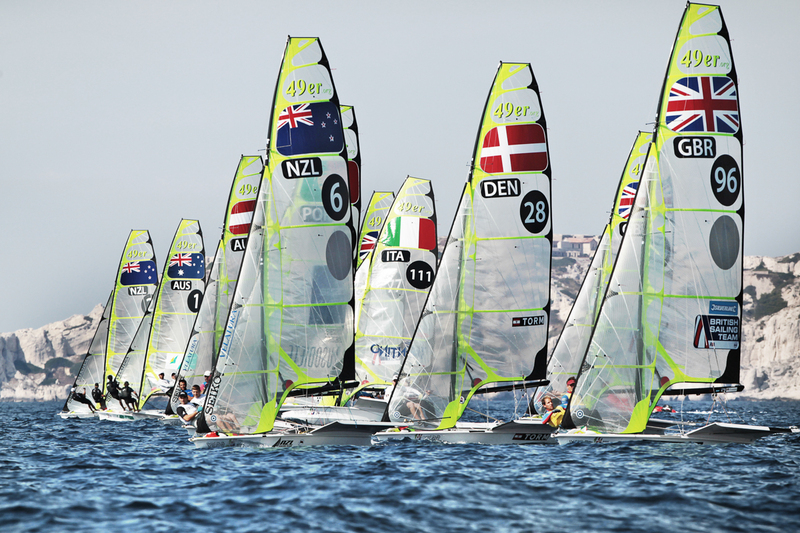 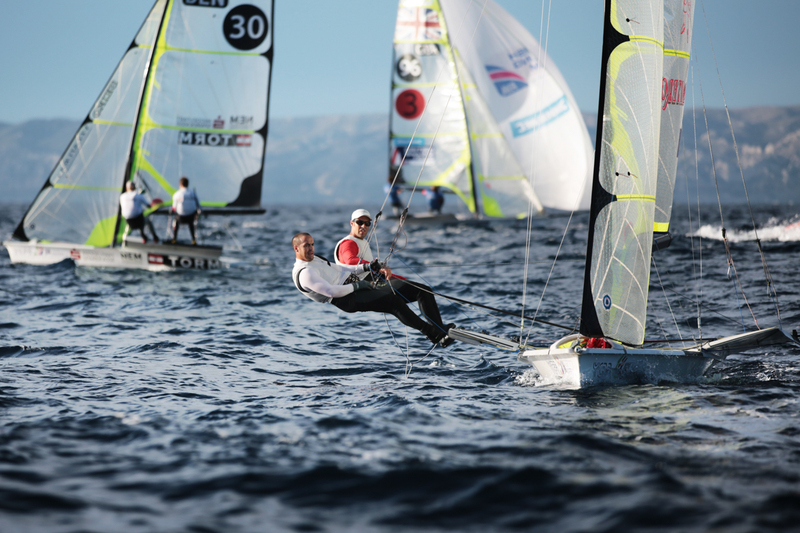 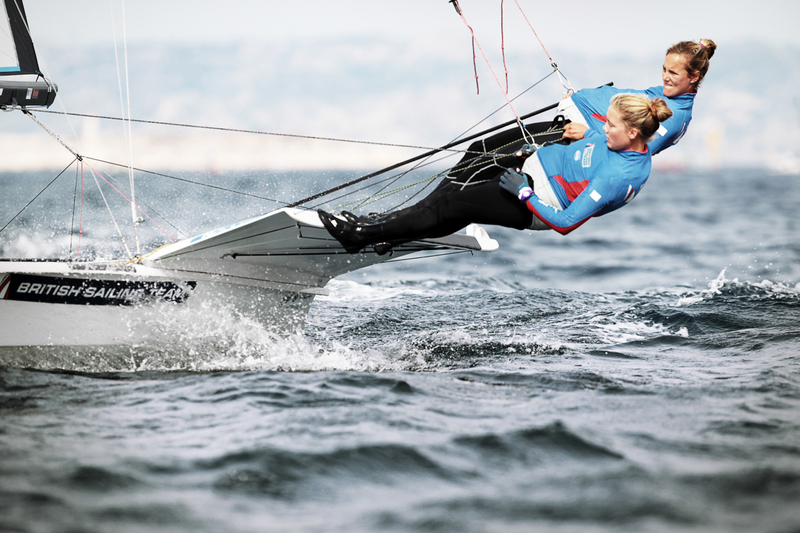 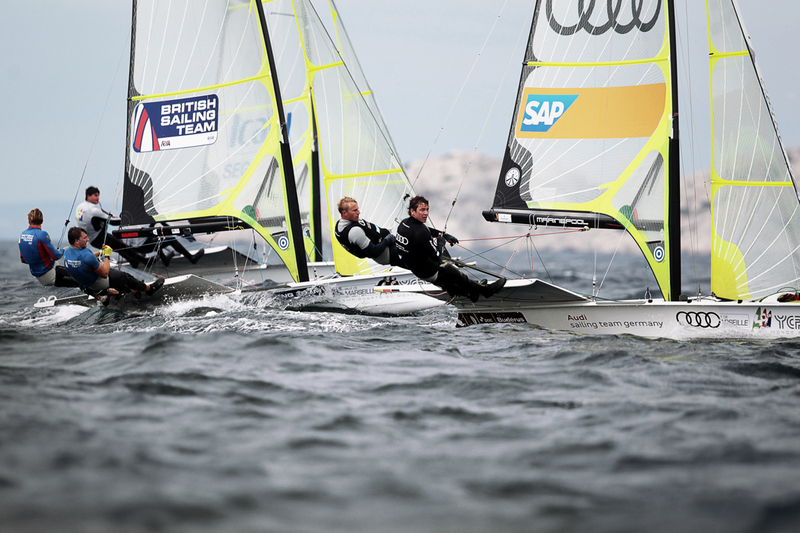 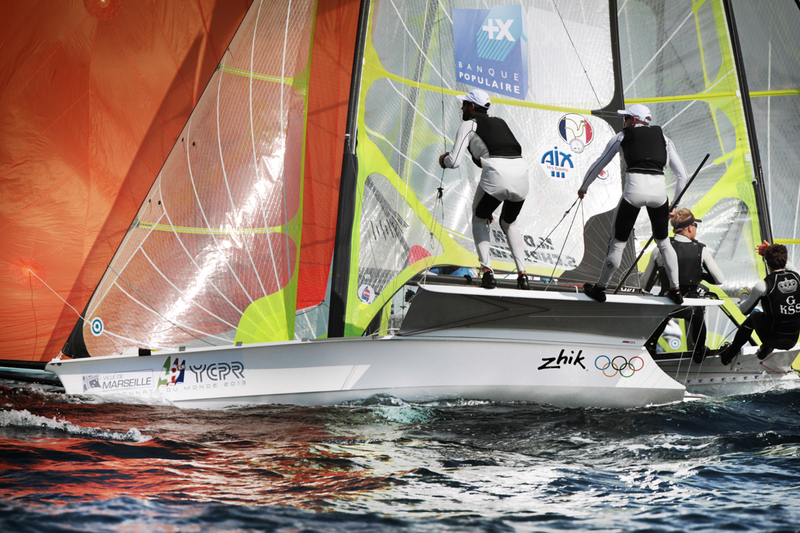 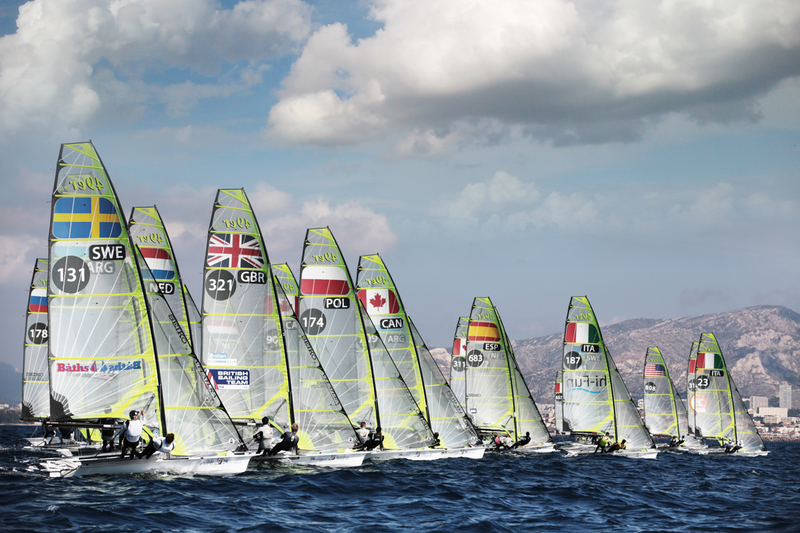 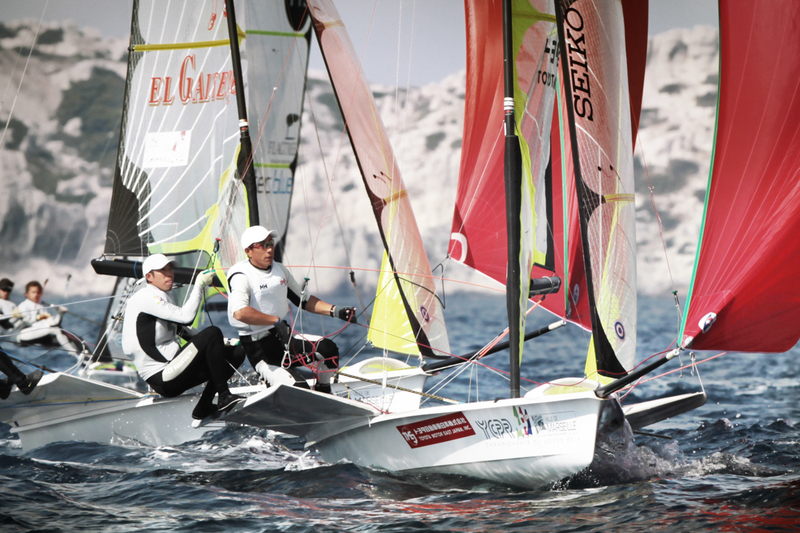 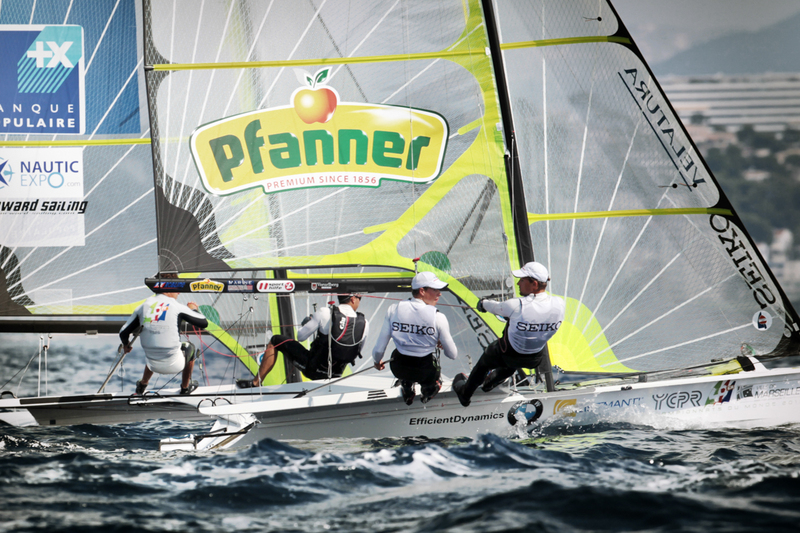 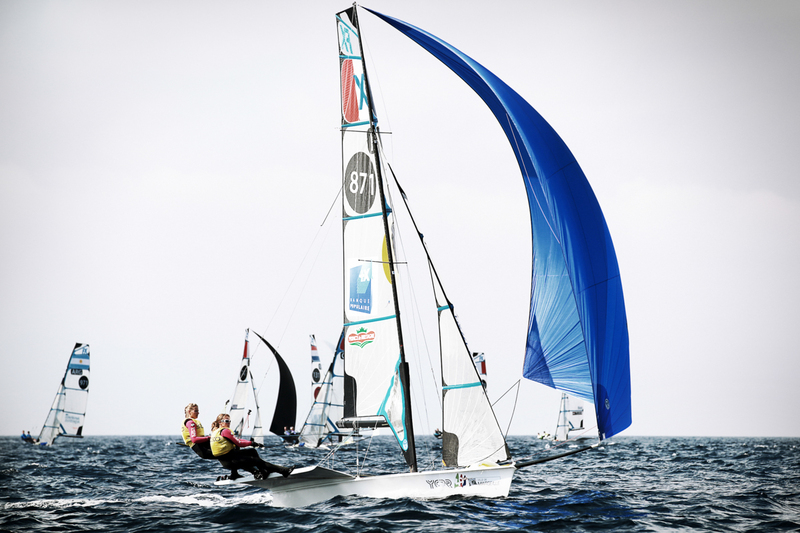 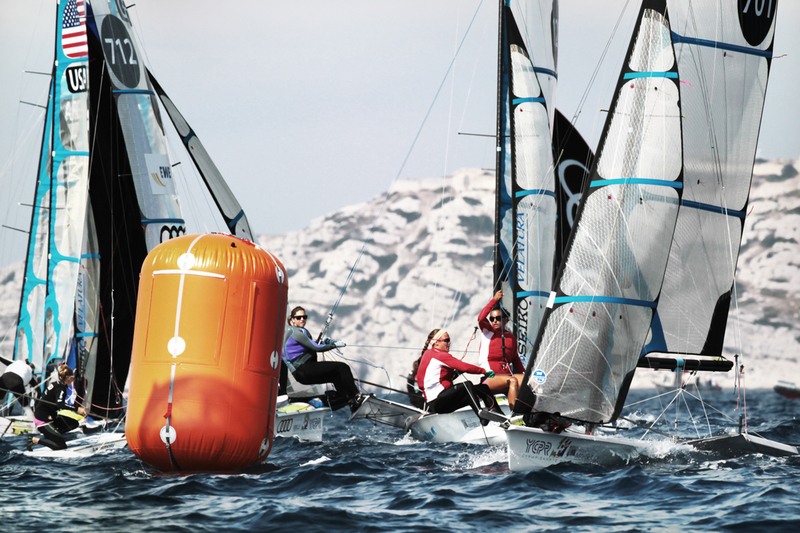 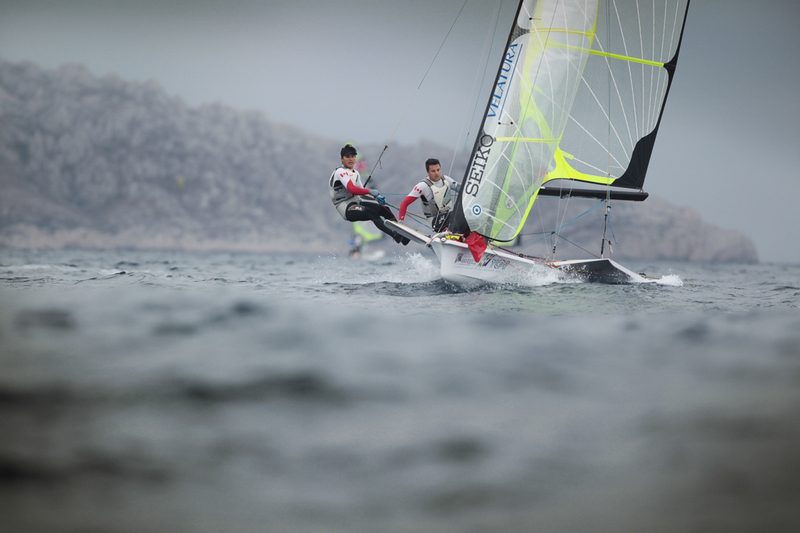 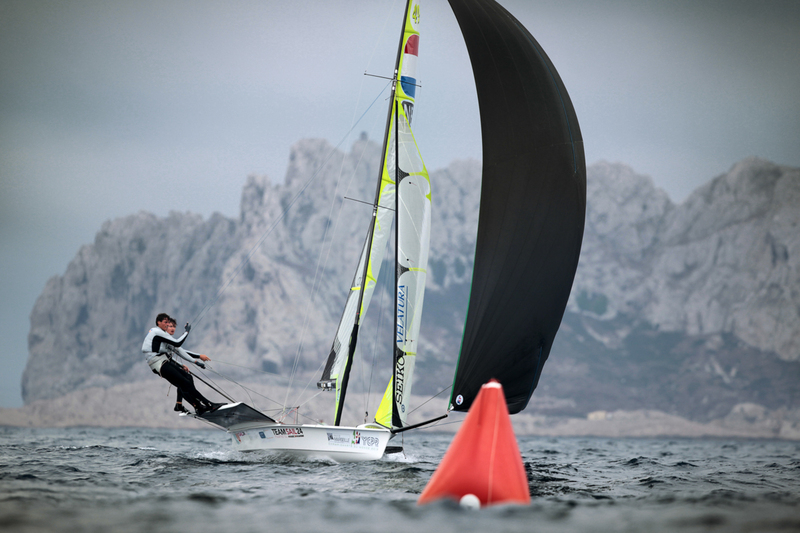 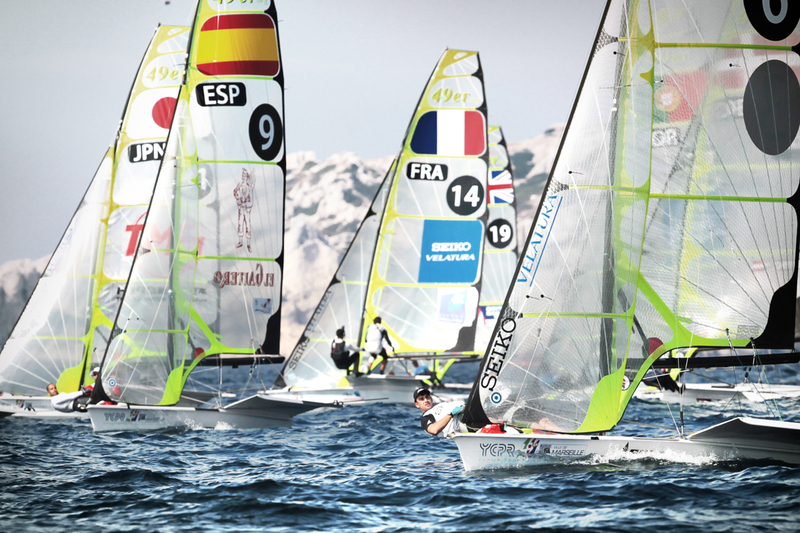 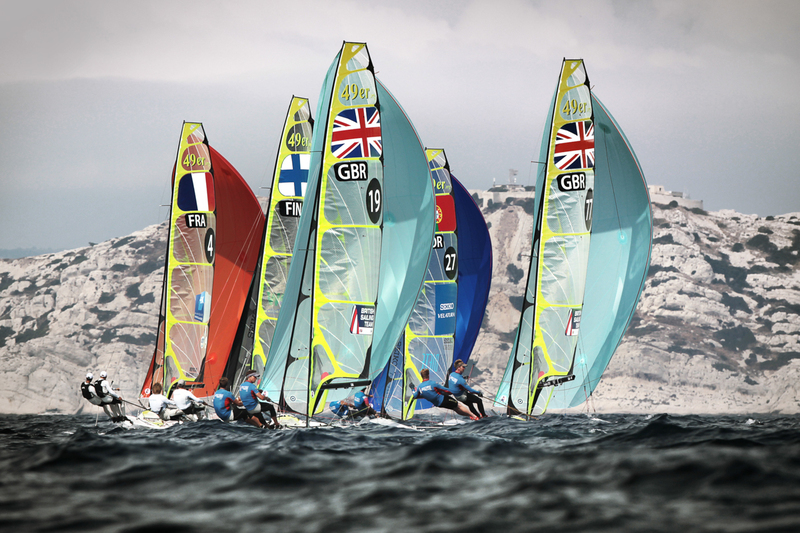 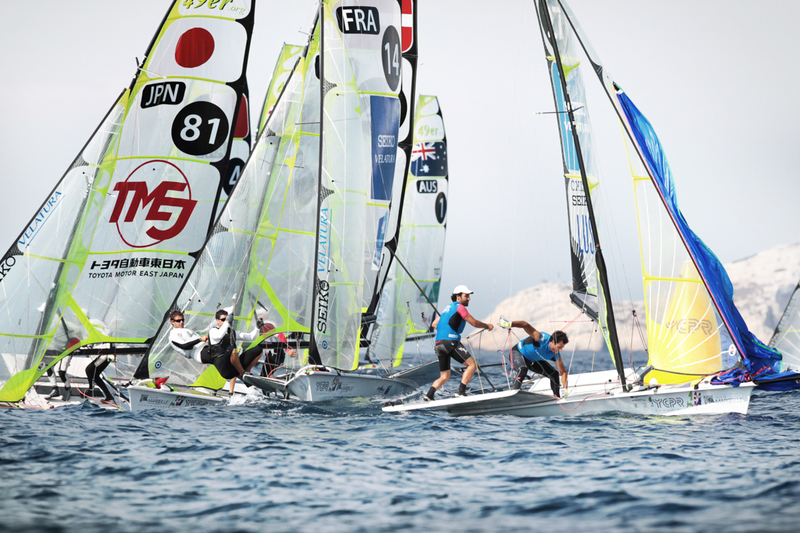 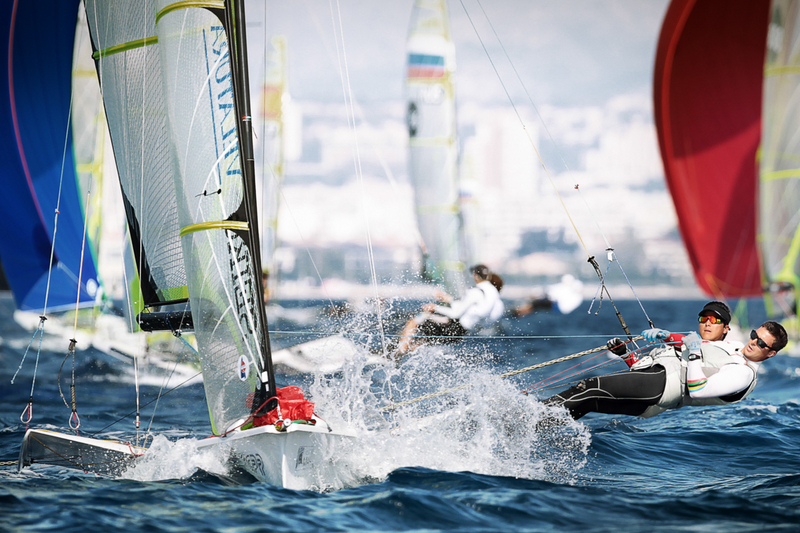 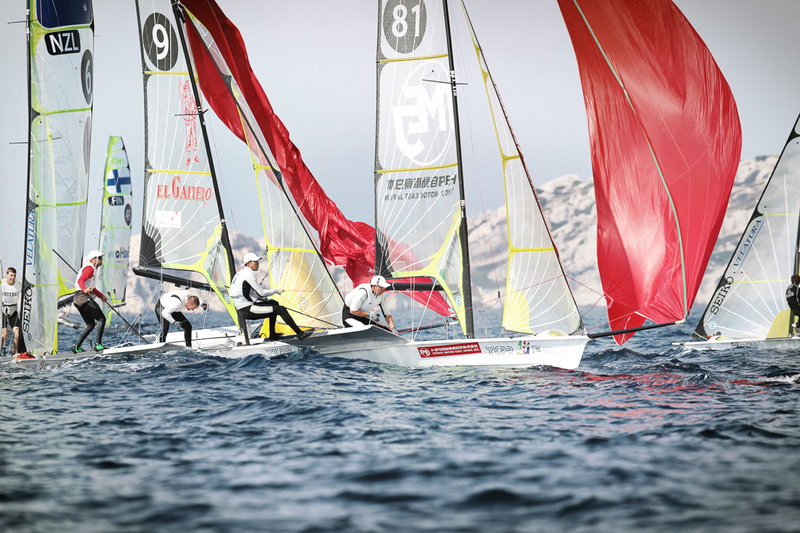 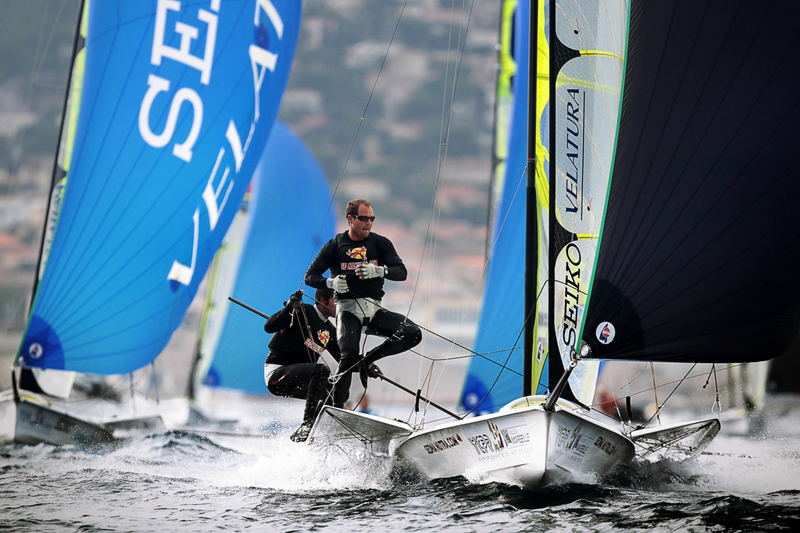 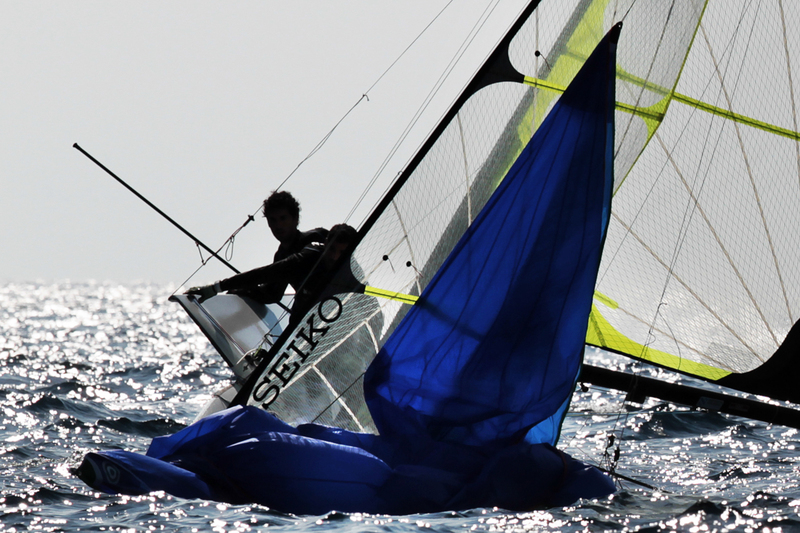 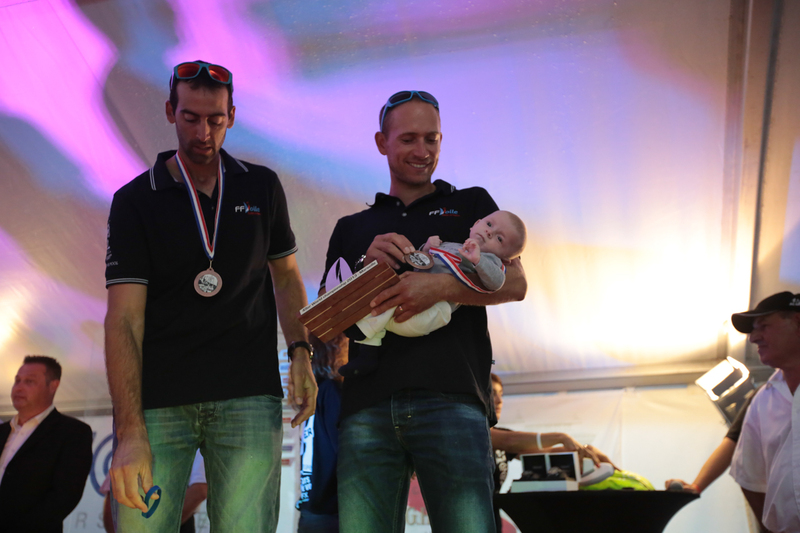 The 2013 49er and 49erFX World Championships are in Marseille, France, from Sept 21-29, 2013. 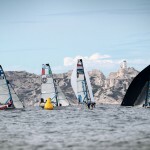 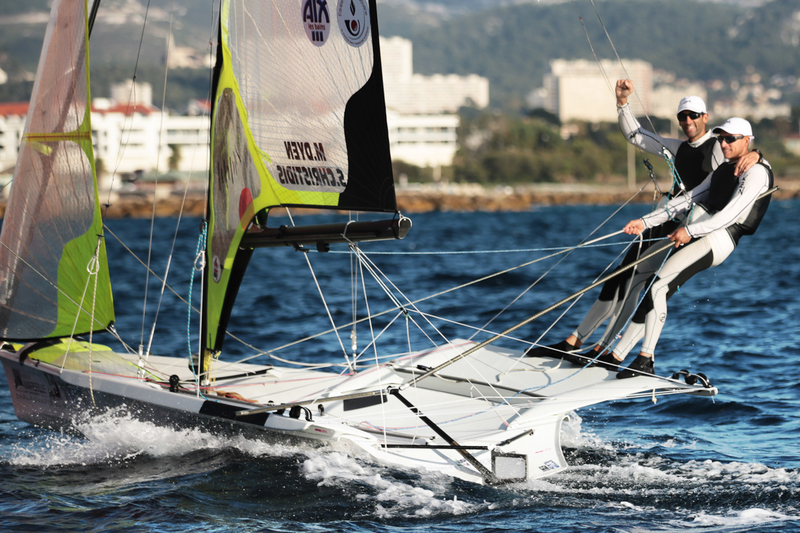 Marseille is the home to the French 49er teams and is ideally situated for a World Championships. 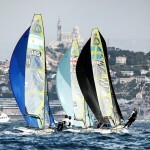 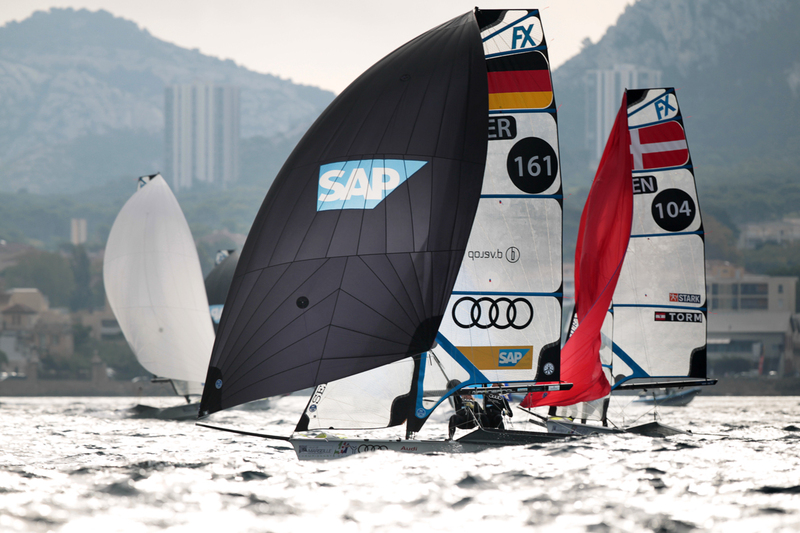 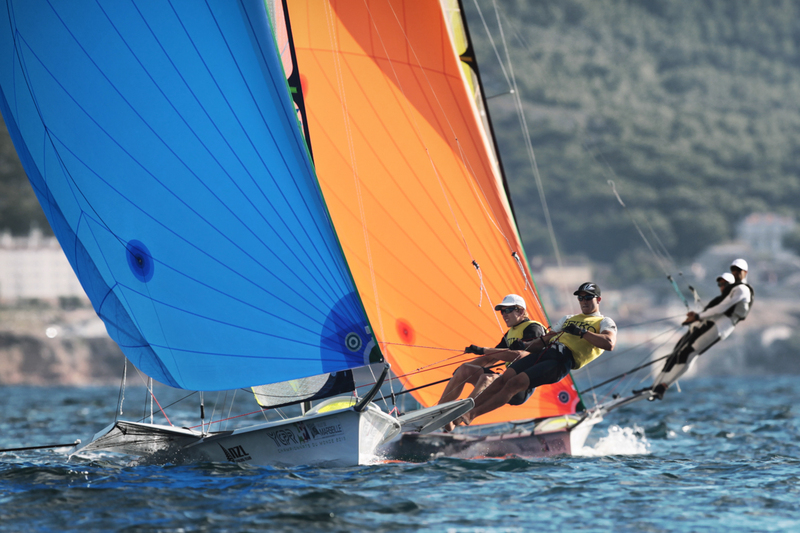 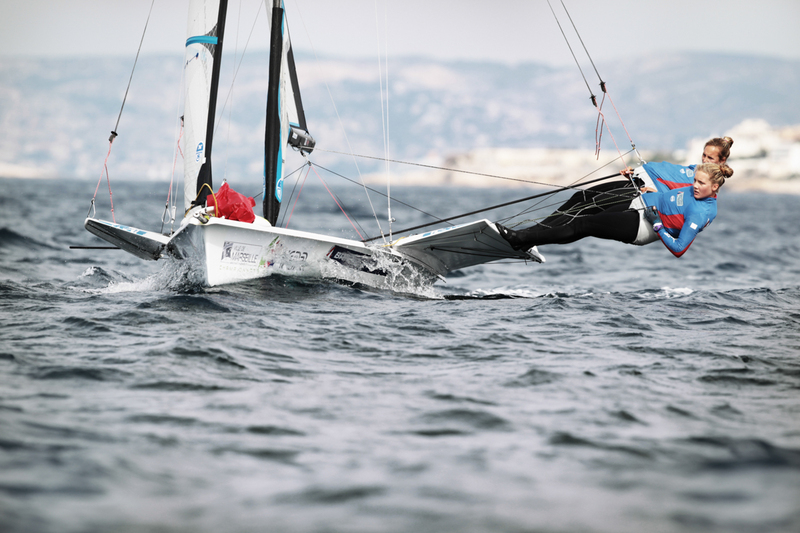 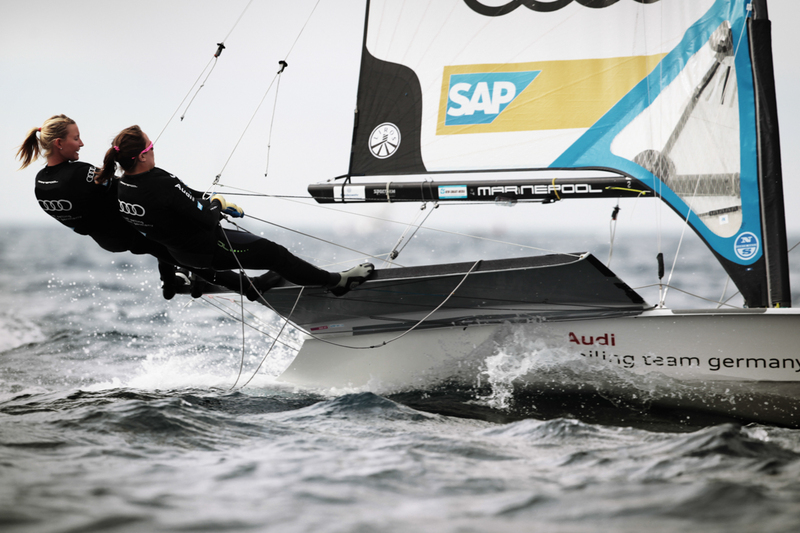 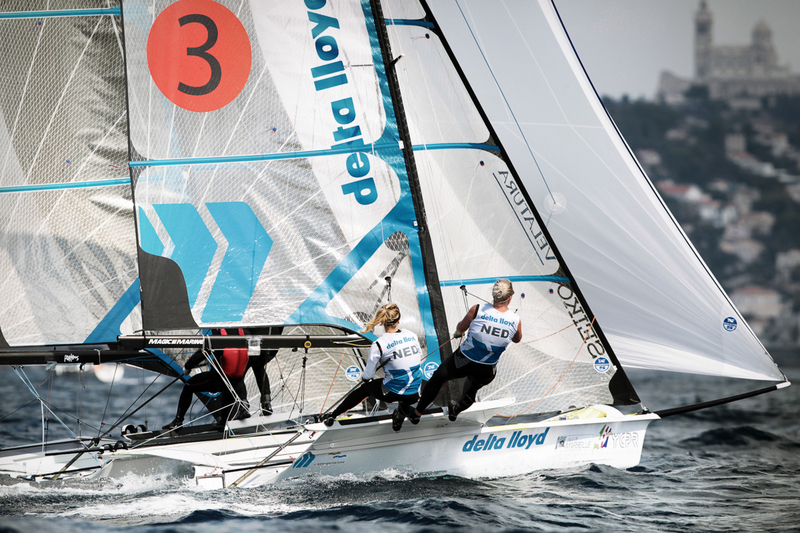 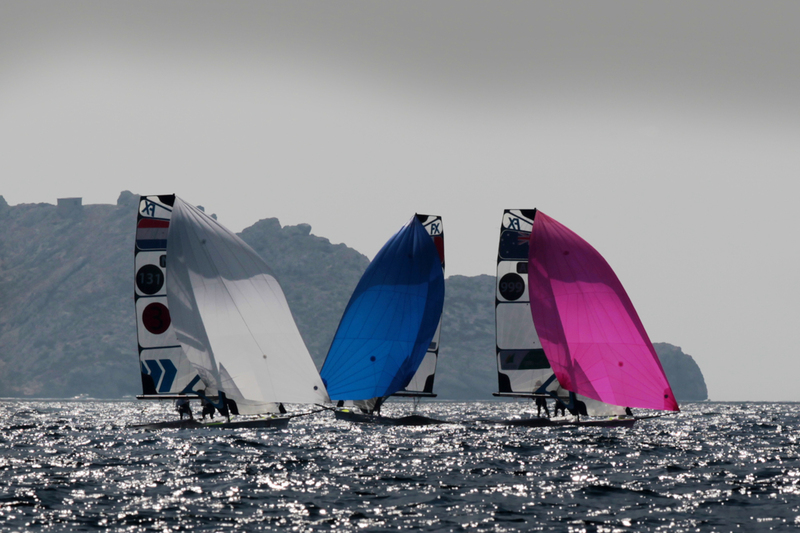 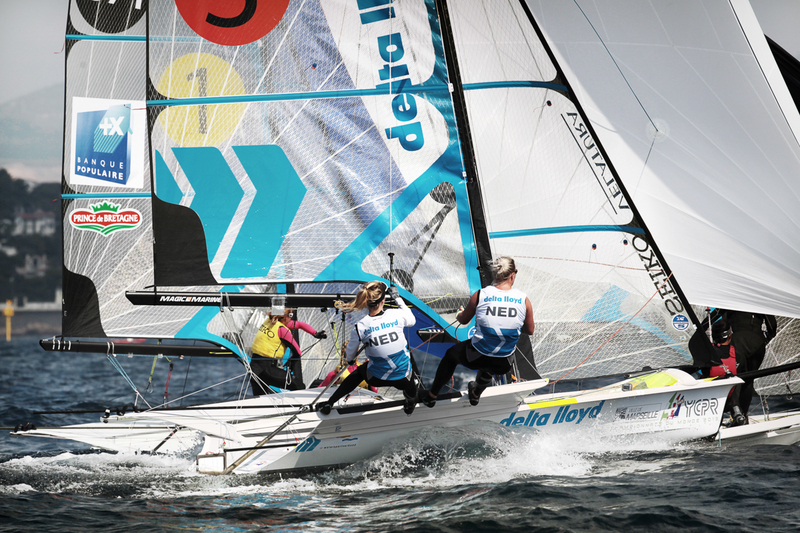 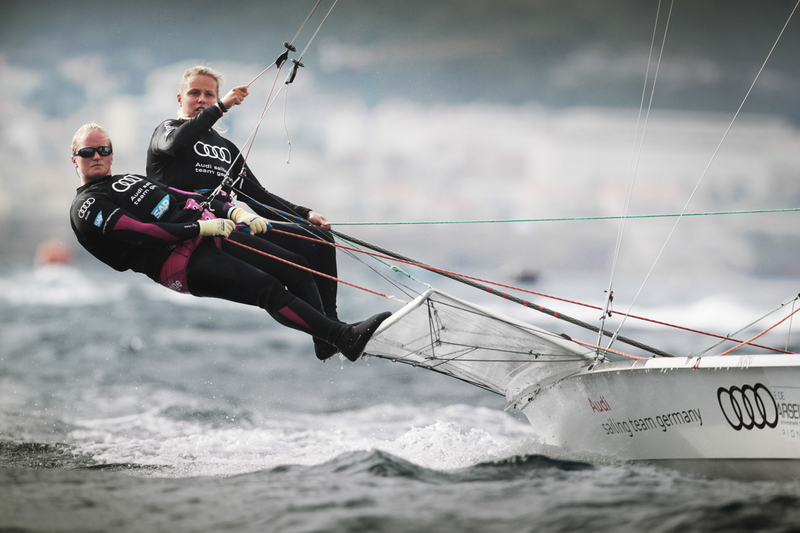 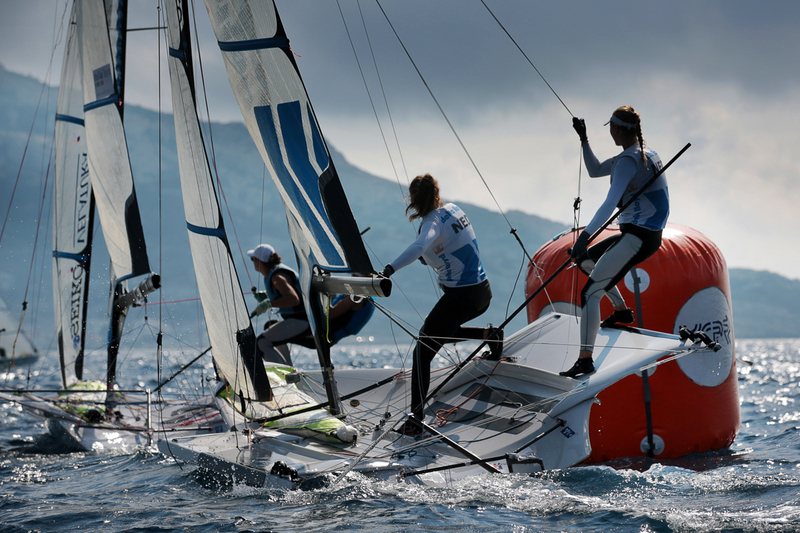 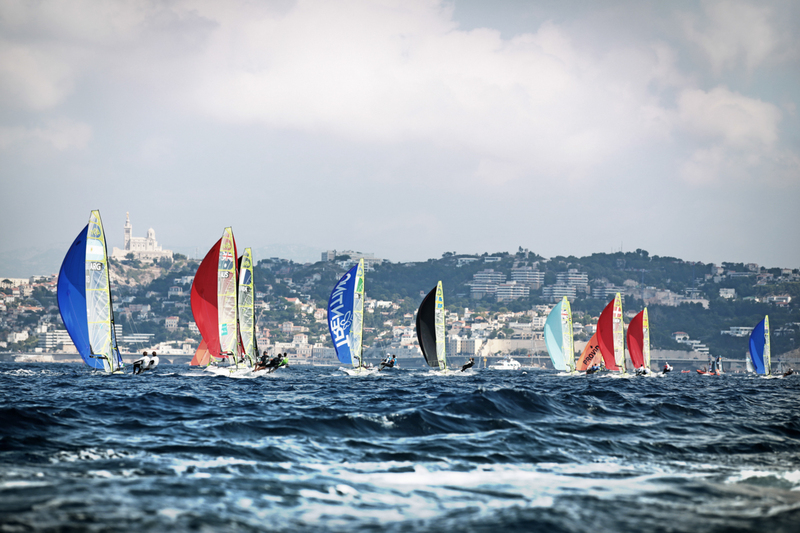 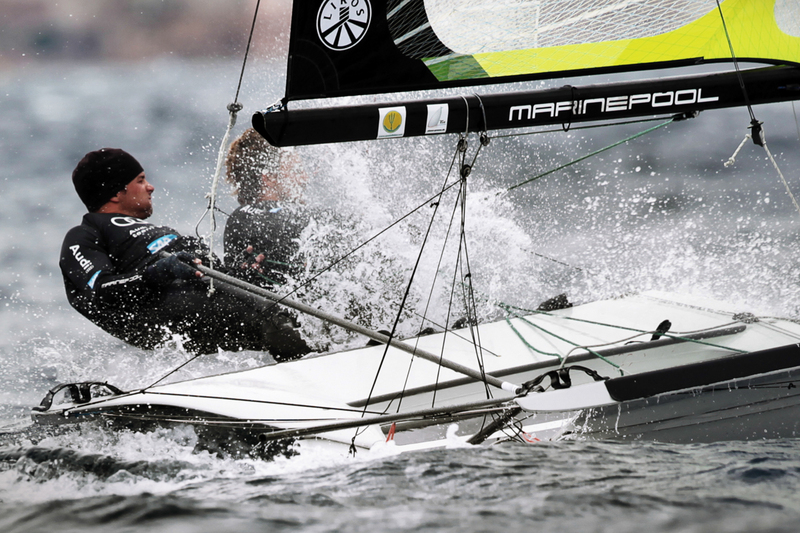 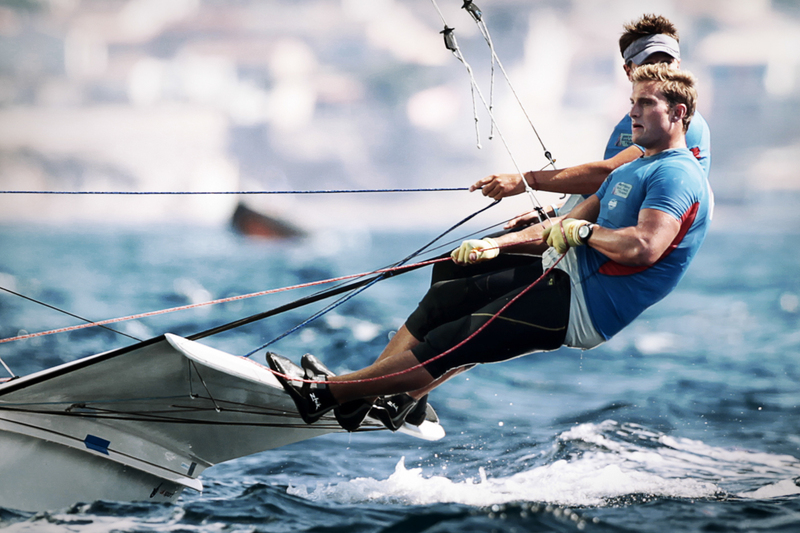 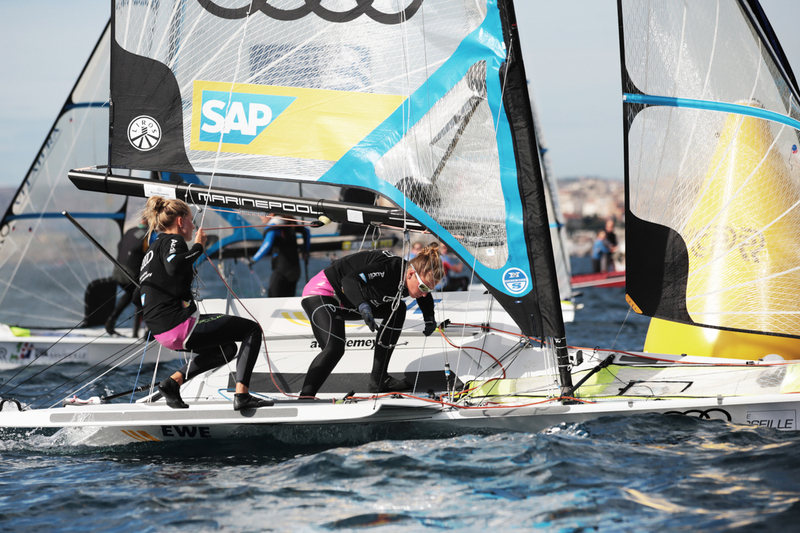 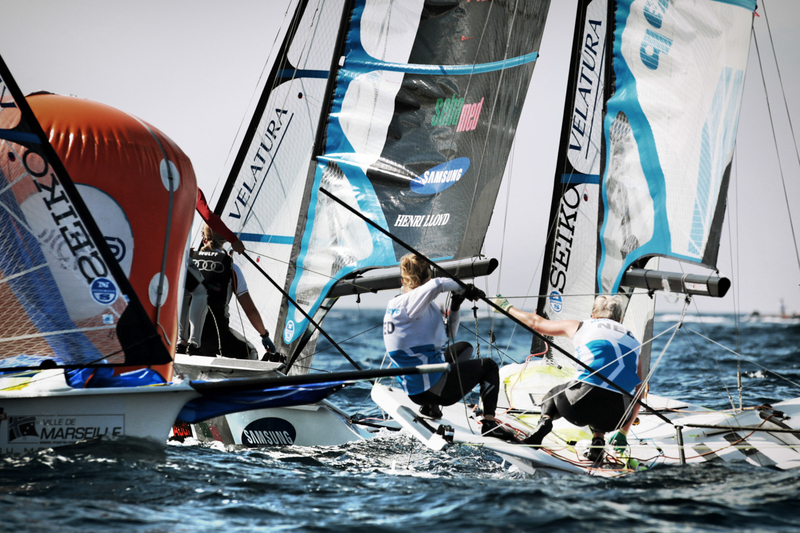 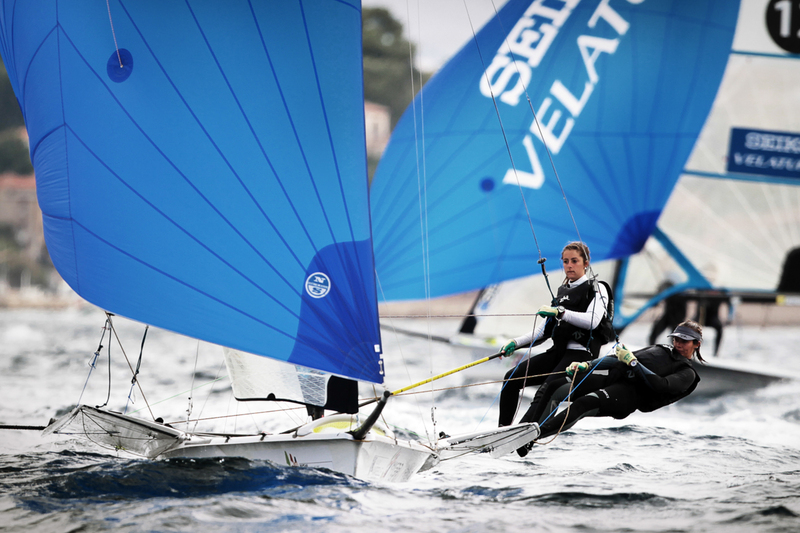 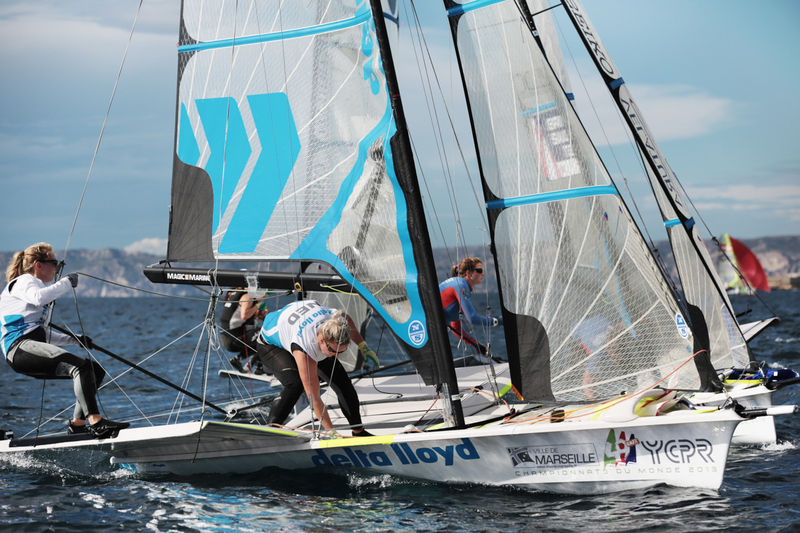 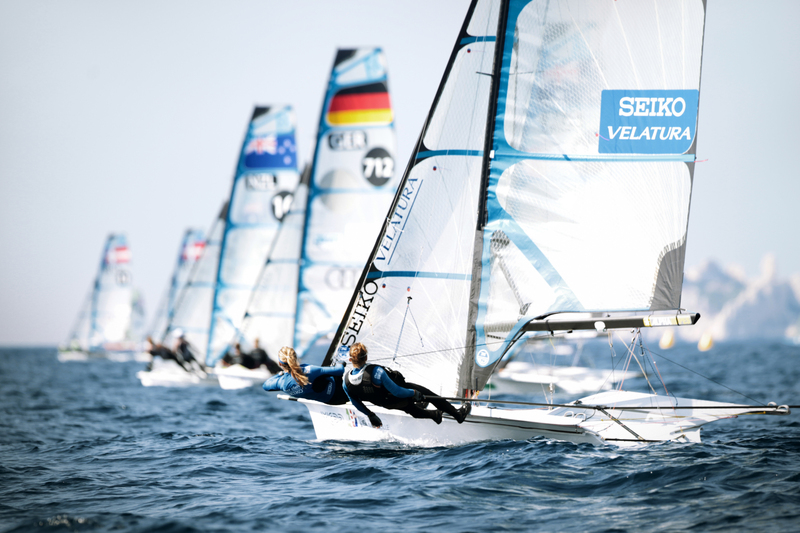 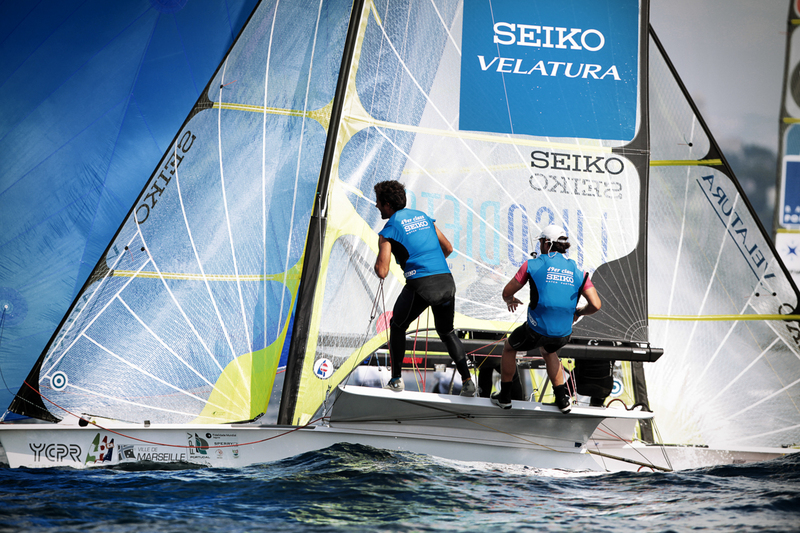 For fans who want to watch sailing live in Marseille there will be live racing to view each day from Sept 24-29. 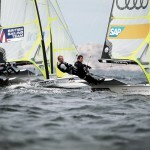 The championship course will be visible from shore. 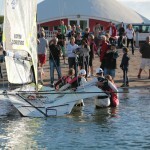 Fans are also invited inside the venue to see the boats and sailors up close. 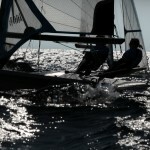 Join our audience each evening for the 6:00 pm evening show. 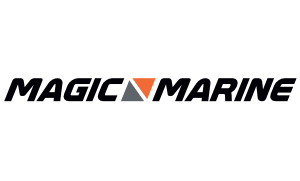 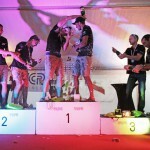 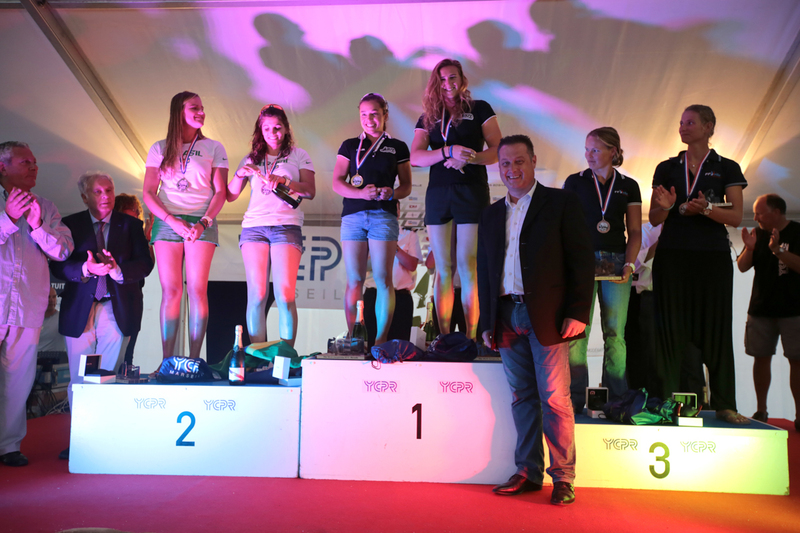 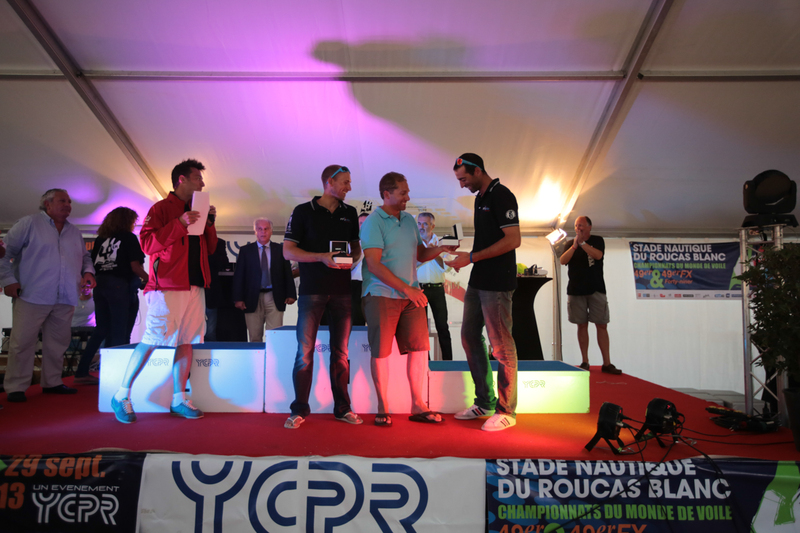 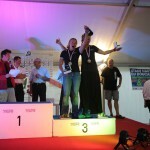 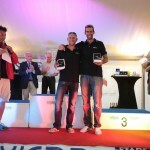 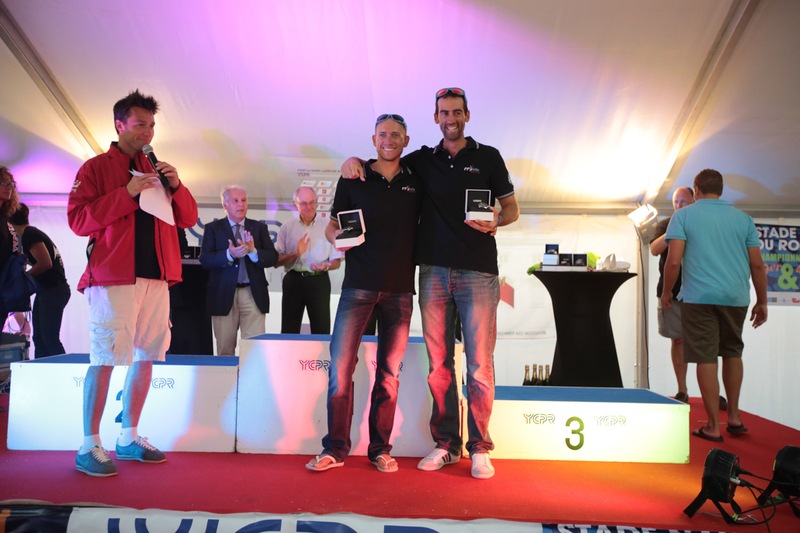 GPS – There will be GPS tracking of the championship course each day. 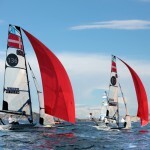 2 of the 6 fleets daily will carry gps transmitters so fans can watch racing virtually each day on 49er.org Daily Highlights – Each night there will be a daily video highlight package. 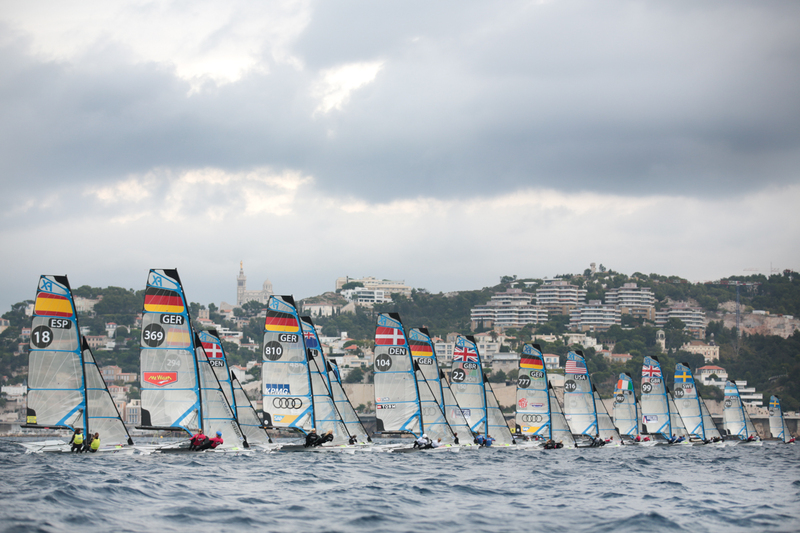 Livestream Video – We will live broadcast the racing Sept 27-29, the semi finals and finals. 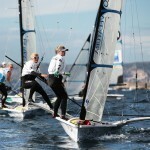 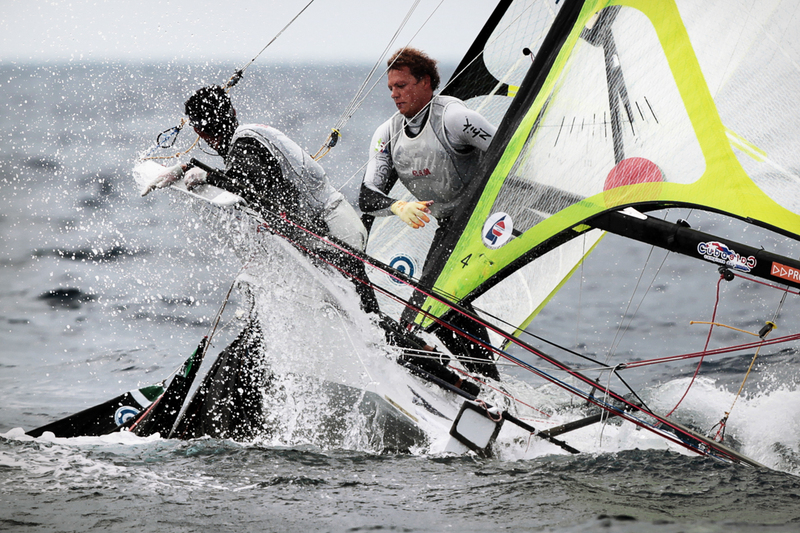 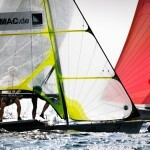 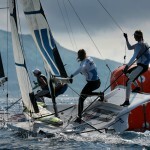 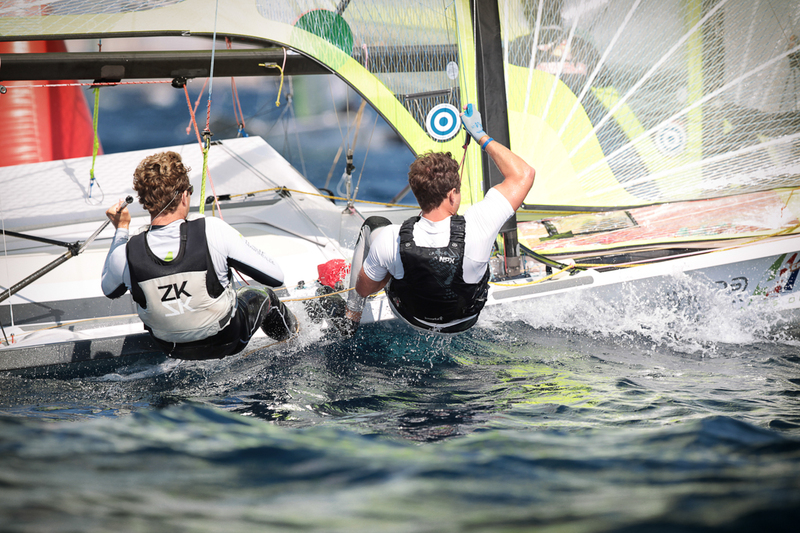 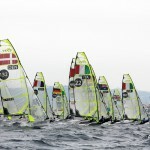 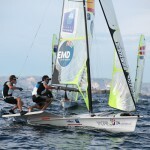 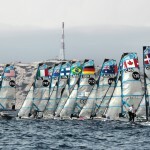 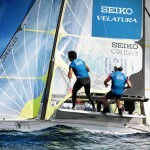 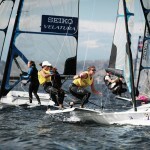 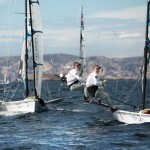 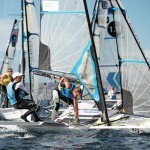 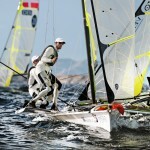 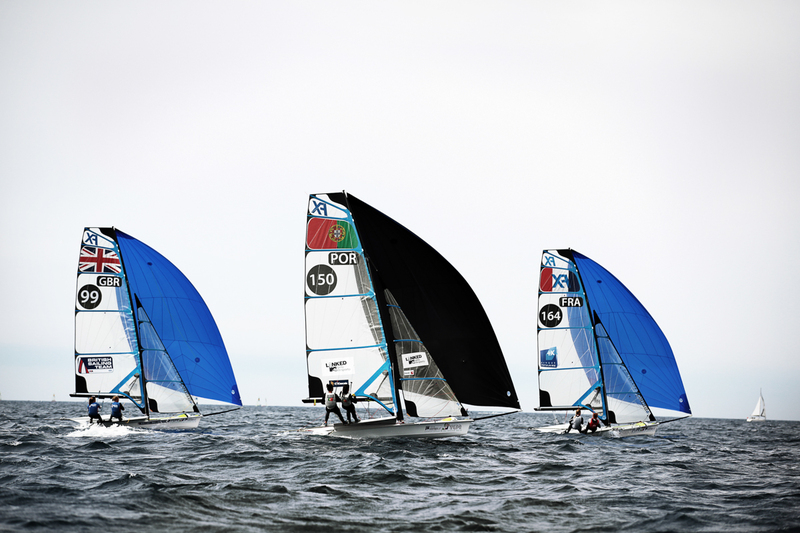 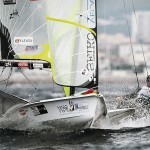 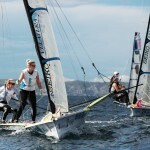 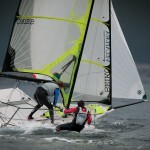 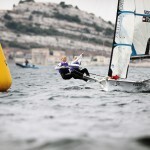 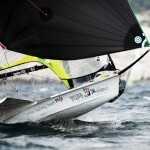 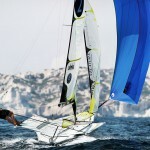 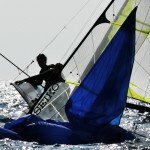 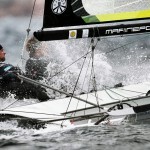 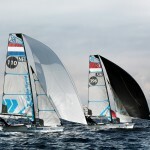 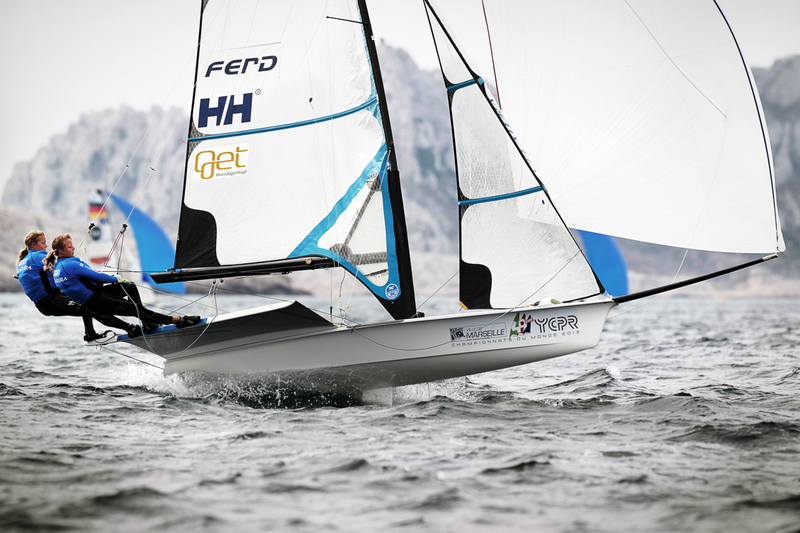 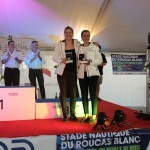 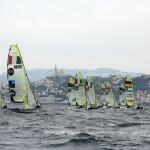 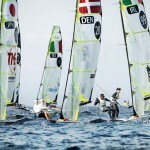 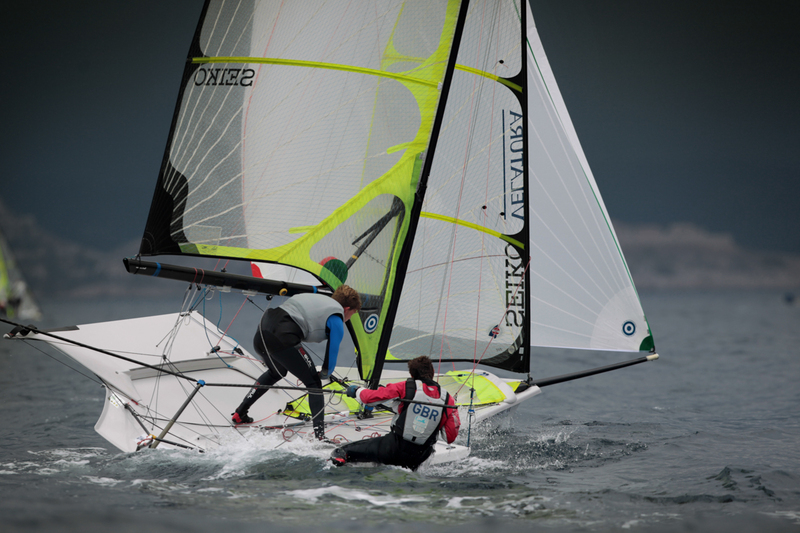 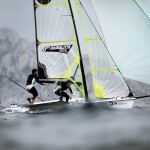 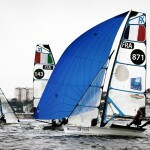 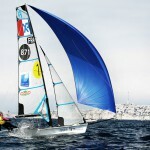 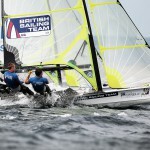 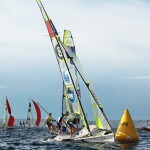 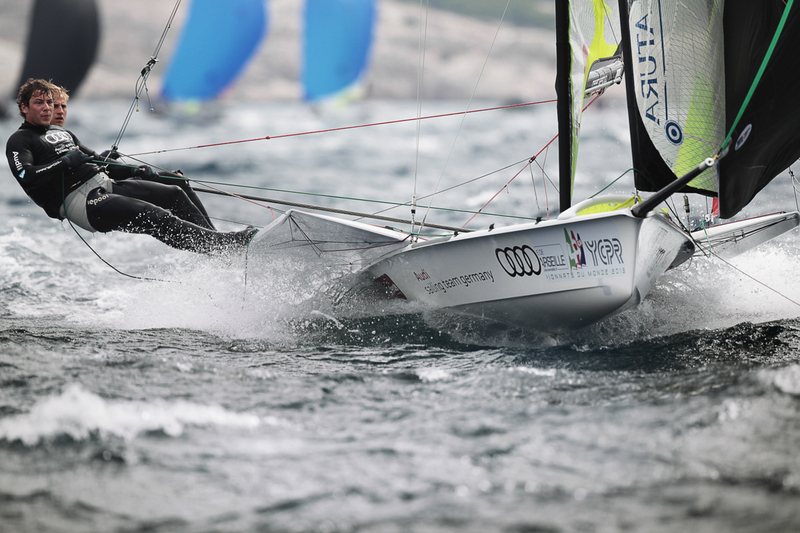 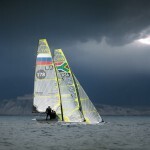 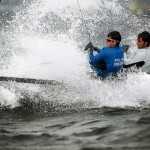 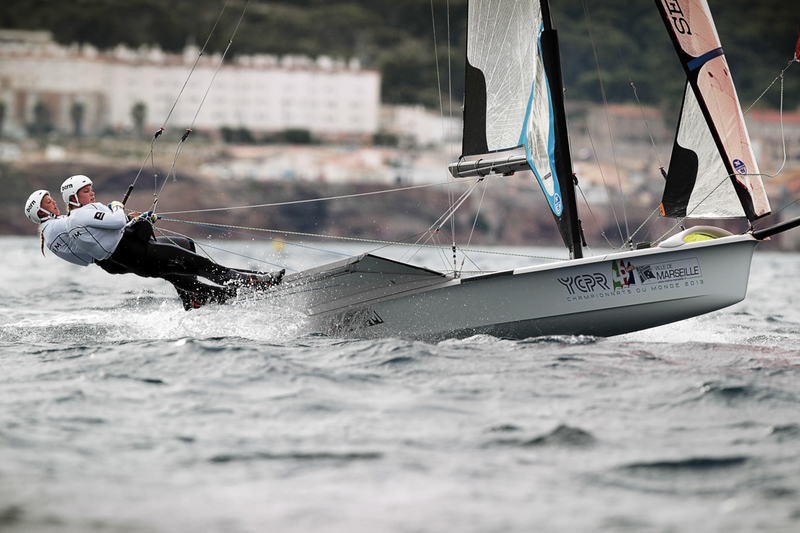 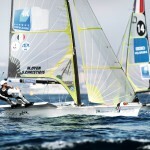 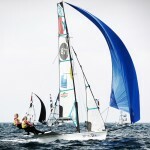 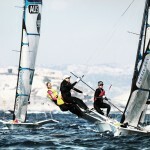 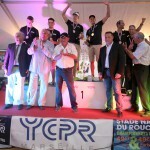 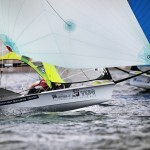 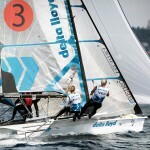 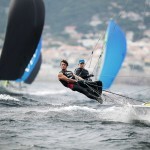 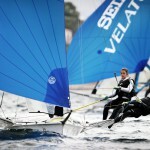 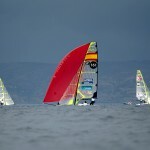 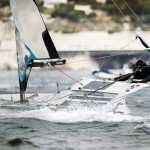 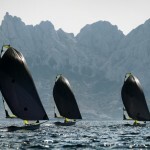 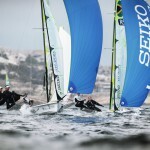 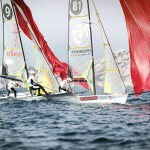 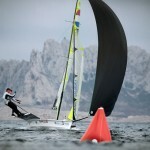 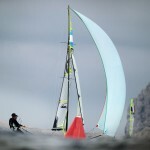 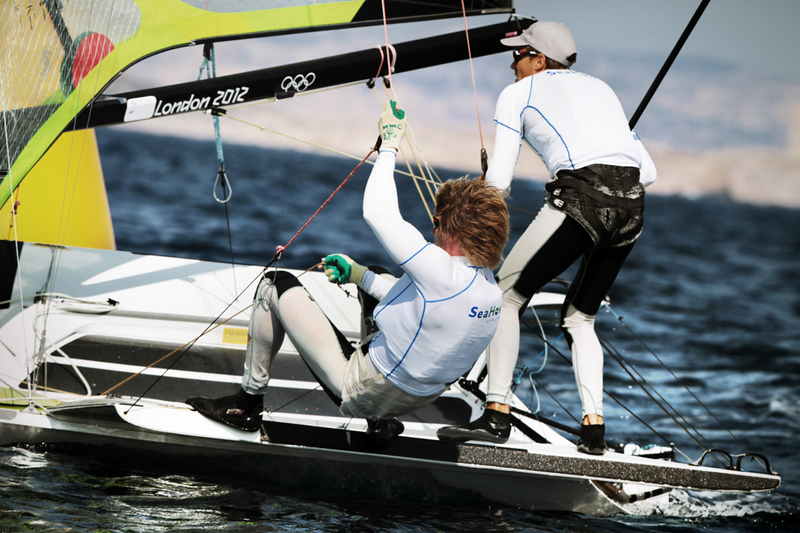 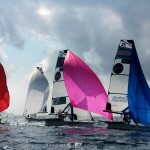 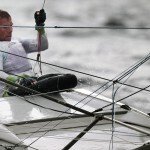 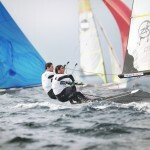 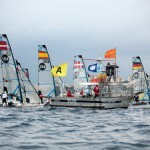 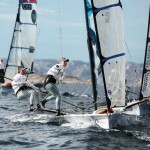 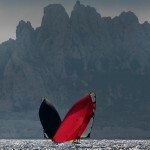 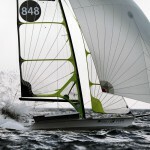 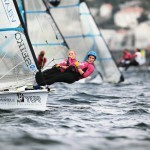 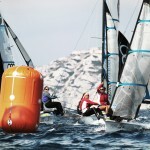 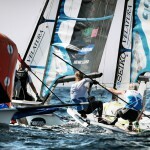 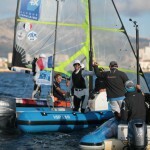 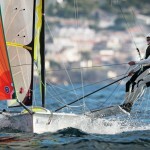 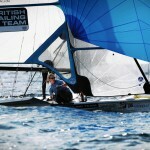 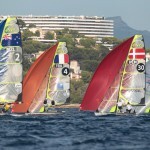 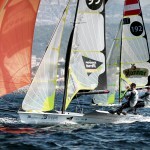 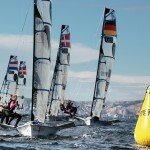 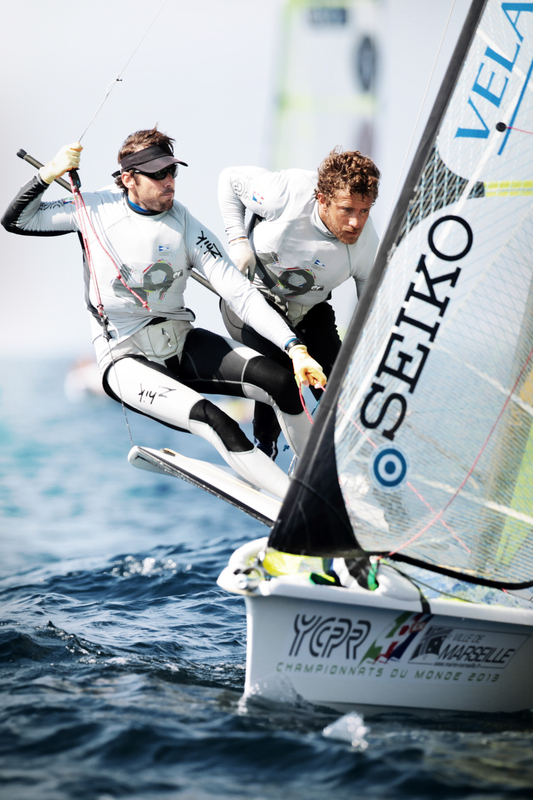 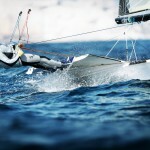 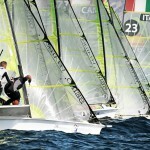 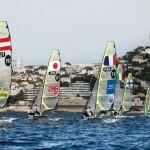 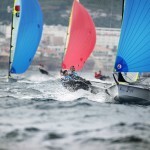 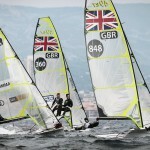 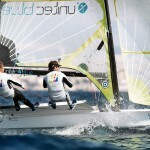 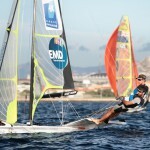 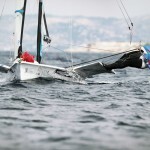 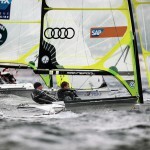 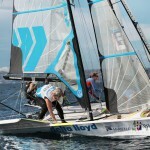 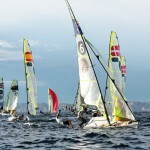 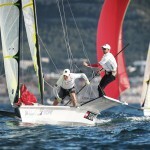 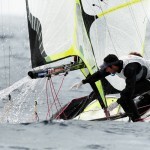 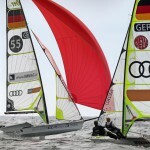 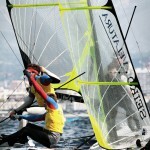 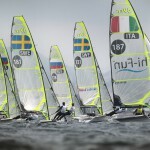 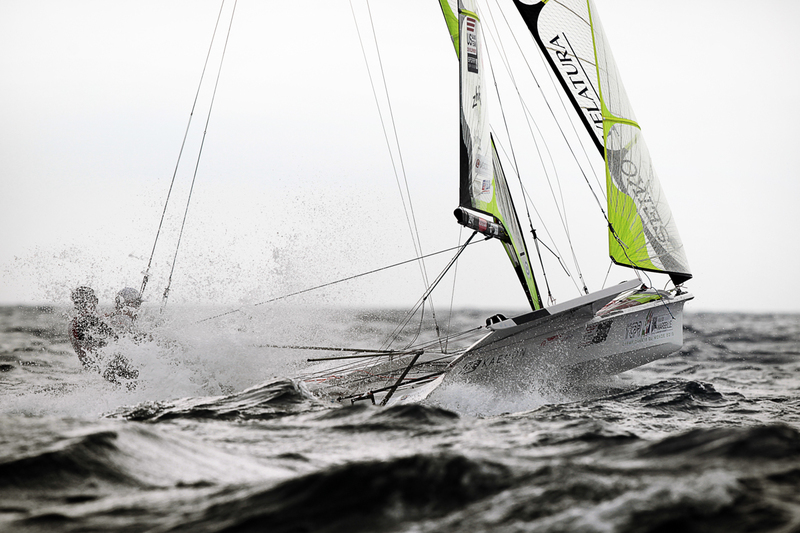 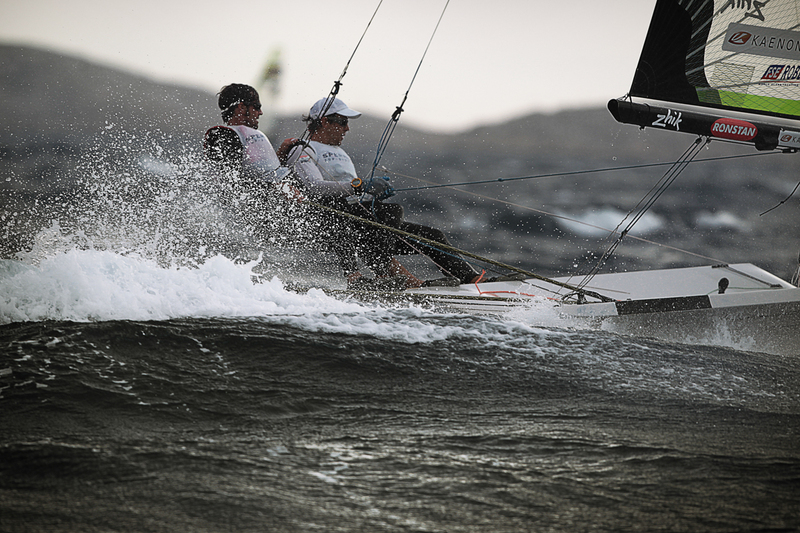 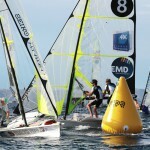 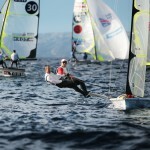 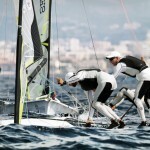 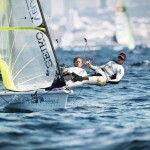 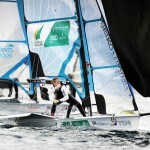 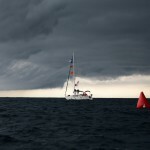 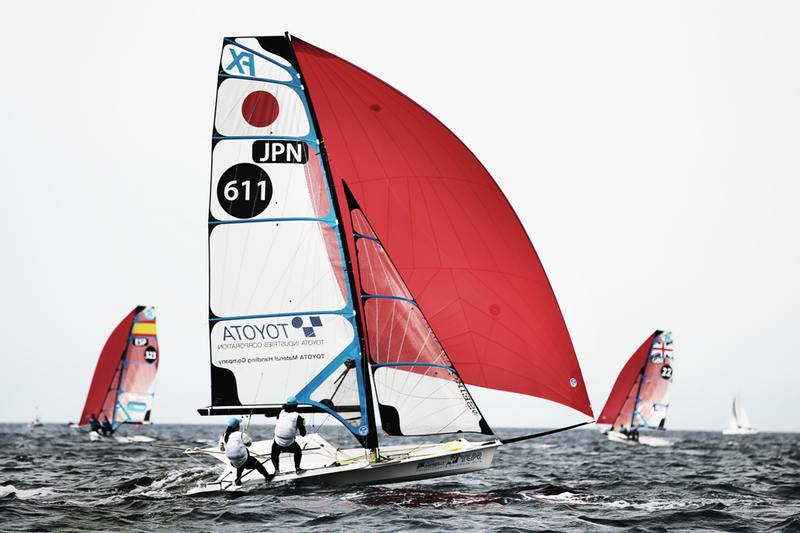 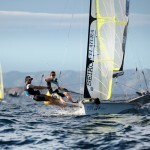 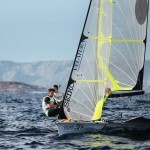 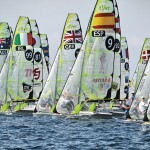 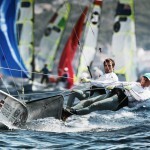 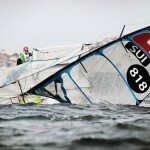 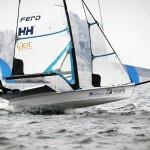 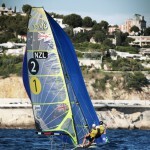 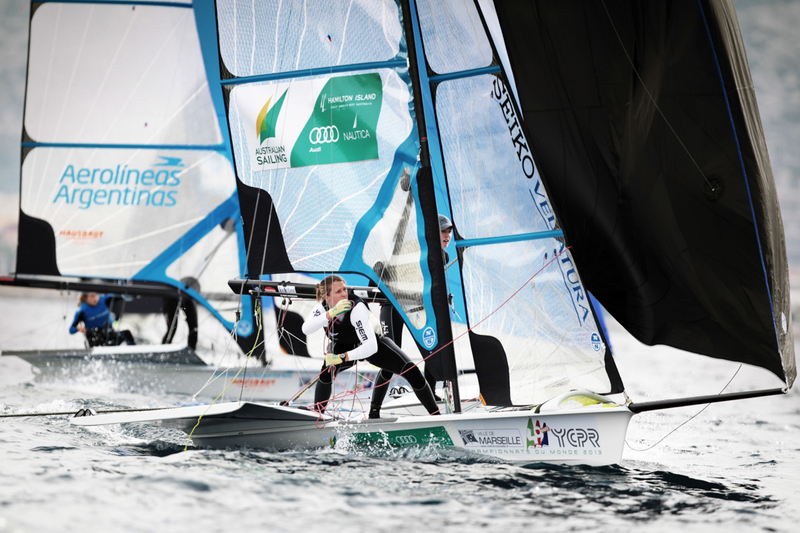 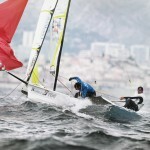 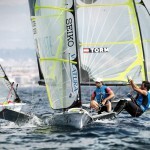 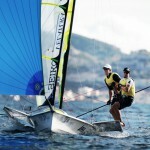 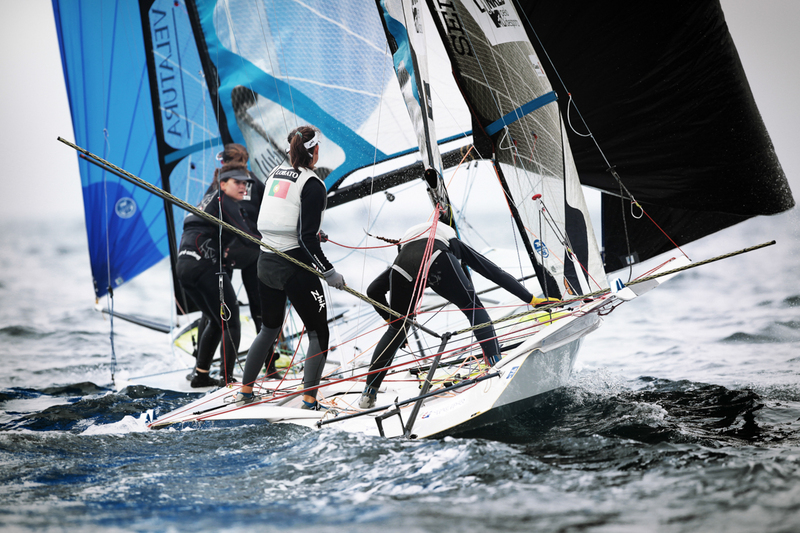 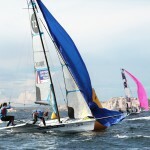 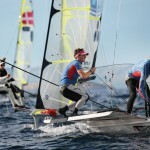 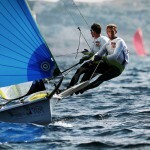 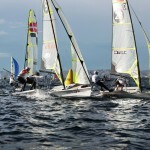 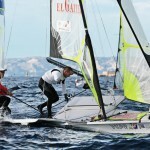 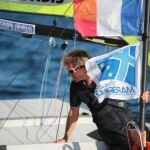 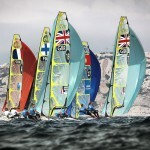 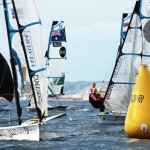 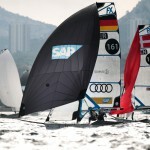 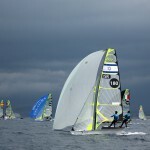 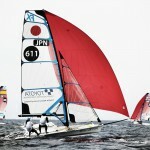 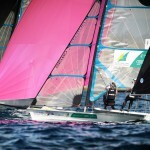 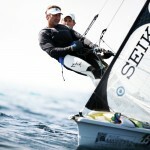 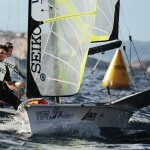 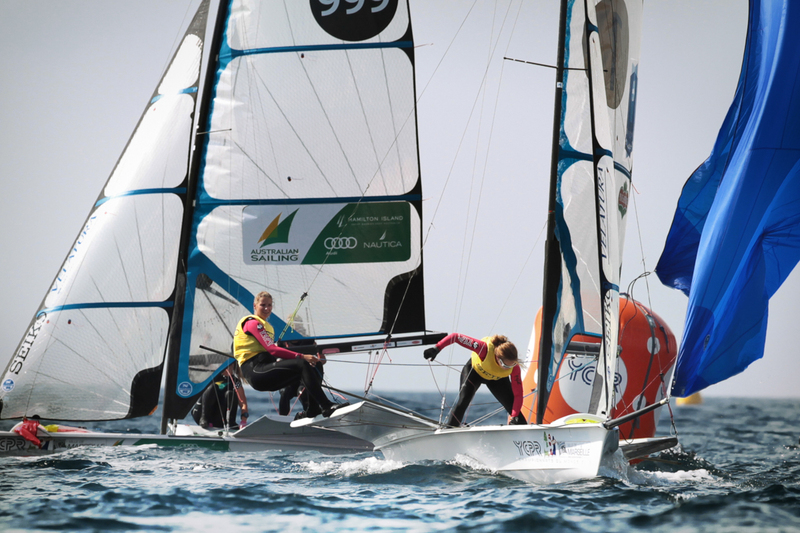 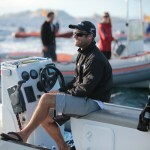 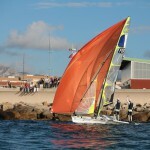 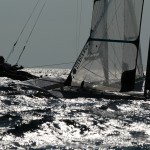 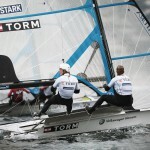 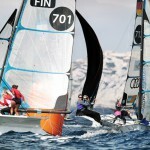 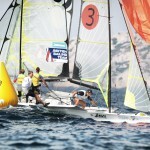 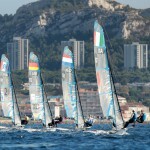 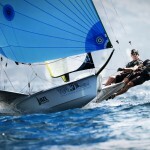 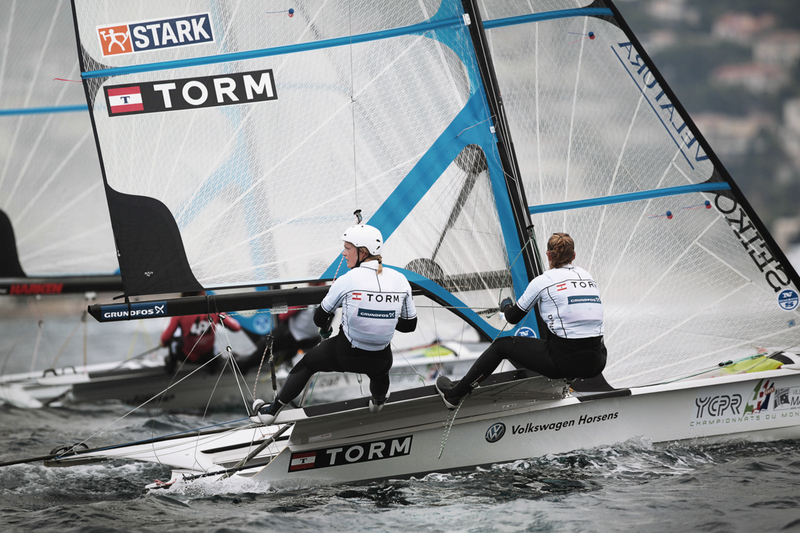 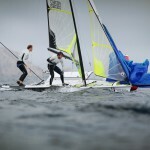 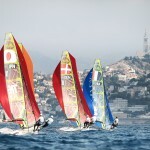 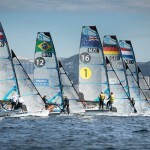 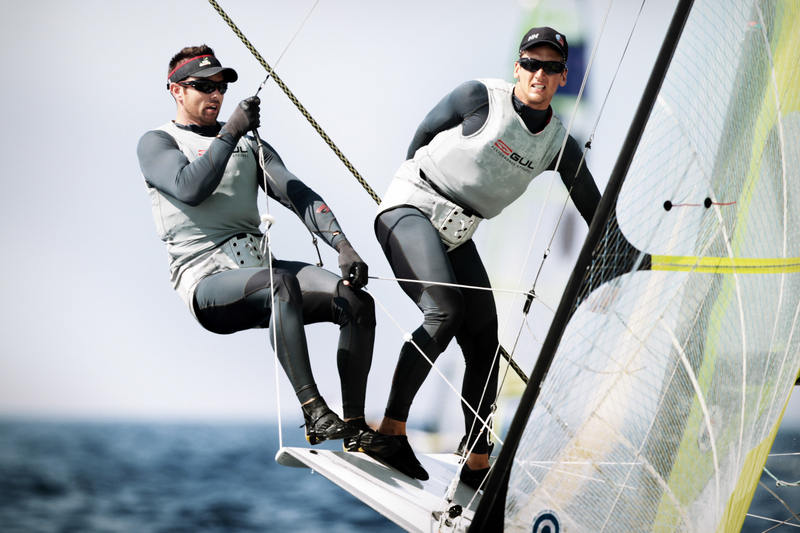 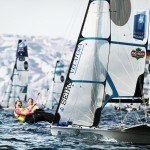 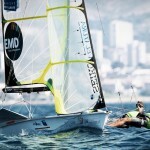 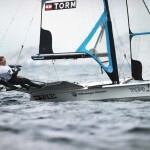 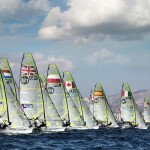 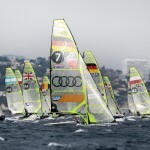 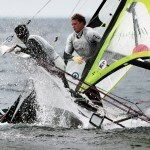 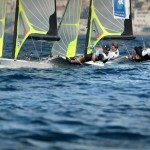 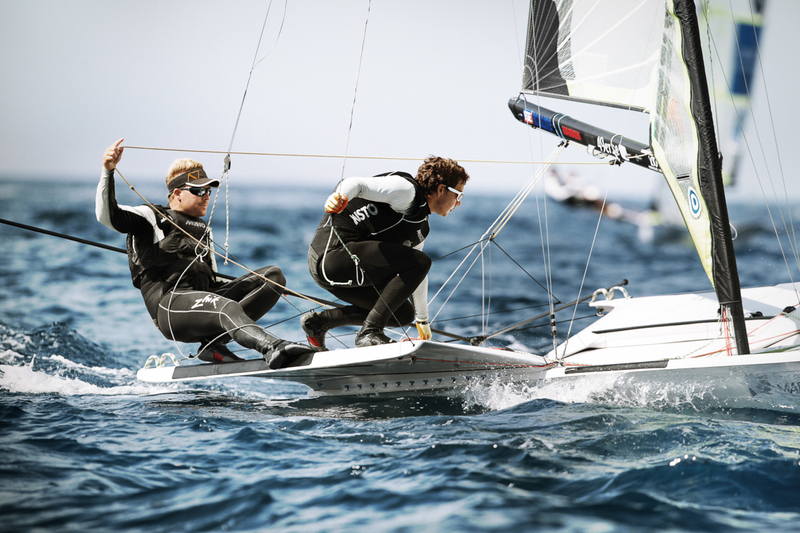 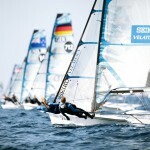 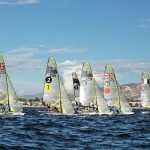 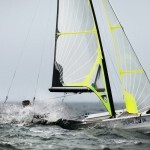 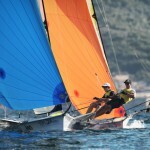 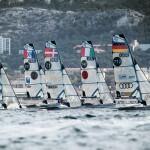 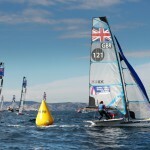 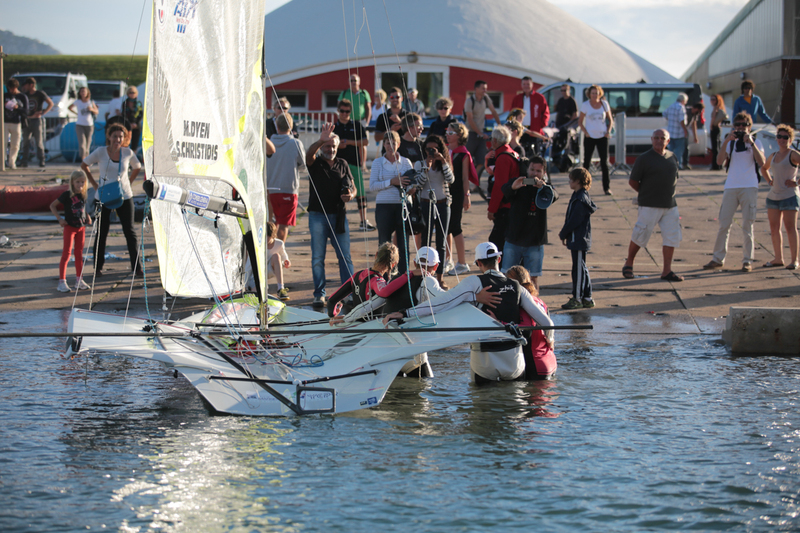 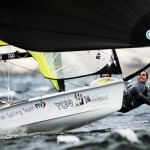 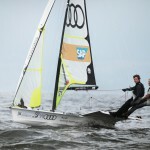 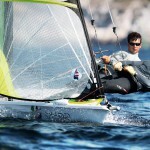 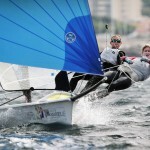 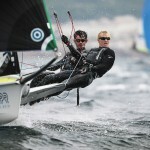 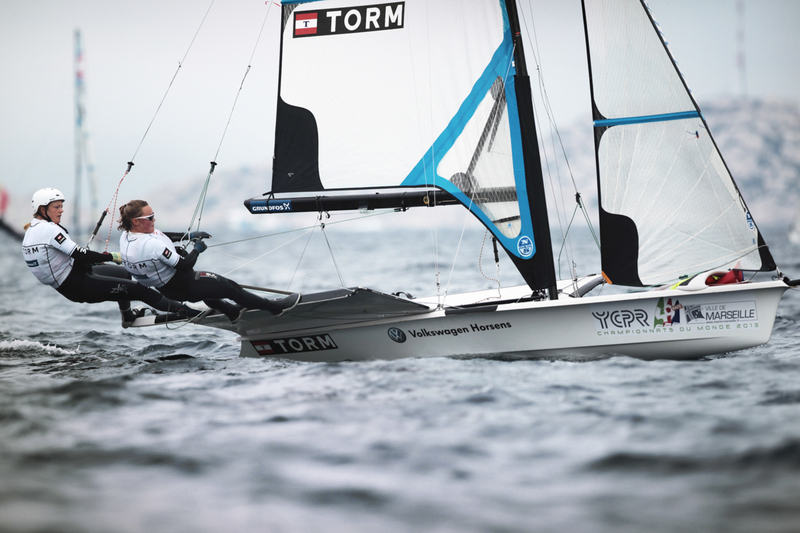 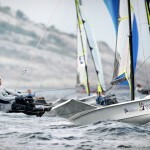 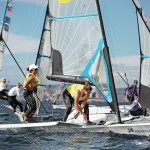 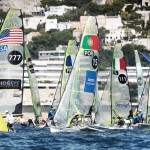 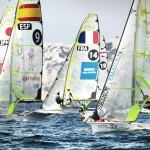 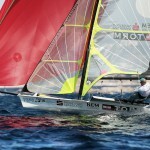 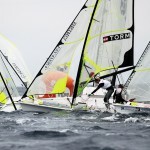 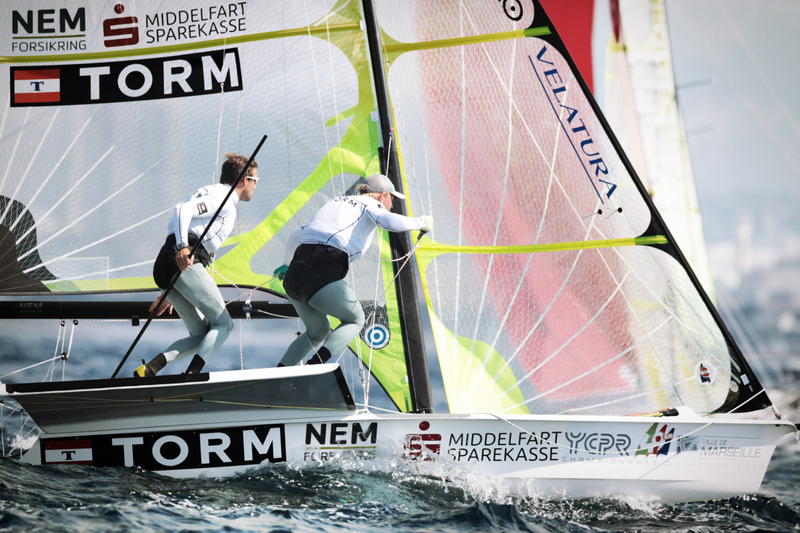 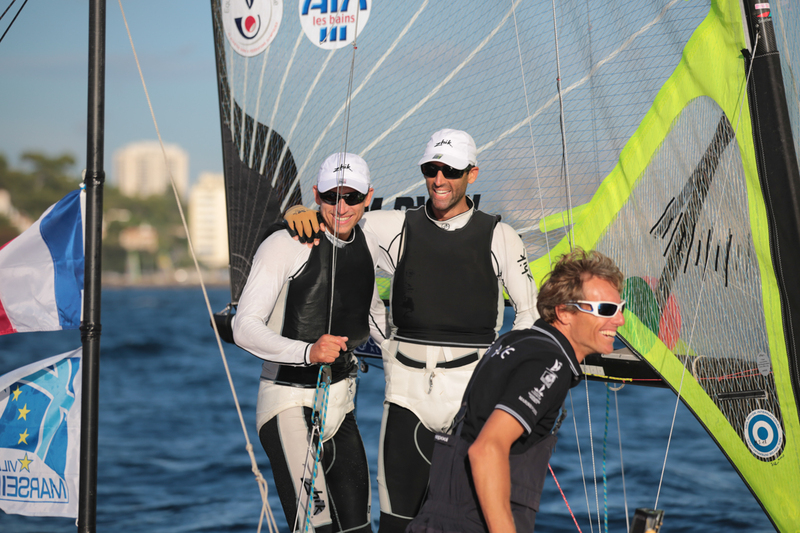 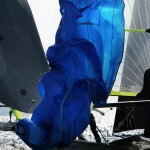 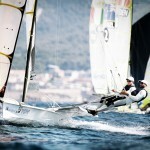 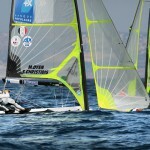 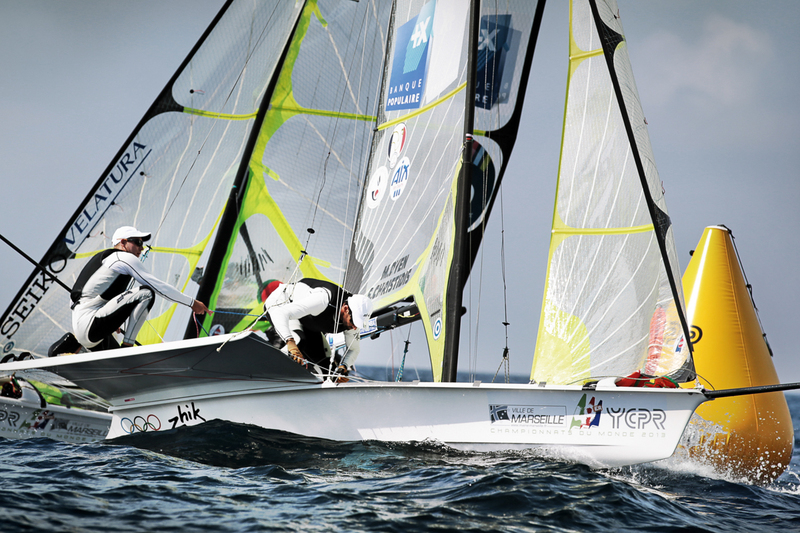 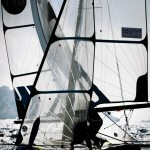 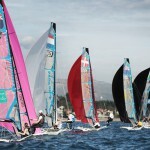 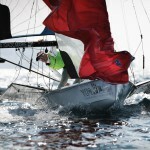 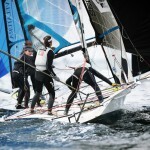 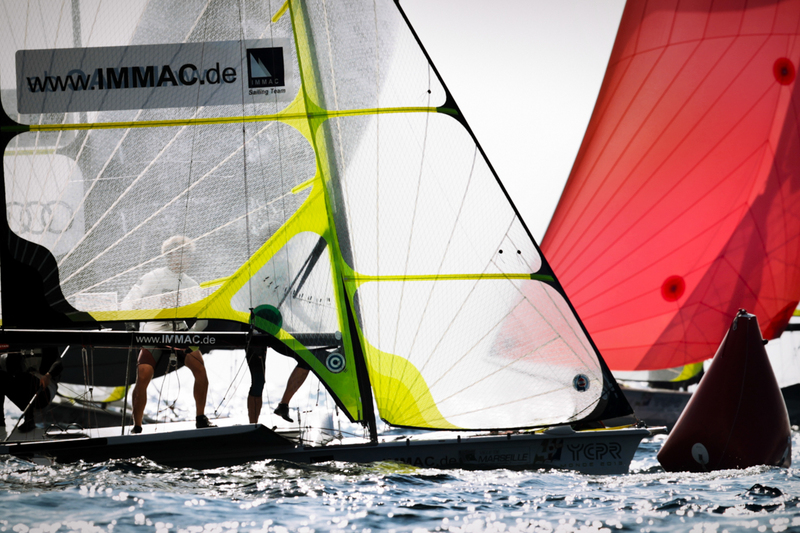 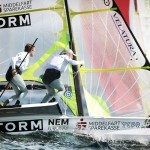 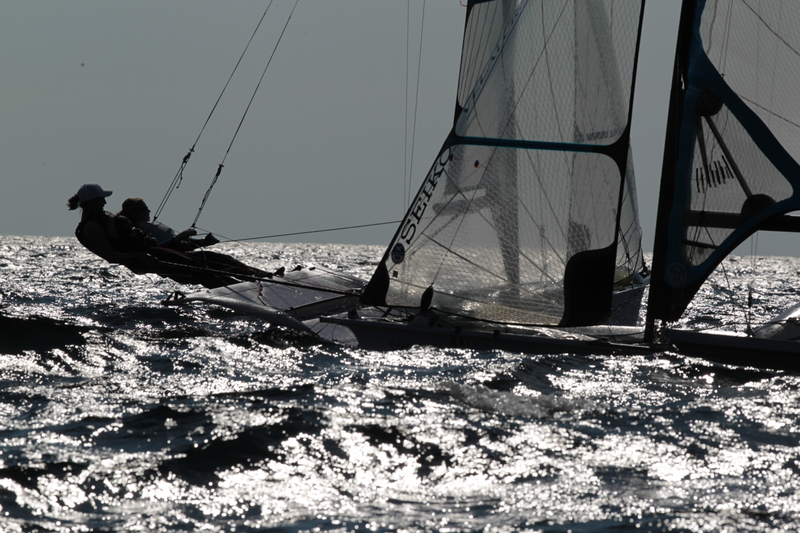 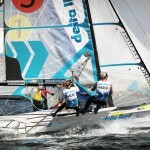 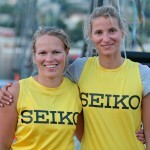 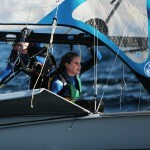 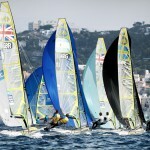 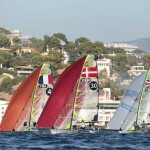 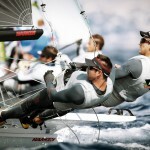 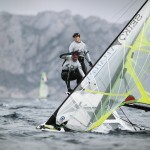 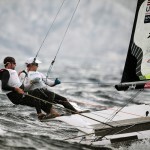 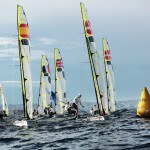 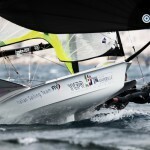 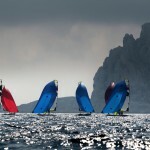 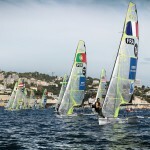 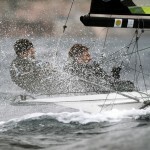 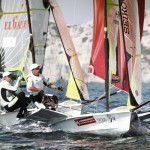 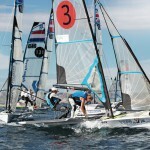 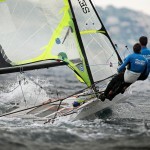 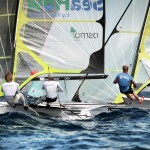 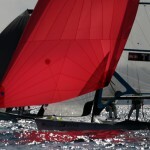 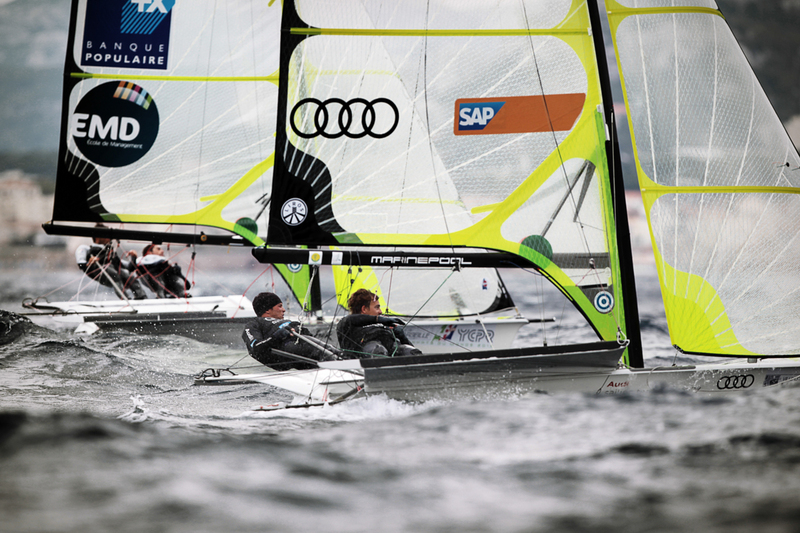 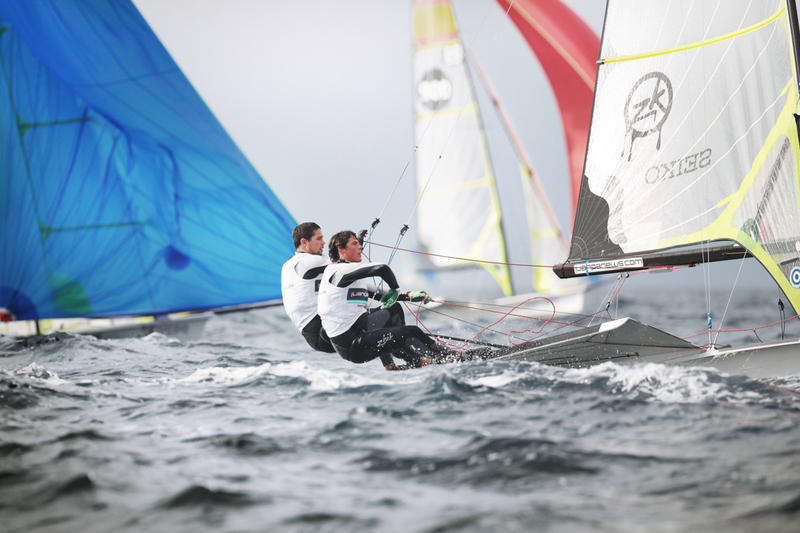 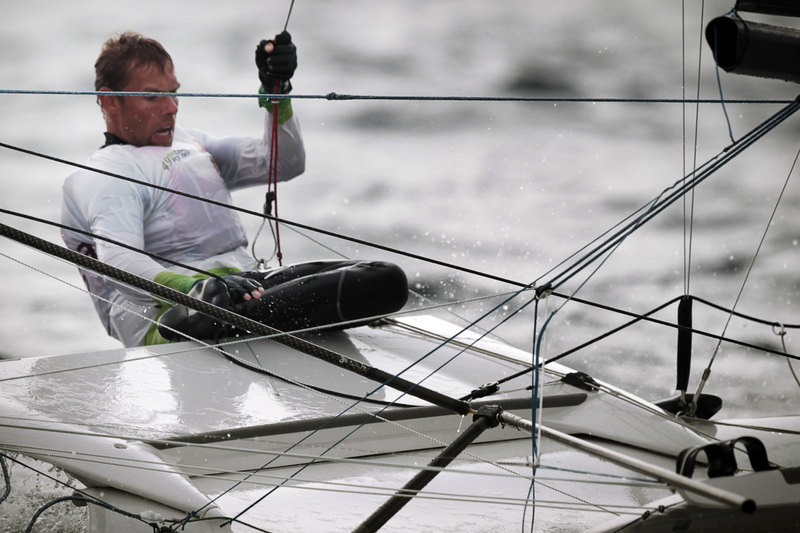 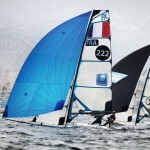 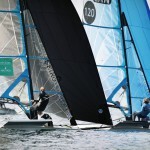 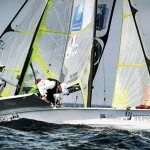 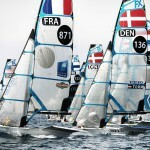 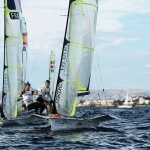 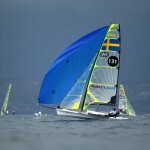 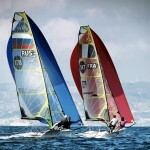 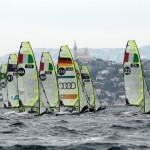 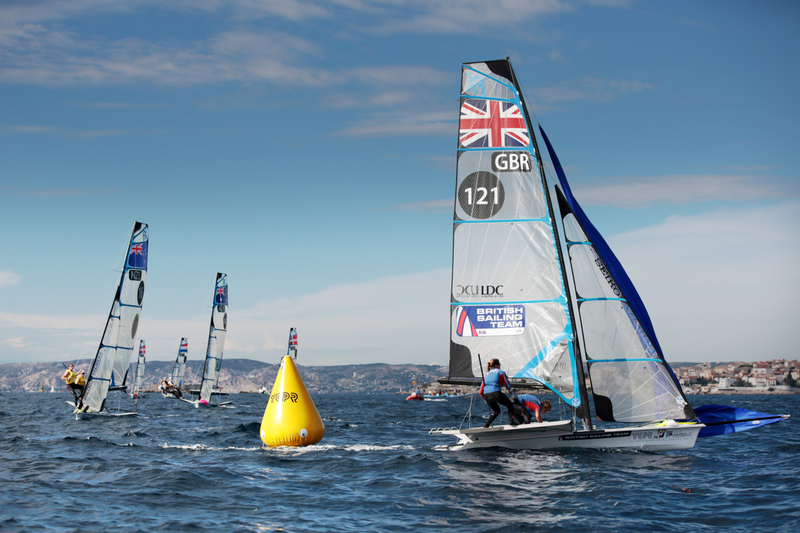 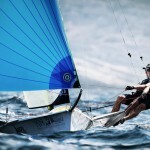 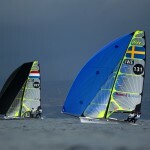 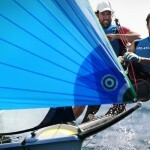 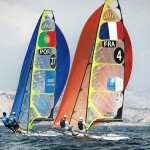 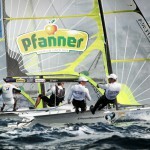 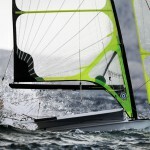 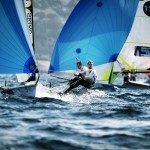 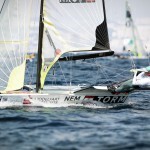 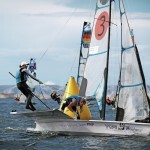 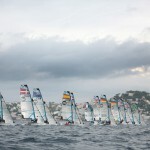 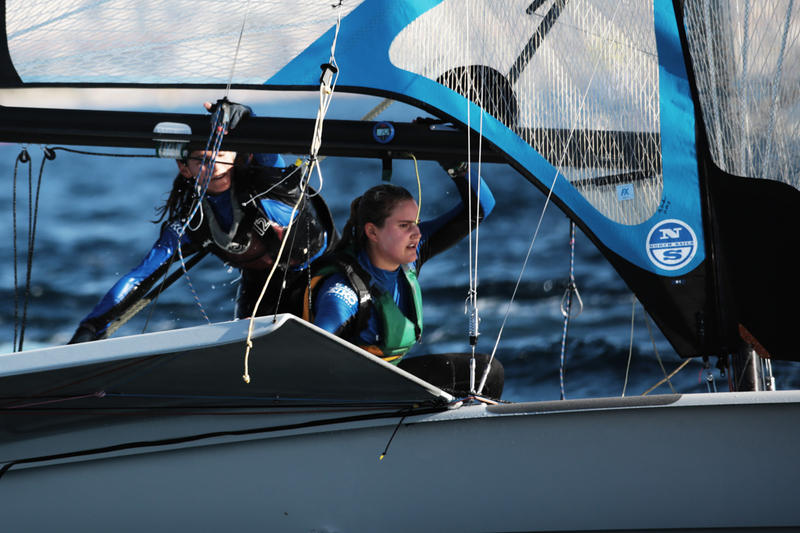 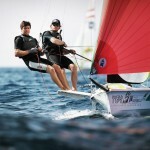 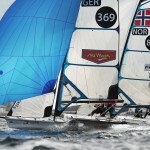 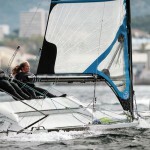 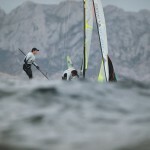 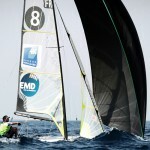 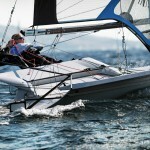 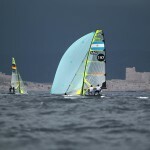 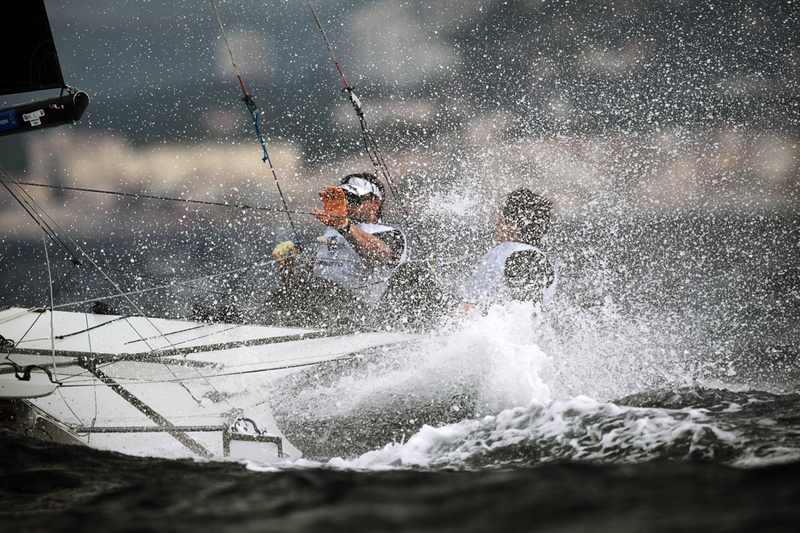 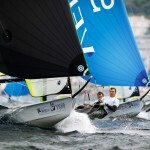 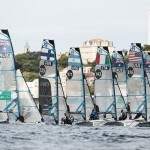 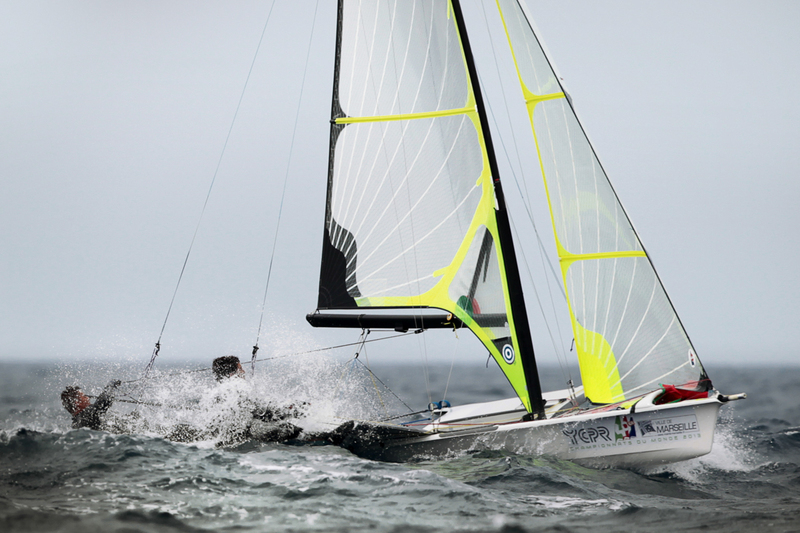 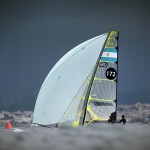 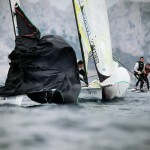 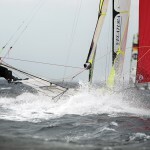 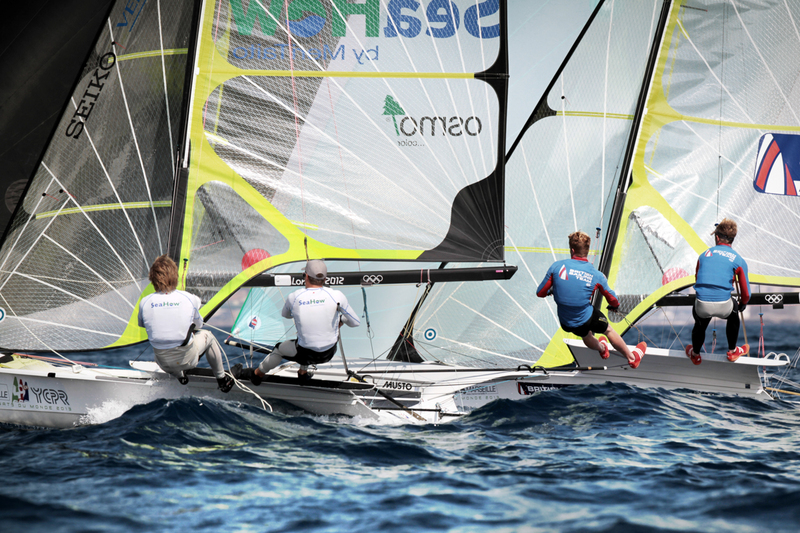 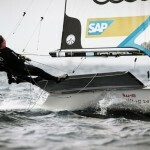 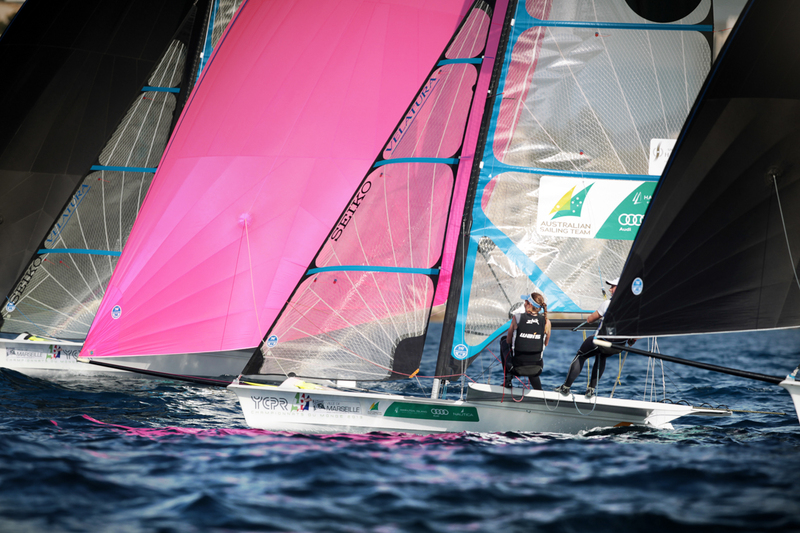 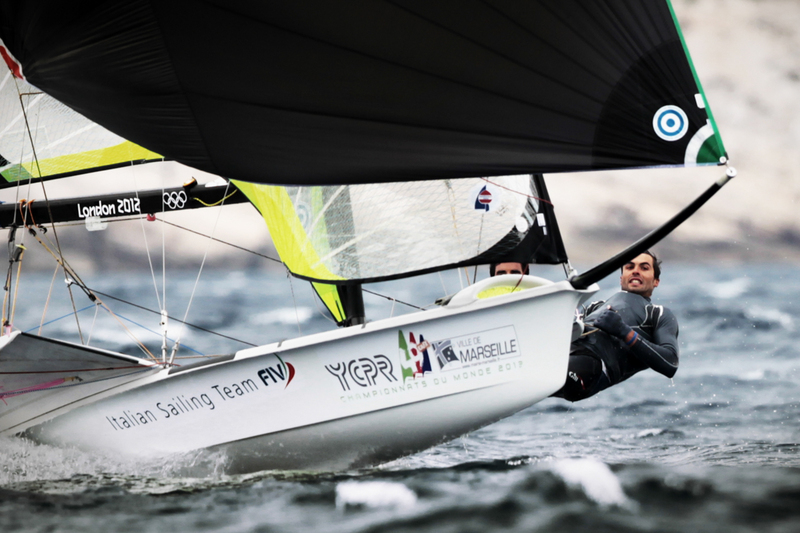 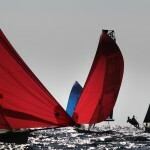 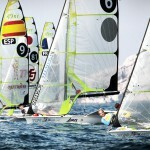 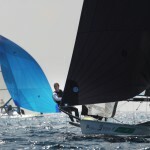 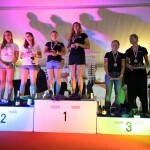 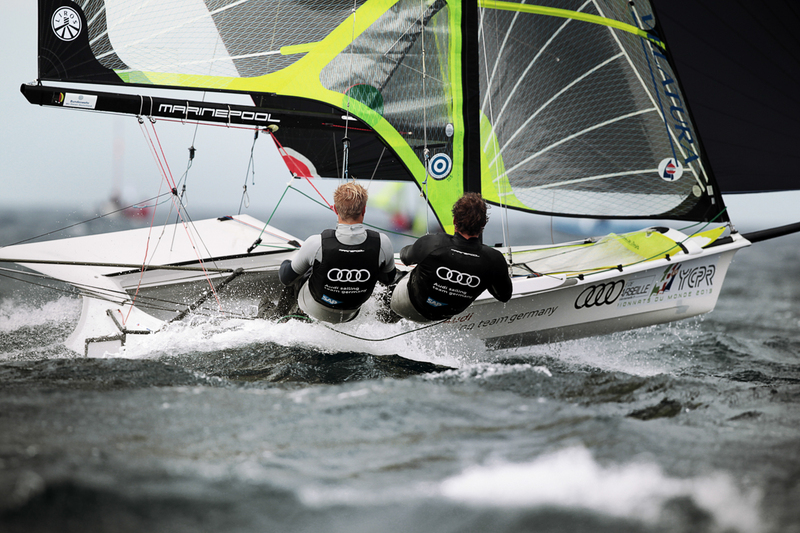 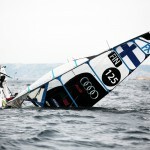 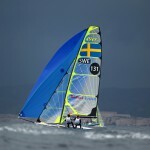 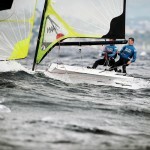 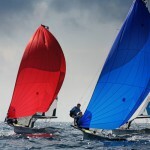 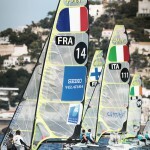 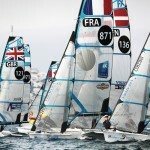 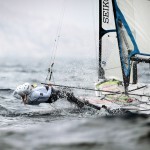 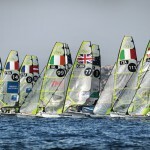 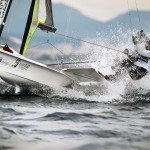 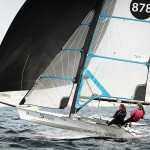 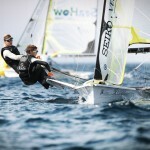 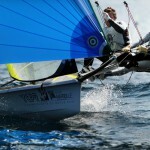 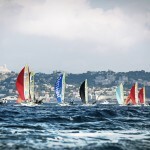 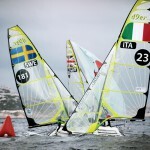 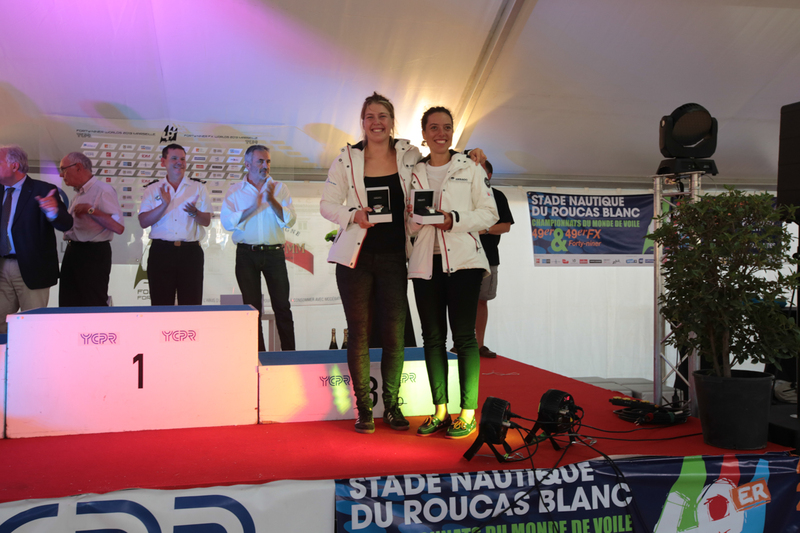 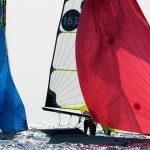 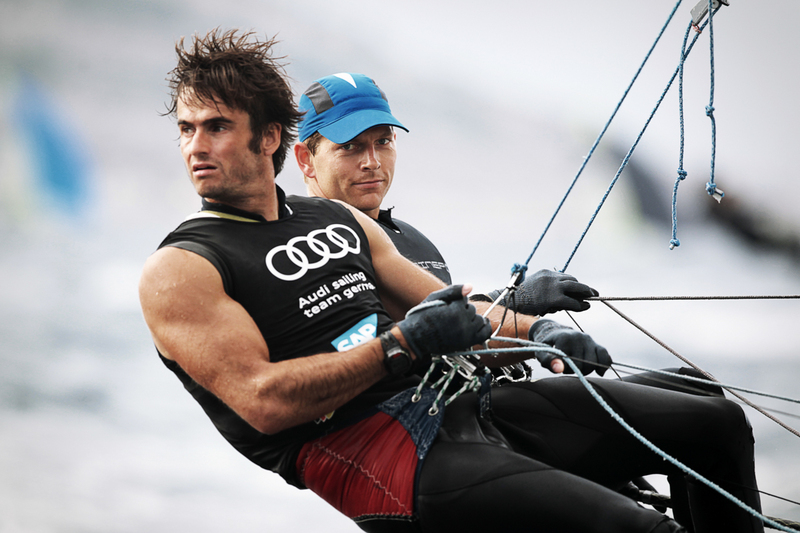 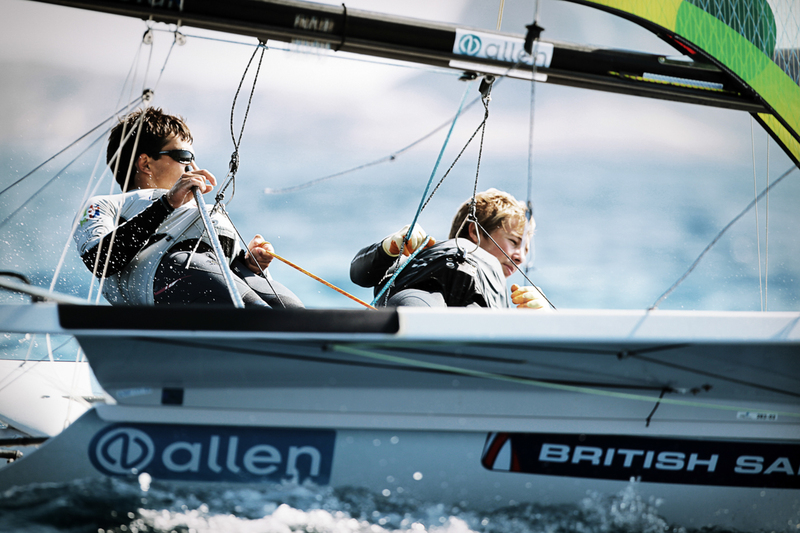 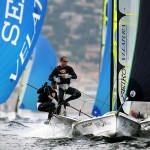 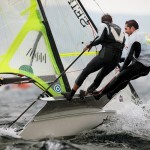 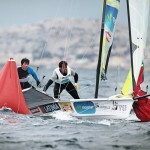 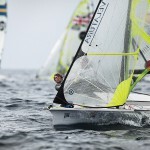 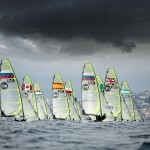 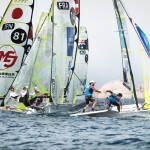 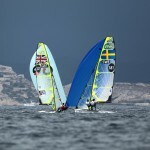 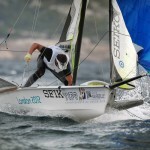 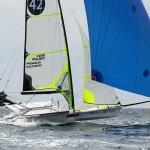 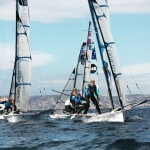 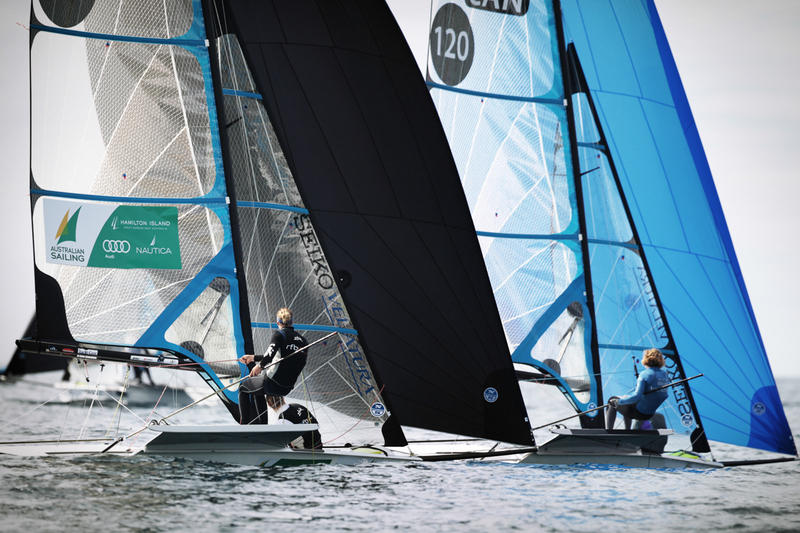 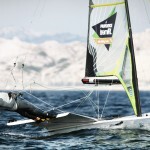 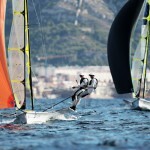 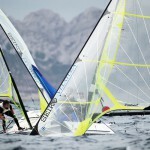 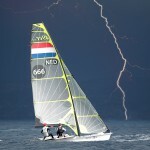 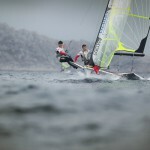 Each day on 49er.org we will have live action from the championship course in both English and French. 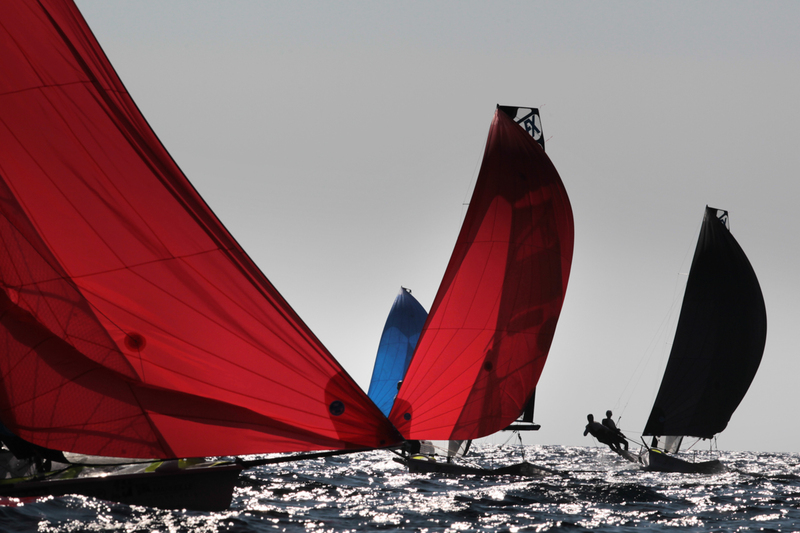 Morning and Evening Shows – We will come to you live at 9:20 am and 6:00 pm each day to review the happenings from the regatta. 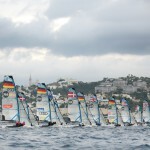 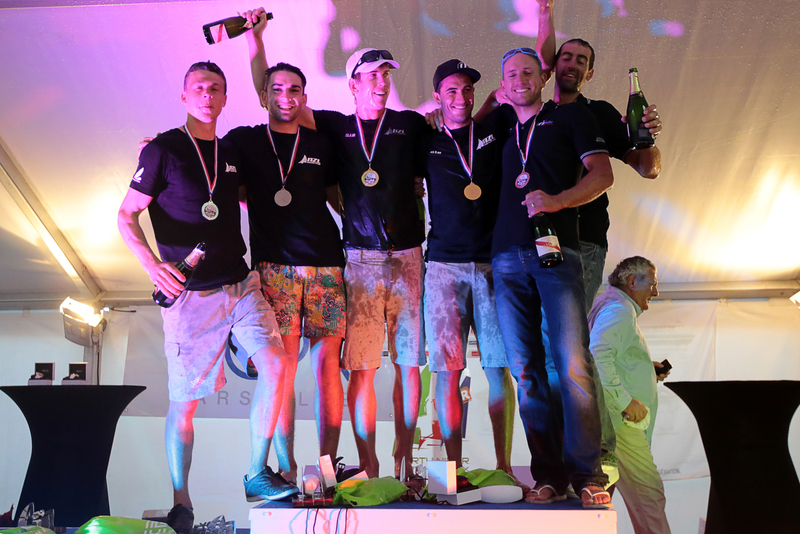 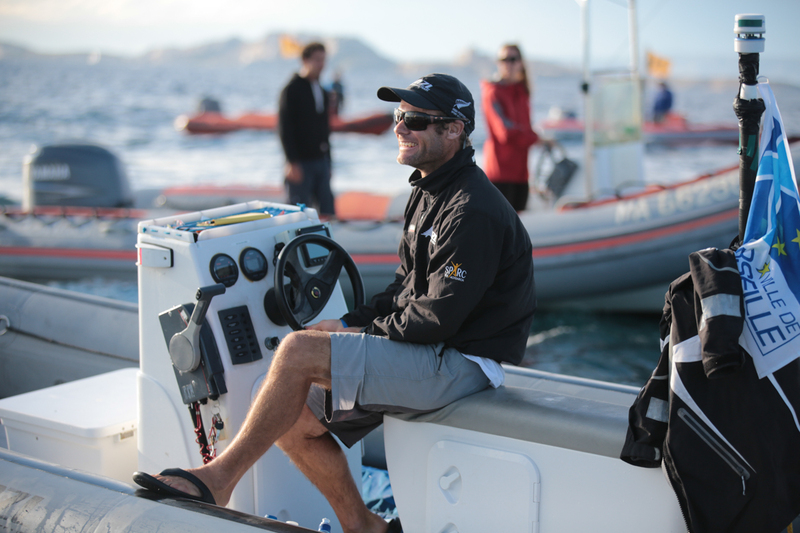 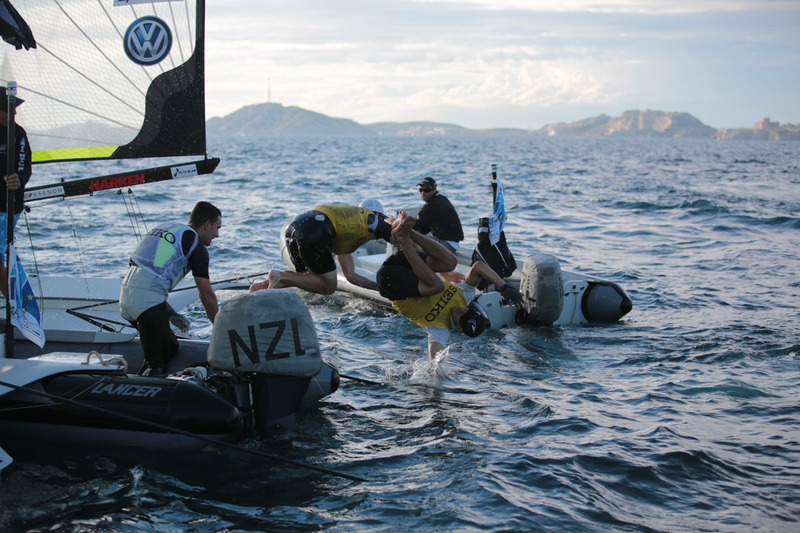 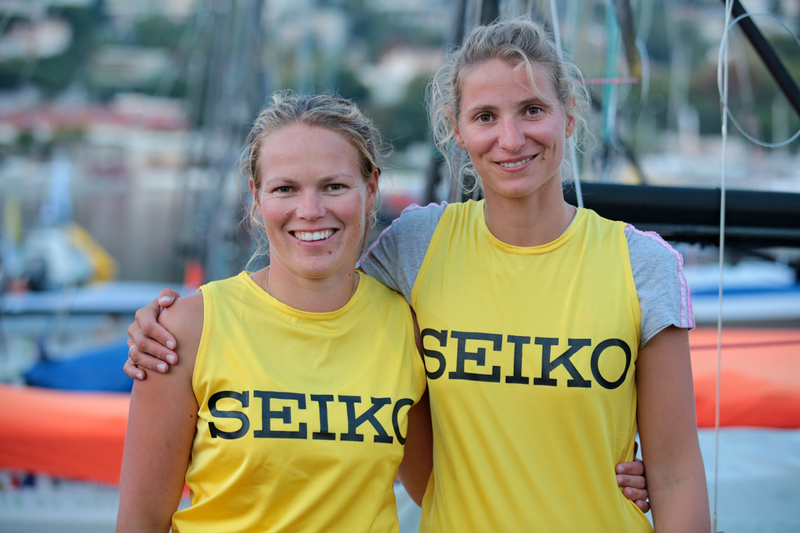 Join us as we discuss the event with our top sailors. 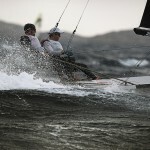 Check out 49er.org and subscribe to our youtube page for the best in video. Stade Nautique du Roucas Blanc 6 Promenade Georges Pompidou 13008 Marseille To discover the event venue on live through the city of Marseille Webcam ! 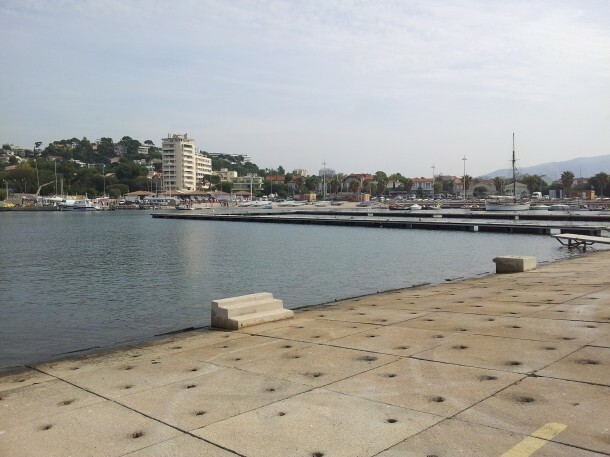 The marina is in a U-shape, with ramps leading into the water on all sides with rough dimensions of 200m by 100m and then a serpentine breakwall to get to the sea. 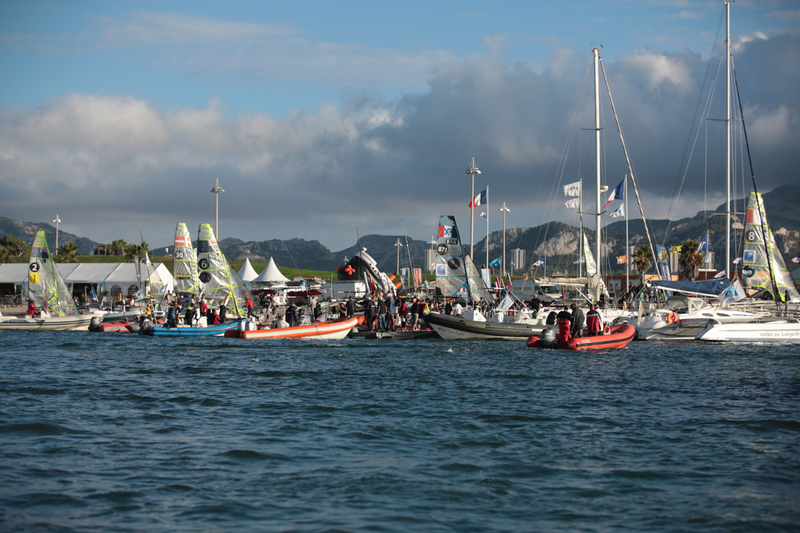 There is room for as many boats as will attend and the entire area is surrounded by a high metal fence for security. 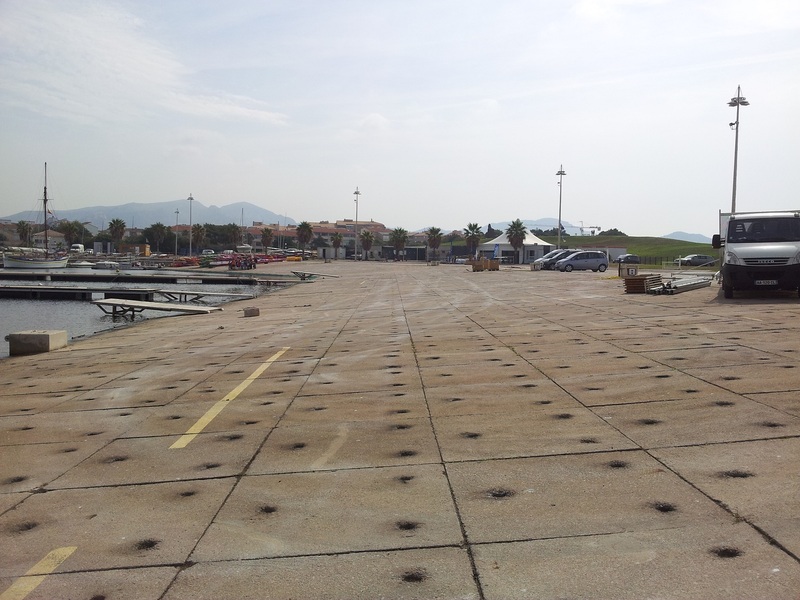 There are parking and trailer/camper facilities inside the venue. 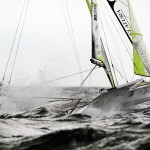 Here is how you will be able to launch. 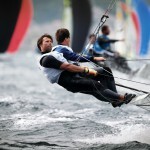 There are buildings, showers, toilets, wifi, tie downs anchors, hoses, and many more facilities for sailors in the venue. 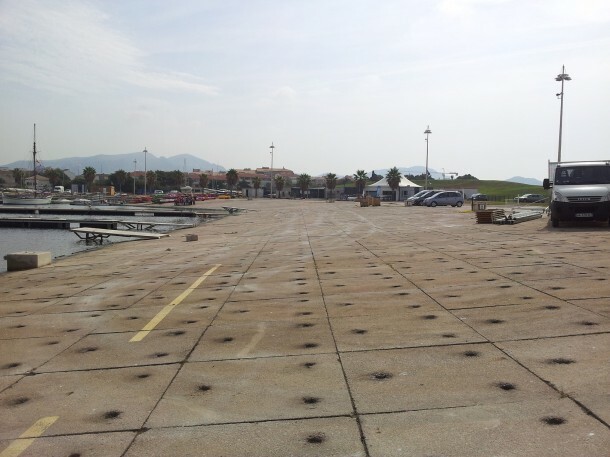 There is a huge bay for up to 6 racecourses. 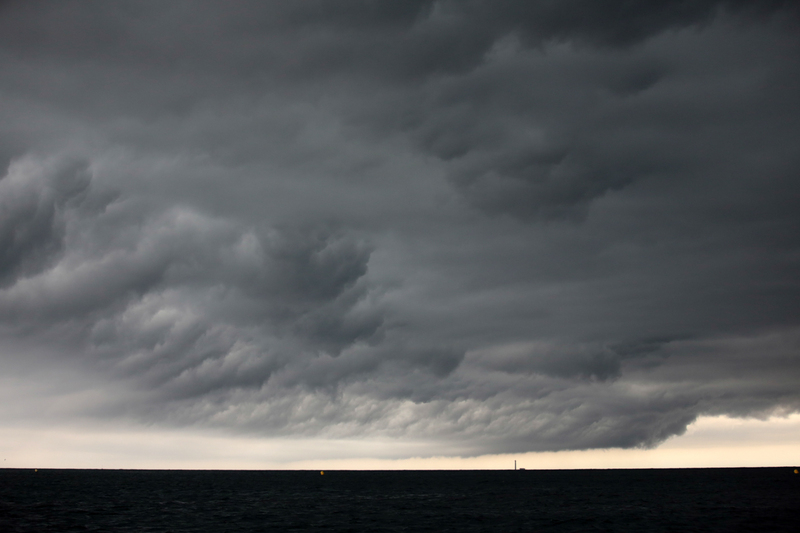 The shipping traffic goes on the other side of the Islands, so will not be a problem. 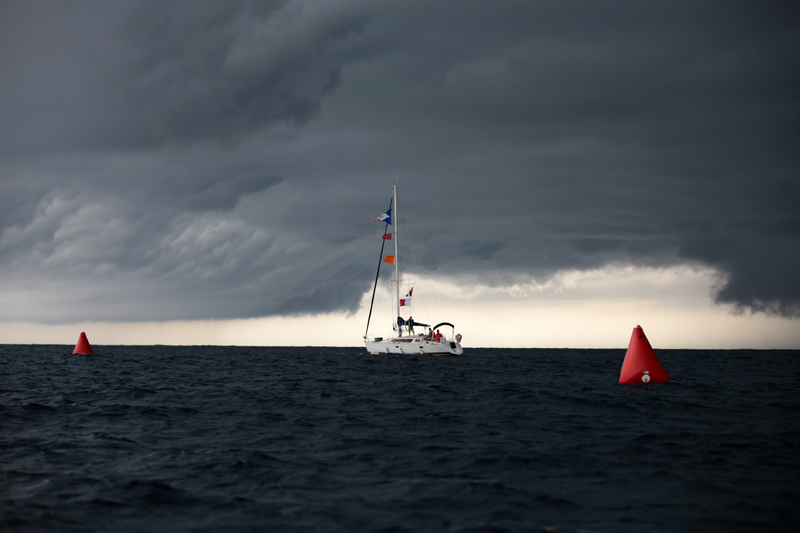 If we decide to do a long distance race, there are many interesting geographical features to use in the course. 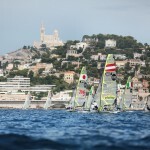 Above, you can see the Marseille center is around the corner from where we are racing. 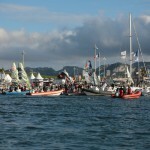 All the ferries along with other commercial vessels go outside the bank of islands that separate the two bays. 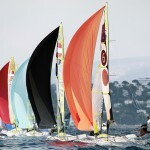 It’s about a 20 minute drive to the town center from the regatta venue. Below, see in greater detail where we will be racing from and where the host club is. 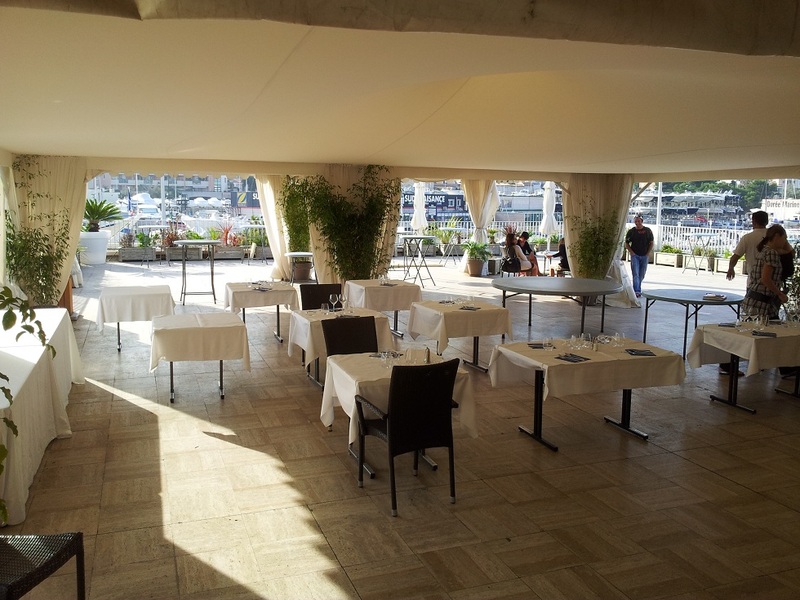 The host club has a beautiful bar and deck, so will be a great place for us to take VIP’s and sponsors after the days racing. Almost the entire harbour is bordered by beaches from our boat park all the way to the host club. 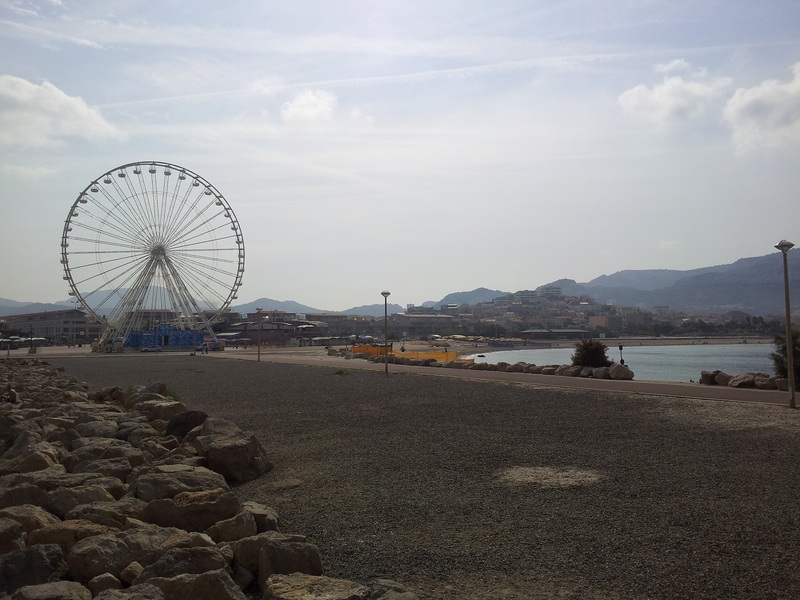 On nice weekends, there can be 50,000 locals who come to the beach to hang out. 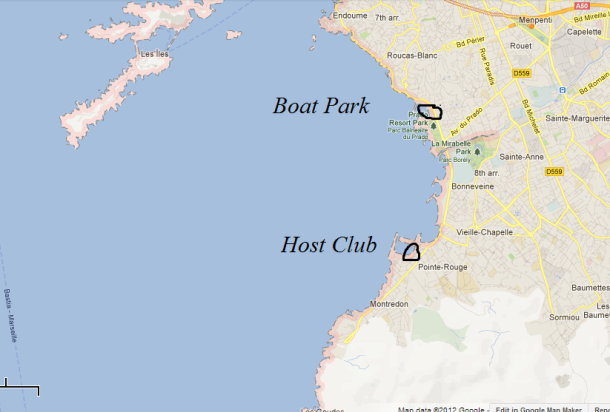 3 options are circled for the Theatre Style Racecourse areas. 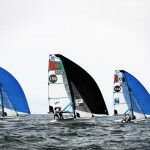 Each of them is fine as for the three wind directions, though obviously we’re hoping it’s not offshore. 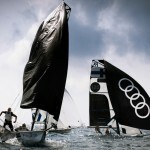 What differentiates the three options is how many people they could accomodate to watch. A) is best viewed from a wide public walkway on the side of a busy street. 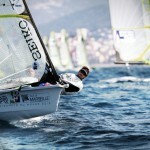 It’s elevated, so would be a fantastic view of the racing for any spectotors we can attract. 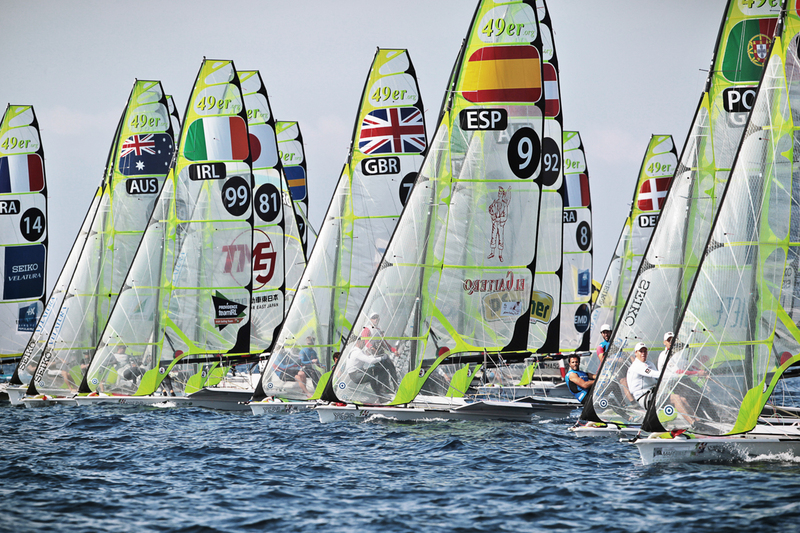 It could probably fit 500-1000 spectators. 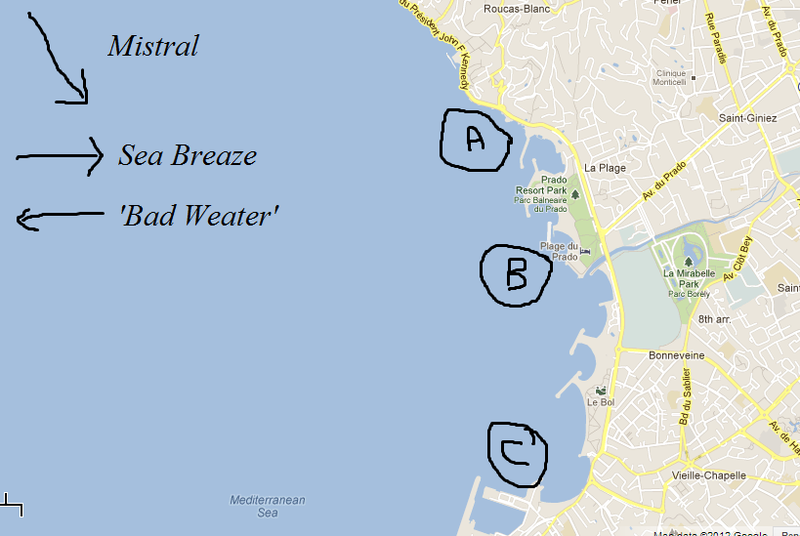 B) is right outside the breakwall from the the boat park. 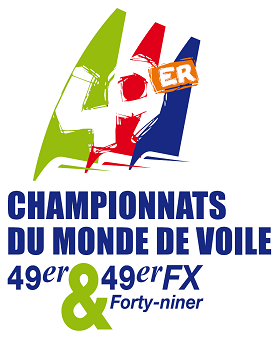 Spectators can sit on a grassy hill with (hopefully) a big screen TV and watch the racing live. 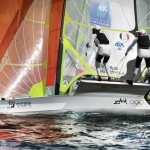 This would be a very convenient and modest way to have our finals. 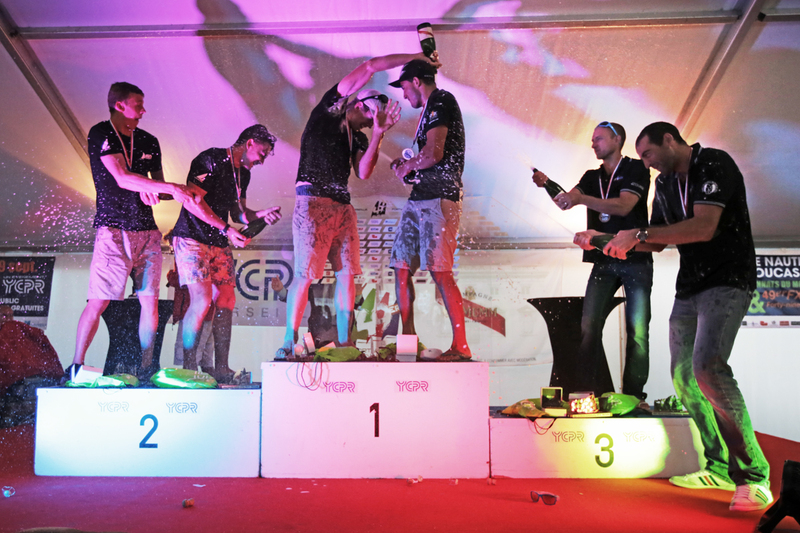 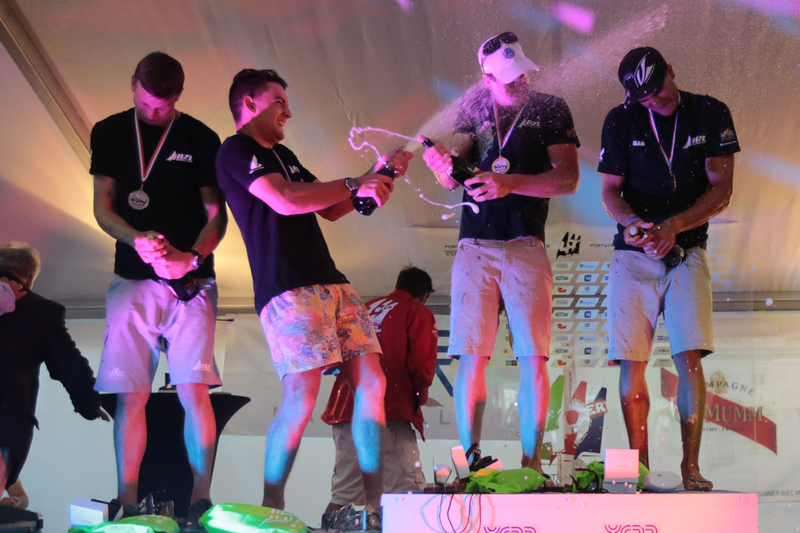 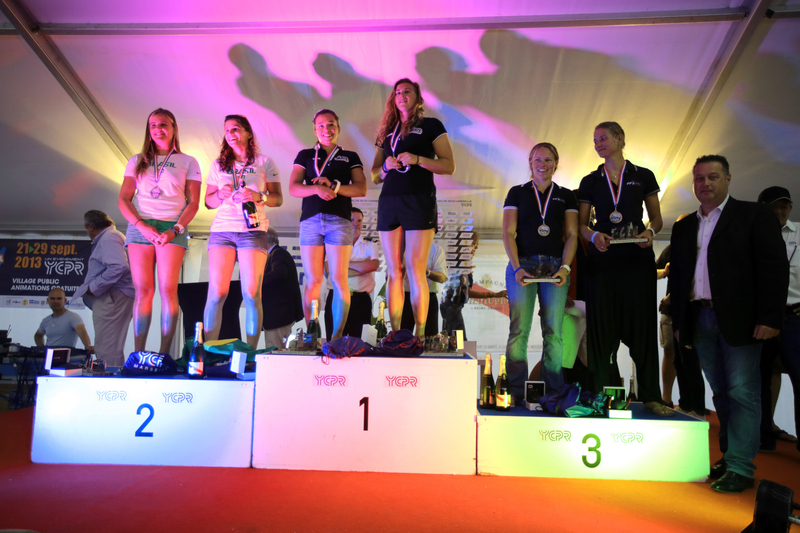 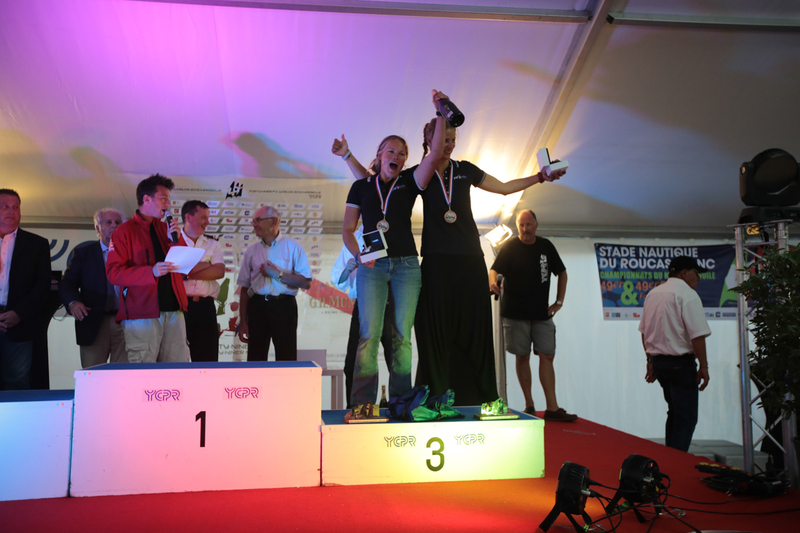 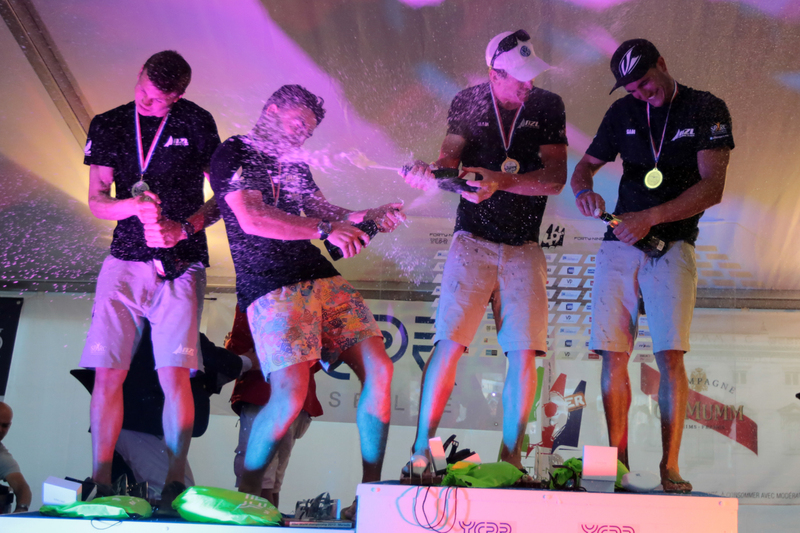 It would be easy to set up a spectator area and have the medal ceremony with the crowd after the finals, boats could even sail straight to the beach after racing as it’s only a short haul to our boat park. 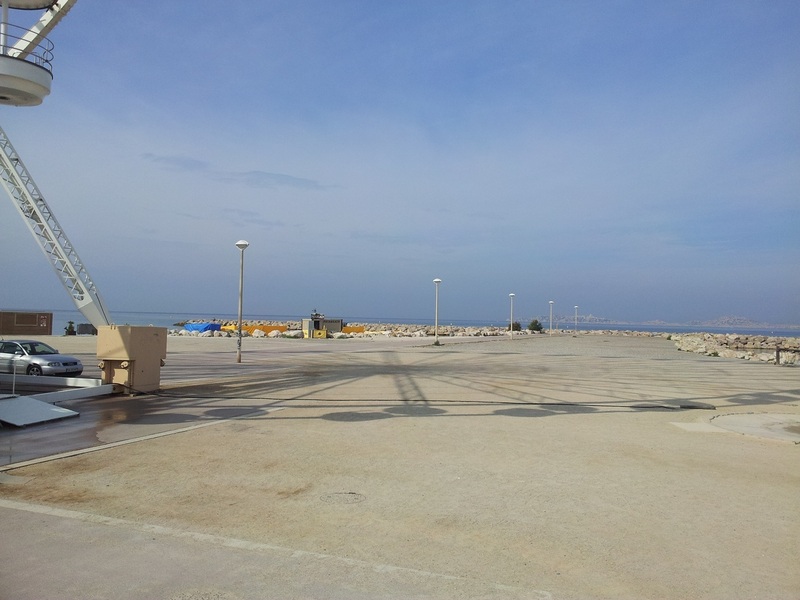 This area could probably accomodate about 3000 fans/visitors comfortably. C) This is a very large area. 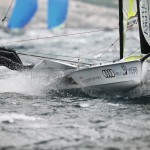 The T breakwall that justs out into the bay is about 100 wide and 300m long. 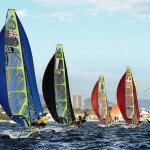 If we can secure big sponsors who want to put up grandstands and make a huge event of this, the location is very good. 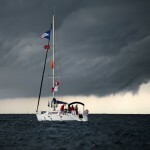 Otherwise it will be too big for us to fill. 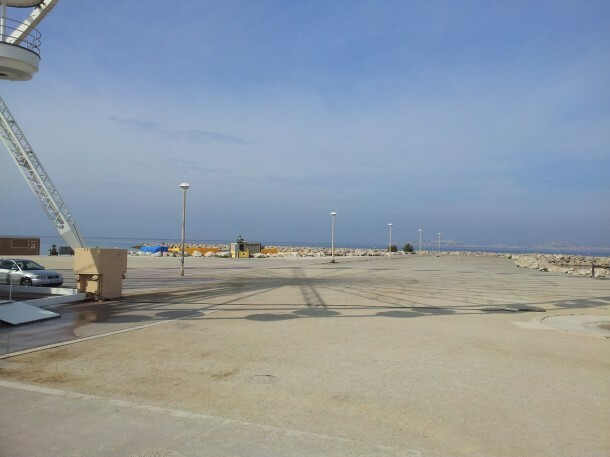 This area could probably accomodate about 20,000 people to watch. 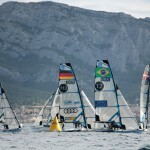 Below is the breakwall for area C And the view the spectators would have looking at the water. 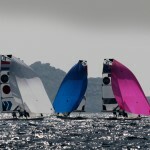 Here is a link to the club’s accommodation recommendations. 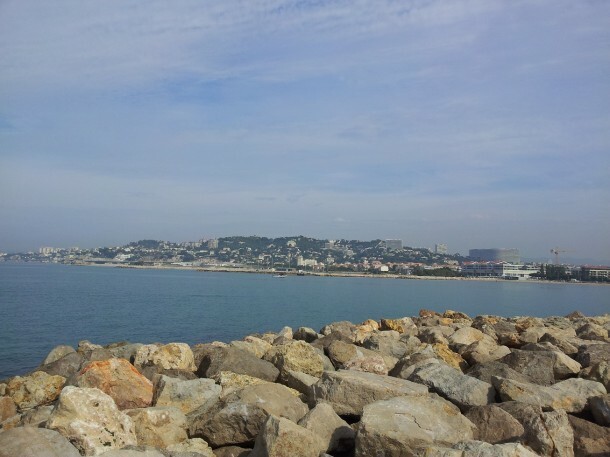 There are a number of hotels, apartments for rent in the suburb. 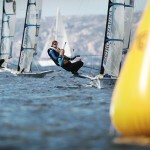 Only a 5 minute walk from the venue is one complex with a hotel that would be perfect for sailors. 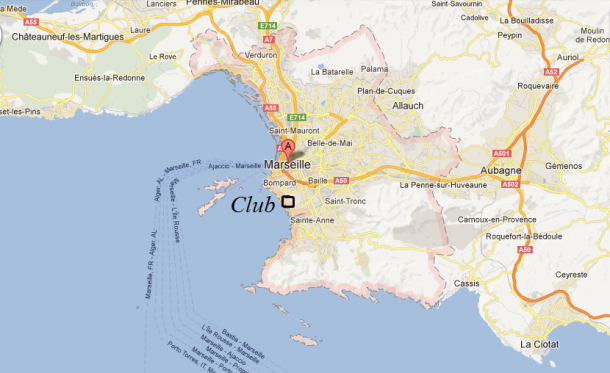 That hotel has weekly rates that are quite good and 2, 3, 4, 5, and 6 person room options. 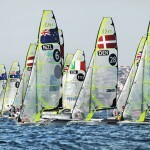 In between the accomodation area and the sailing venue are about 20 restaurants with food from all over the world. This should be a really nice socializing area for all sailors in the evenings, as it’s based around a pedestrian walkway. 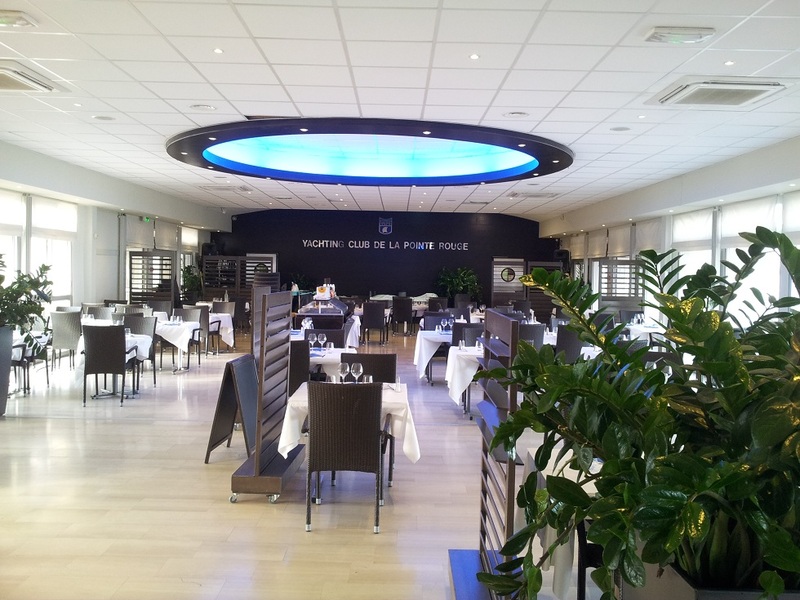 The host club, Yachting Club De La Pointe Rouge, has a wonderful restaurant, bar and patio. 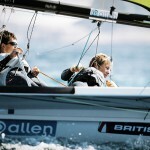 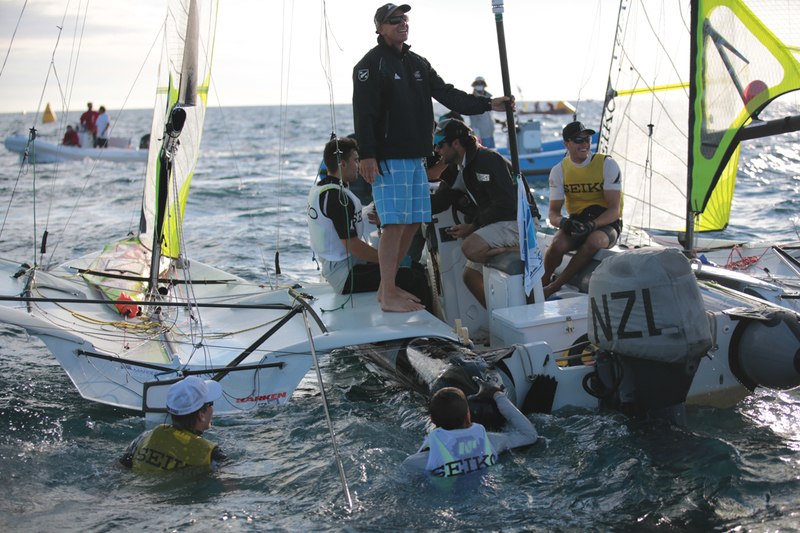 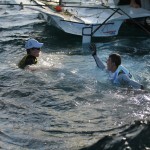 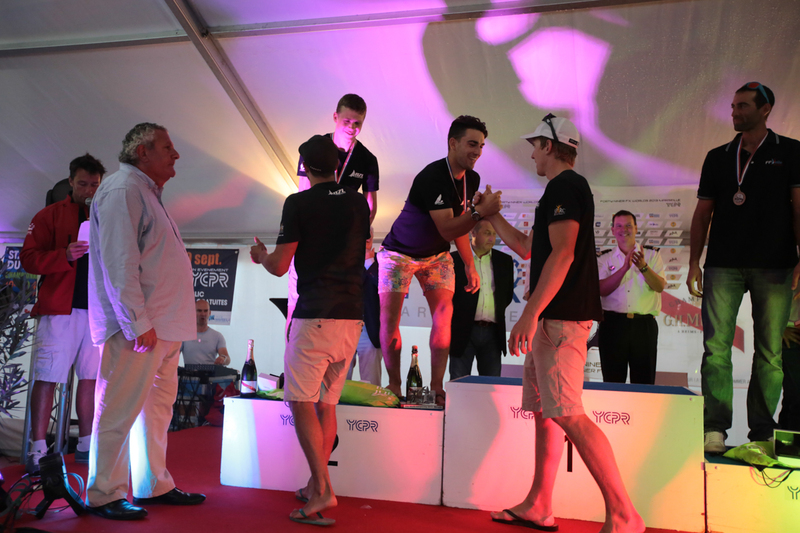 For any sailors planning on bringing their sponsors to the event, there will be a great venue for looking after them. 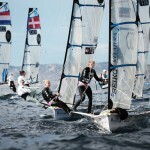 Here are some pictures of the facilities.